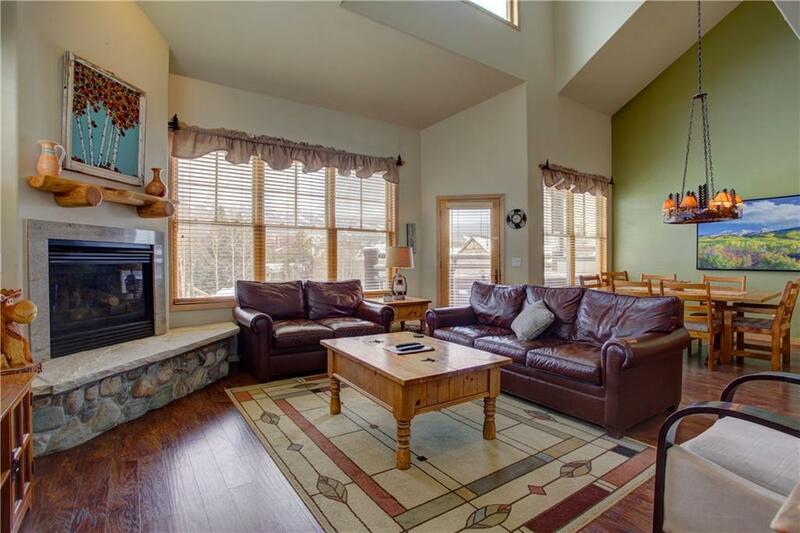 This very large 5-bedroom plus den, 4-bathroom deluxe home can quickly become your family’s second home year after year! 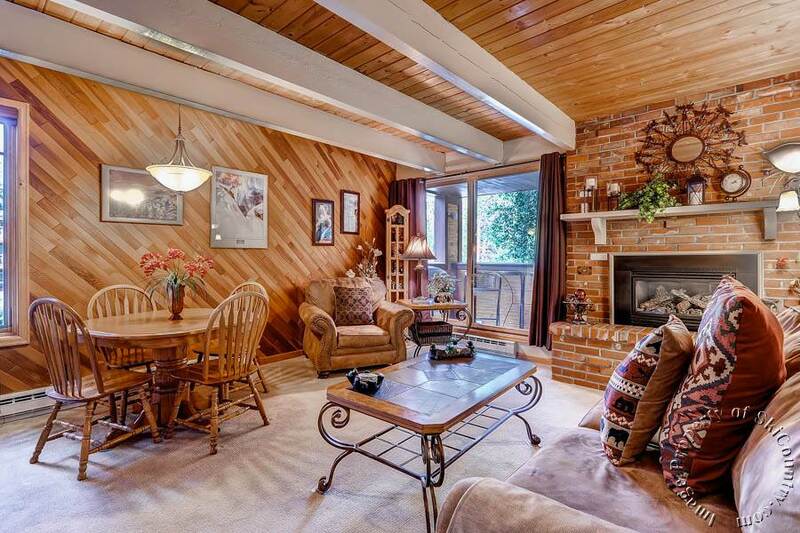 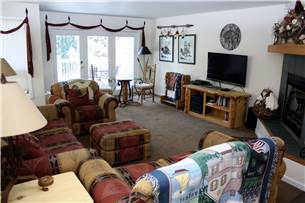 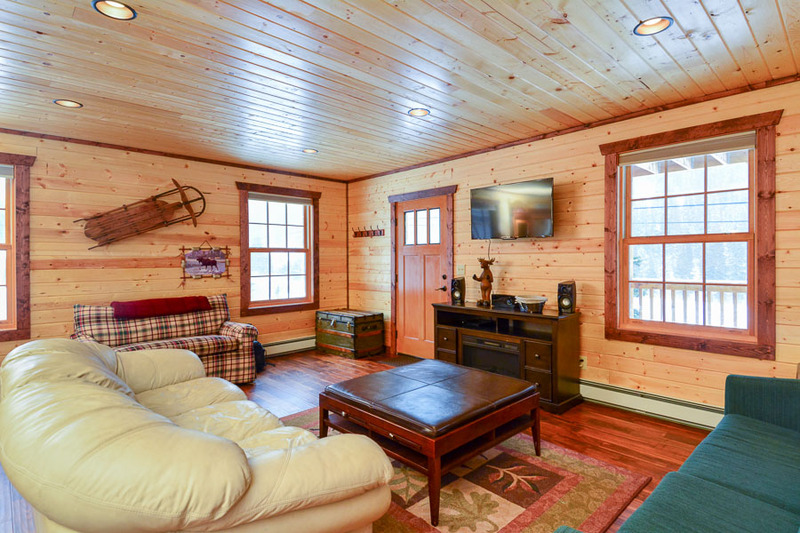 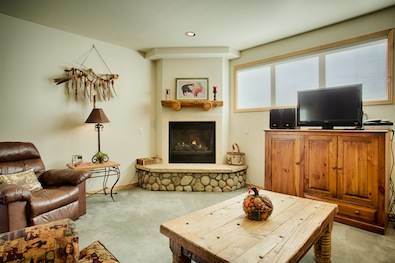 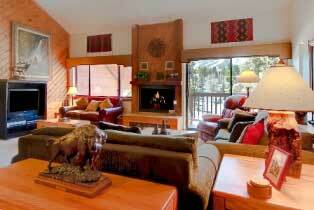 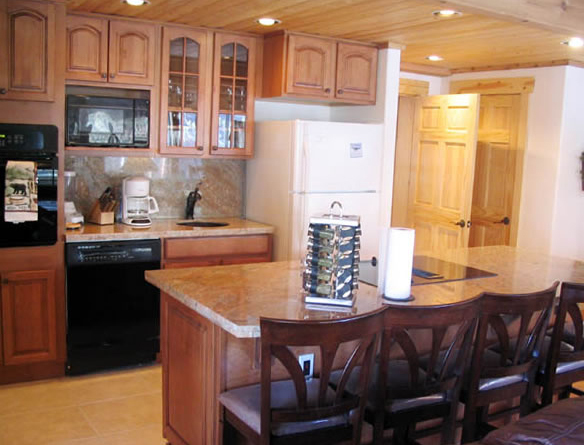 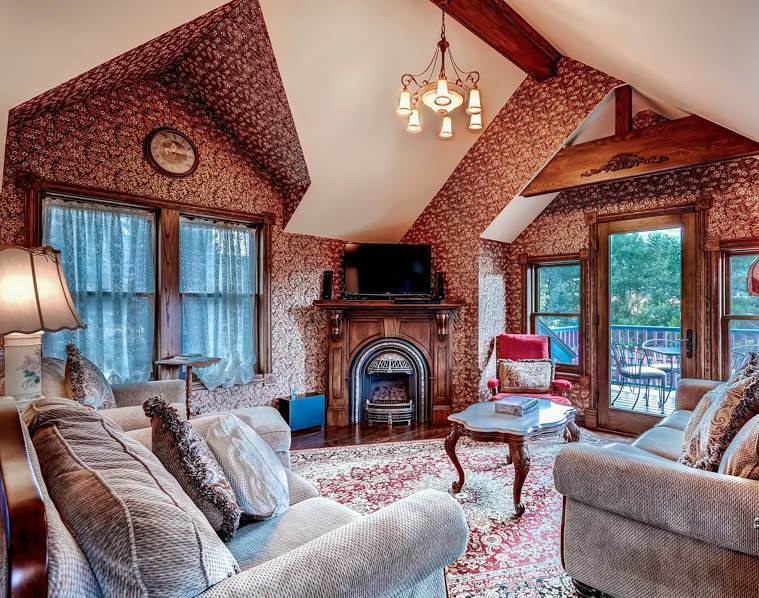 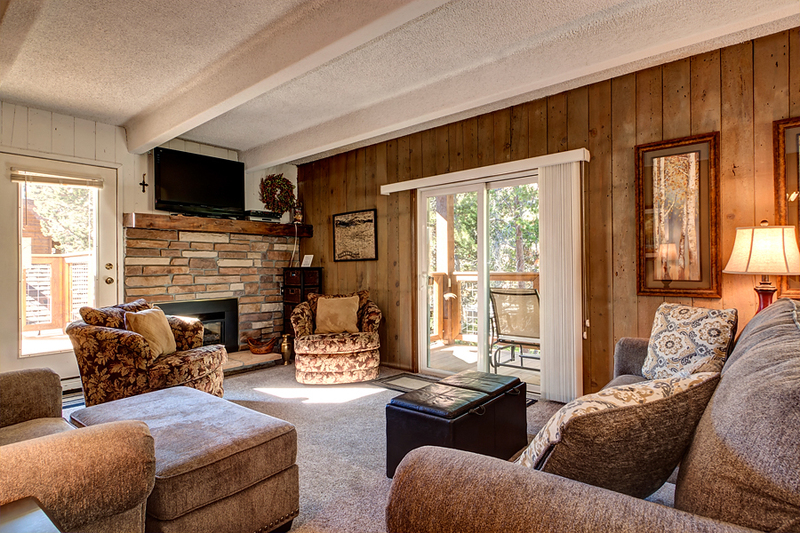 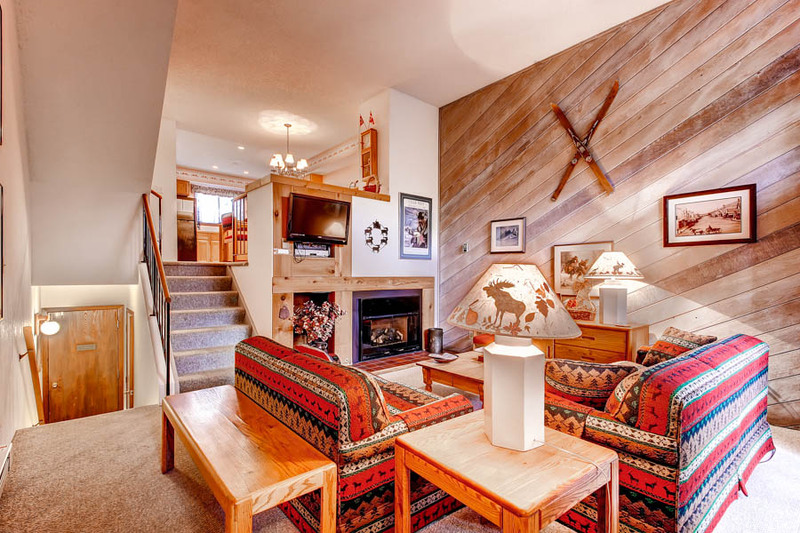 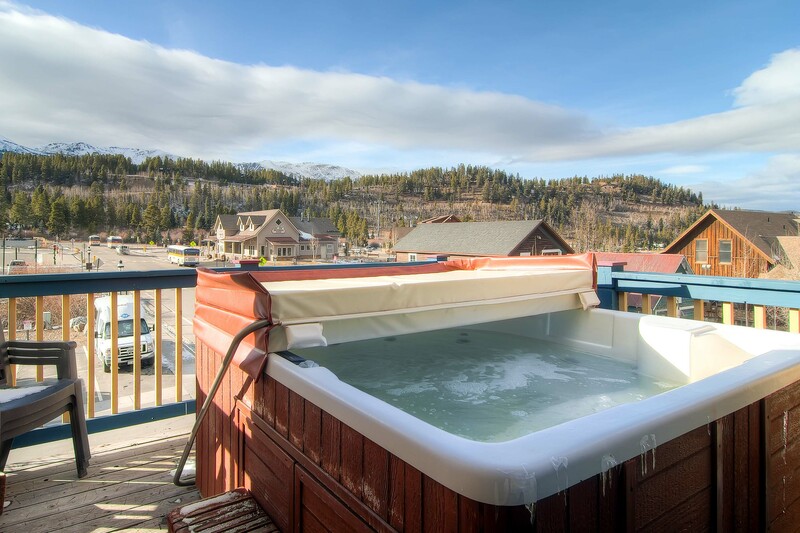 Gold Flake Chalet evokes a sense of warm nostalgia, with private hot tub and sleeping for up to 14. 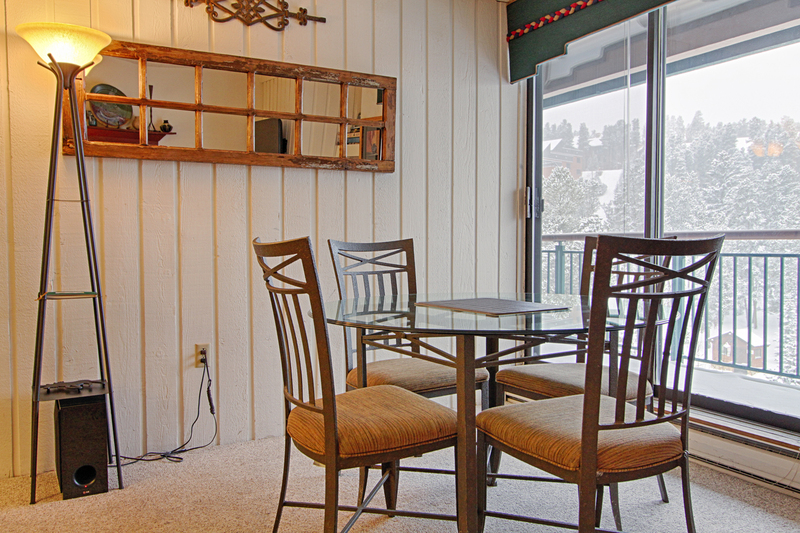 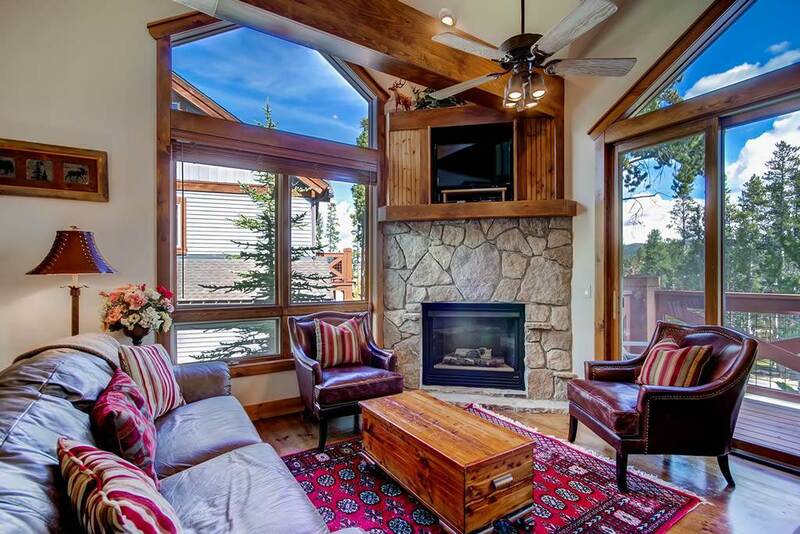 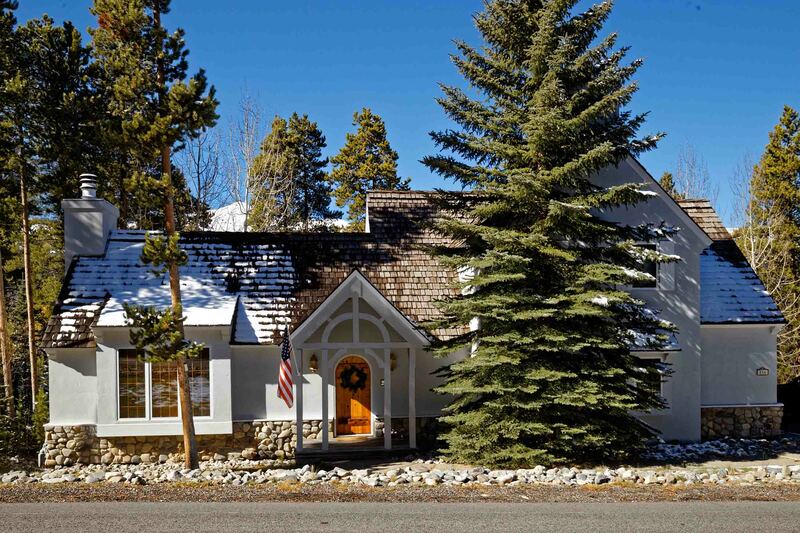 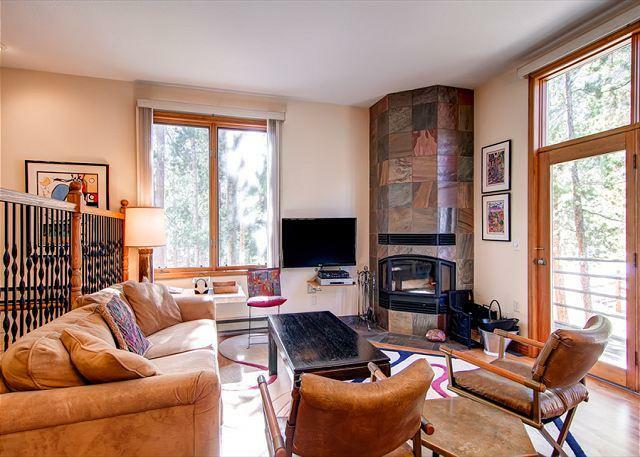 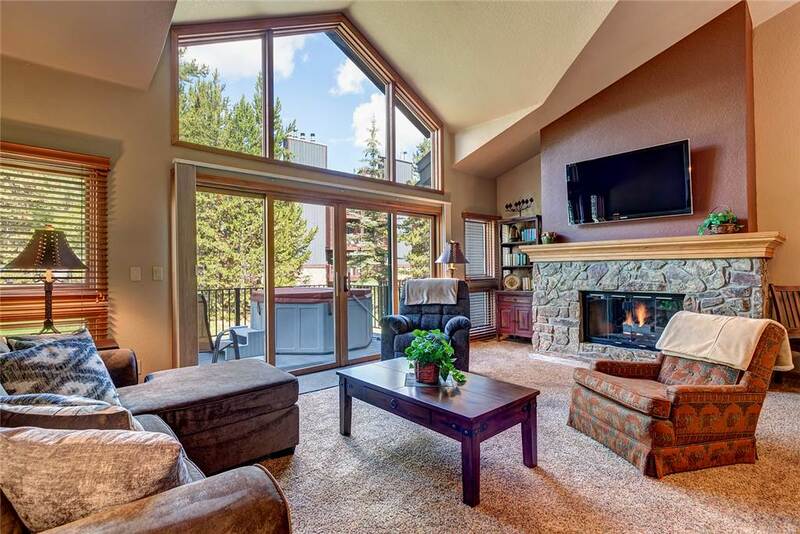 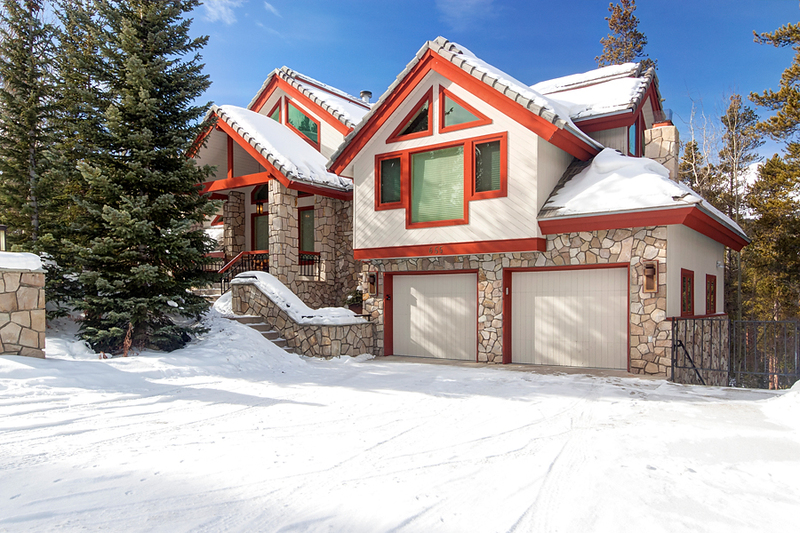 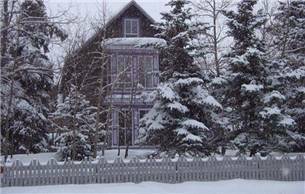 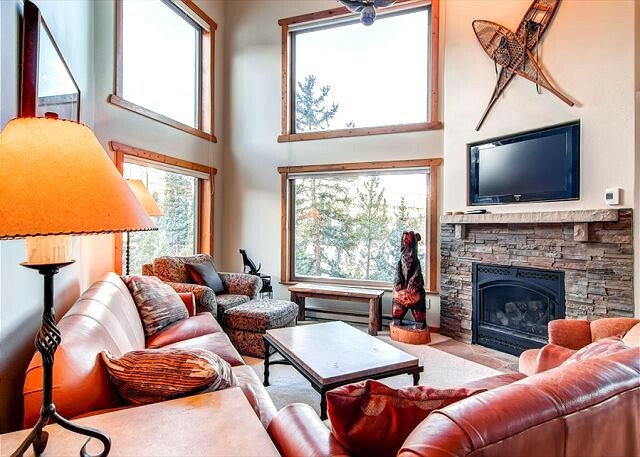 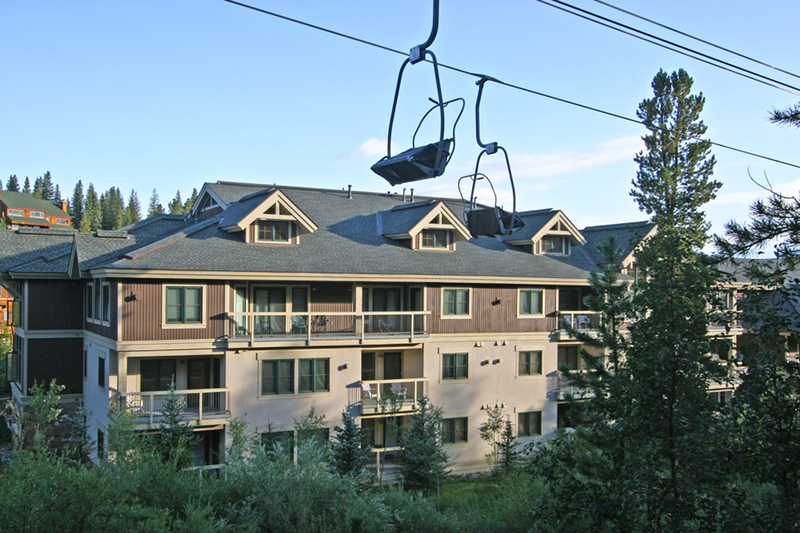 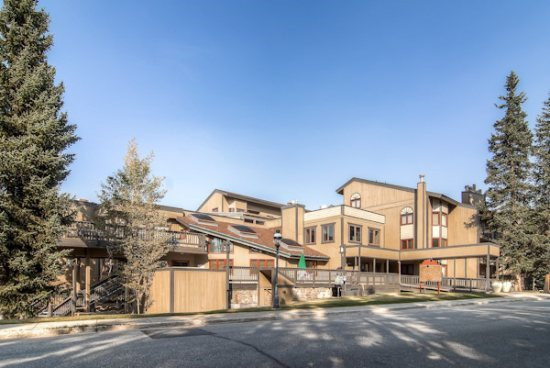 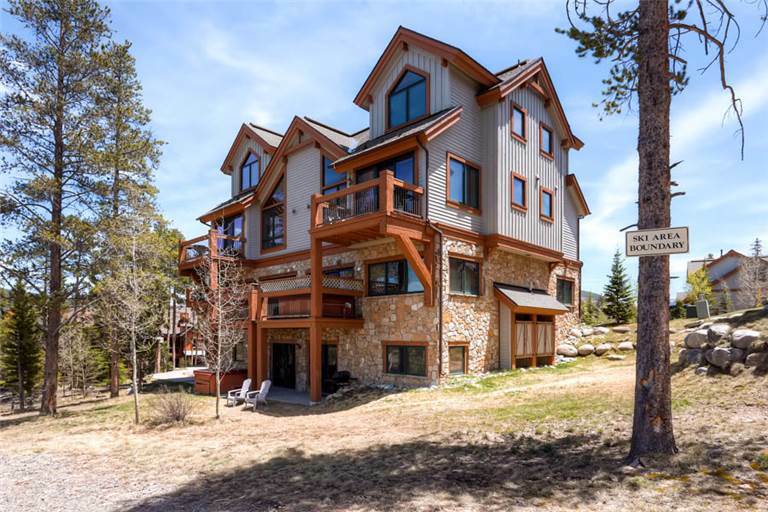 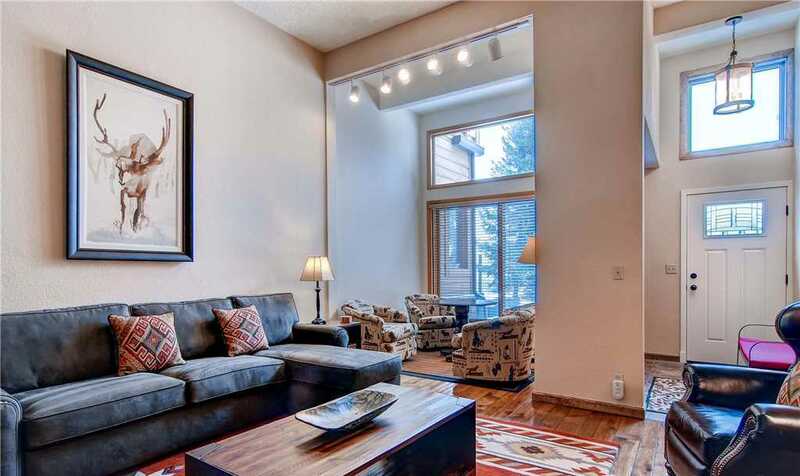 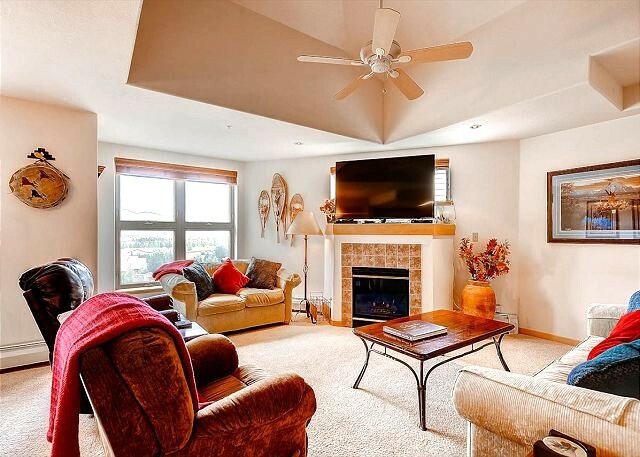 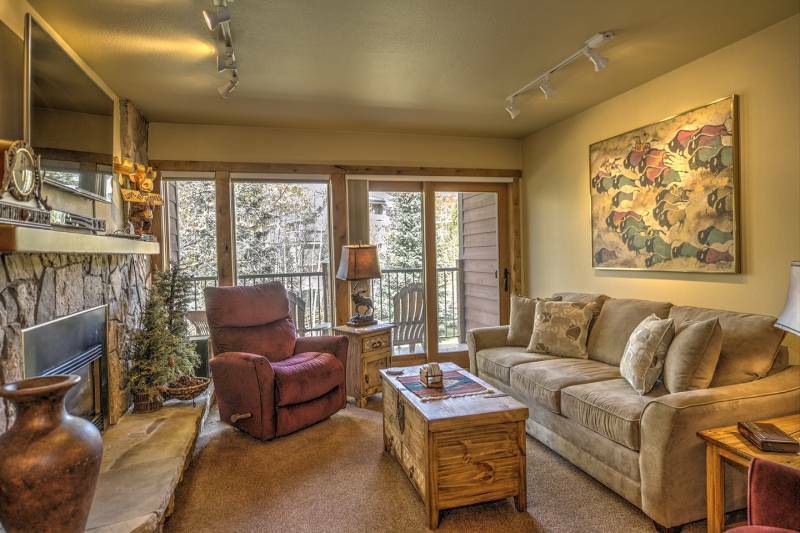 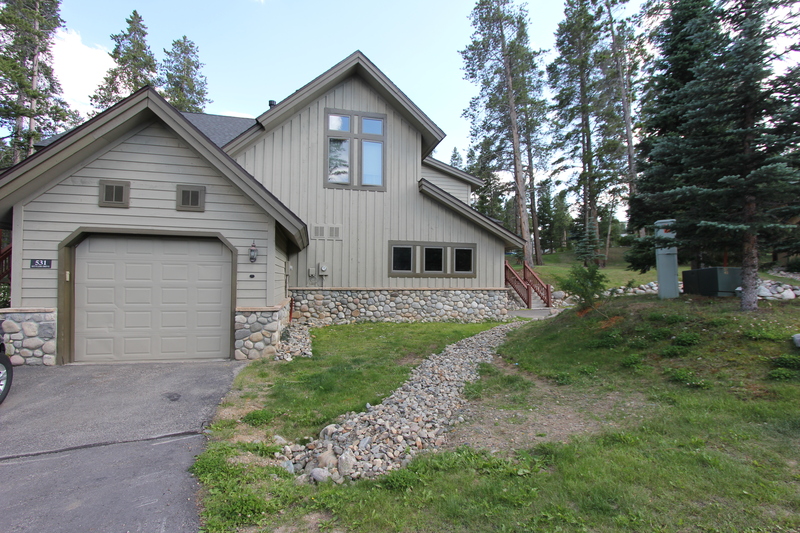 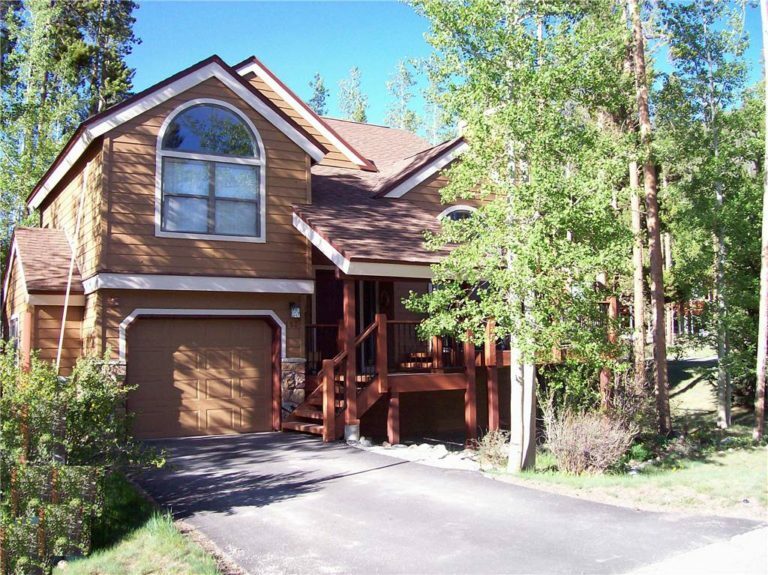 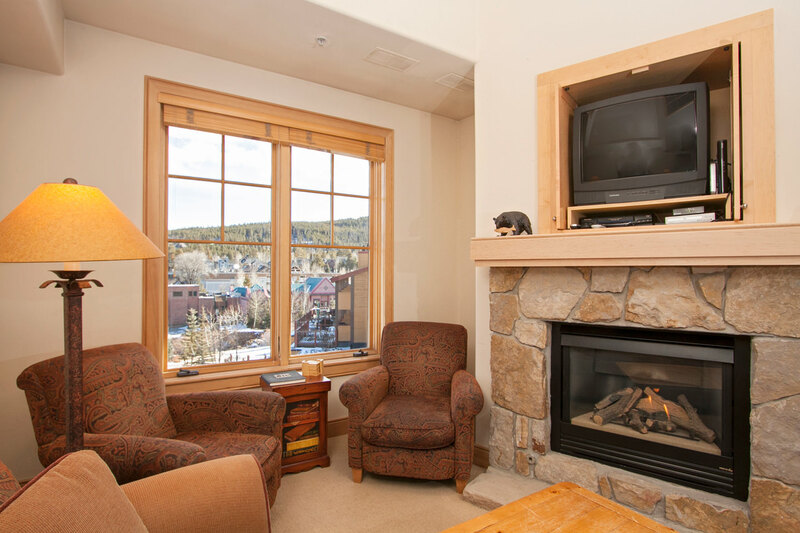 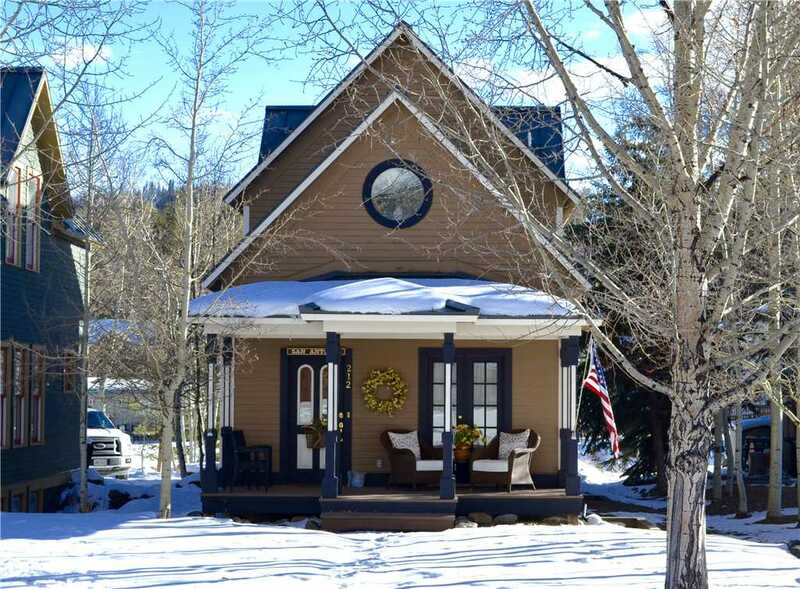 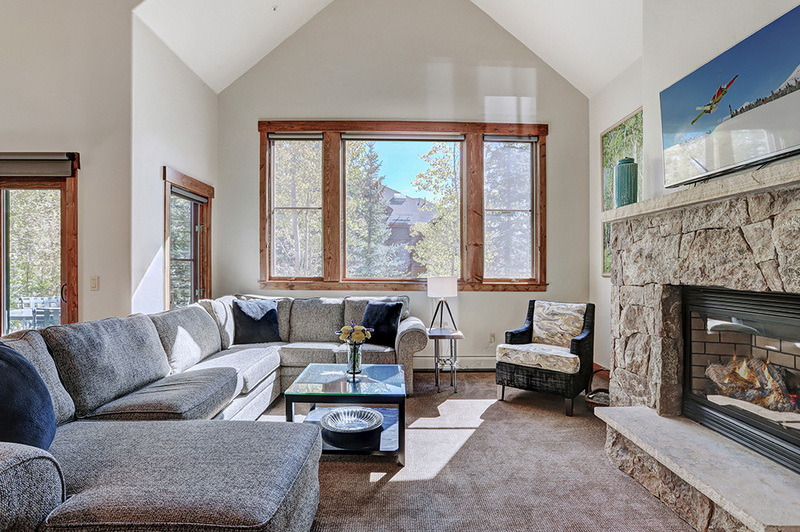 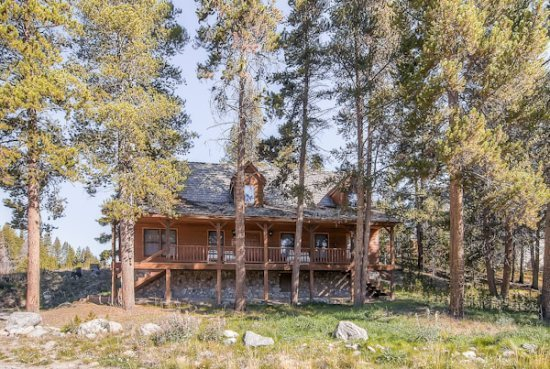 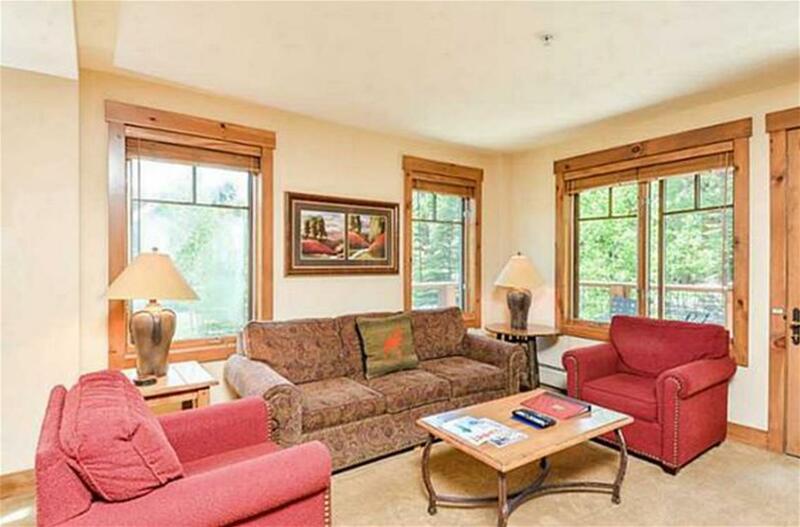 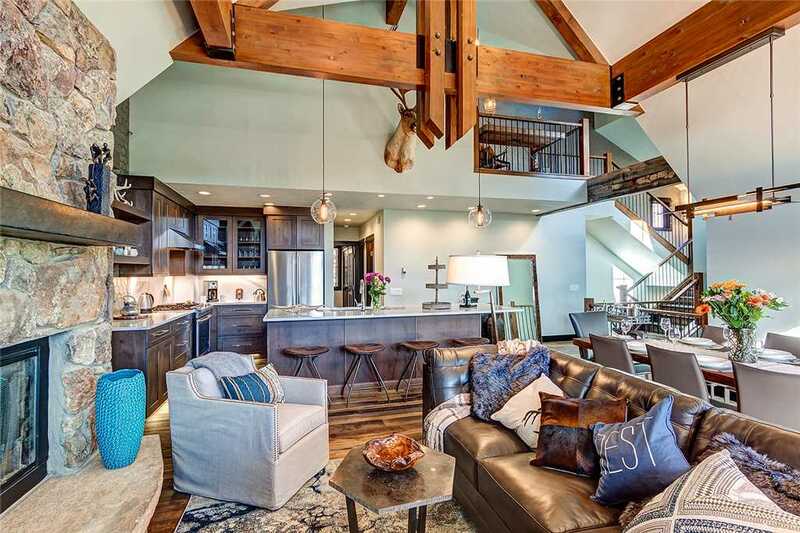 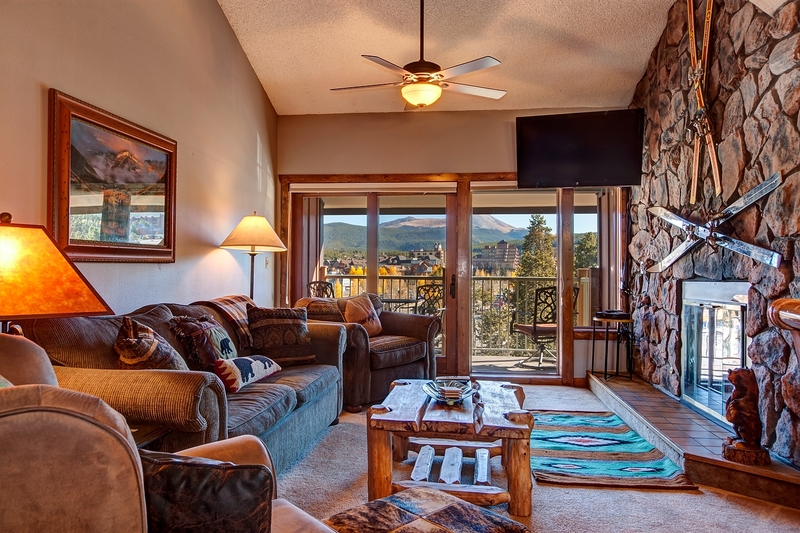 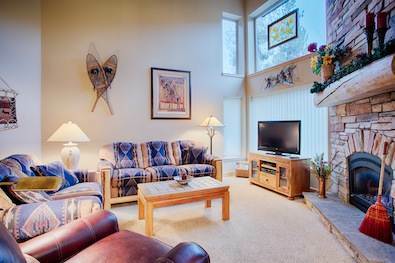 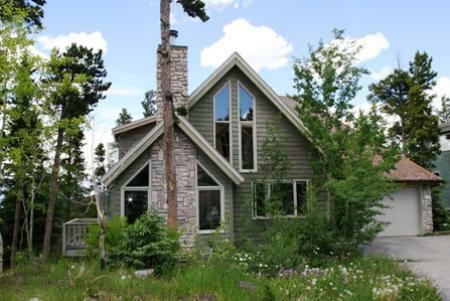 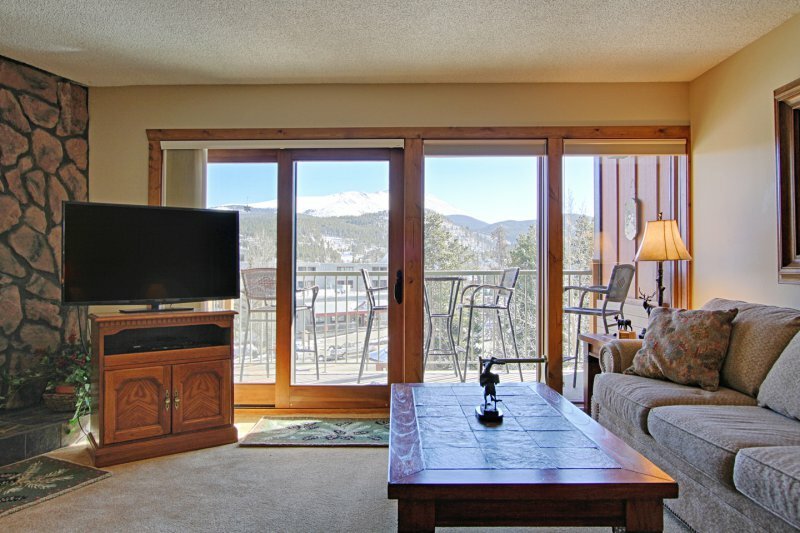 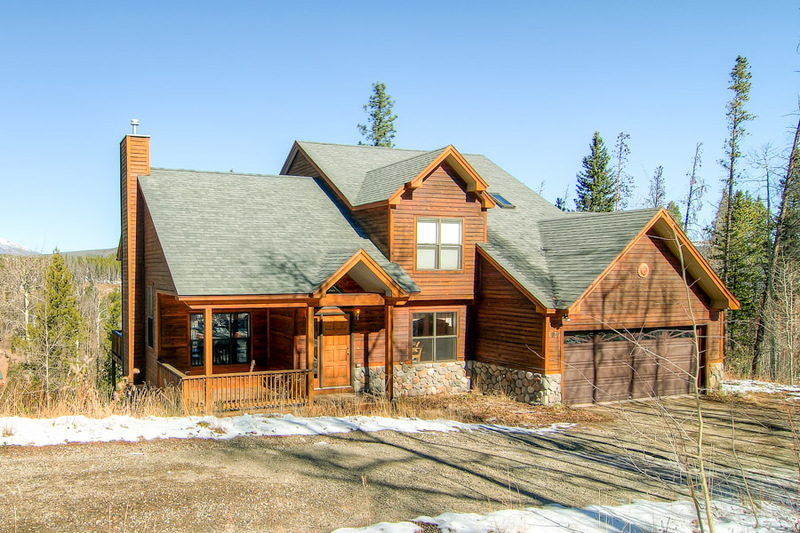 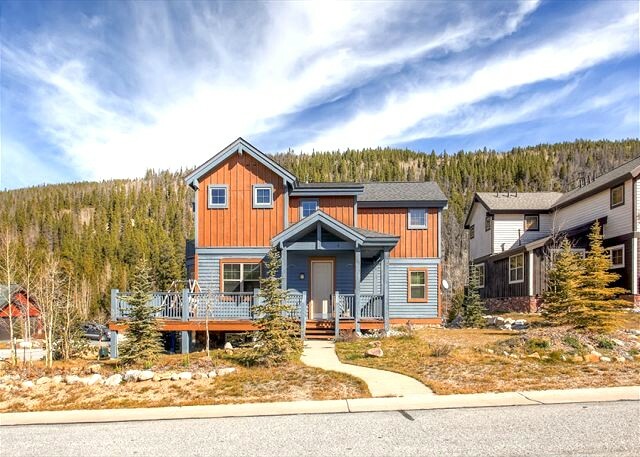 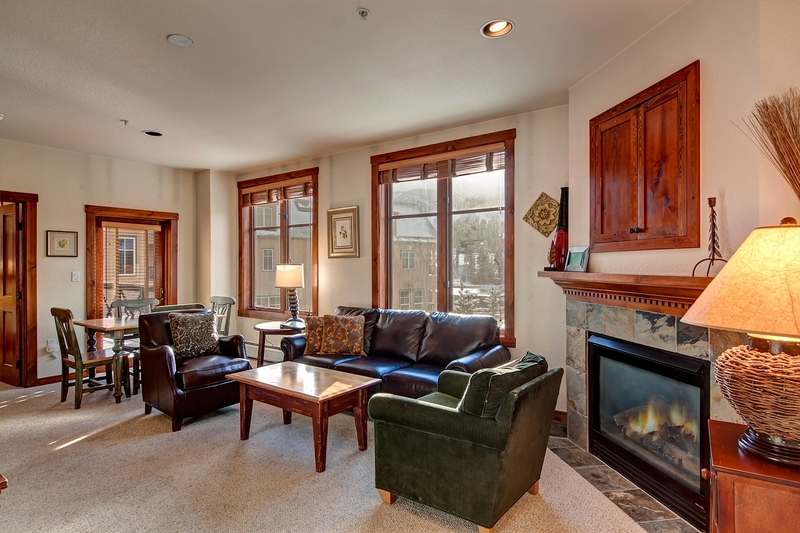 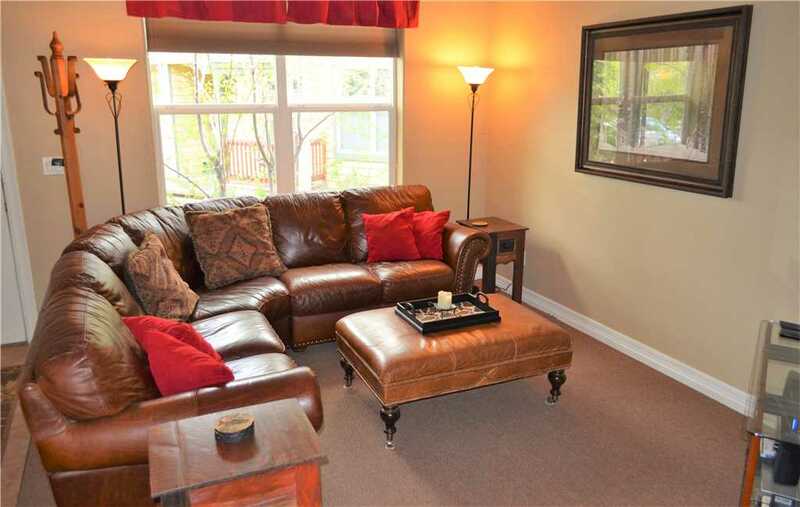 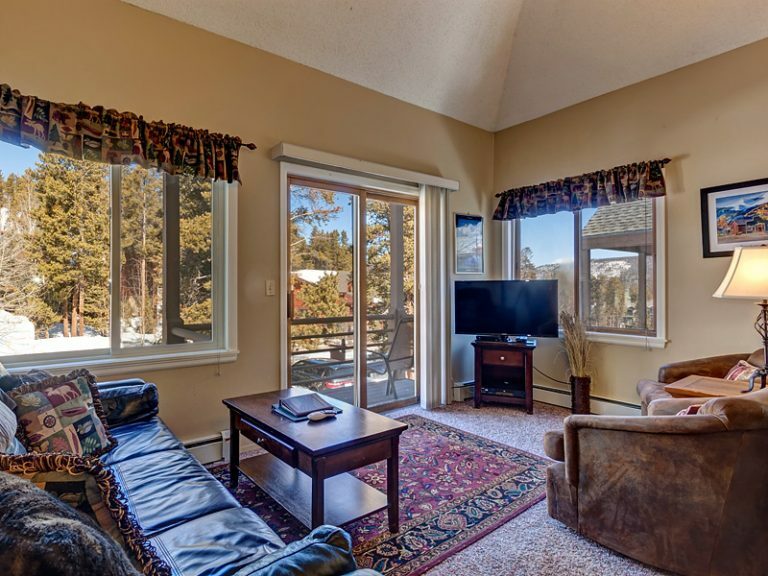 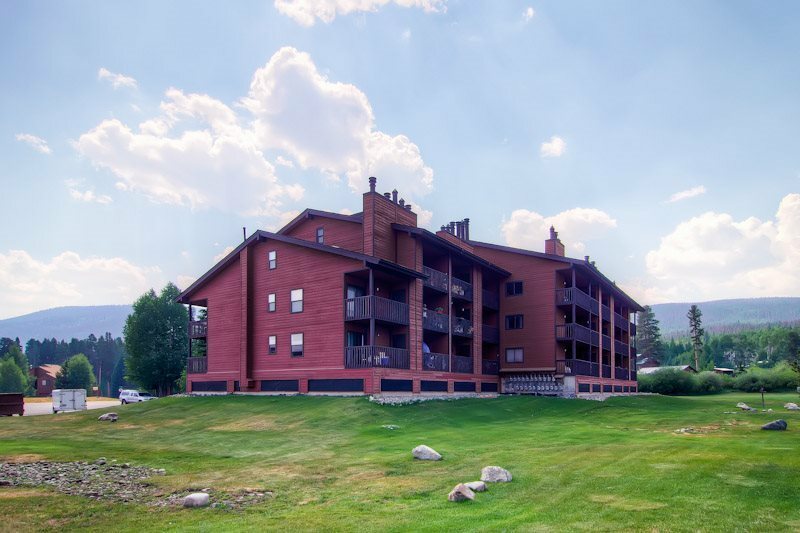 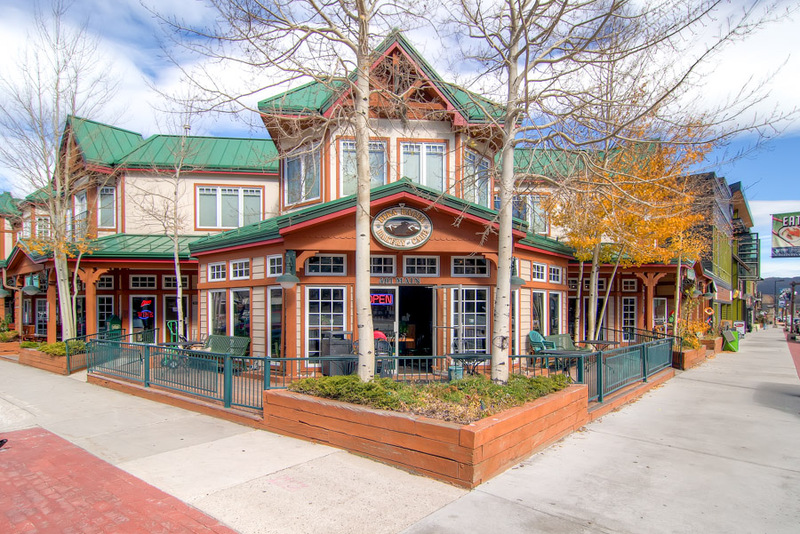 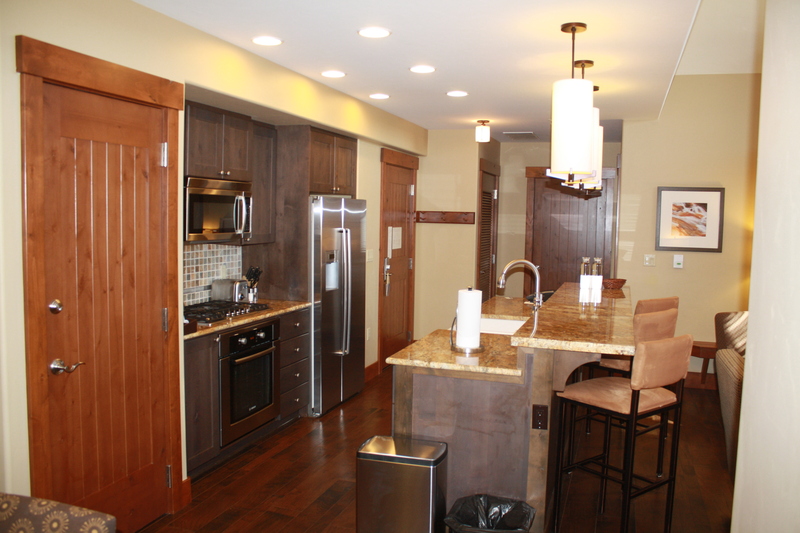 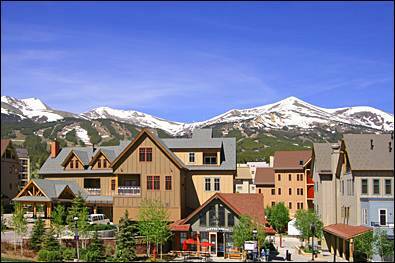 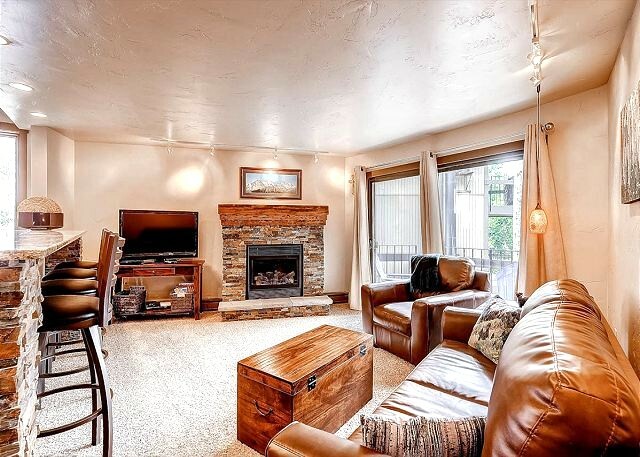 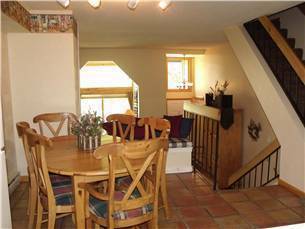 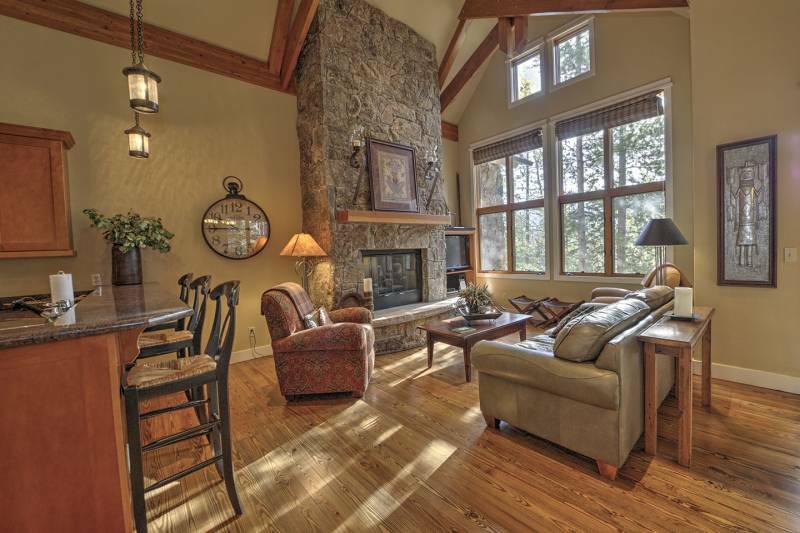 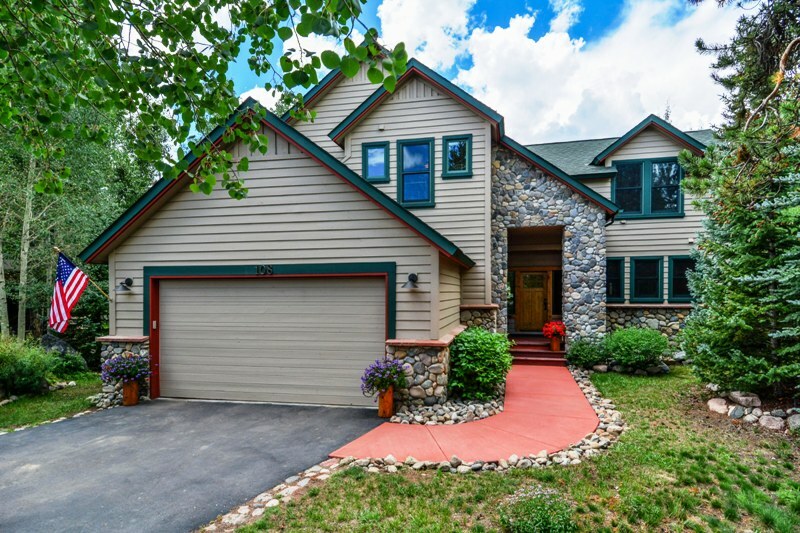 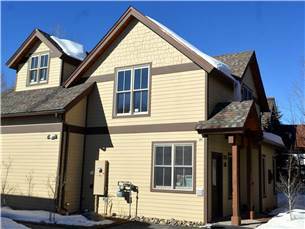 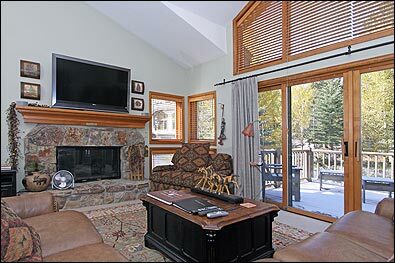 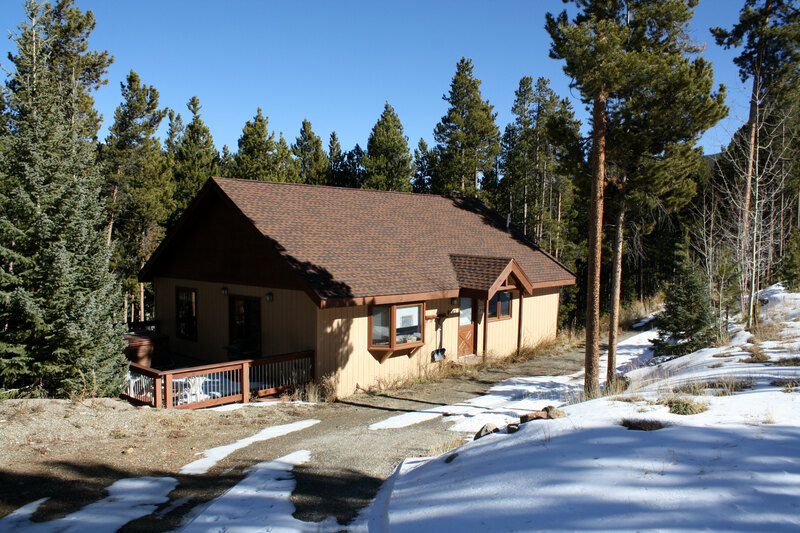 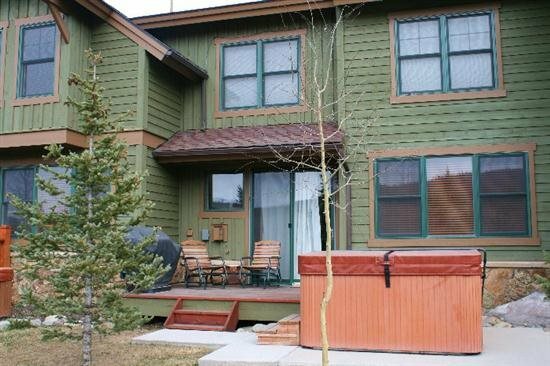 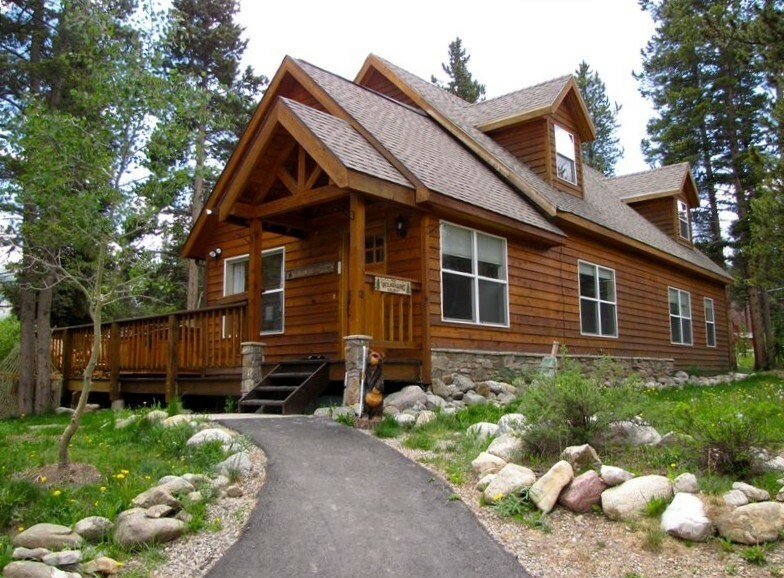 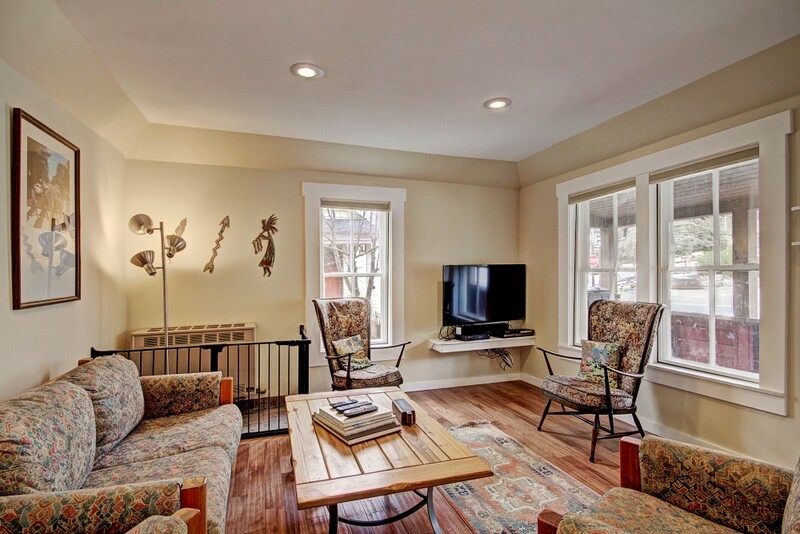 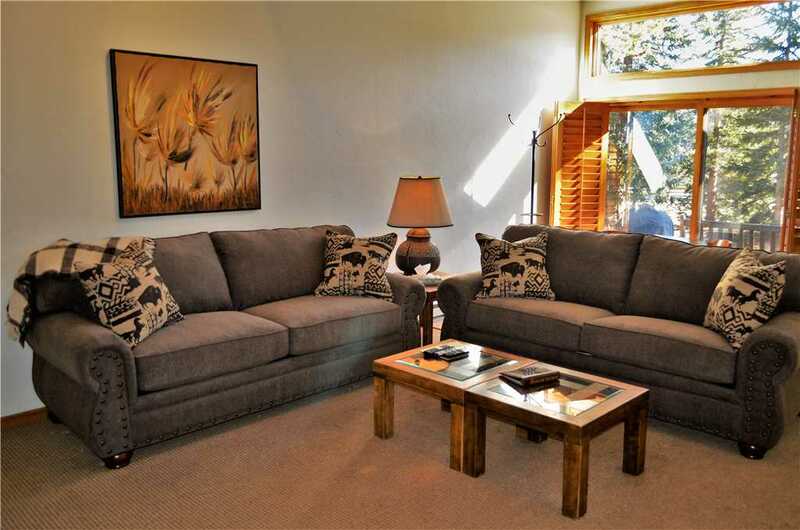 The beautiful Breckenridge Heights area is just a short drive to downtown Breckenridge and the slopes. 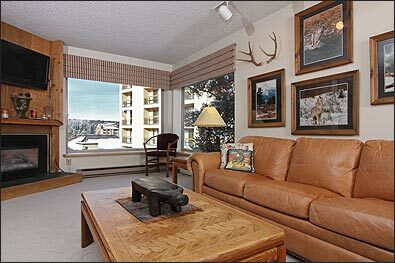 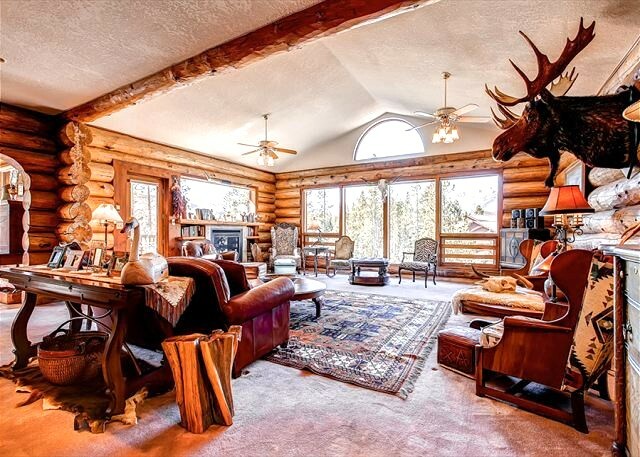 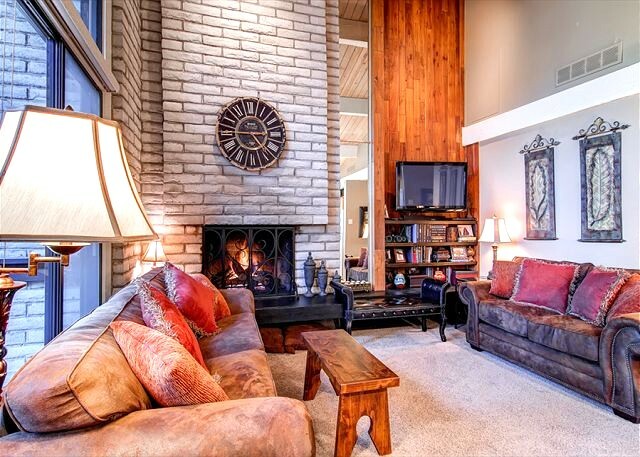 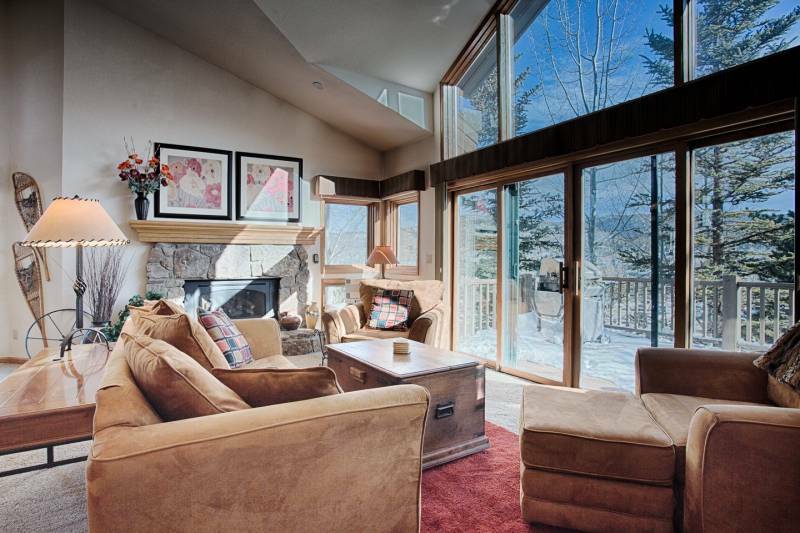 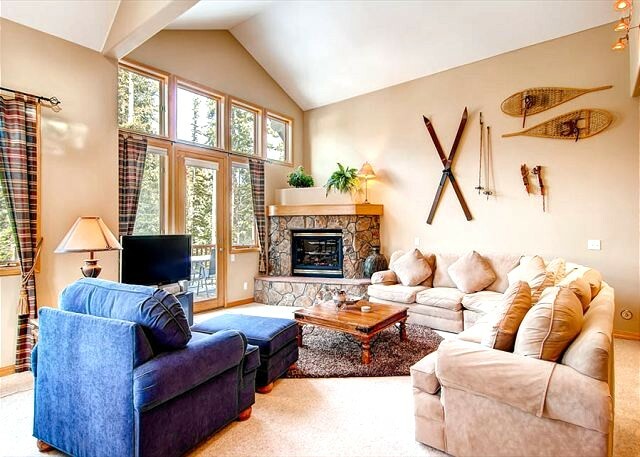 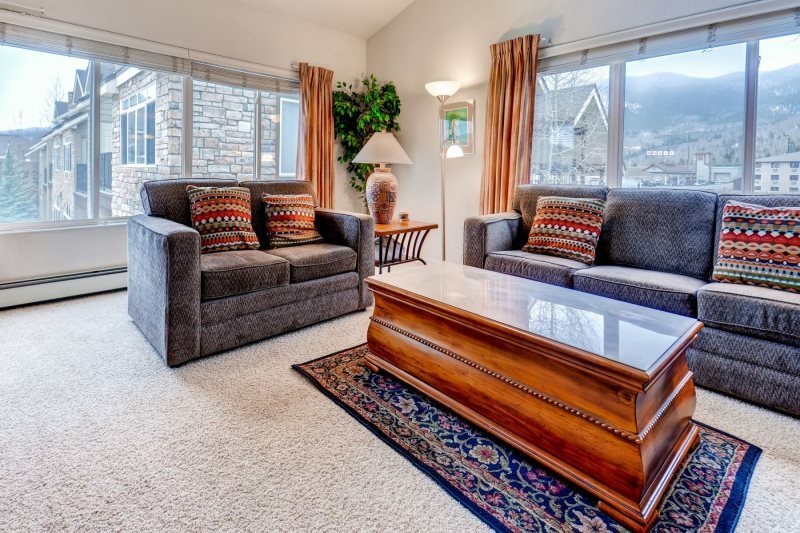 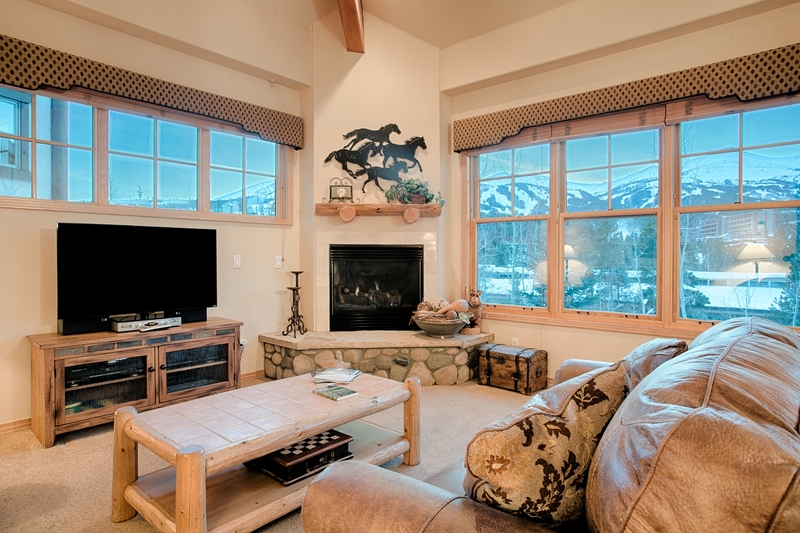 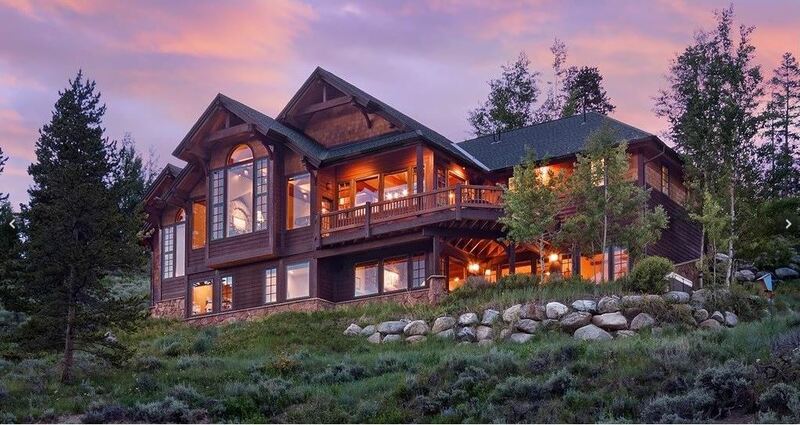 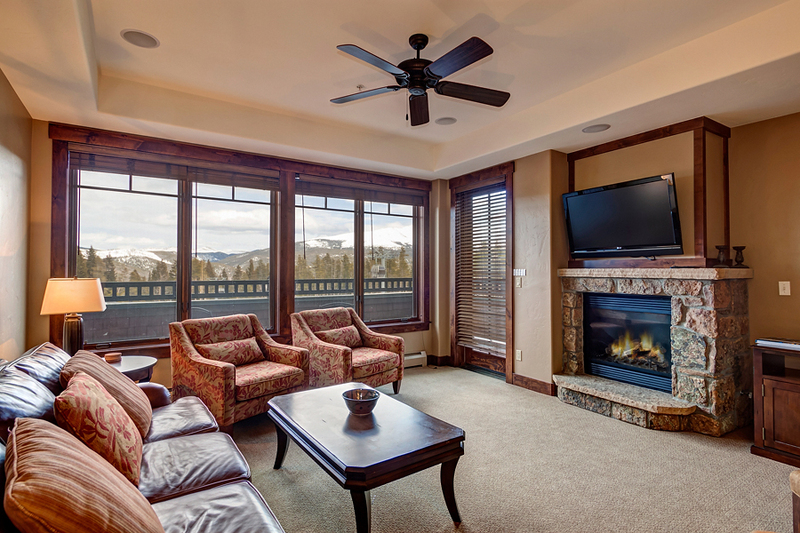 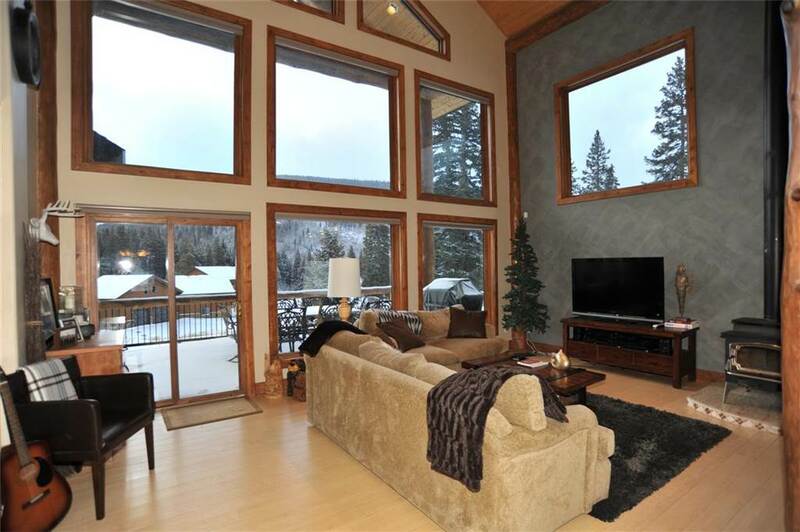 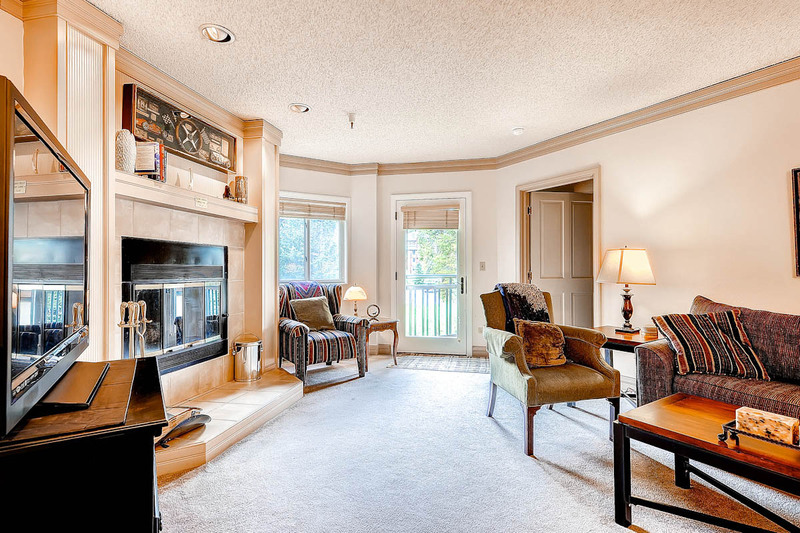 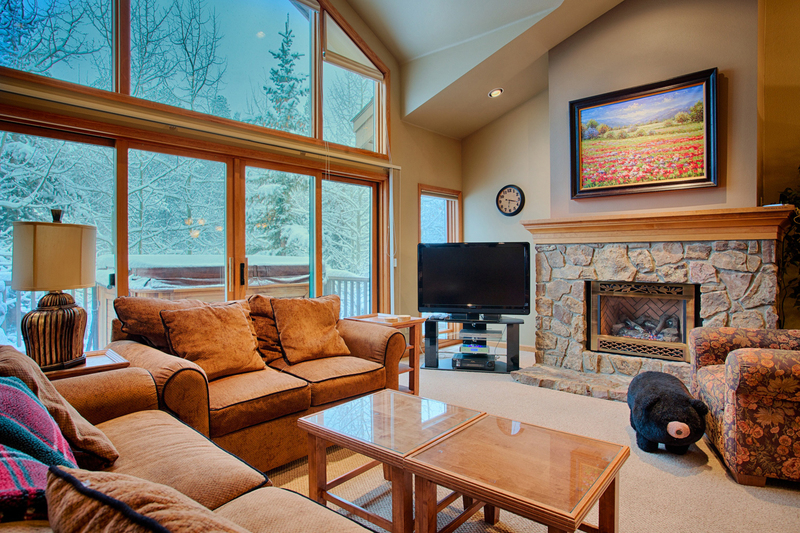 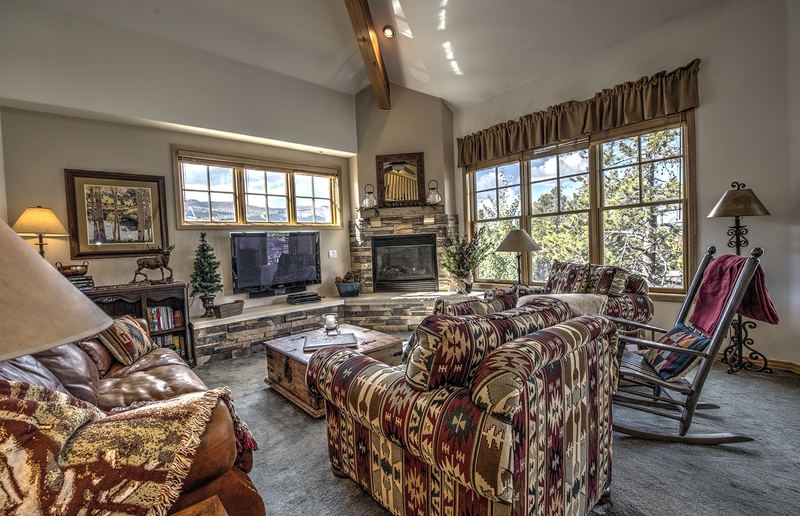 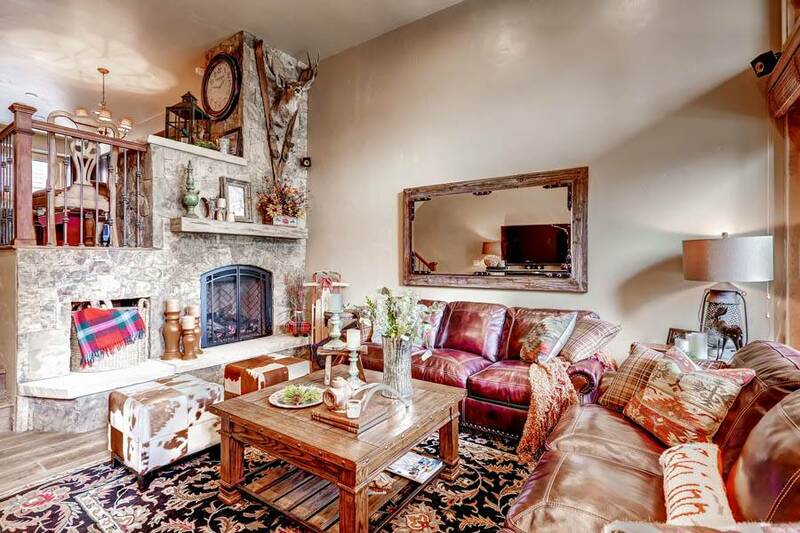 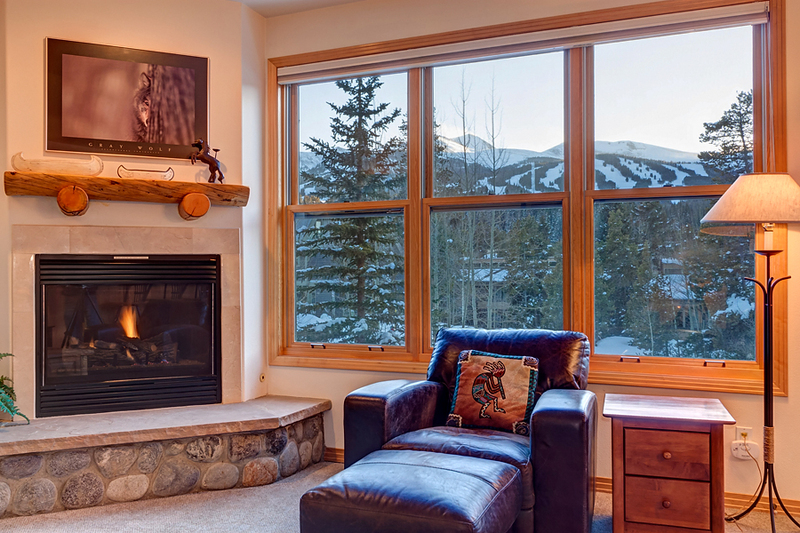 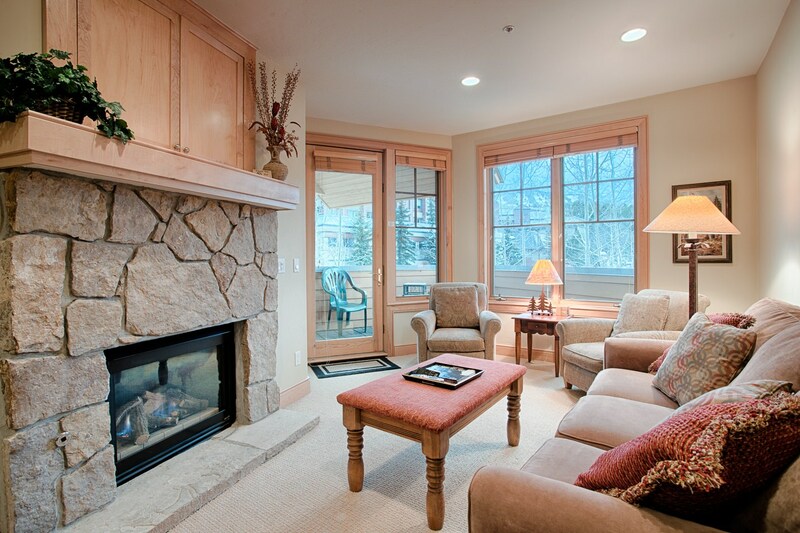 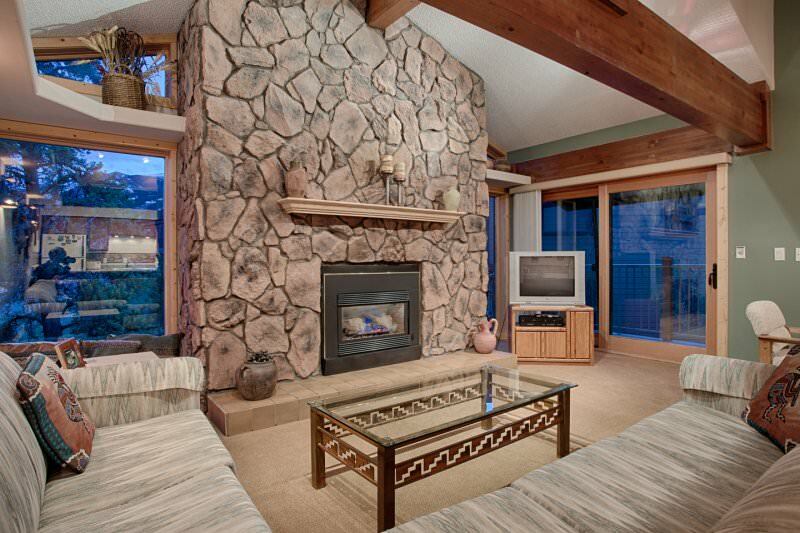 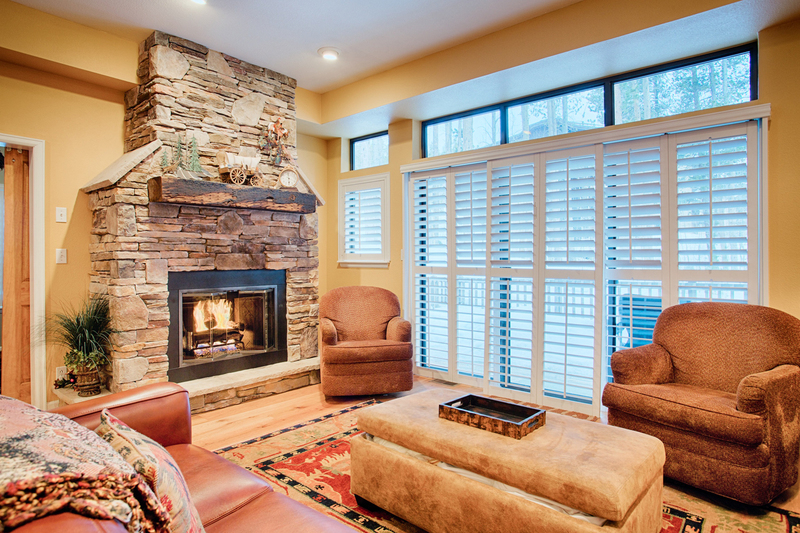 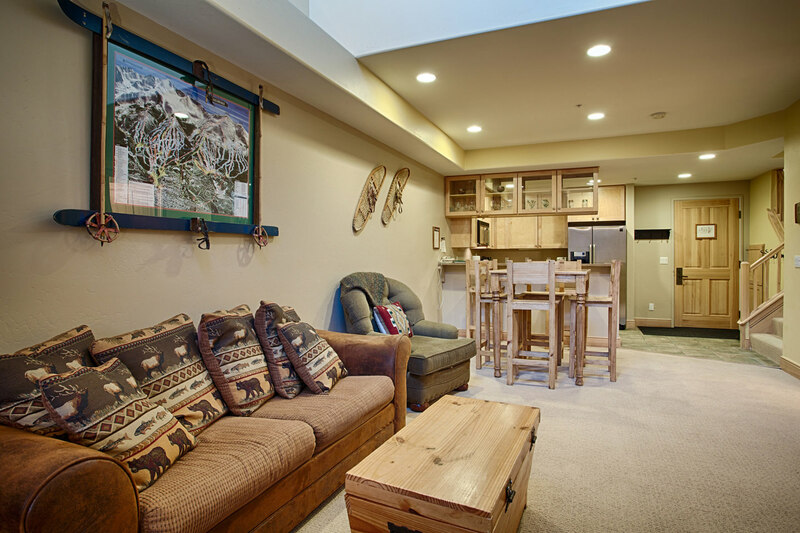 And you’ll enjoy a beautiful view of the slopes throughout the home. 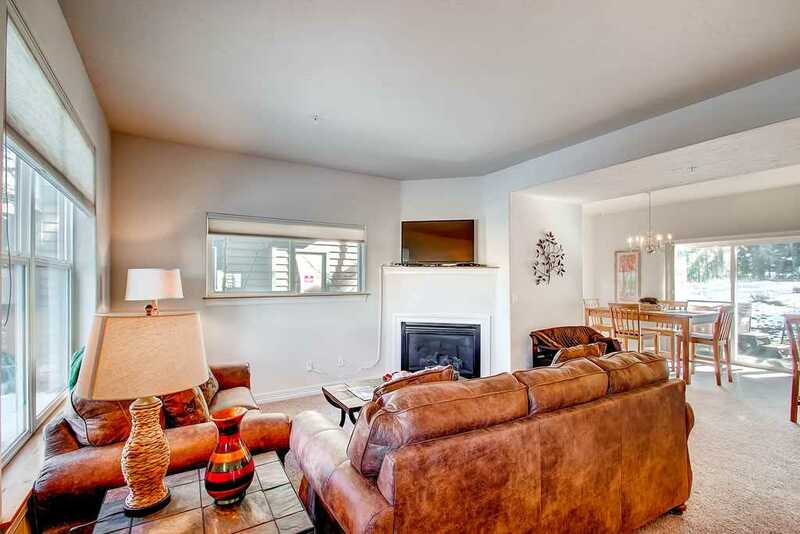 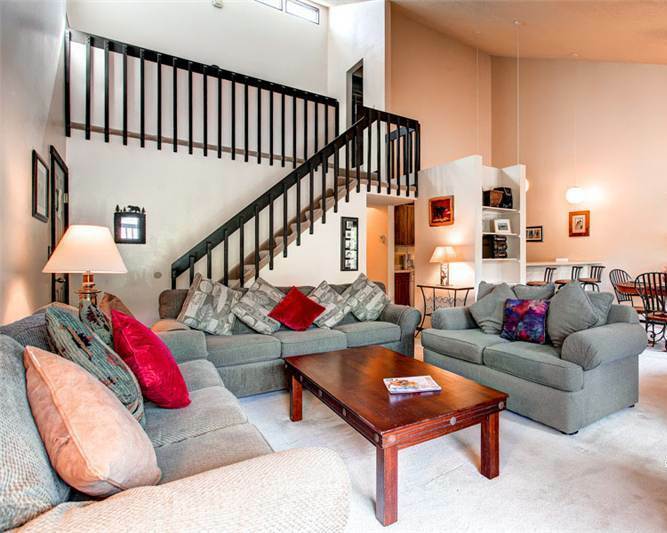 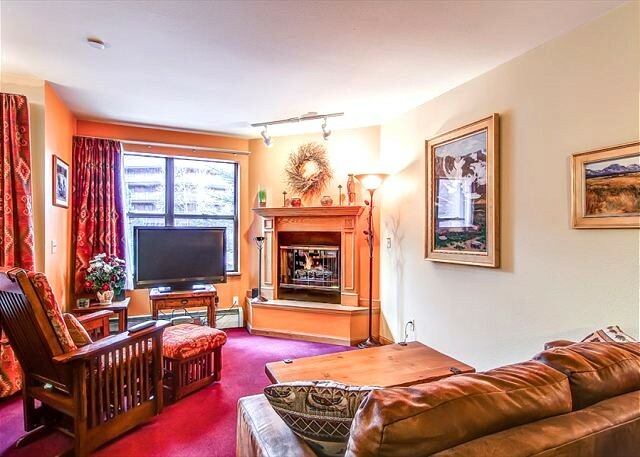 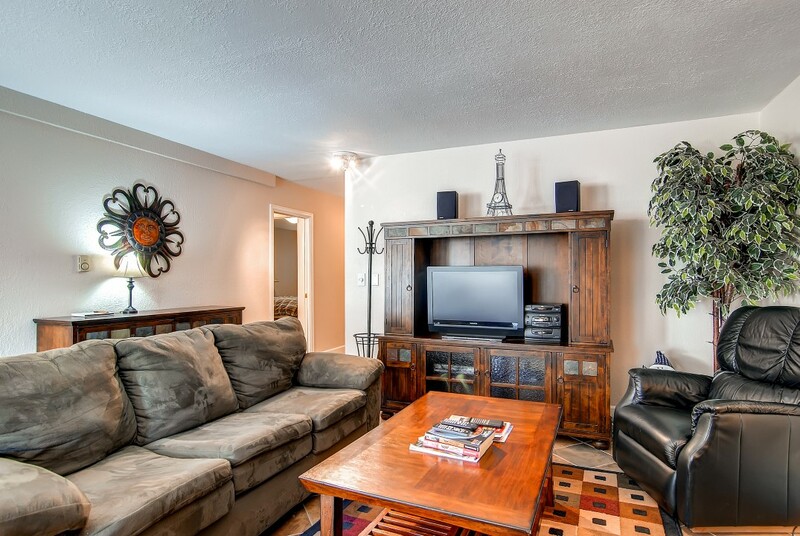 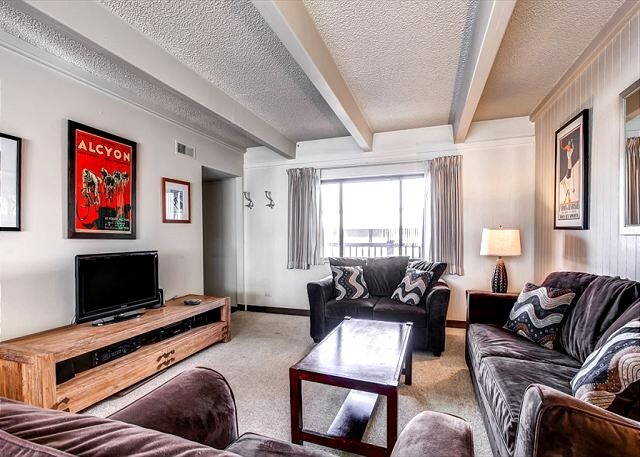 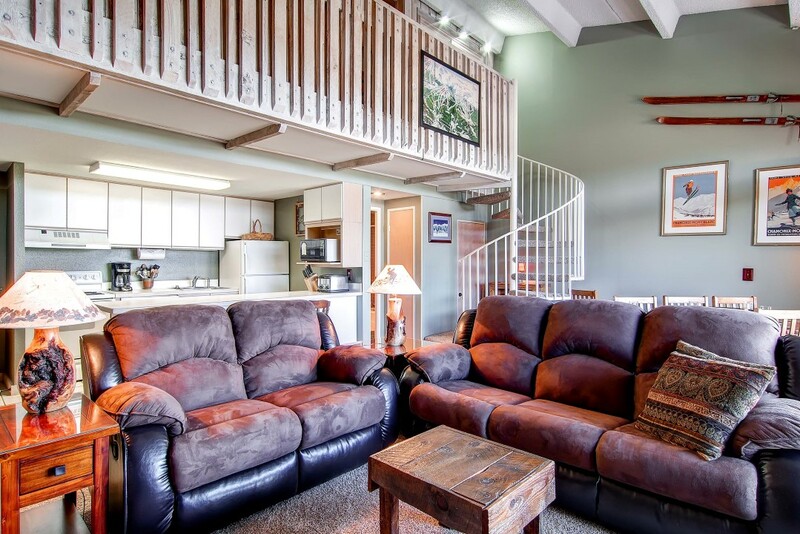 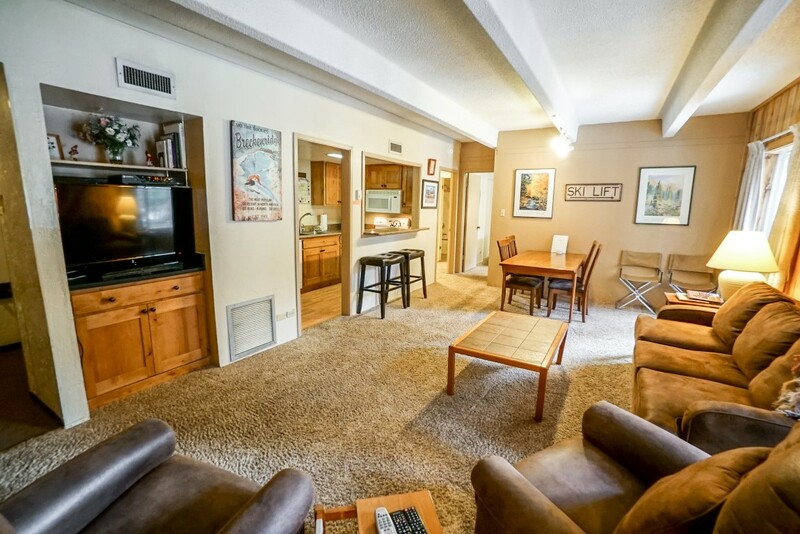 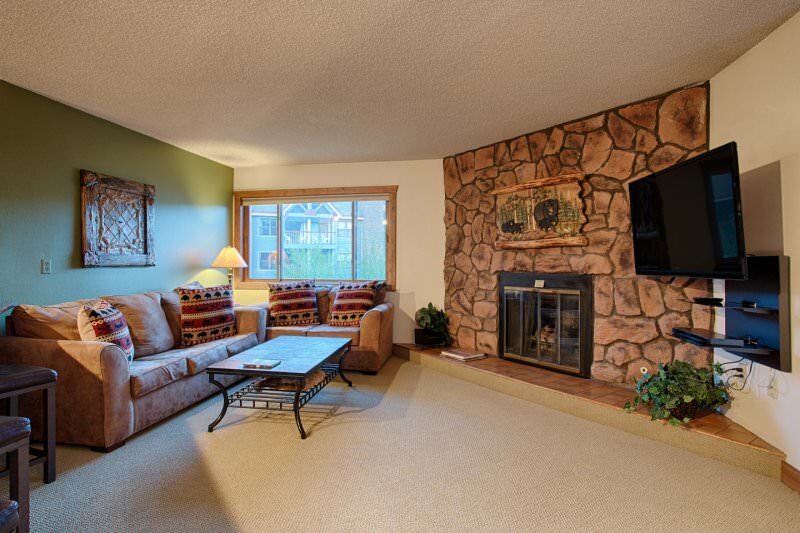 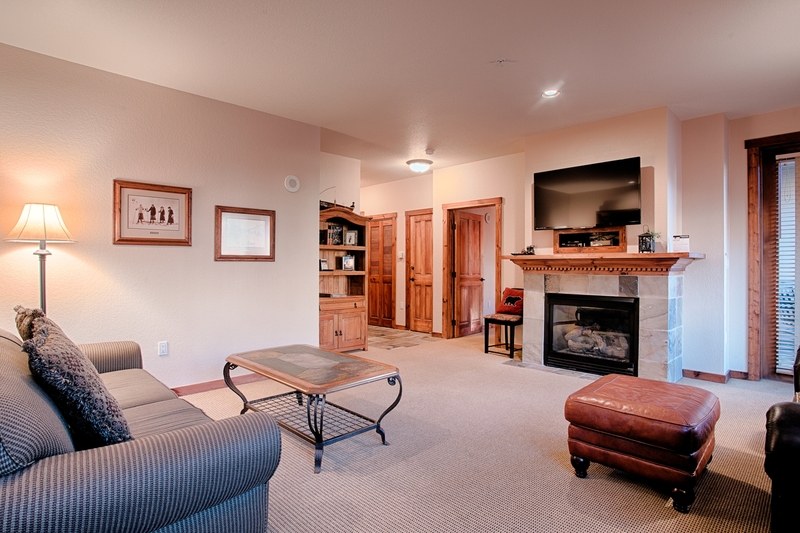 With more than 3,500 square feet, there’s plenty of room for everyone. 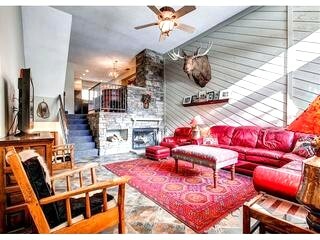 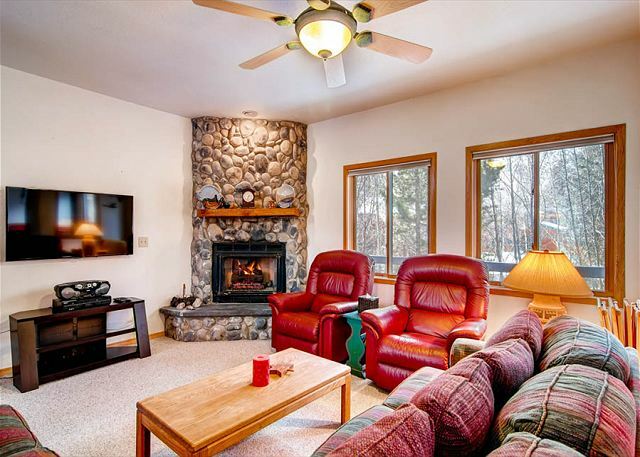 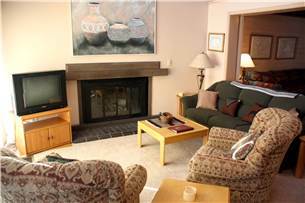 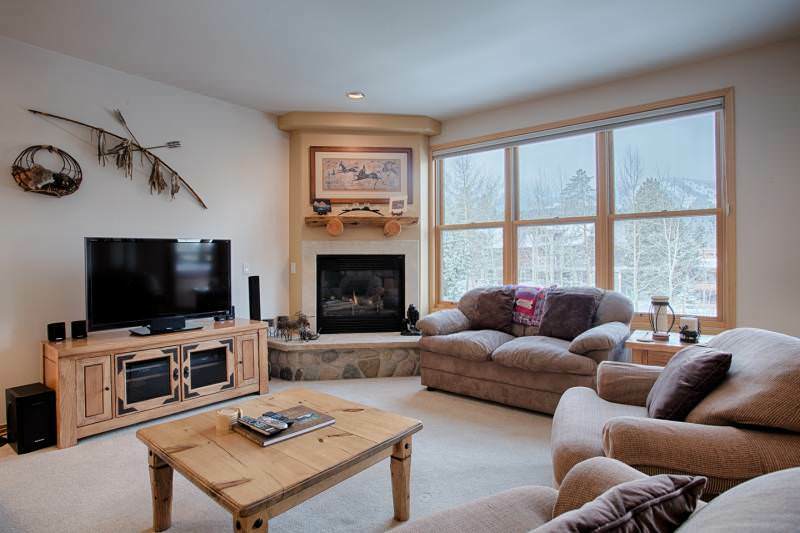 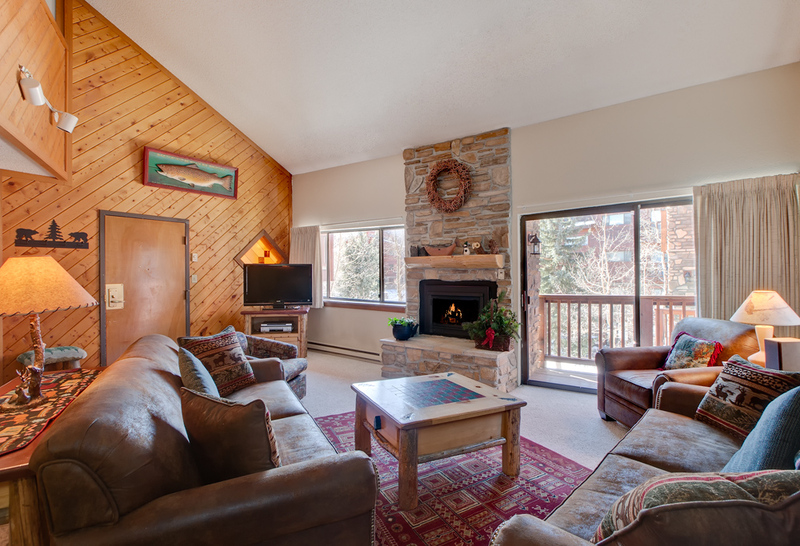 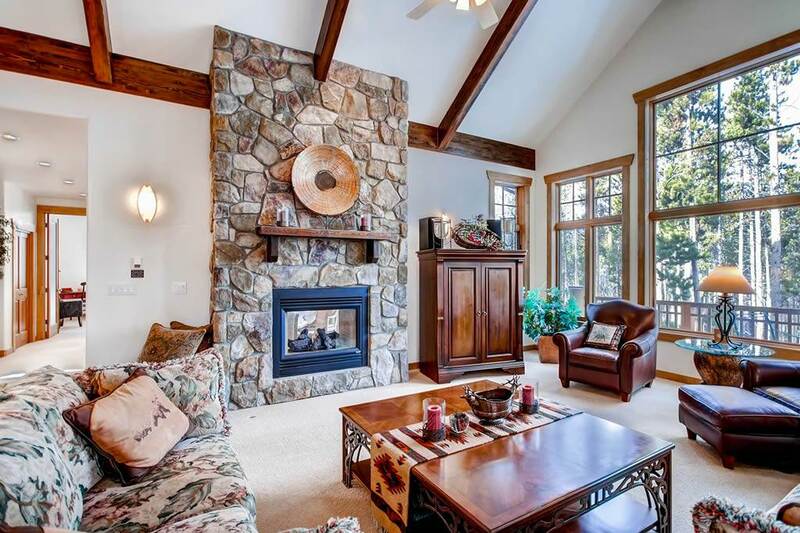 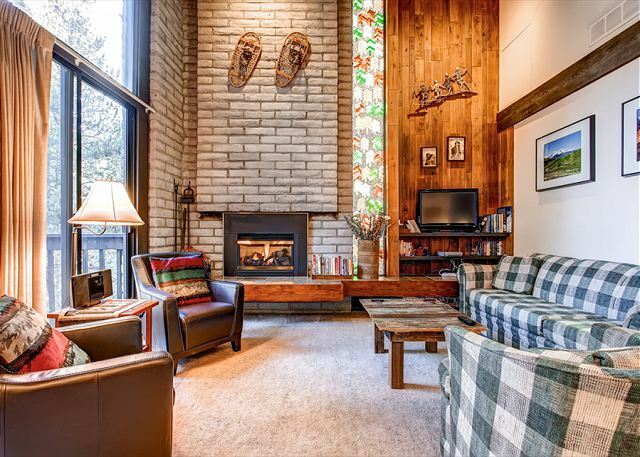 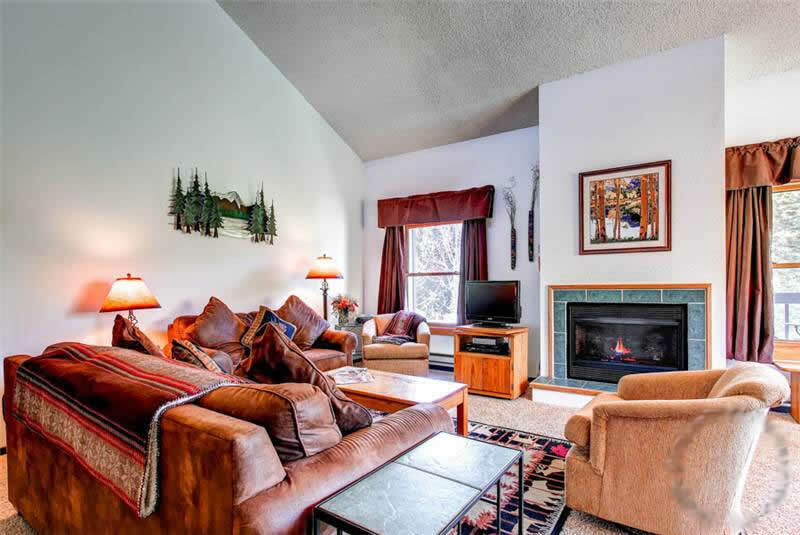 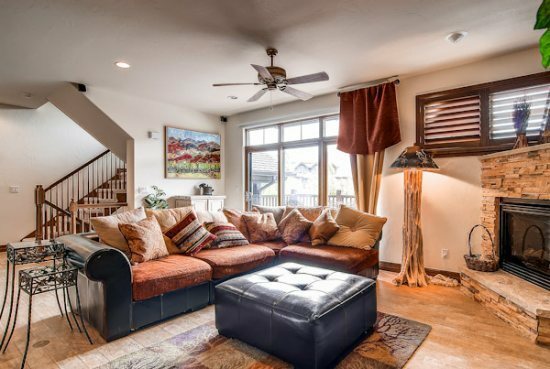 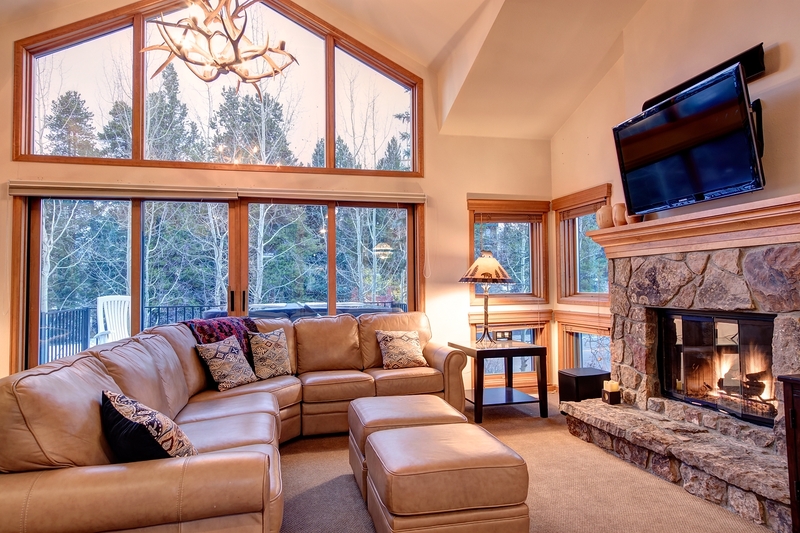 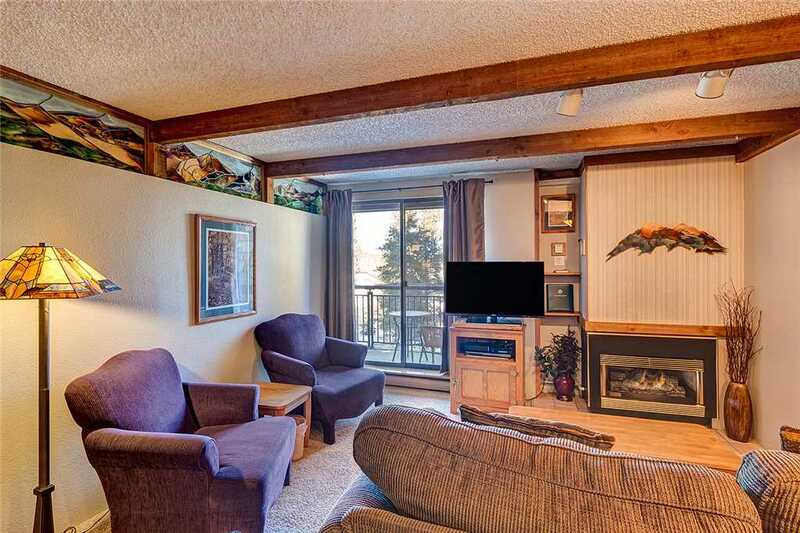 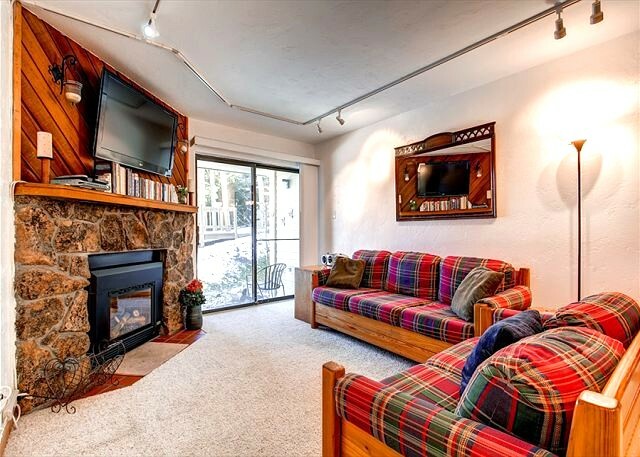 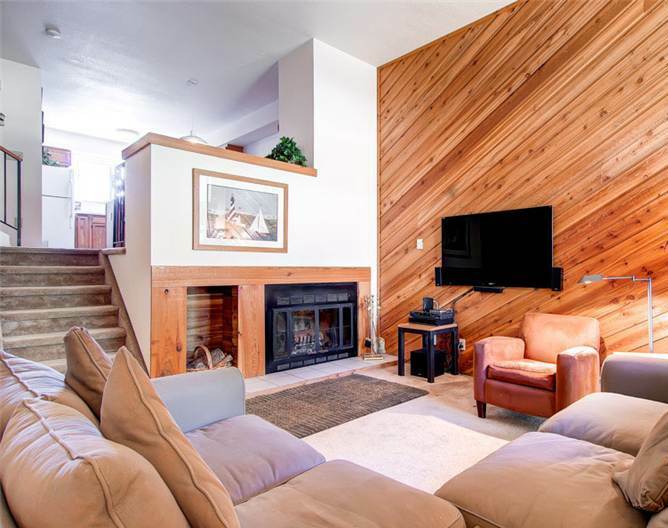 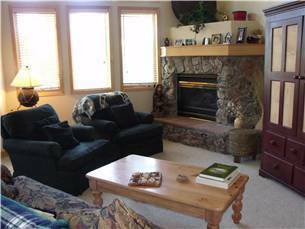 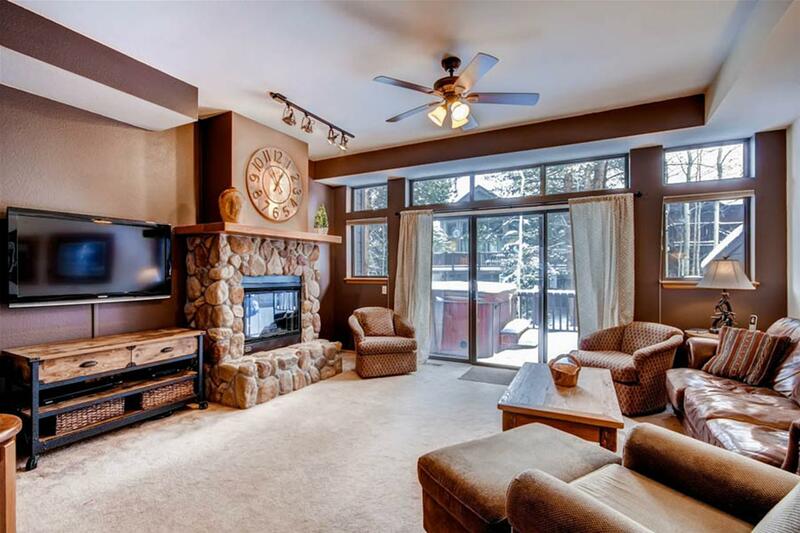 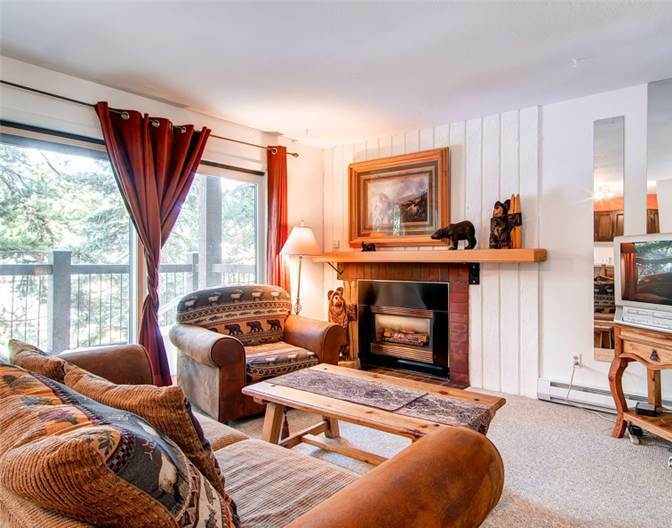 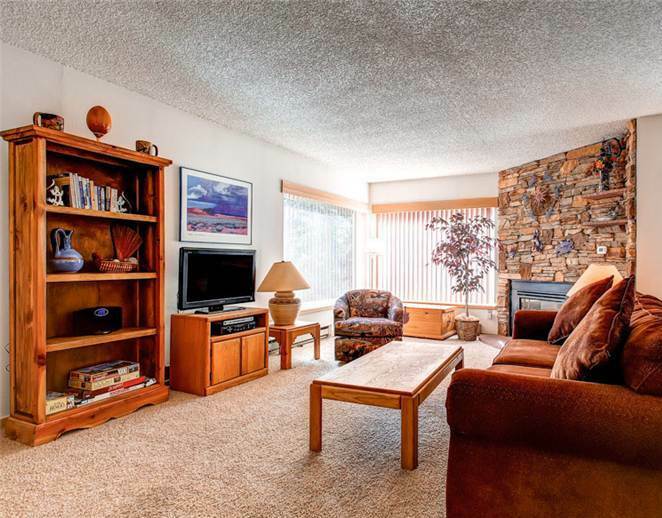 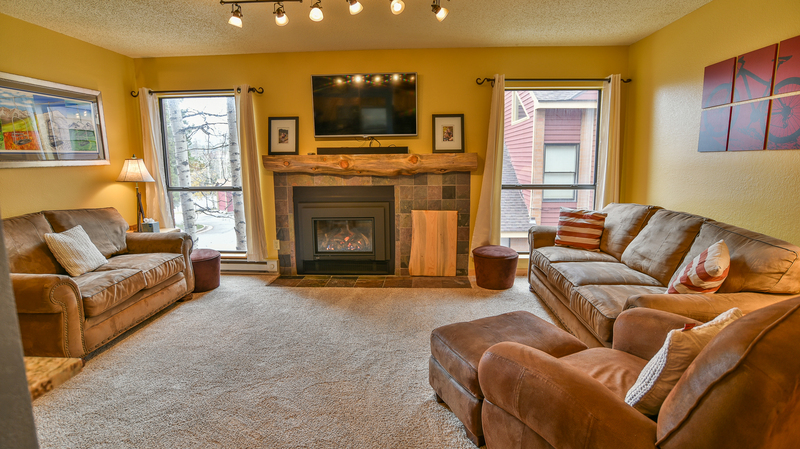 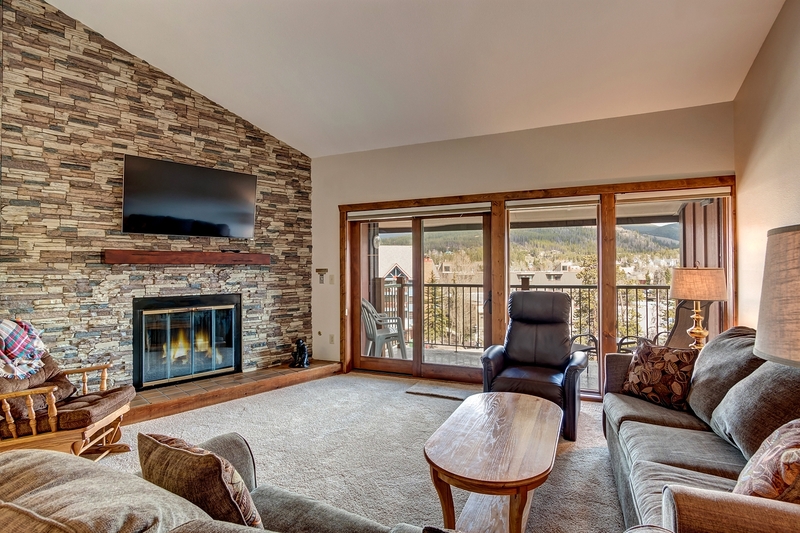 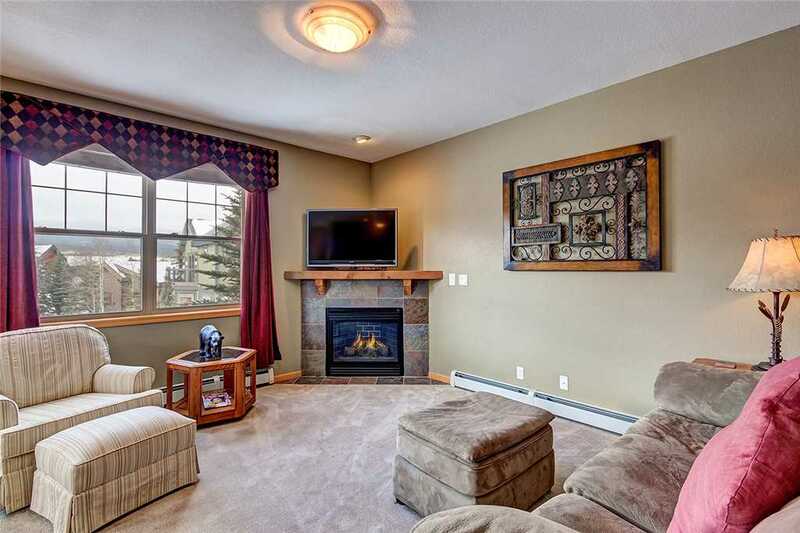 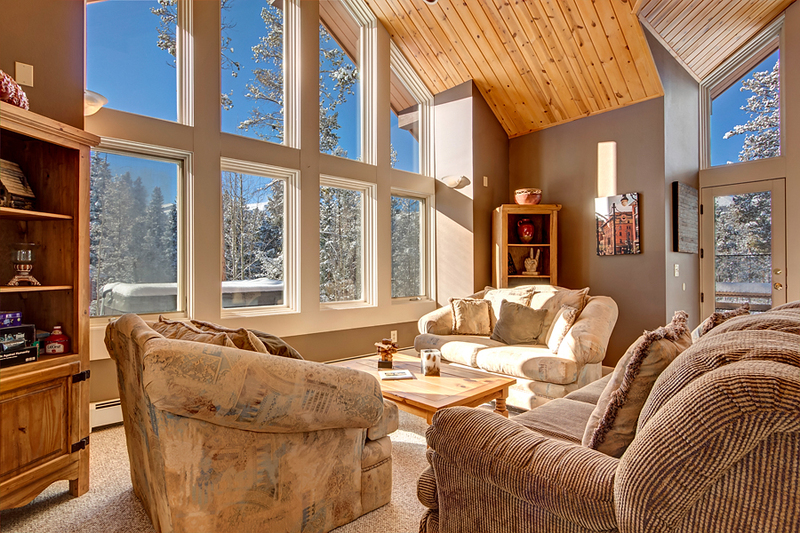 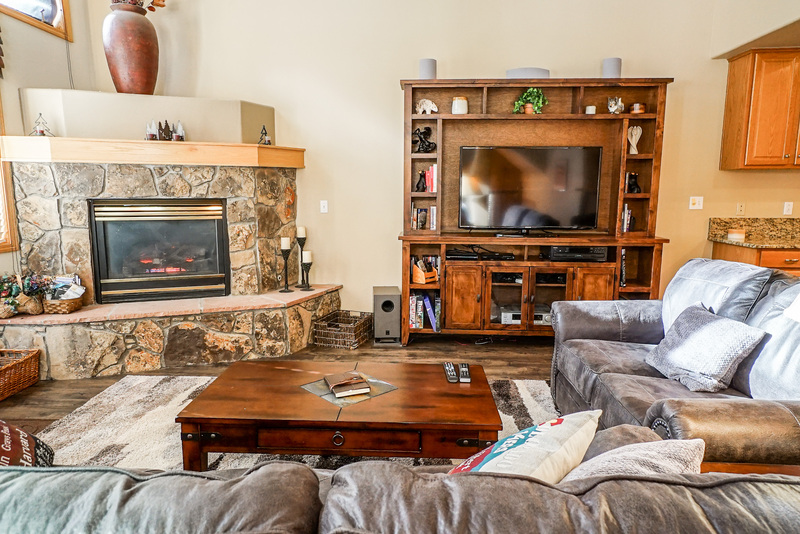 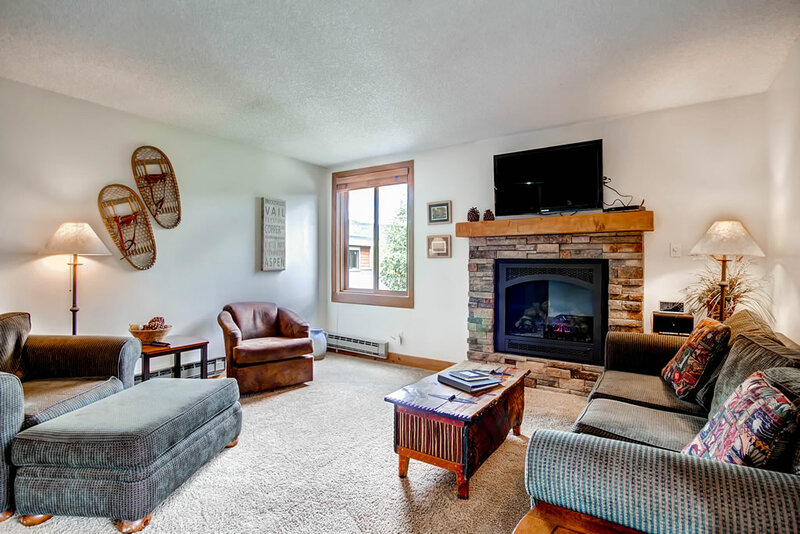 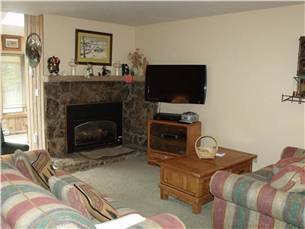 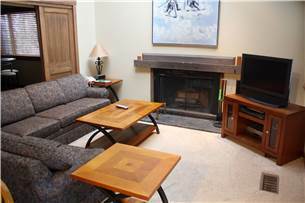 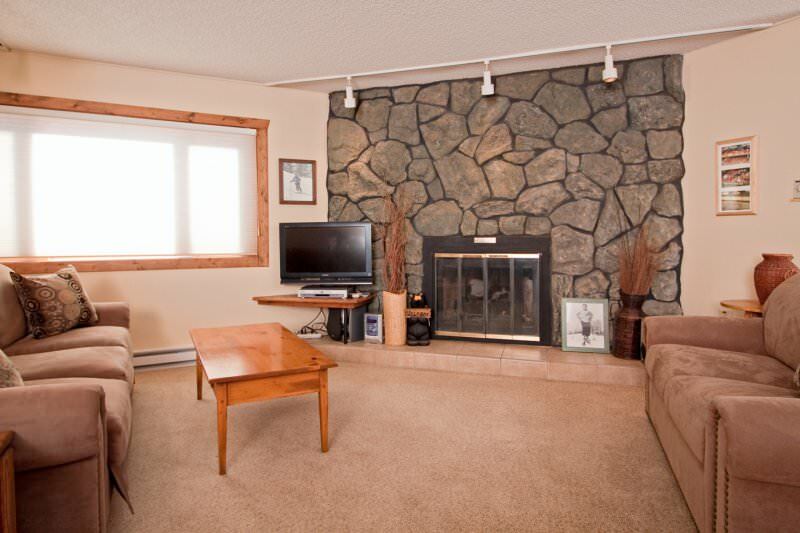 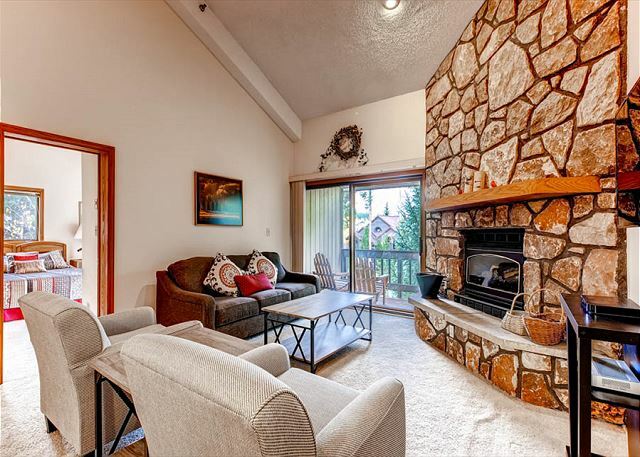 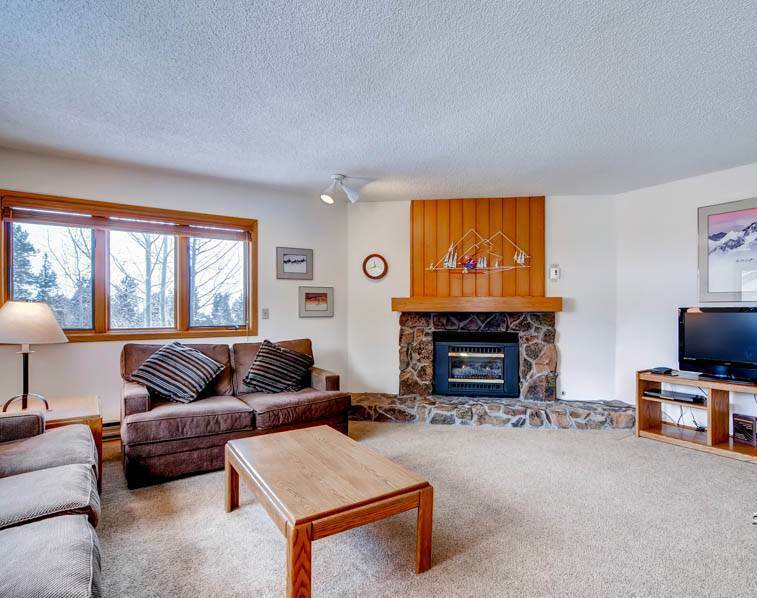 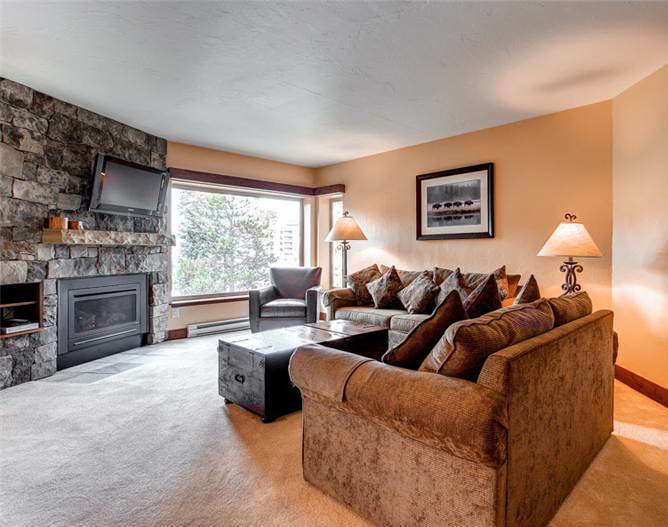 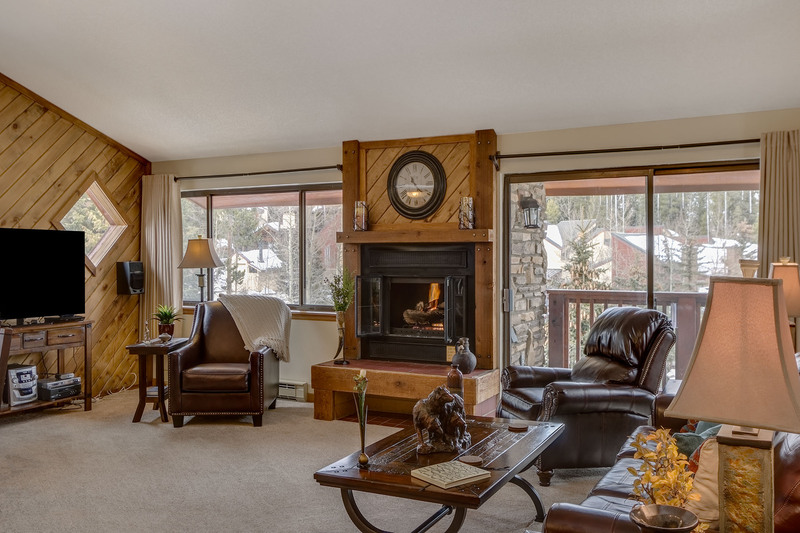 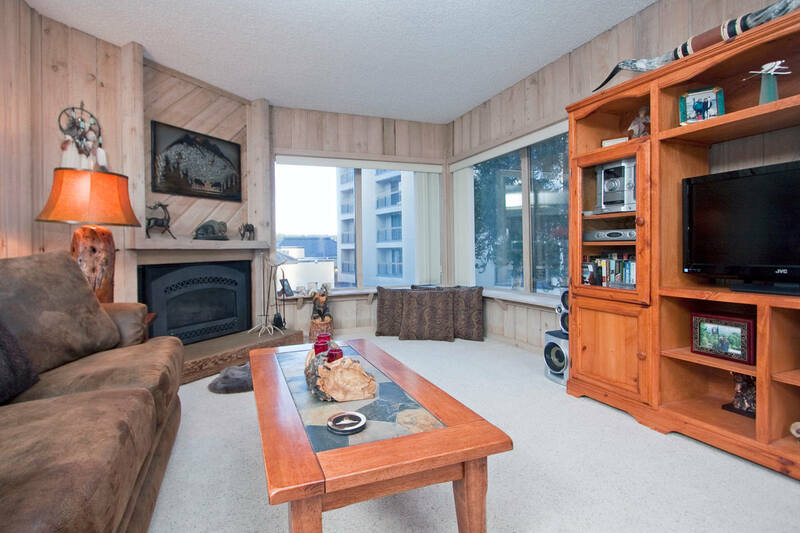 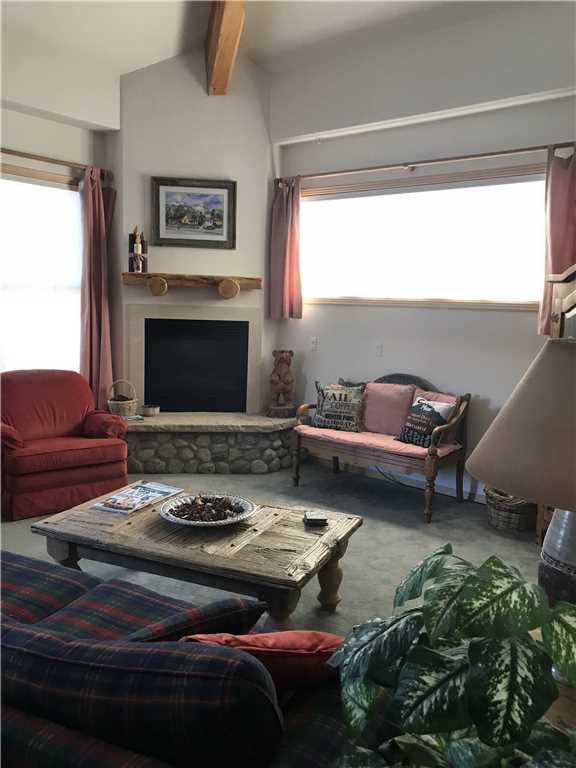 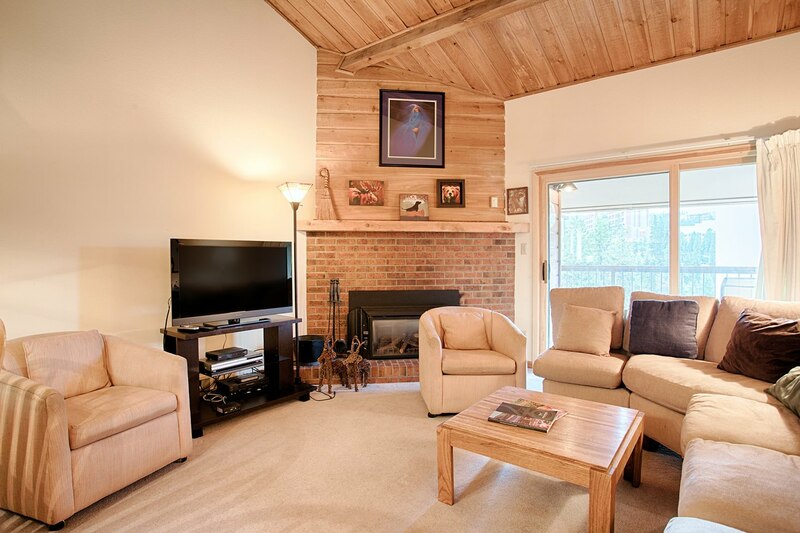 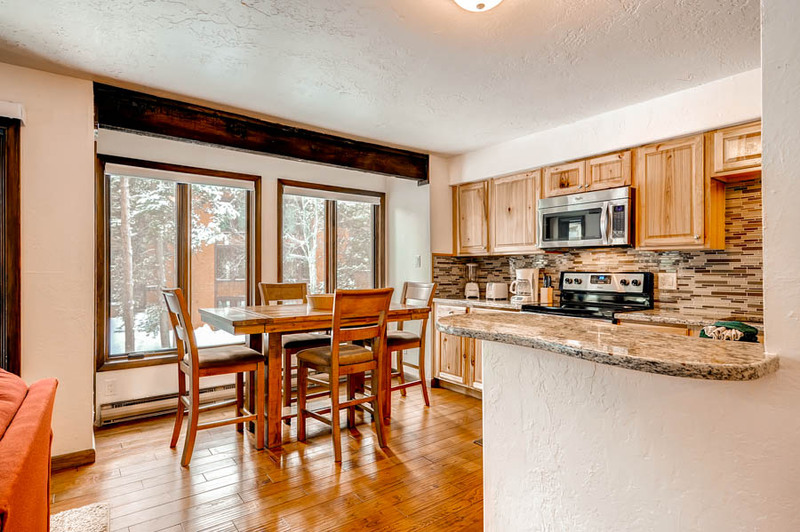 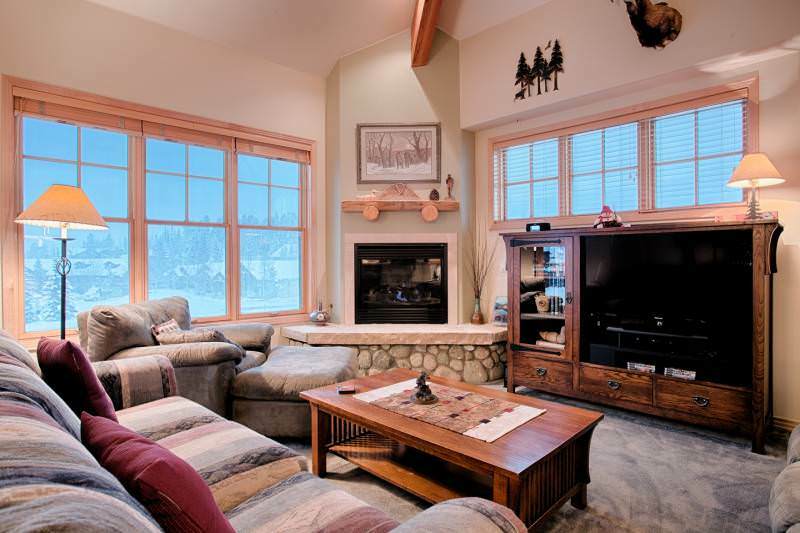 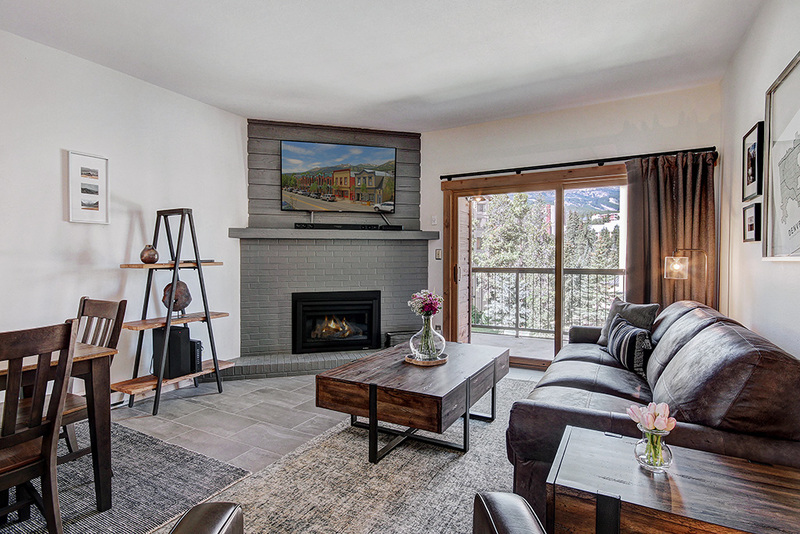 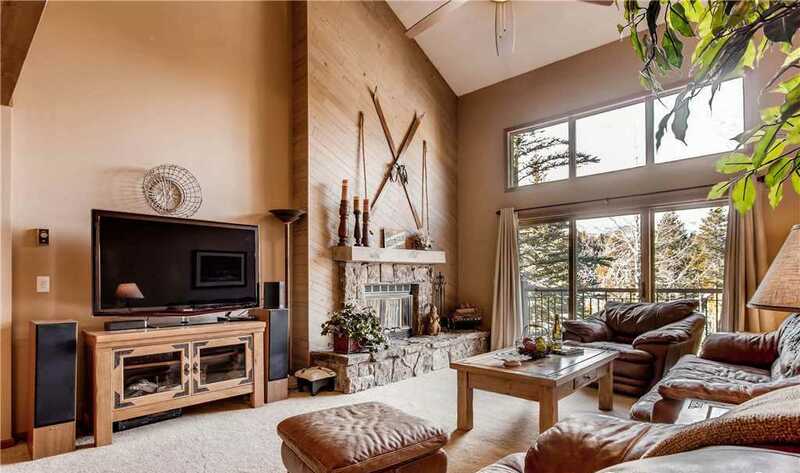 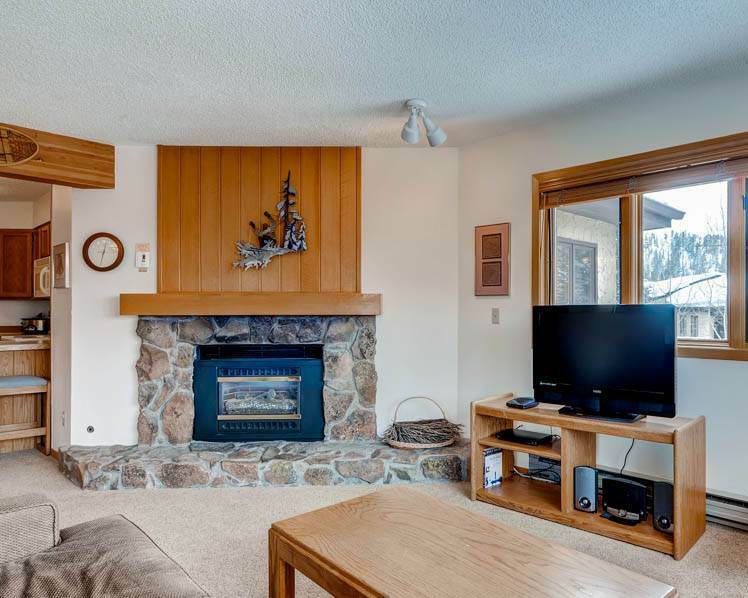 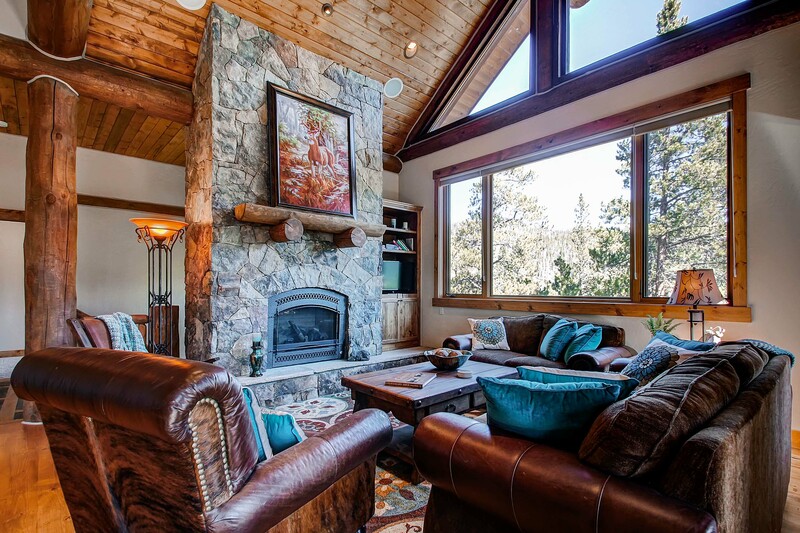 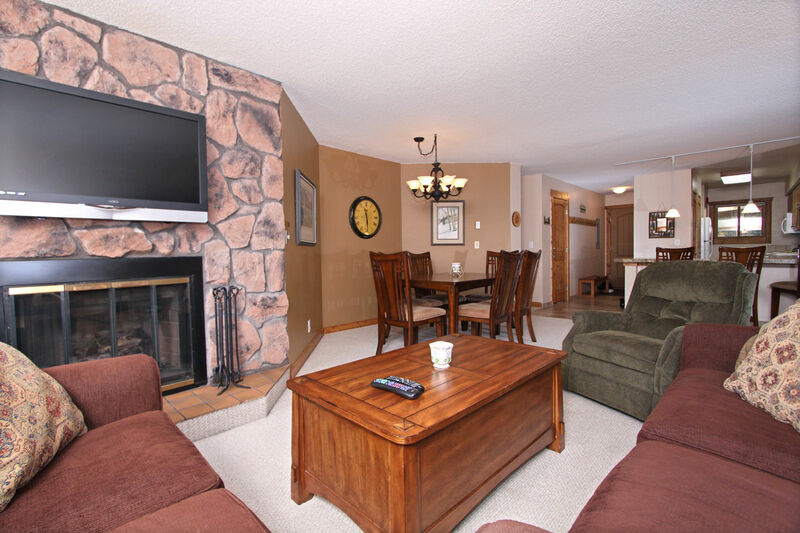 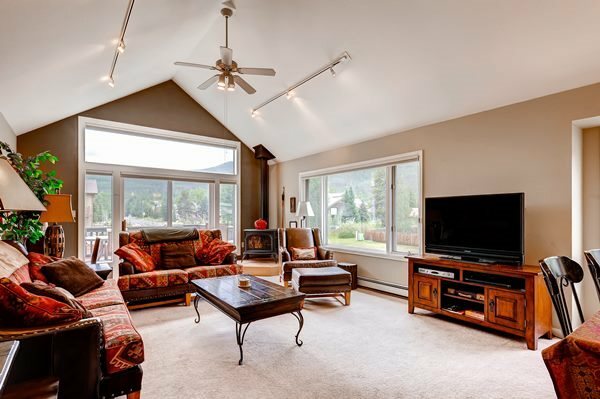 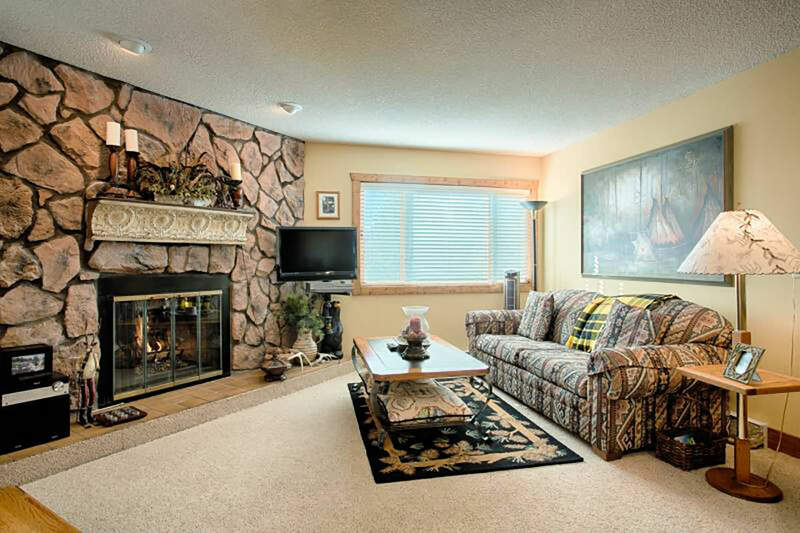 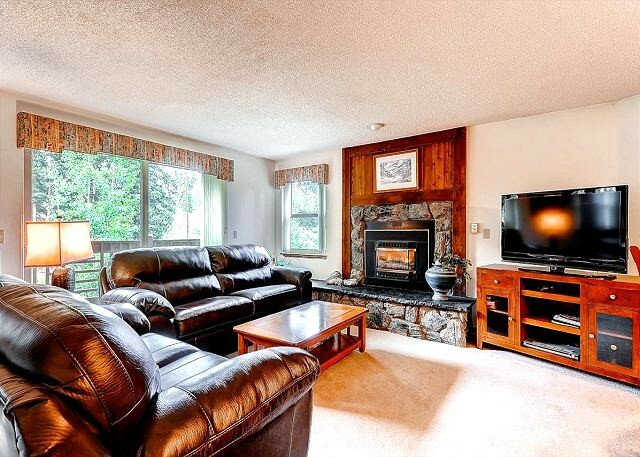 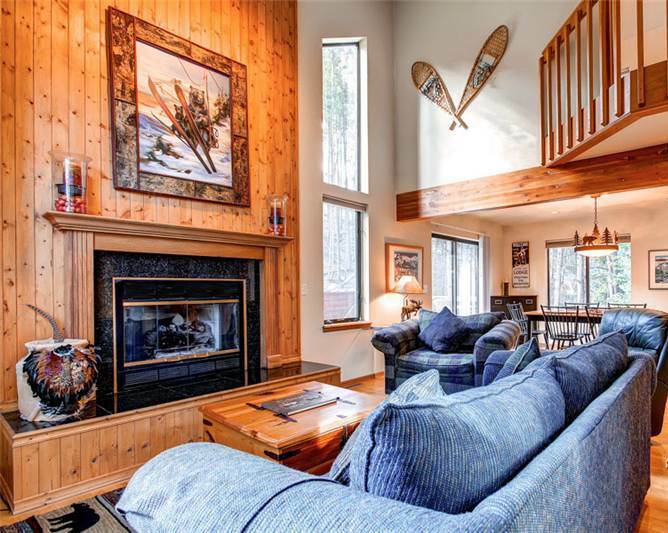 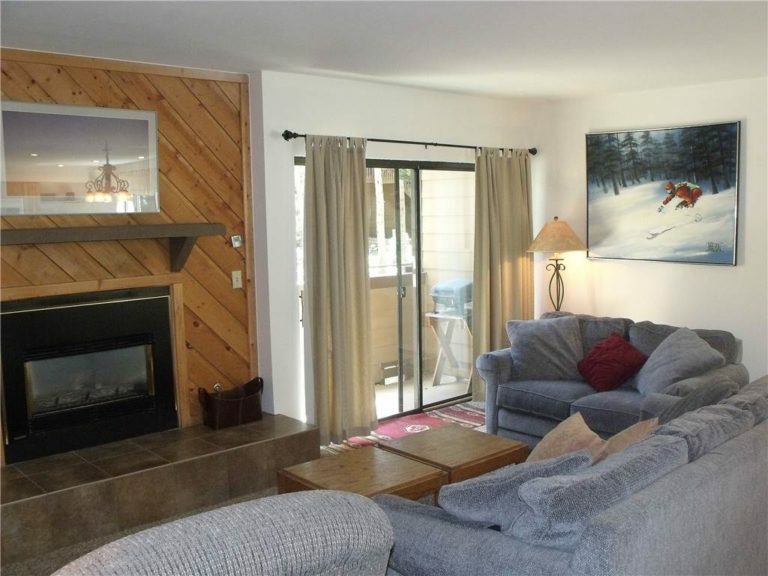 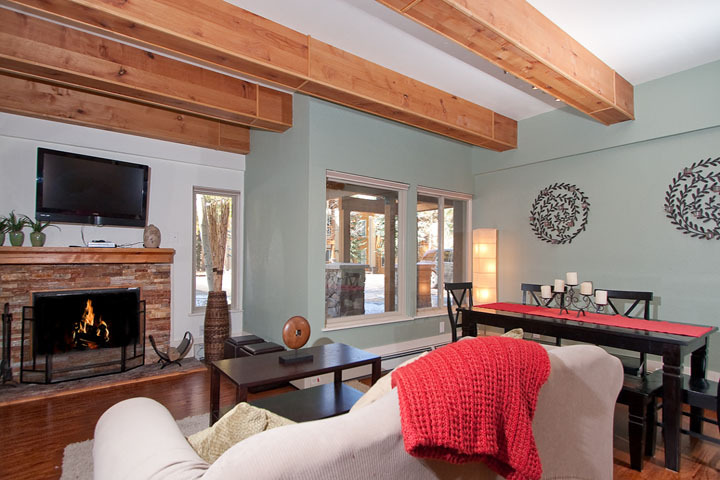 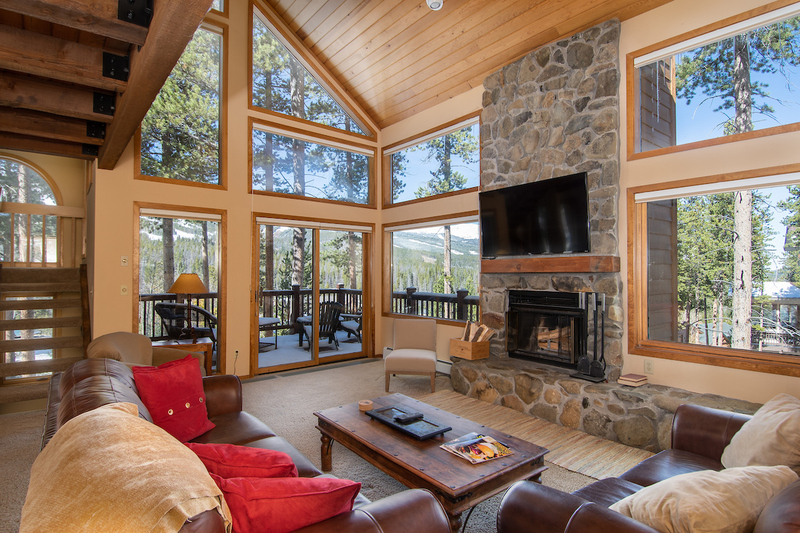 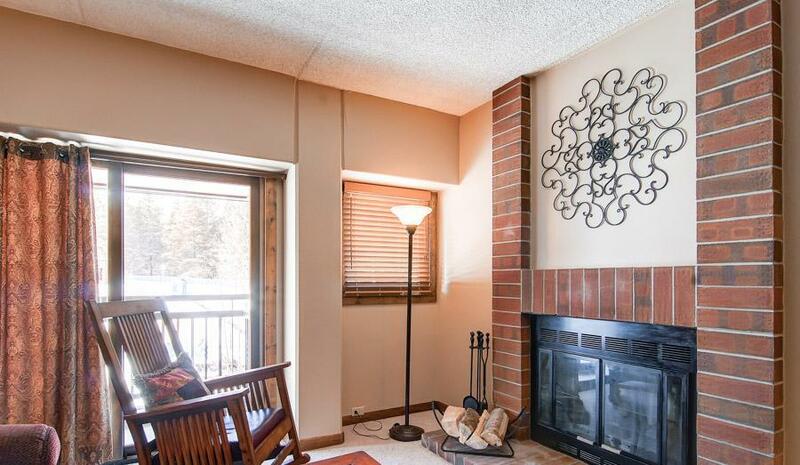 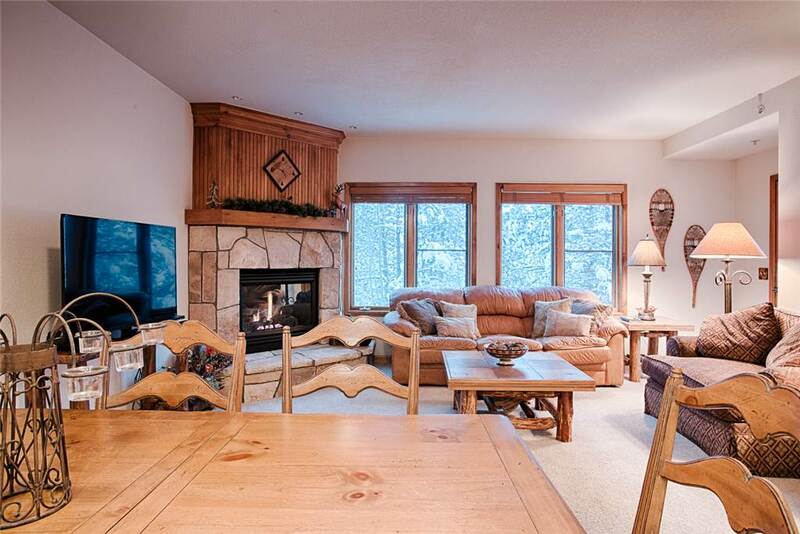 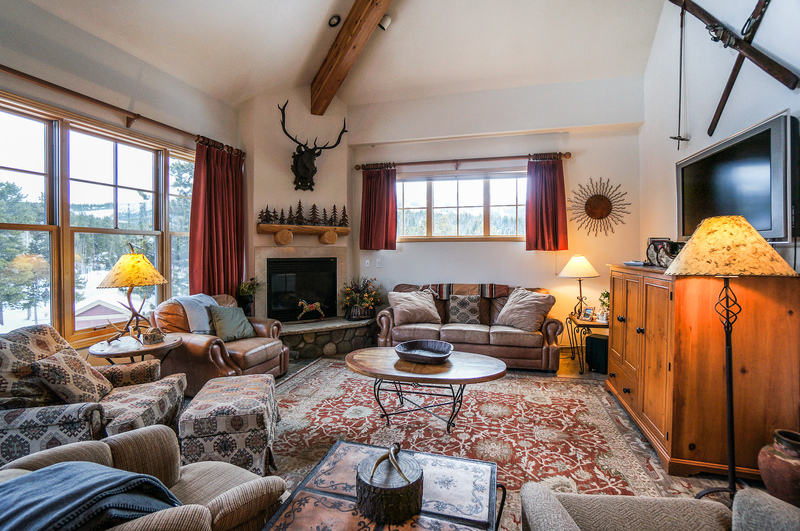 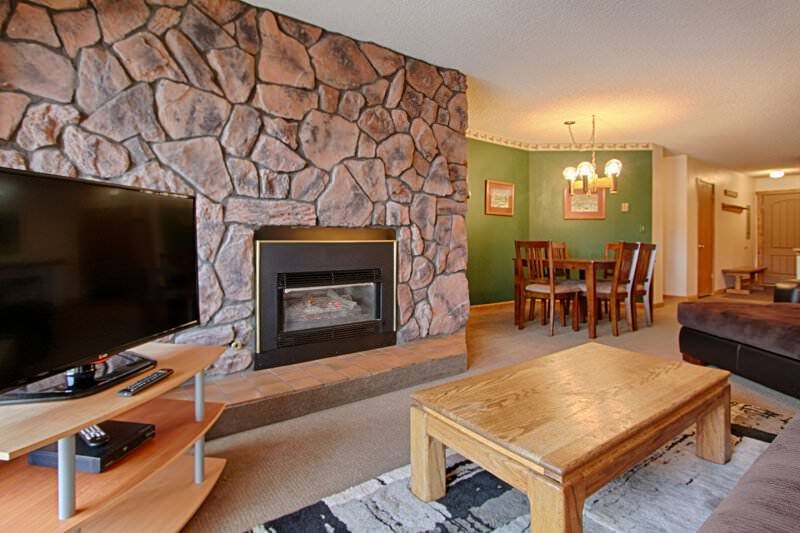 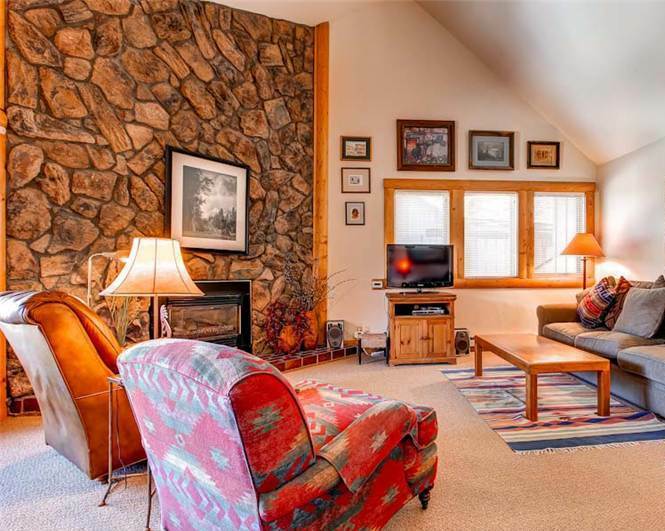 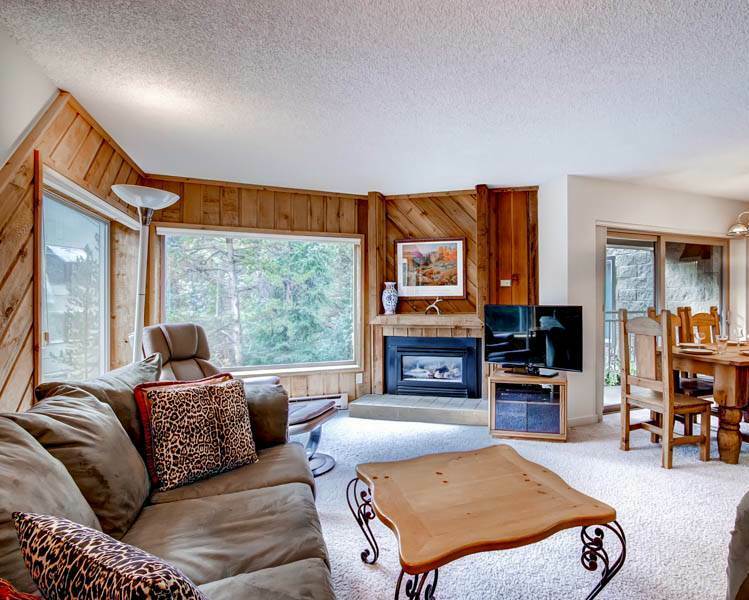 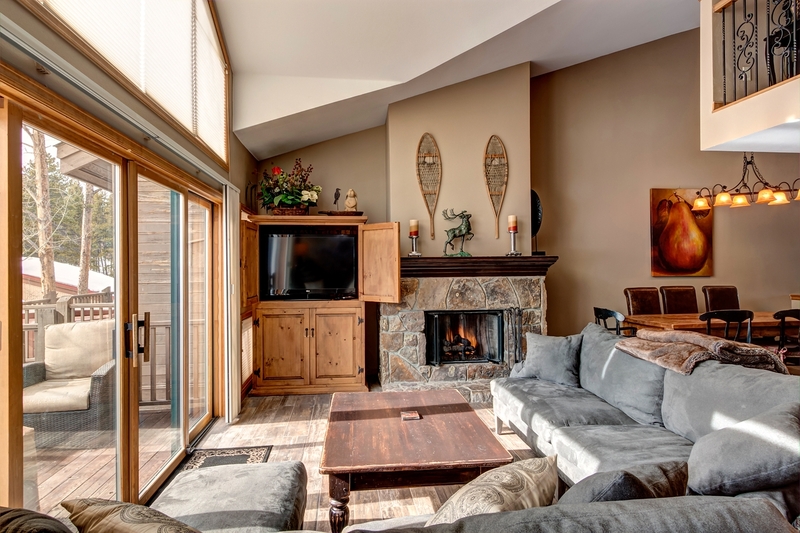 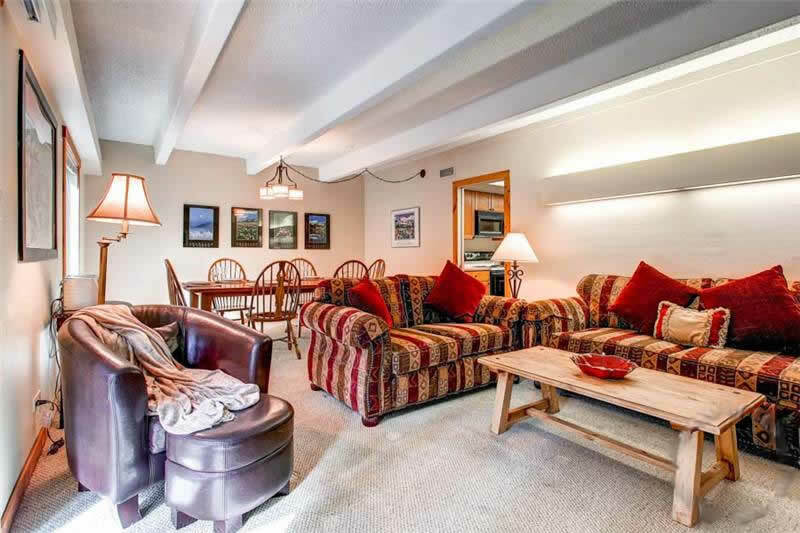 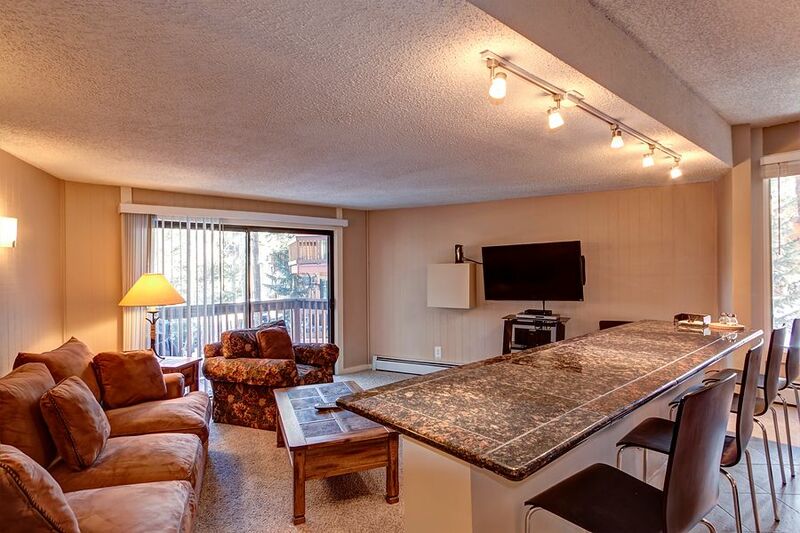 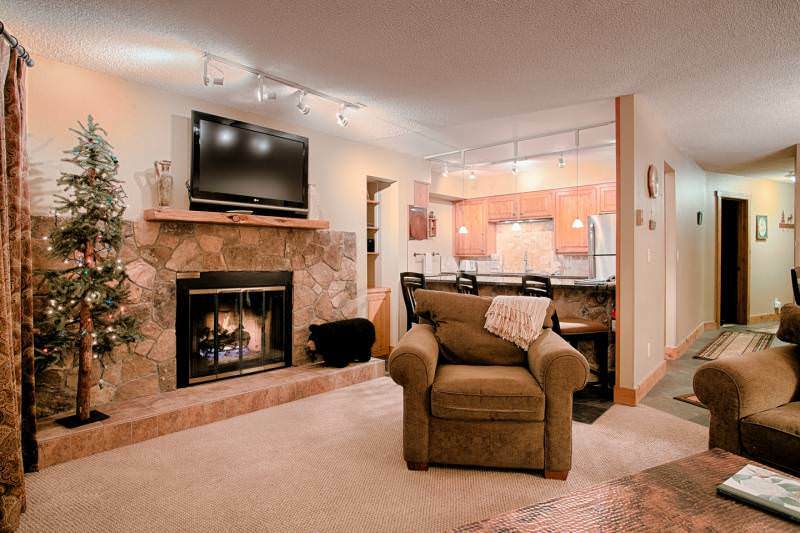 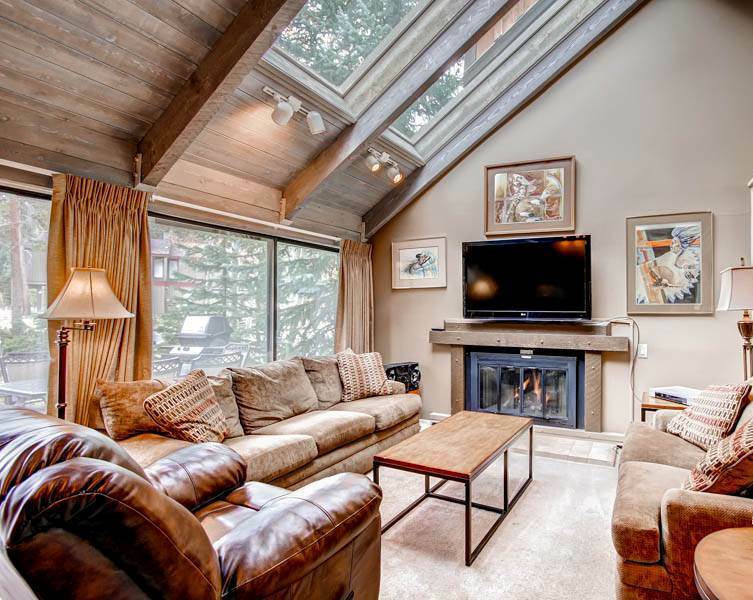 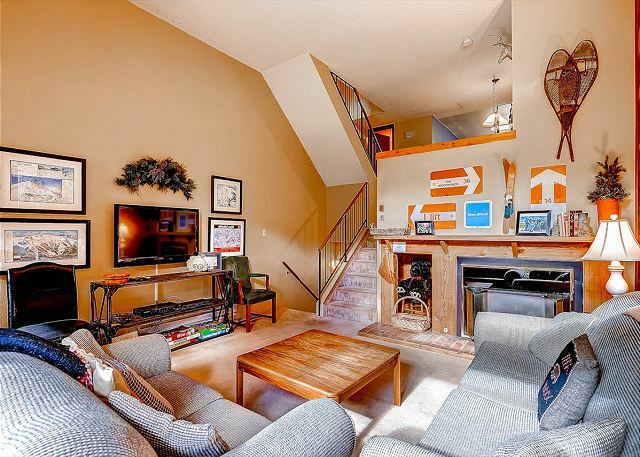 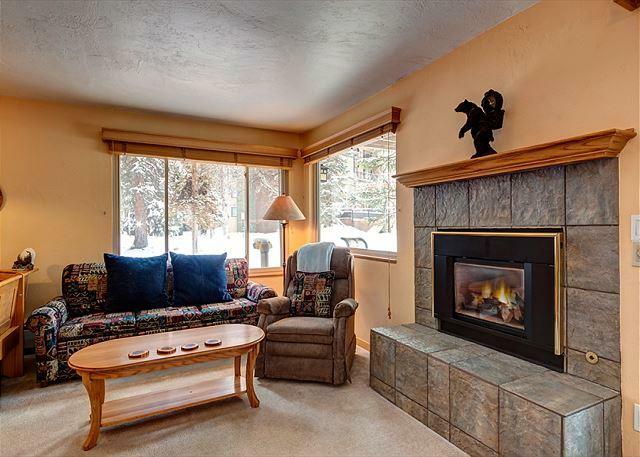 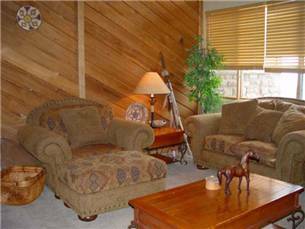 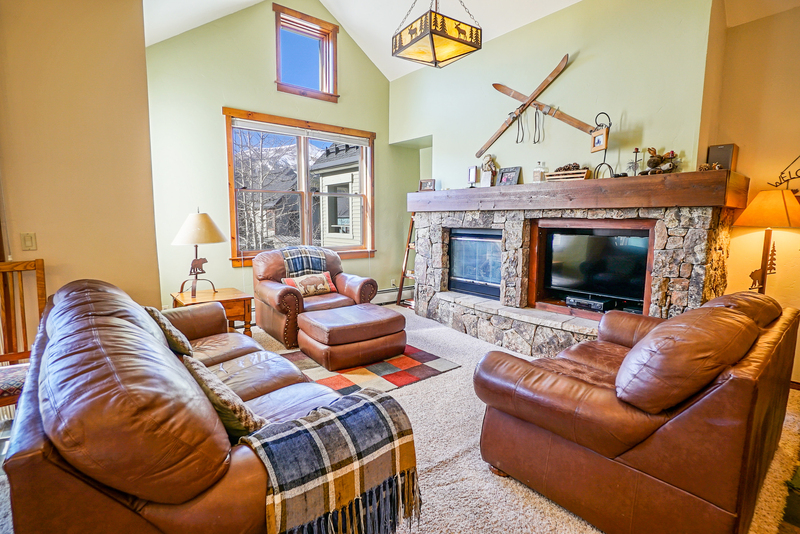 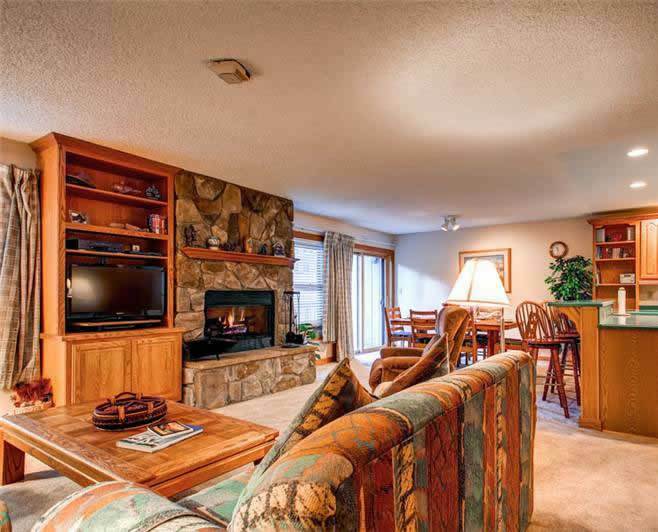 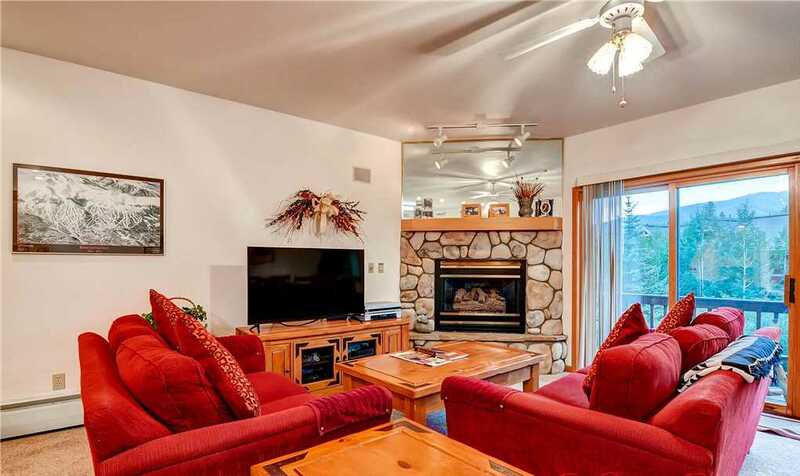 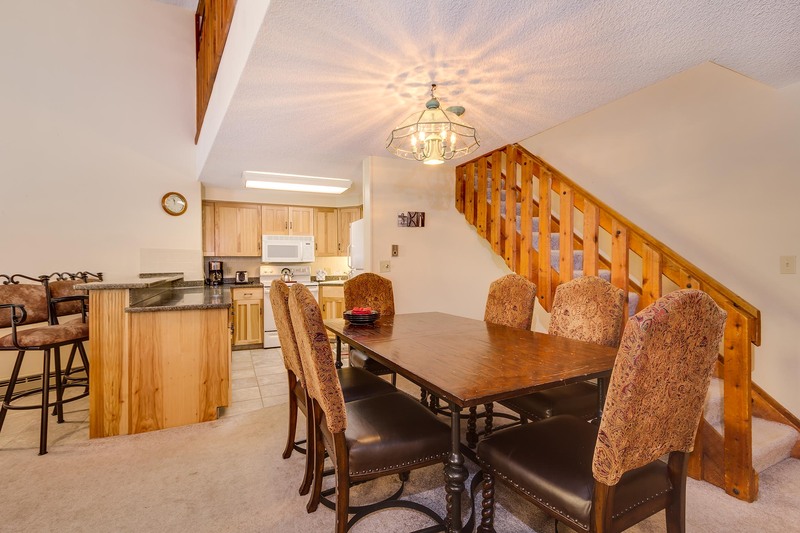 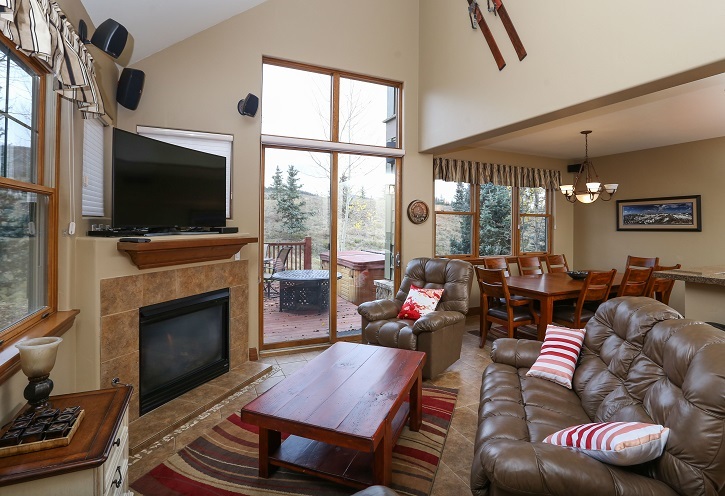 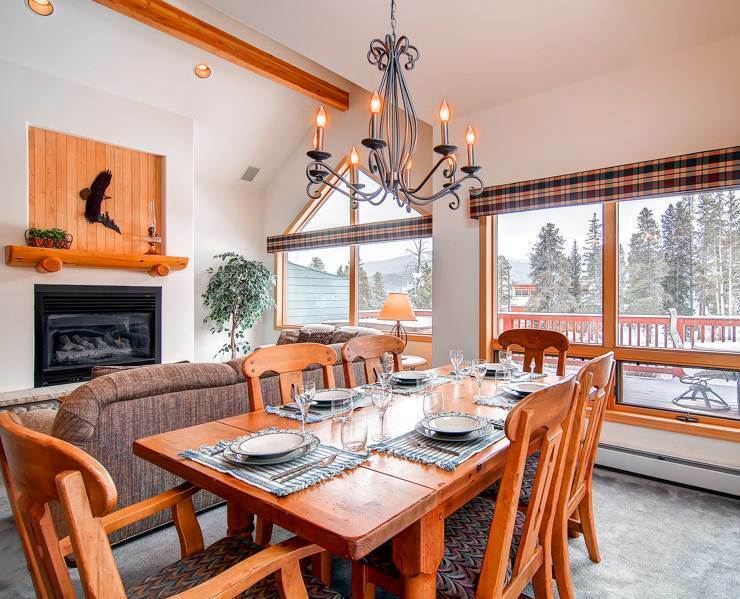 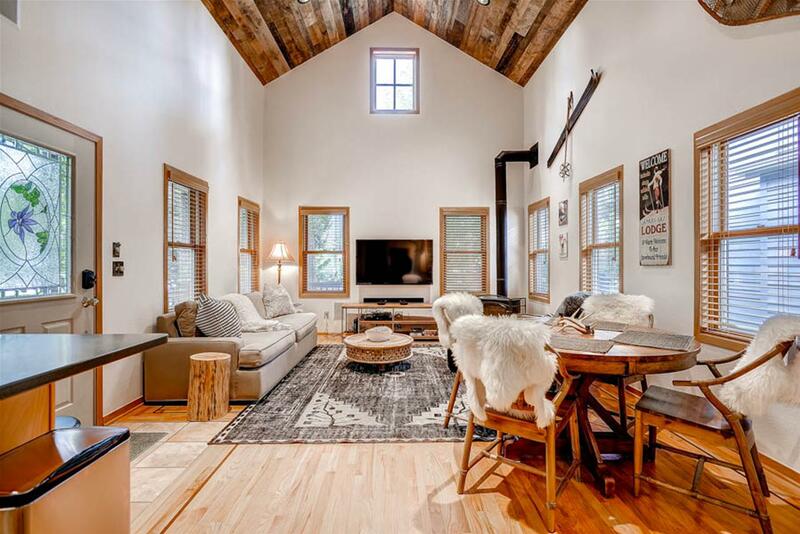 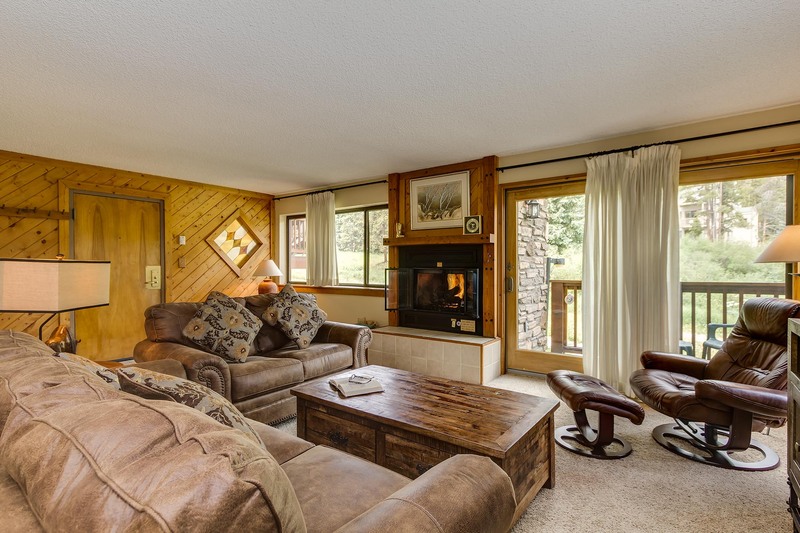 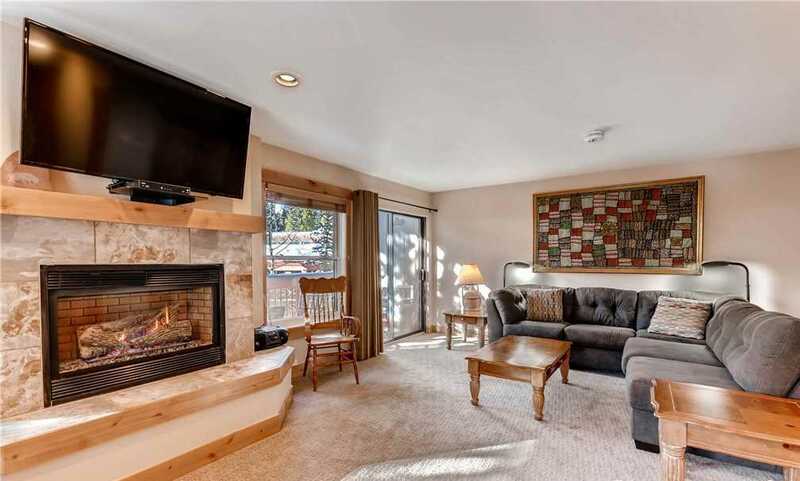 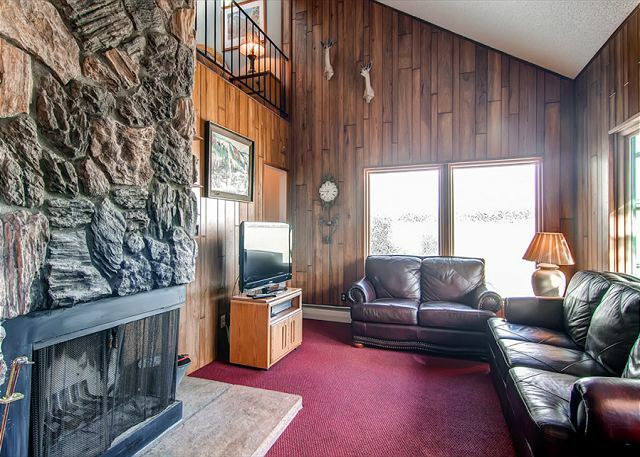 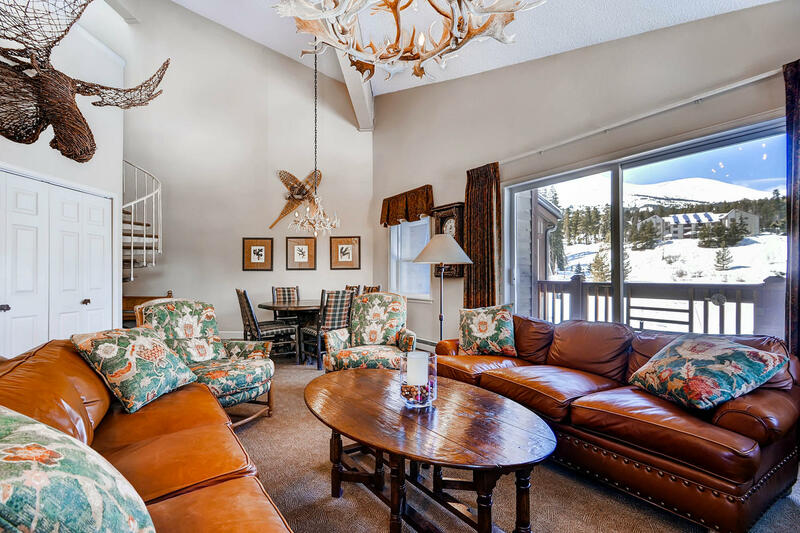 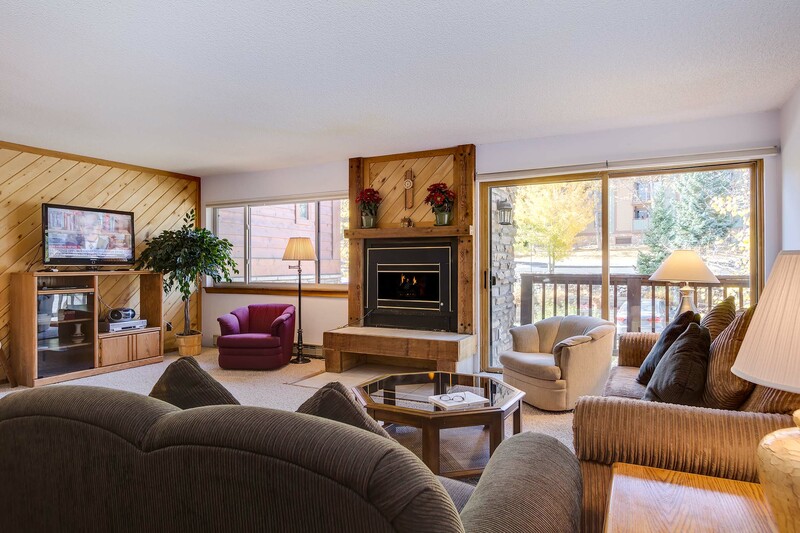 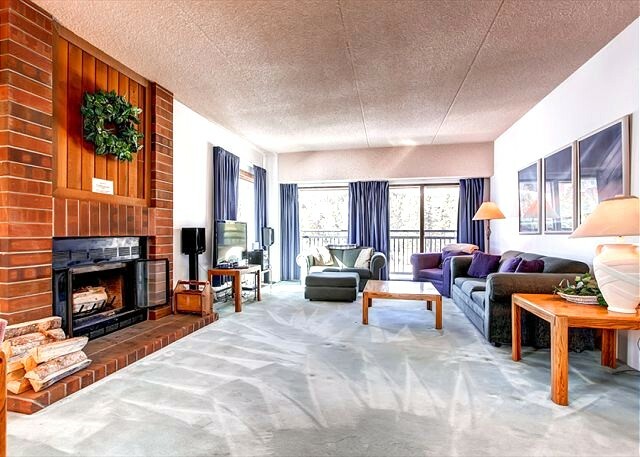 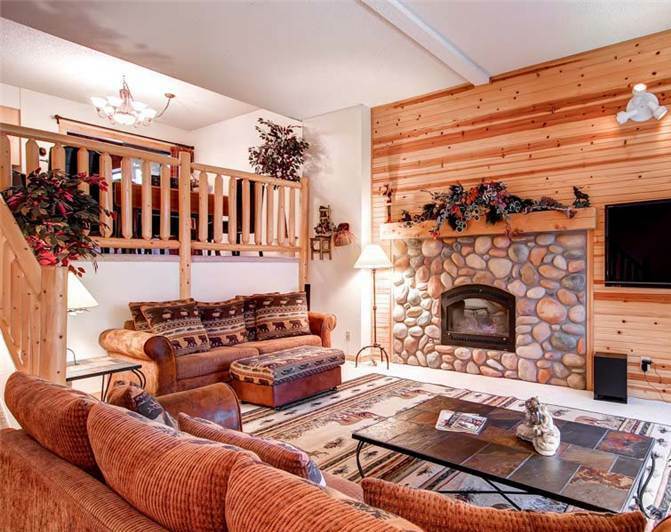 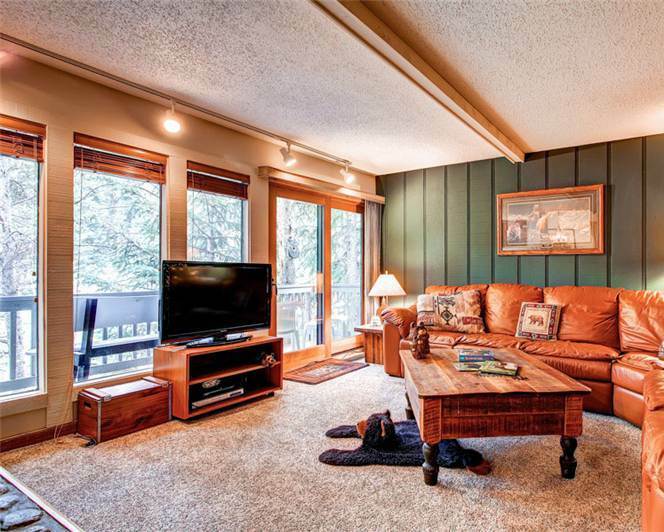 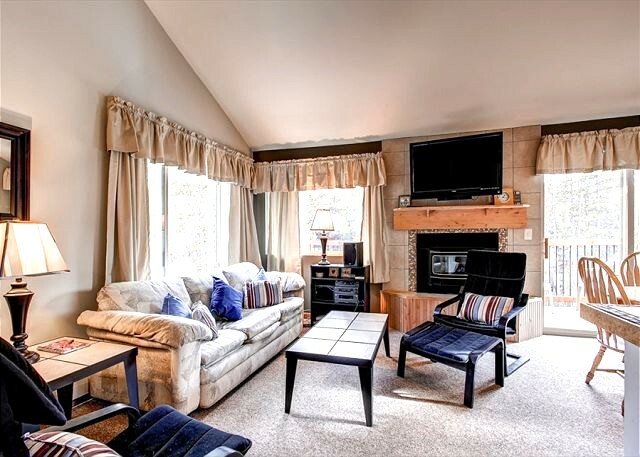 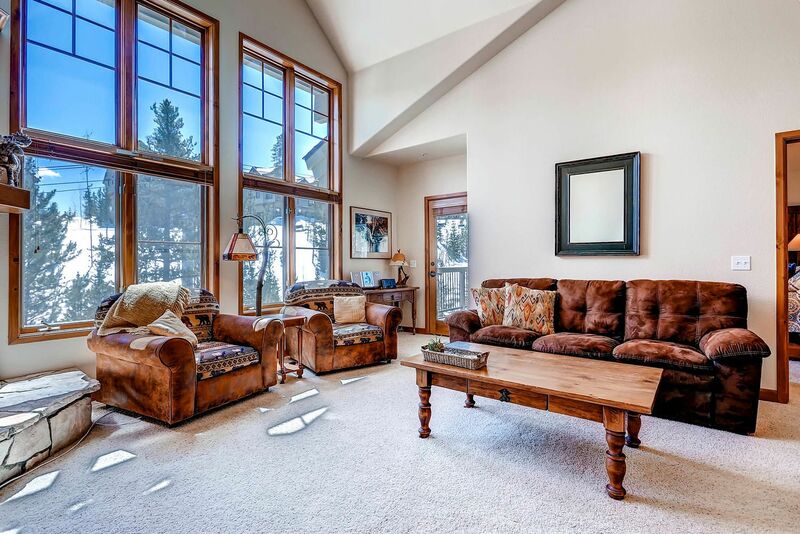 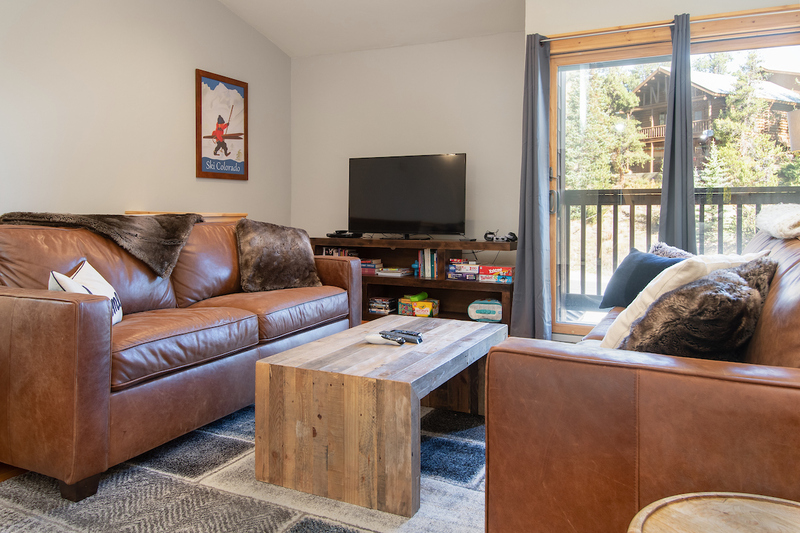 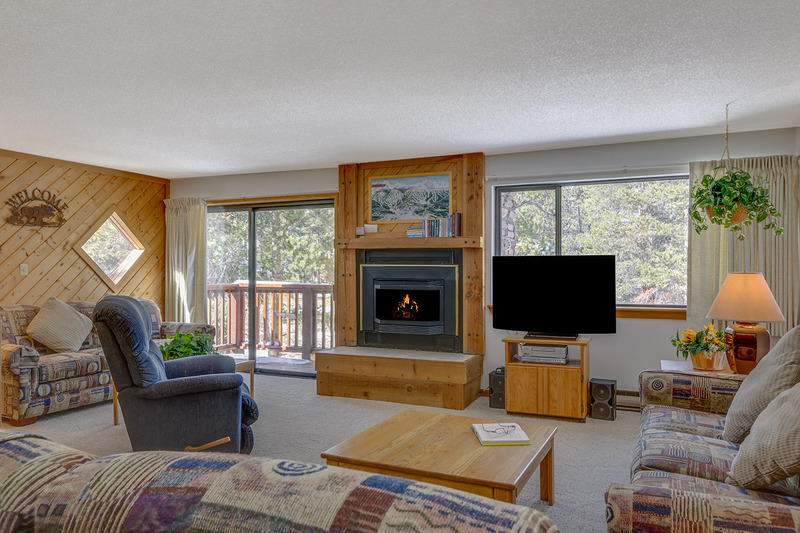 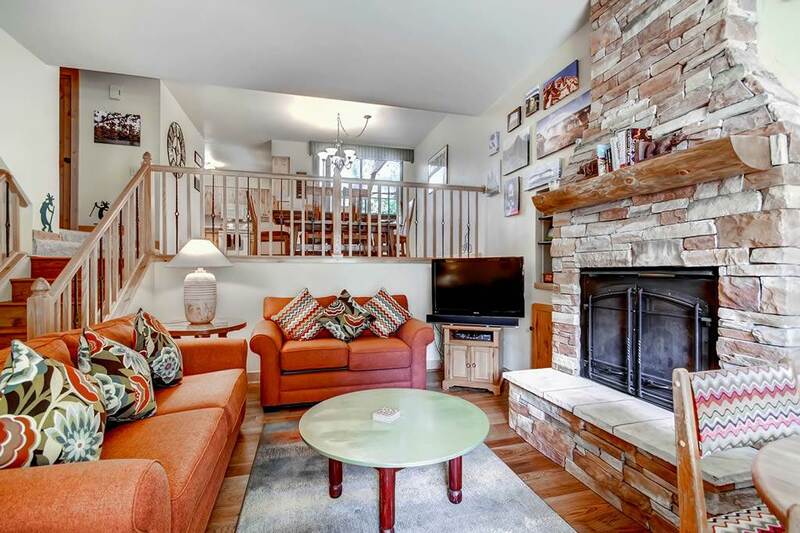 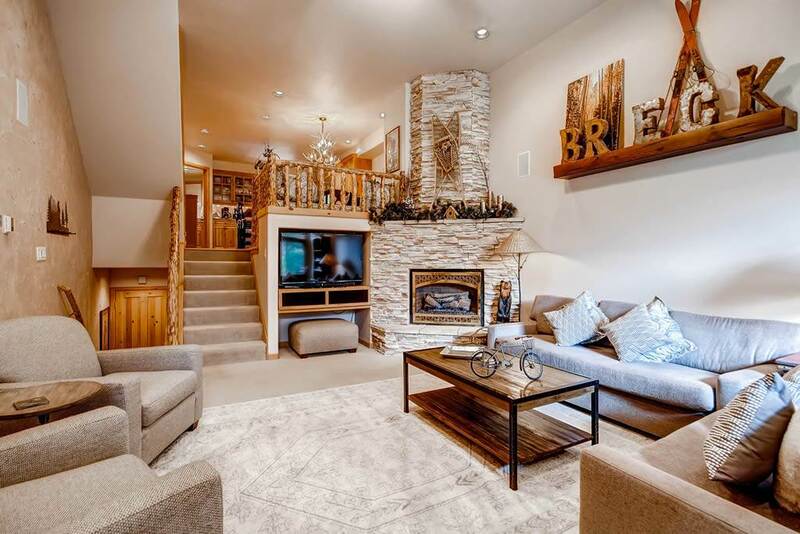 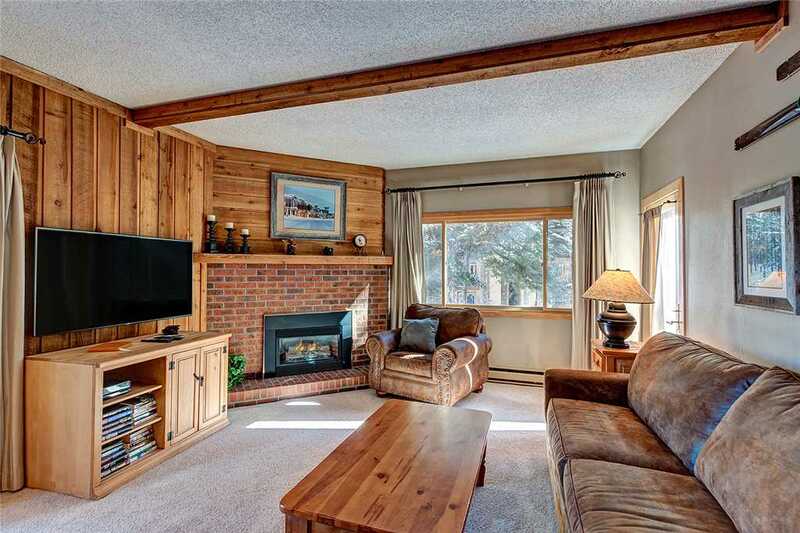 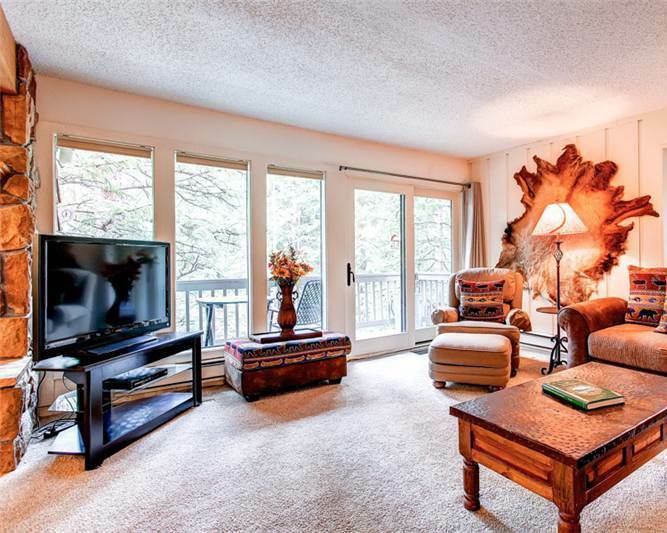 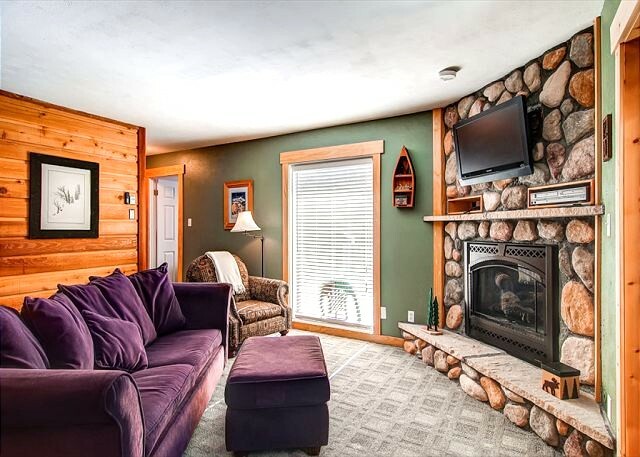 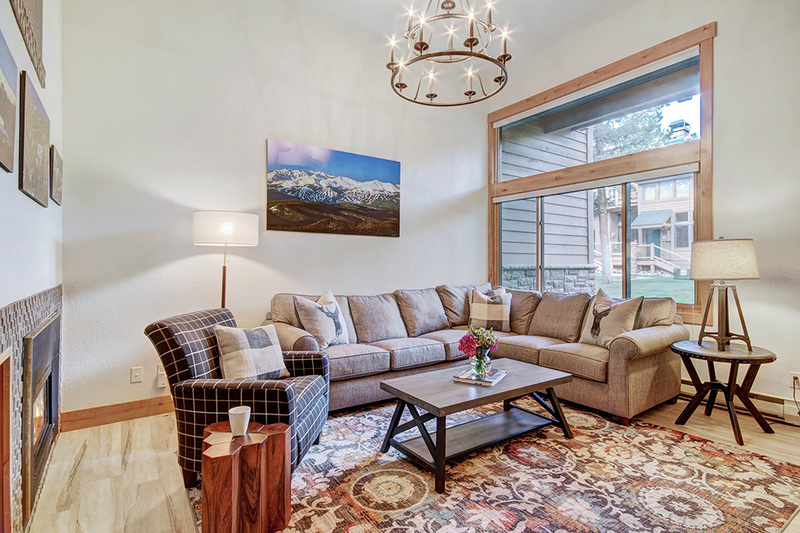 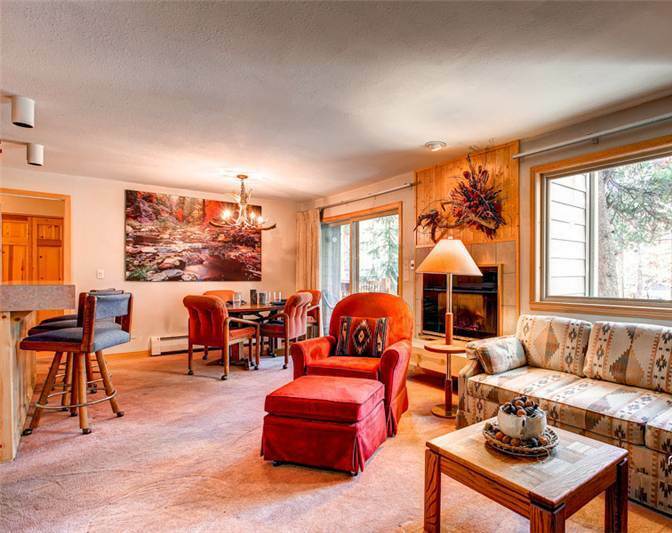 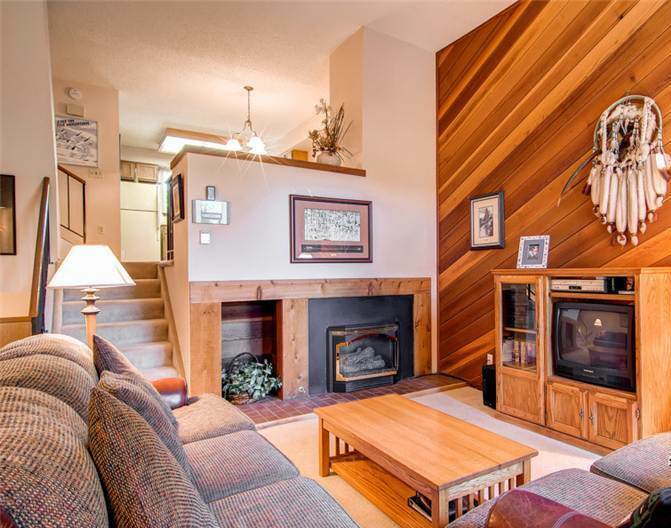 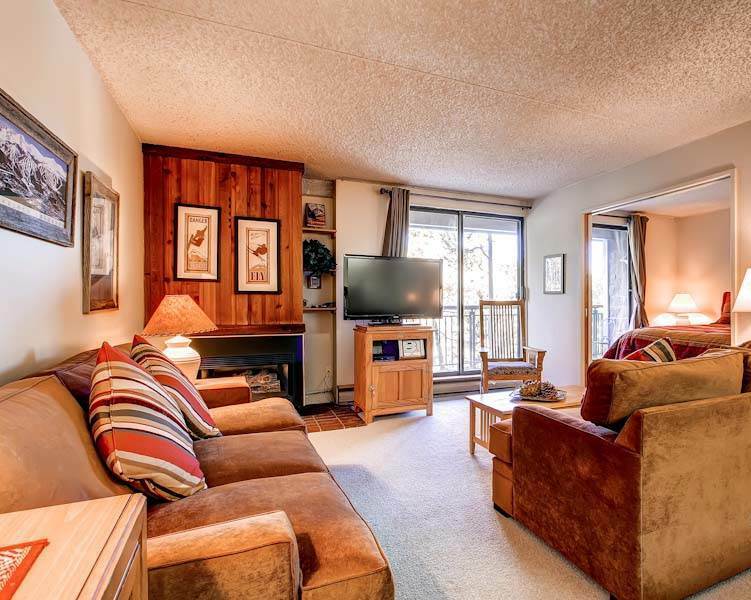 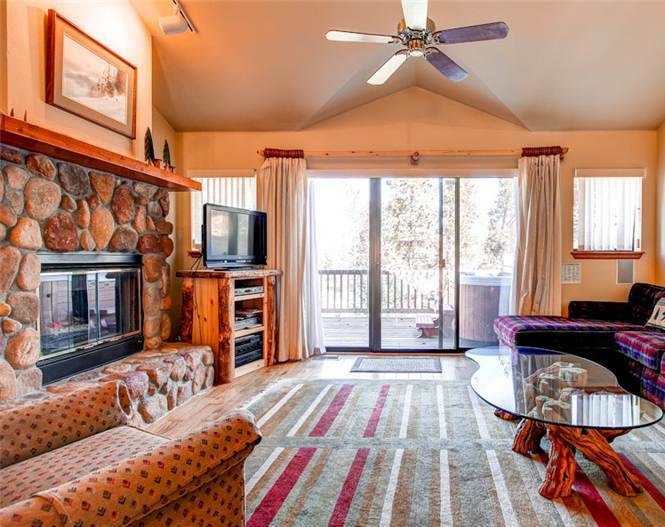 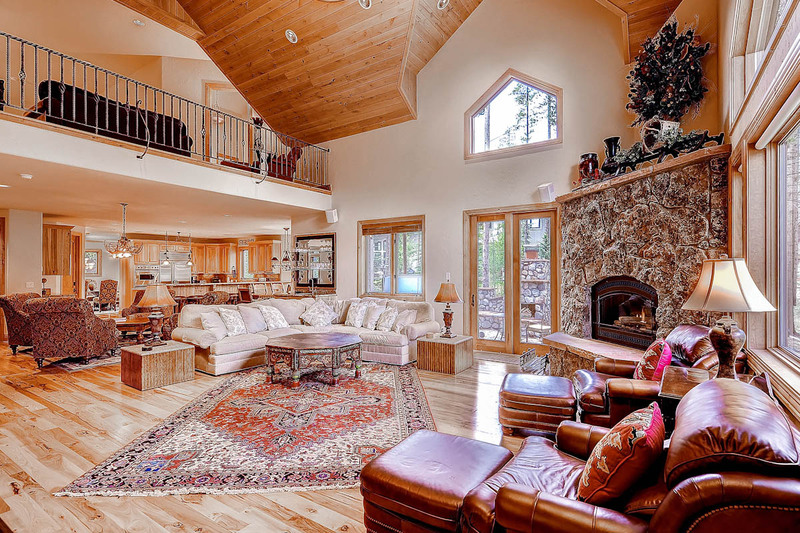 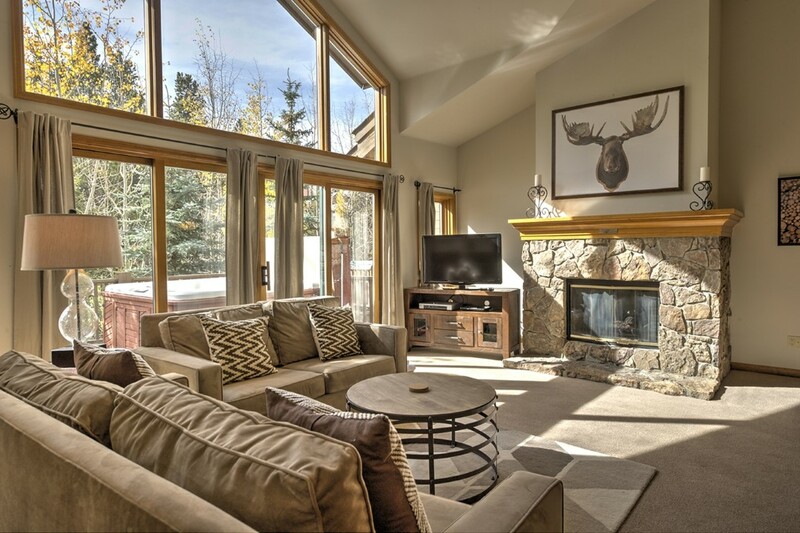 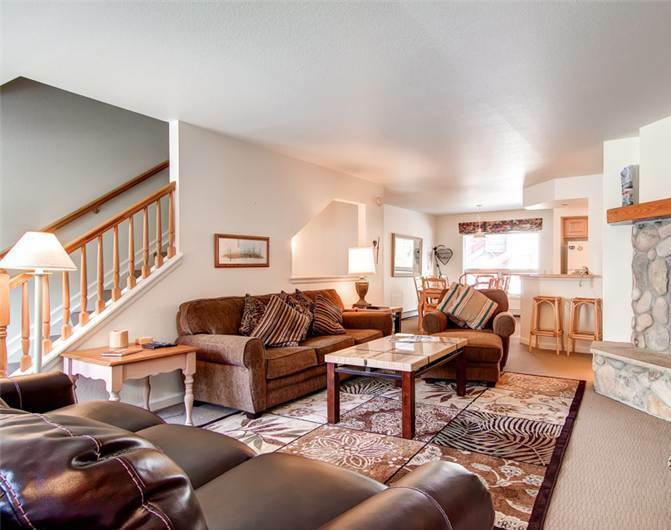 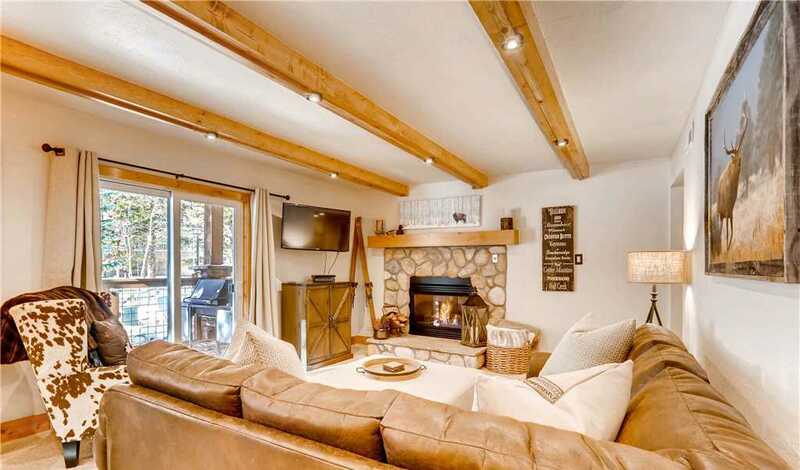 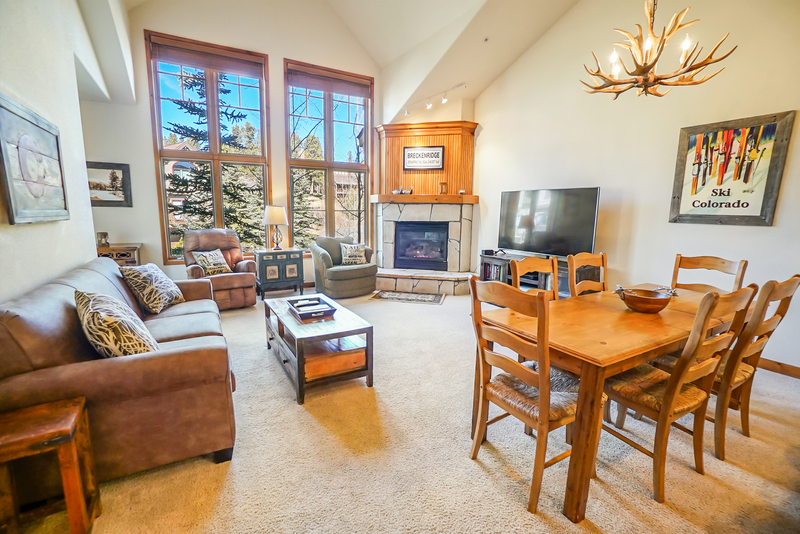 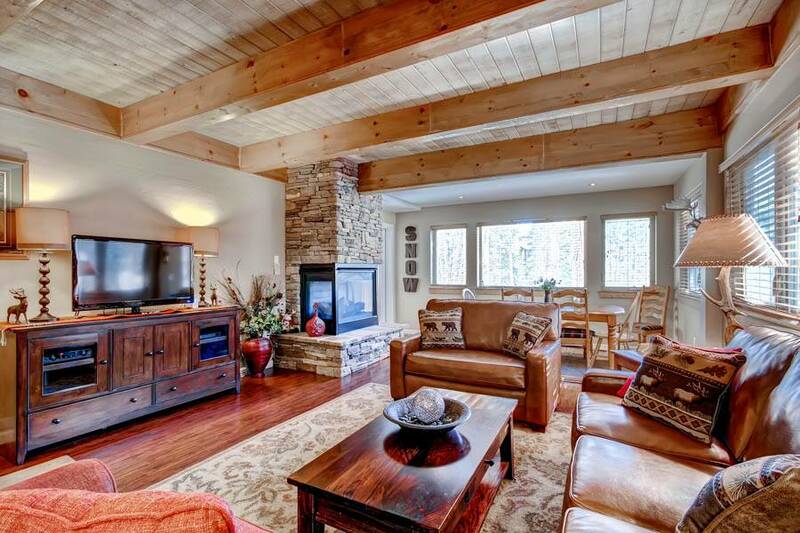 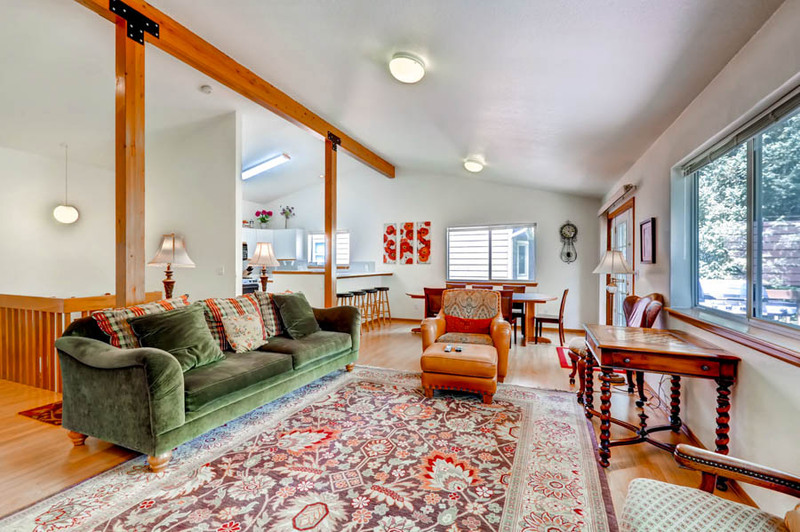 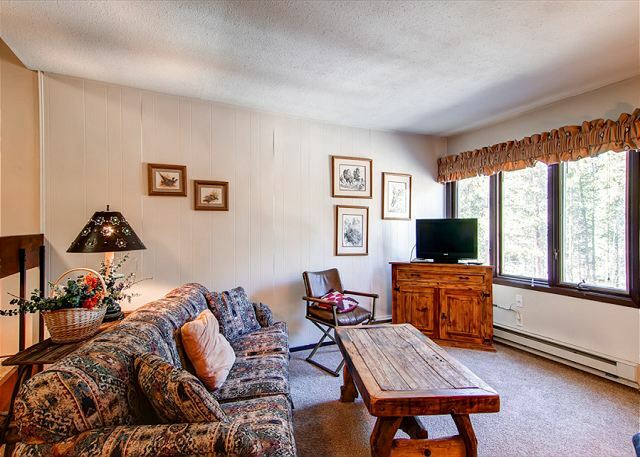 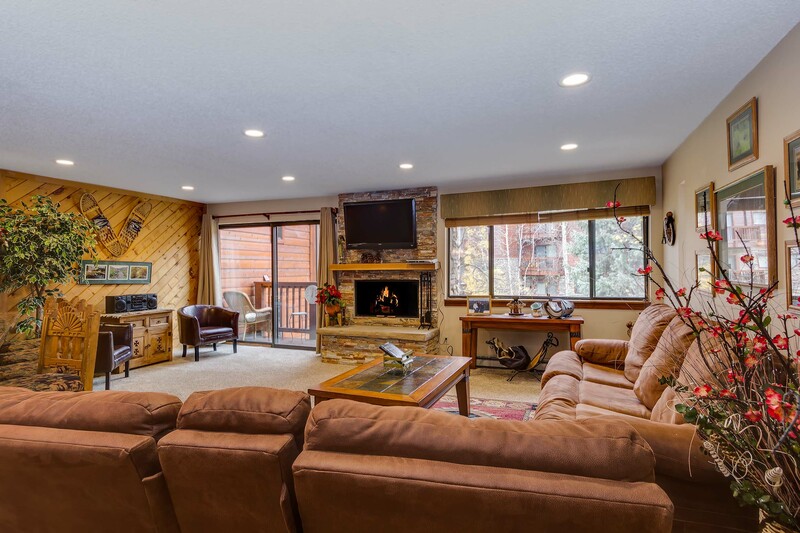 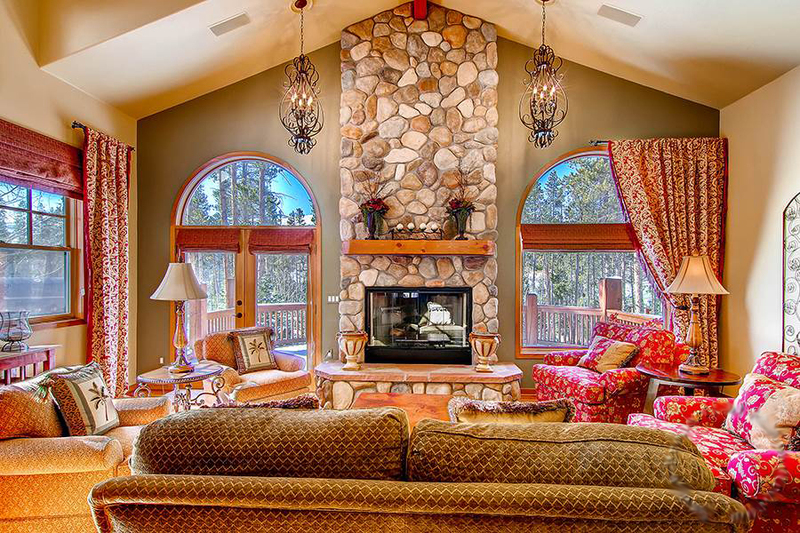 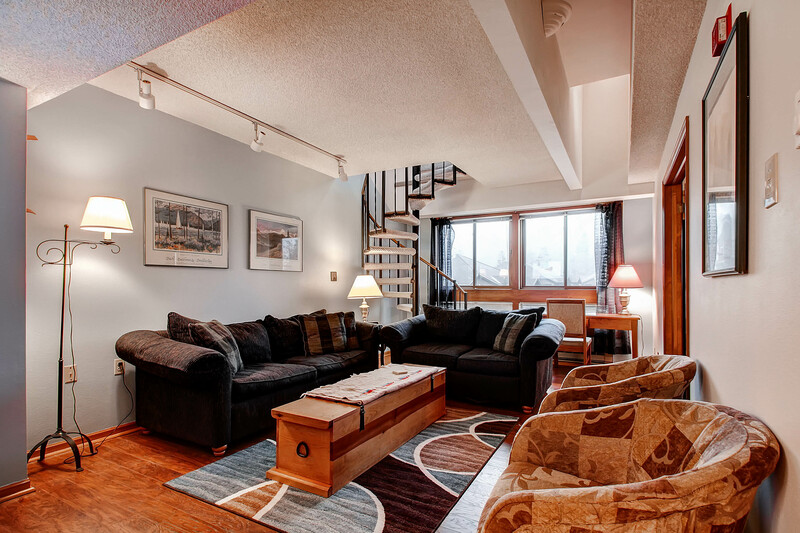 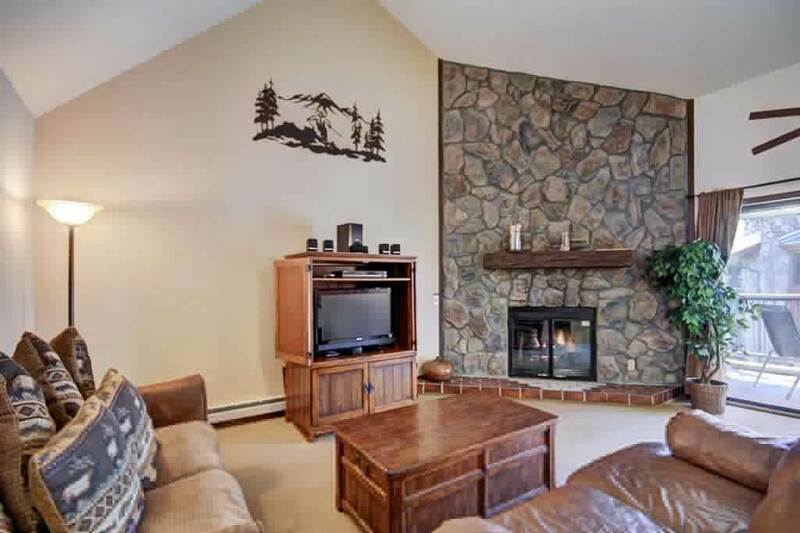 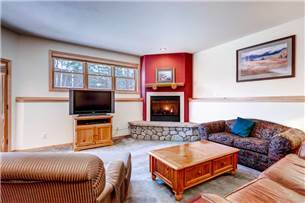 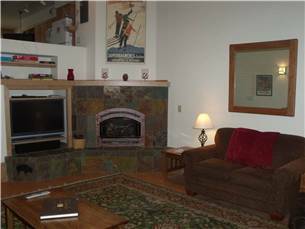 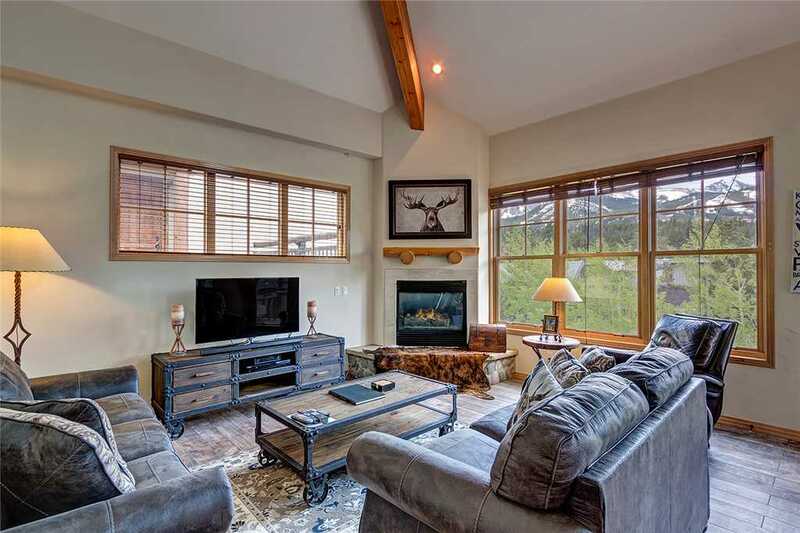 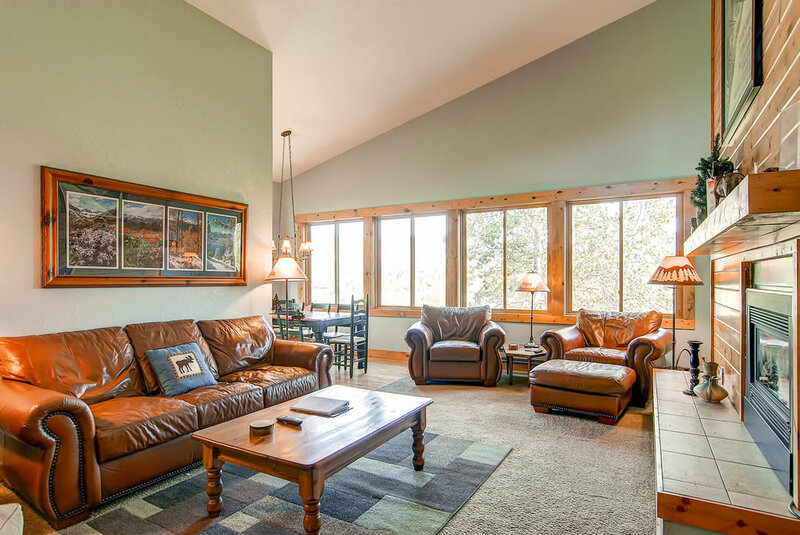 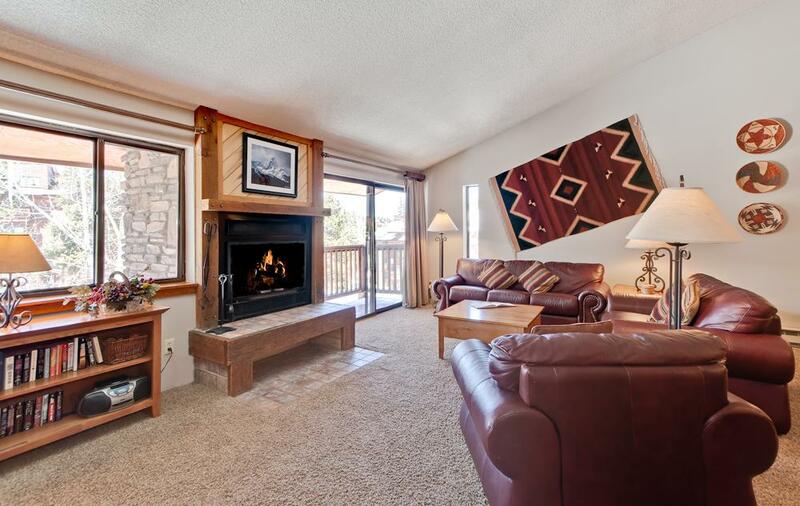 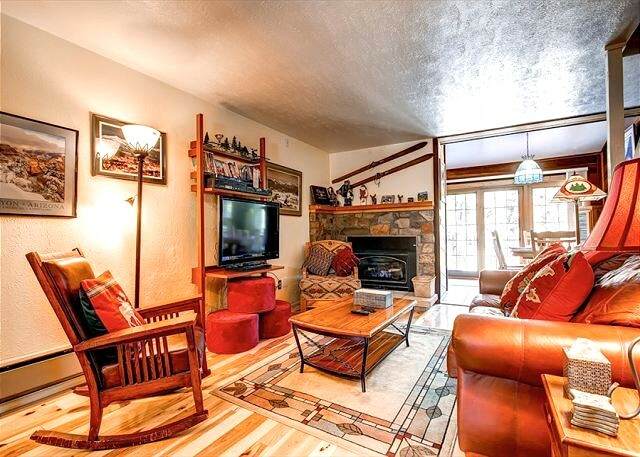 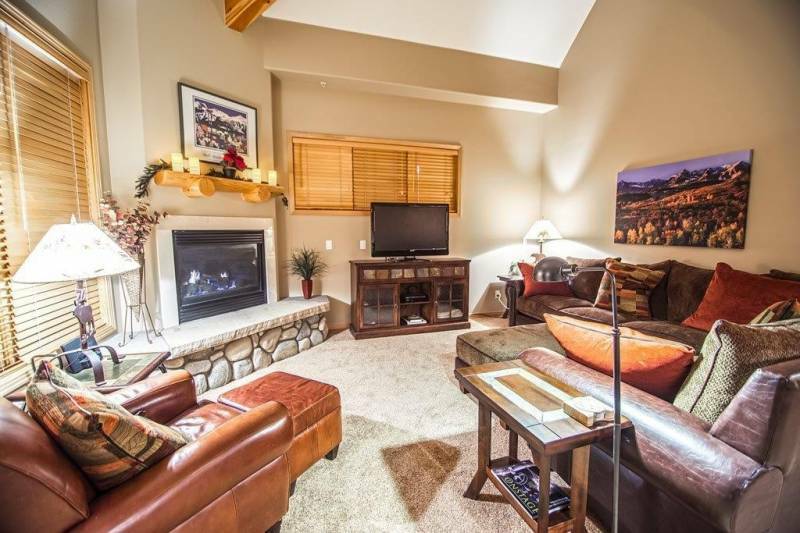 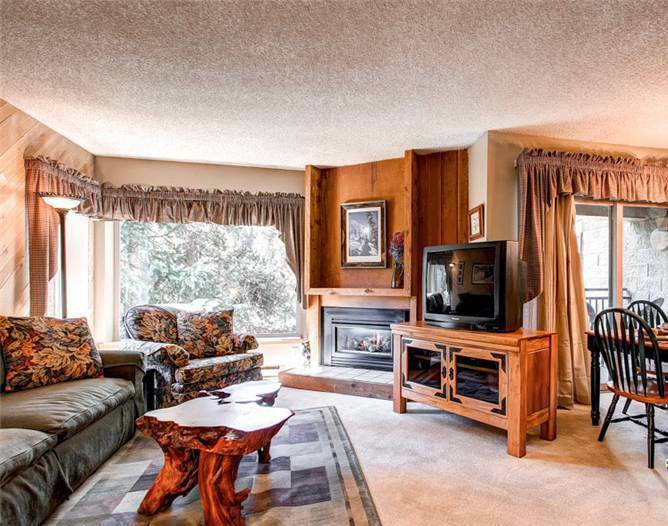 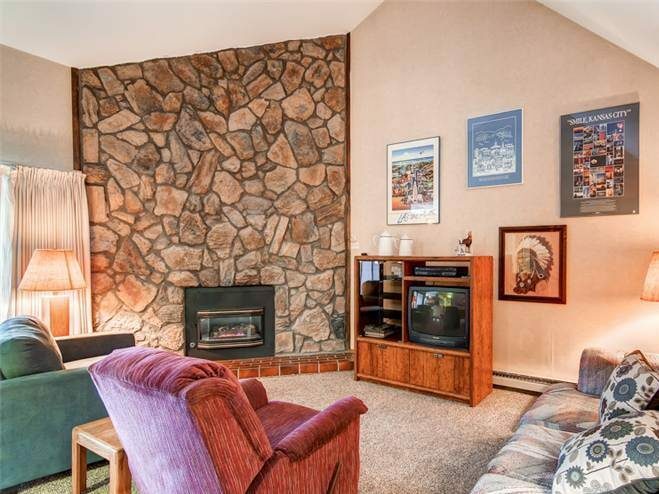 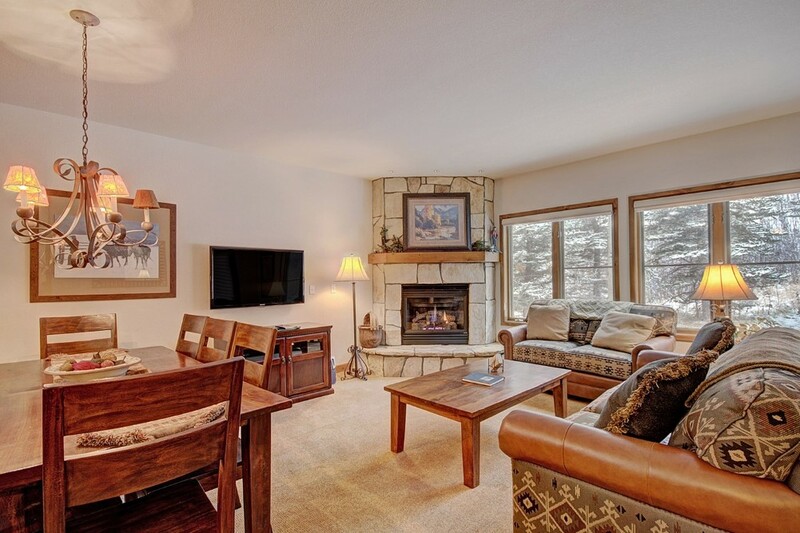 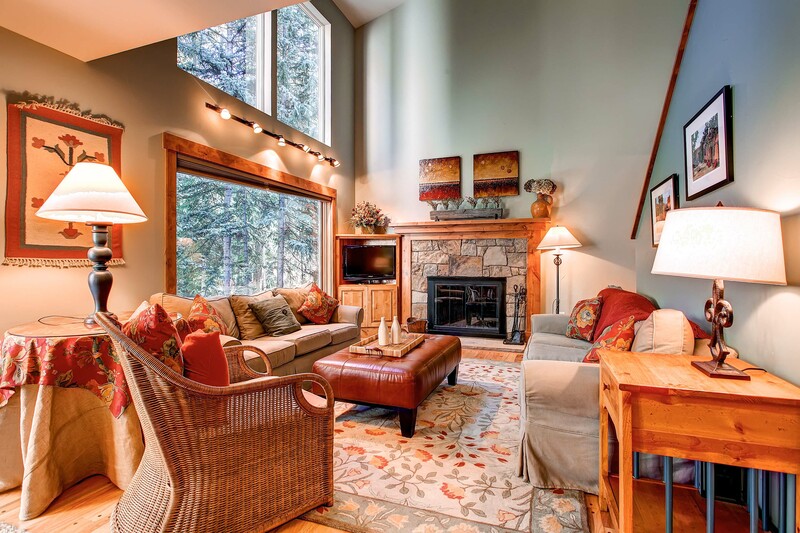 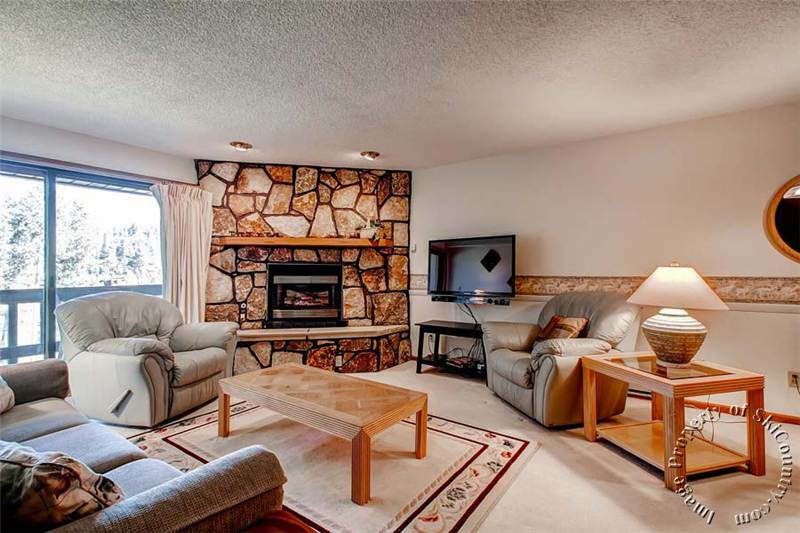 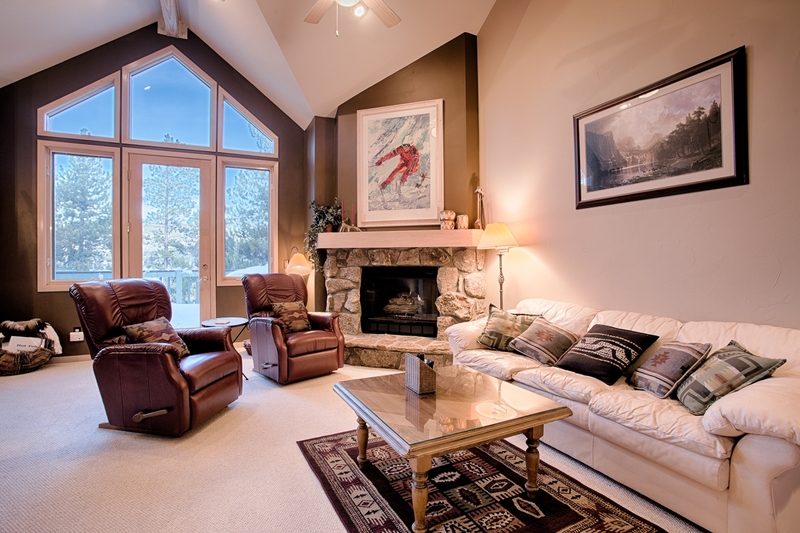 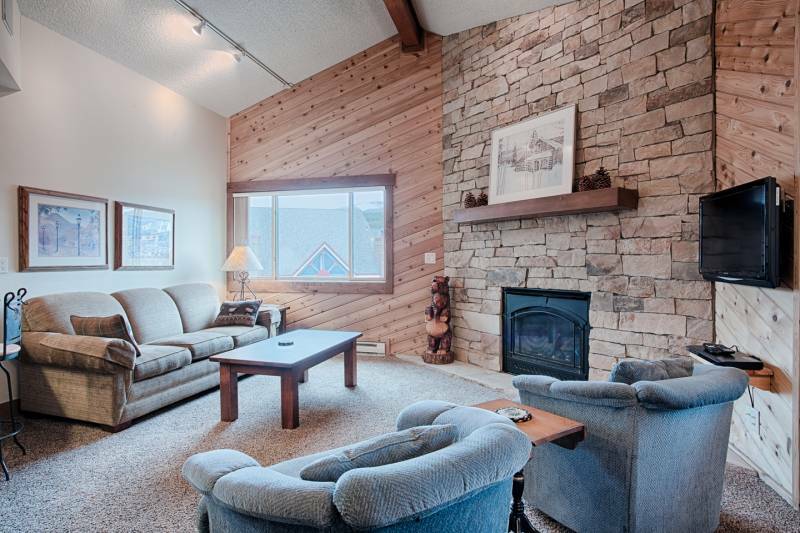 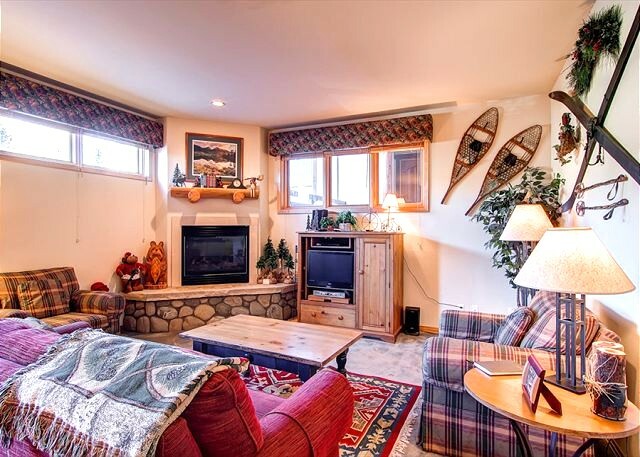 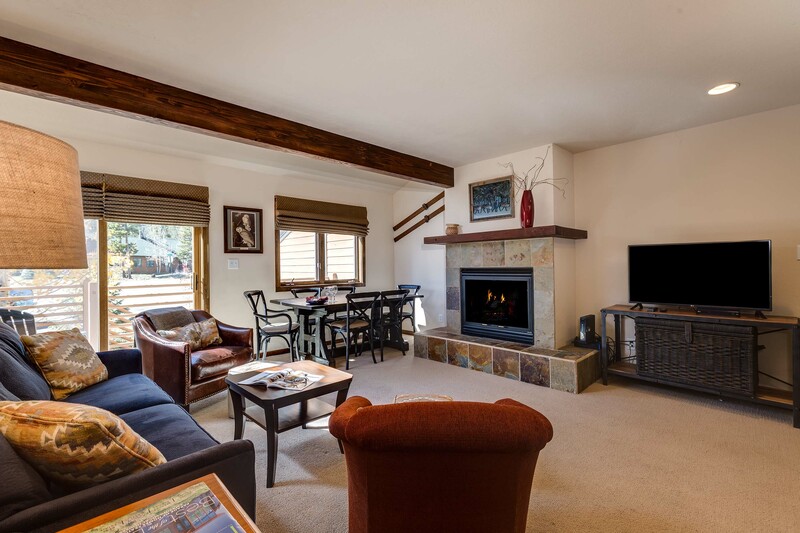 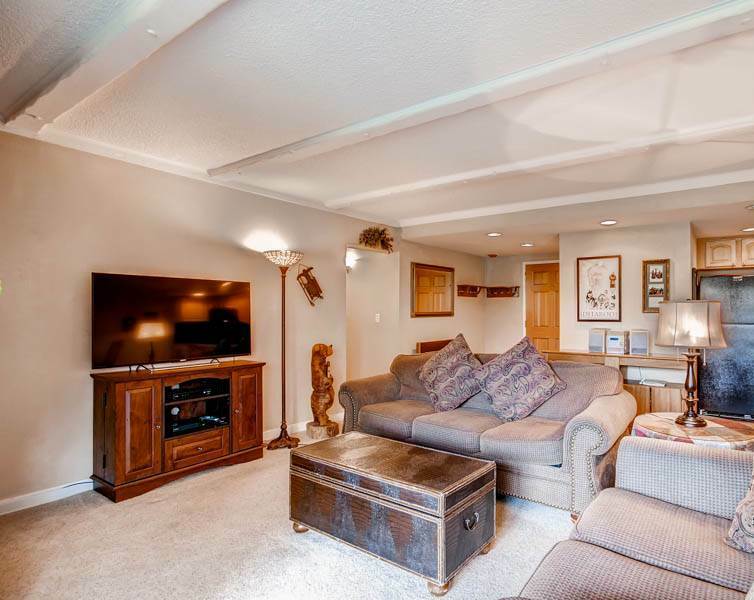 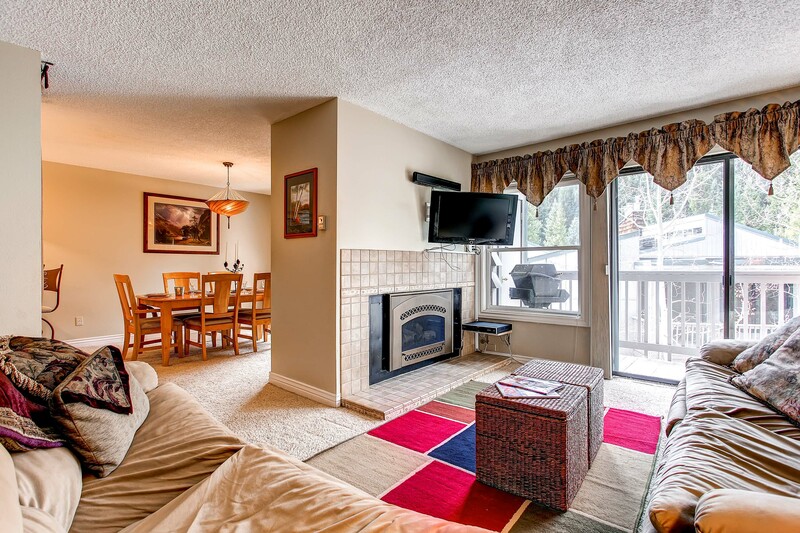 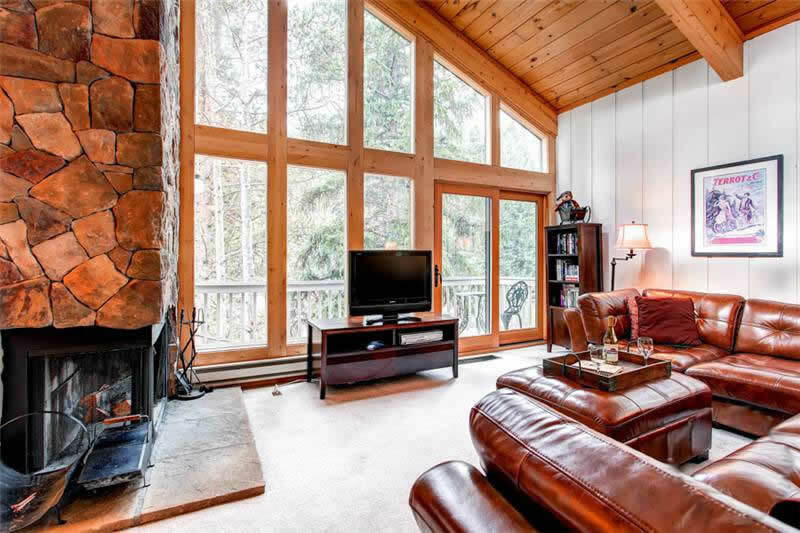 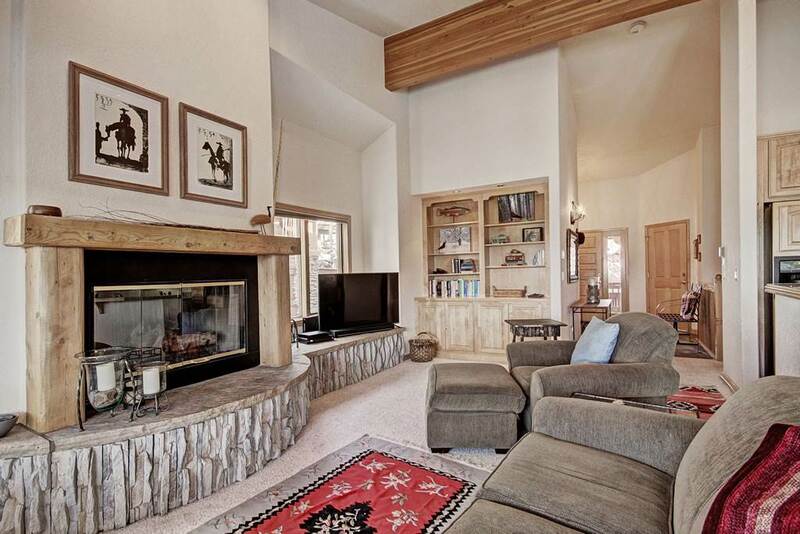 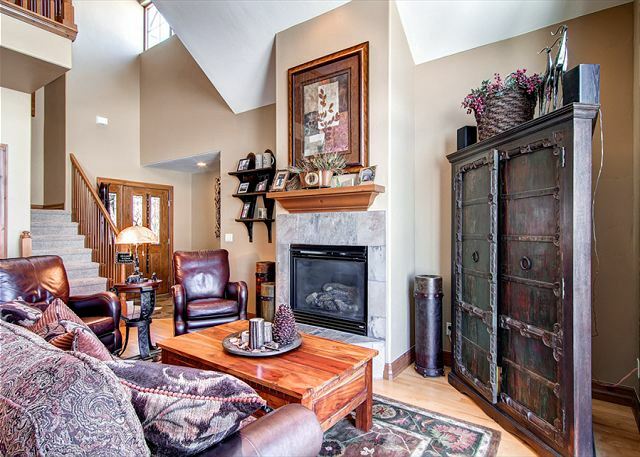 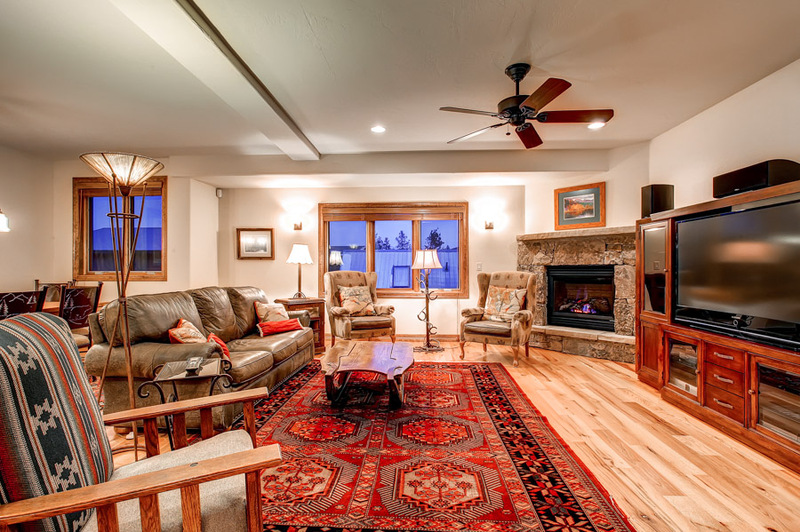 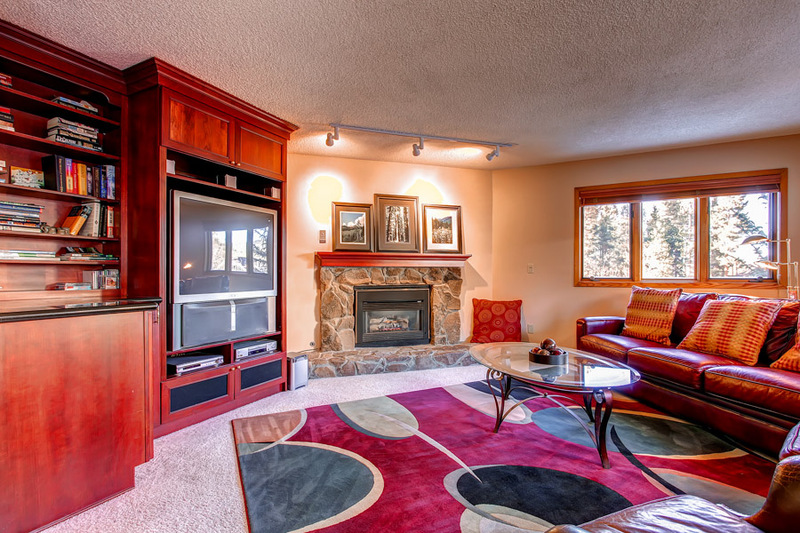 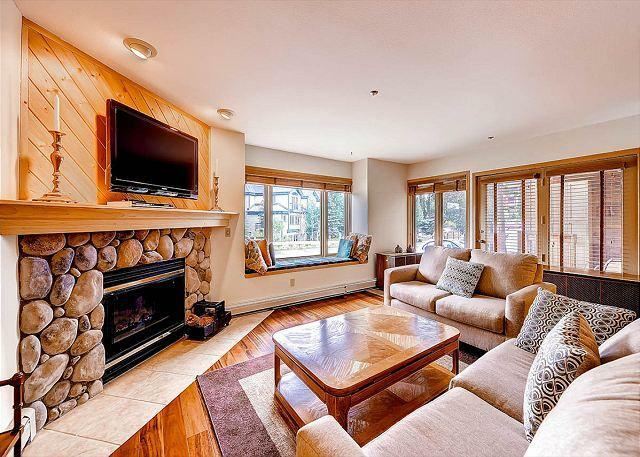 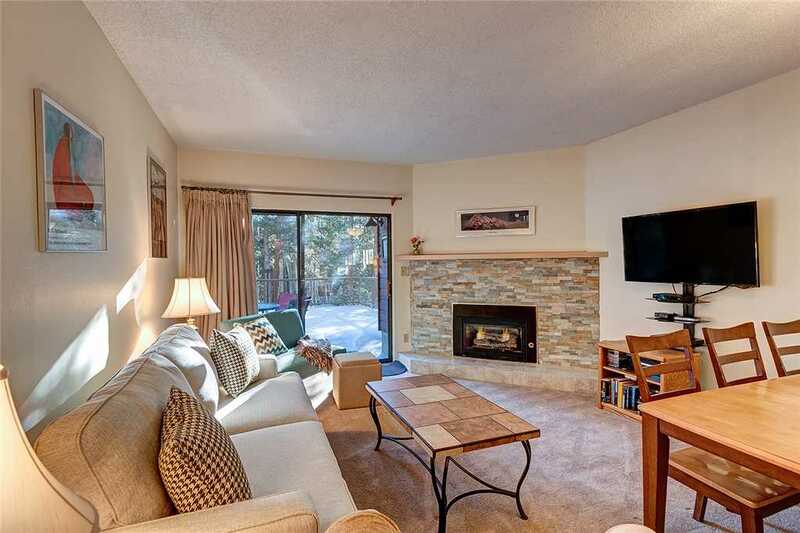 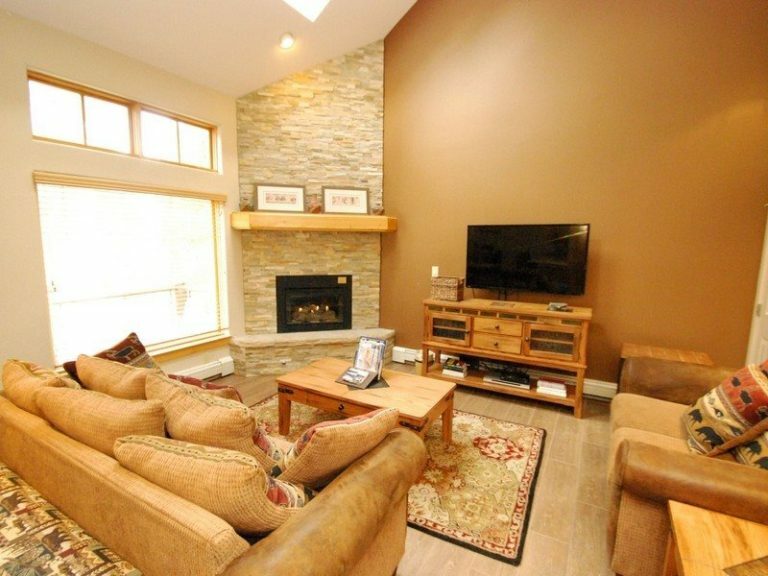 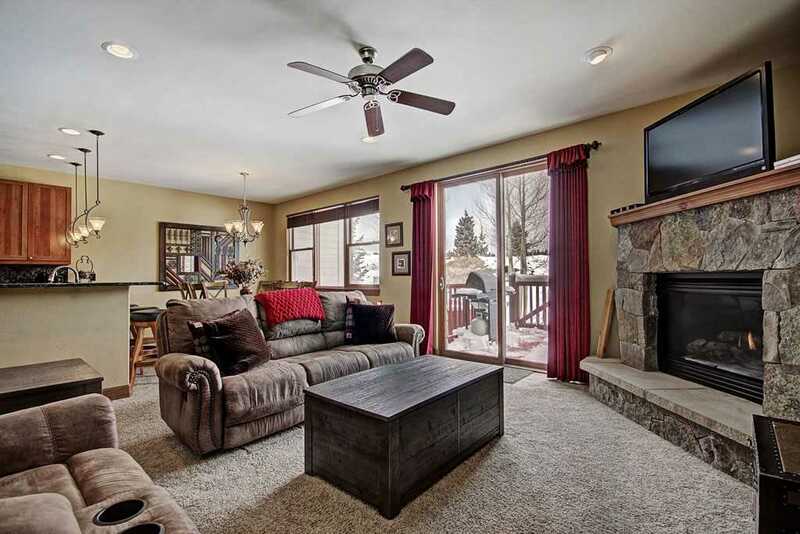 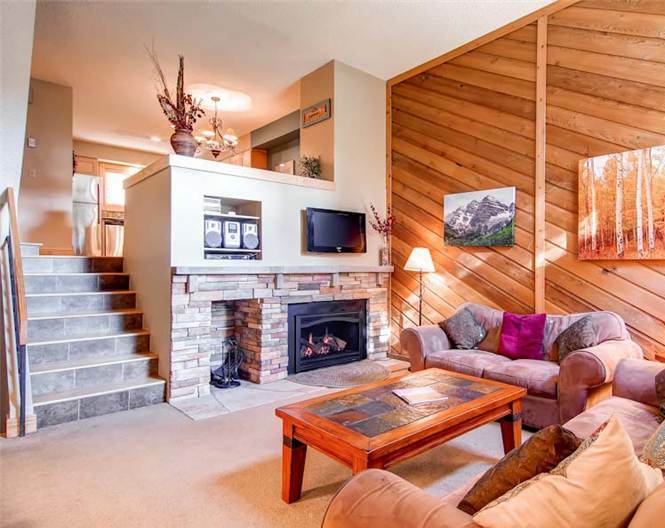 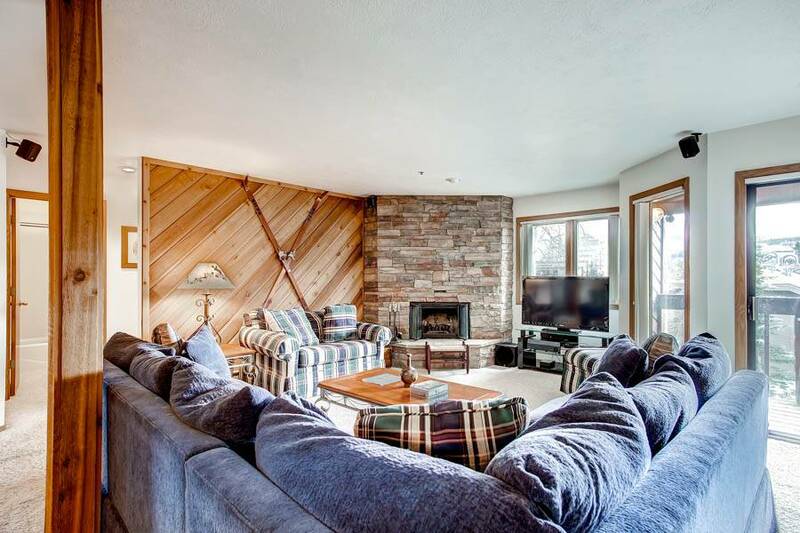 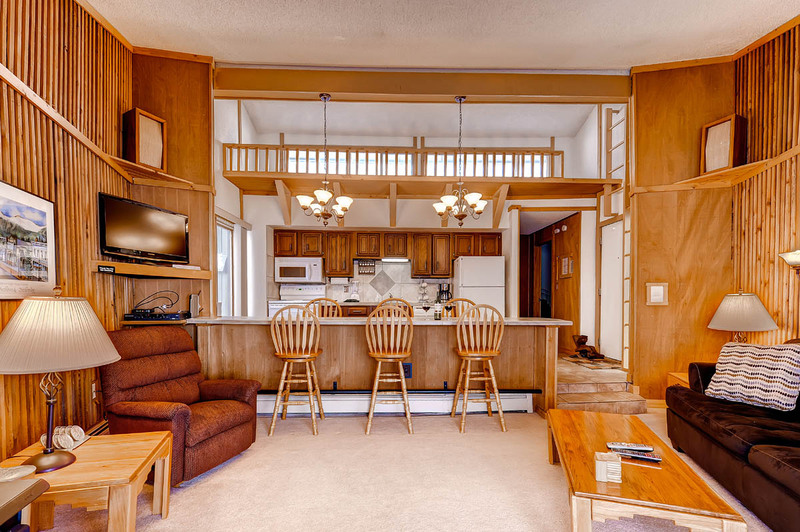 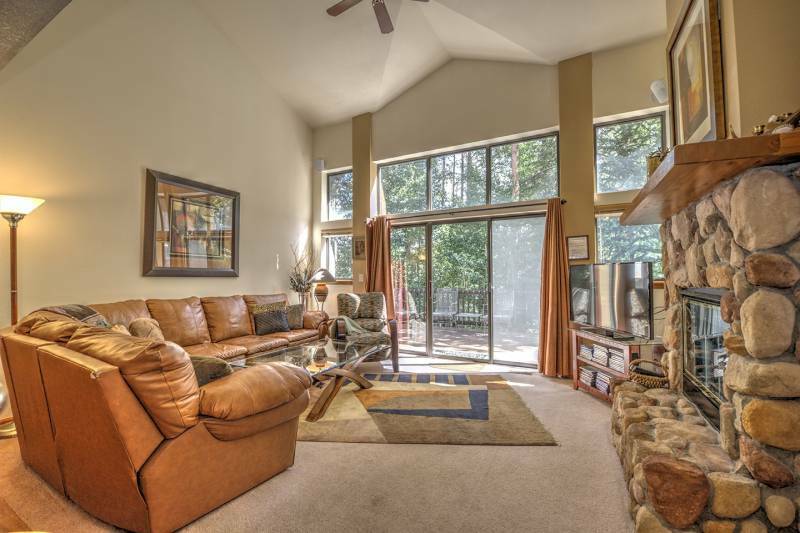 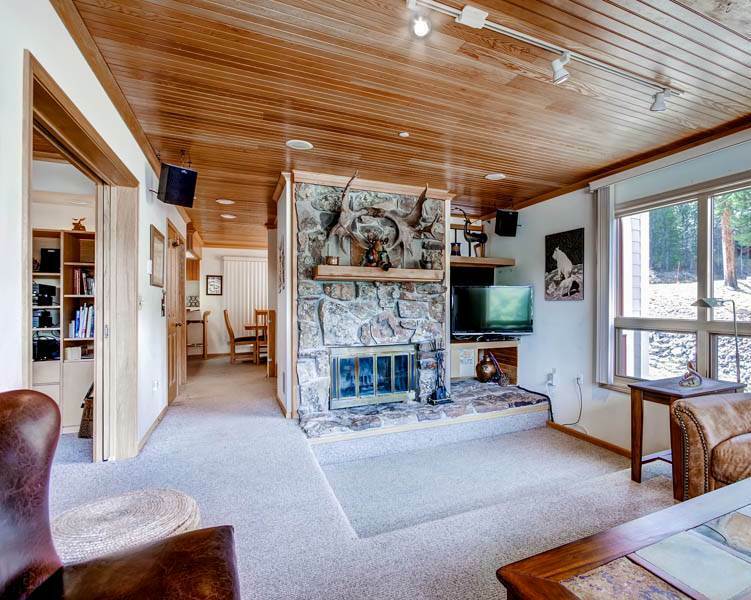 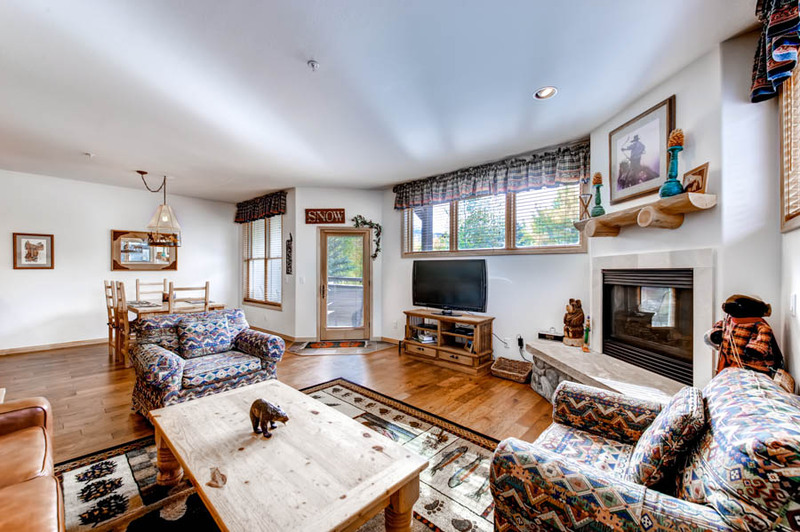 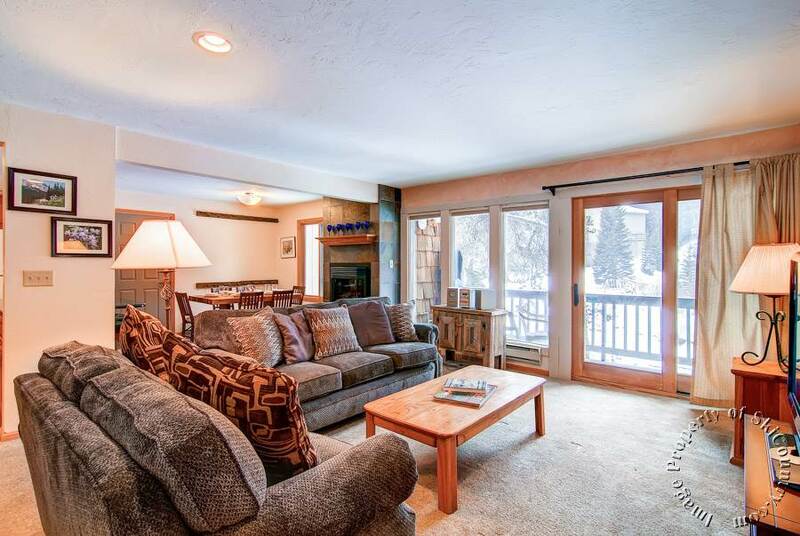 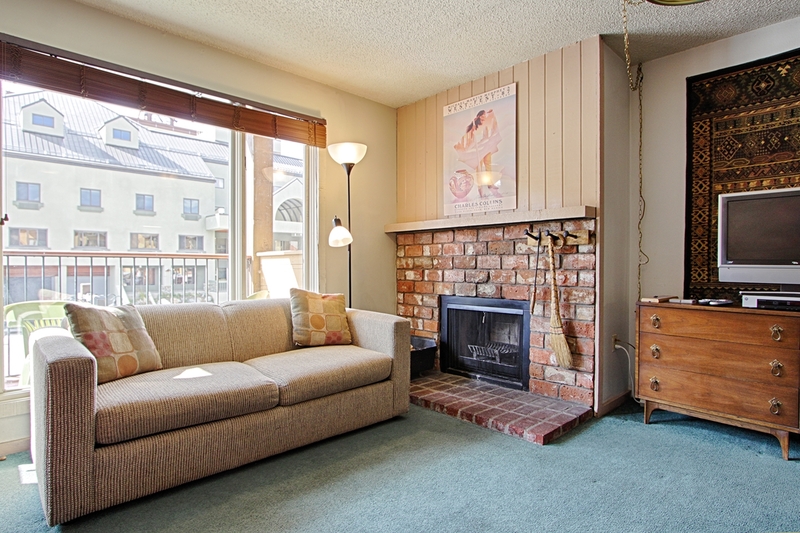 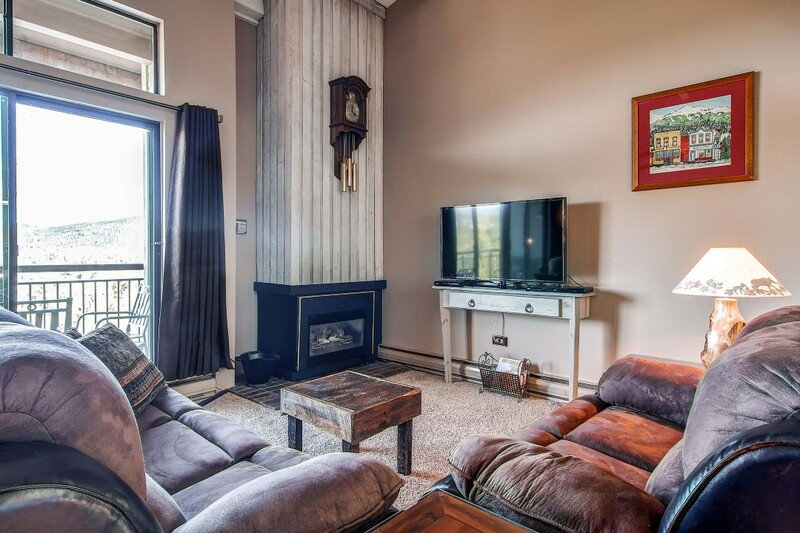 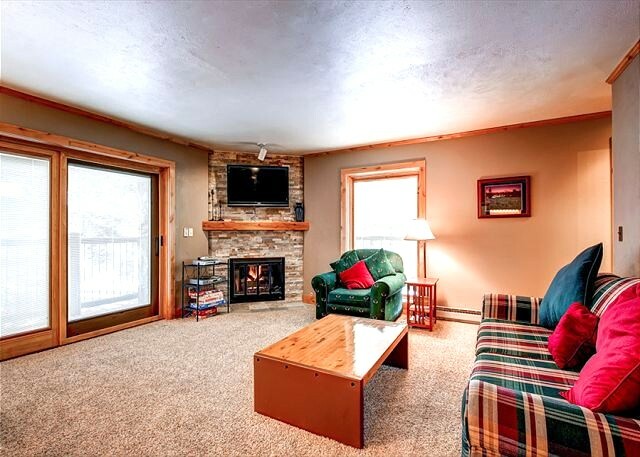 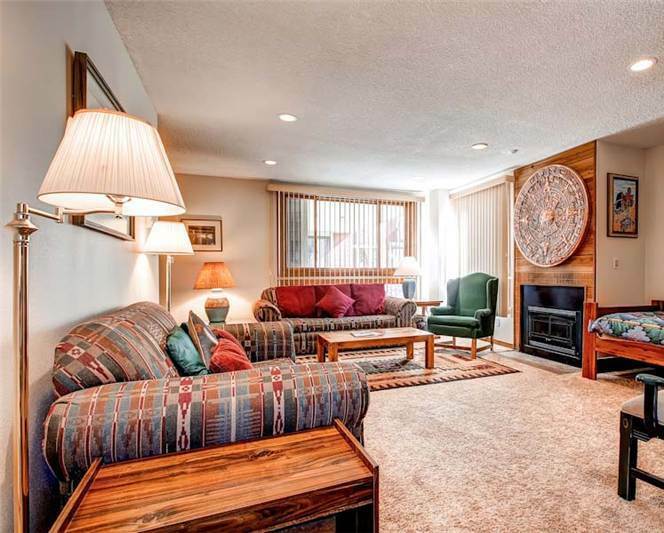 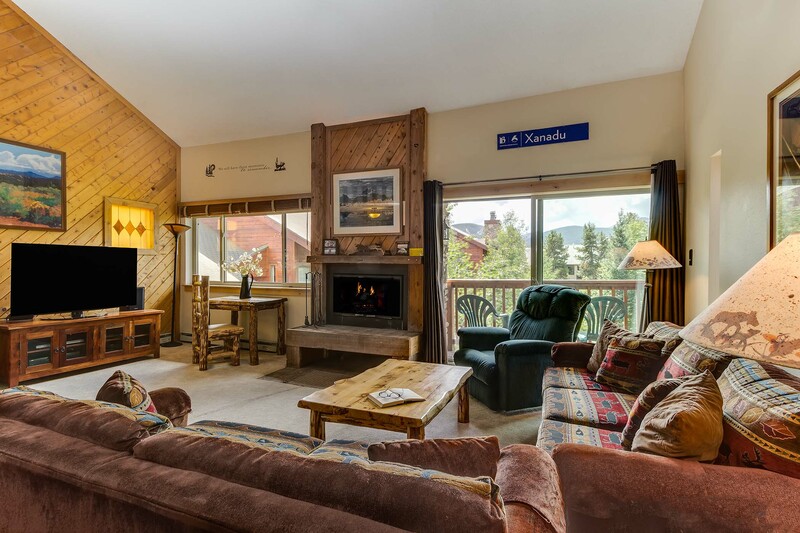 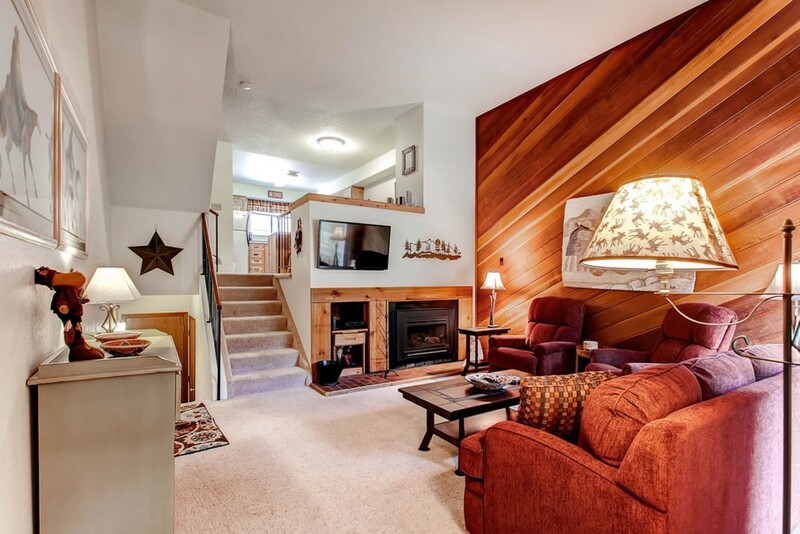 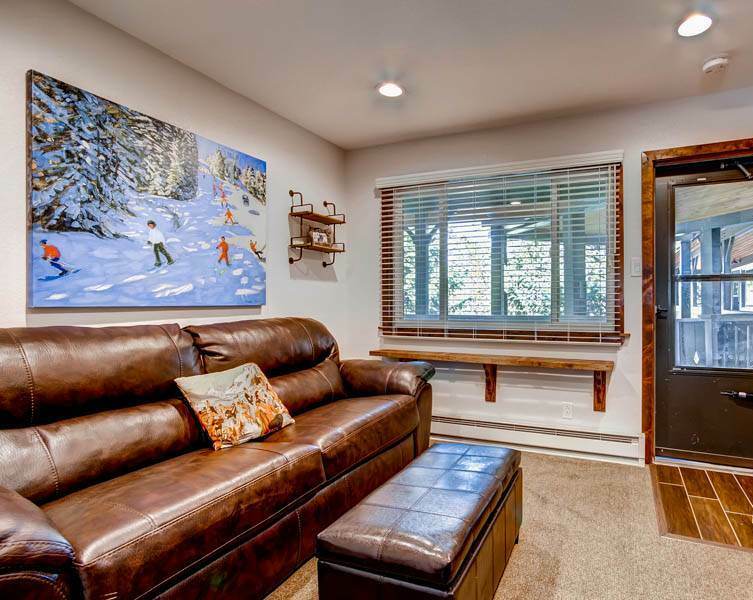 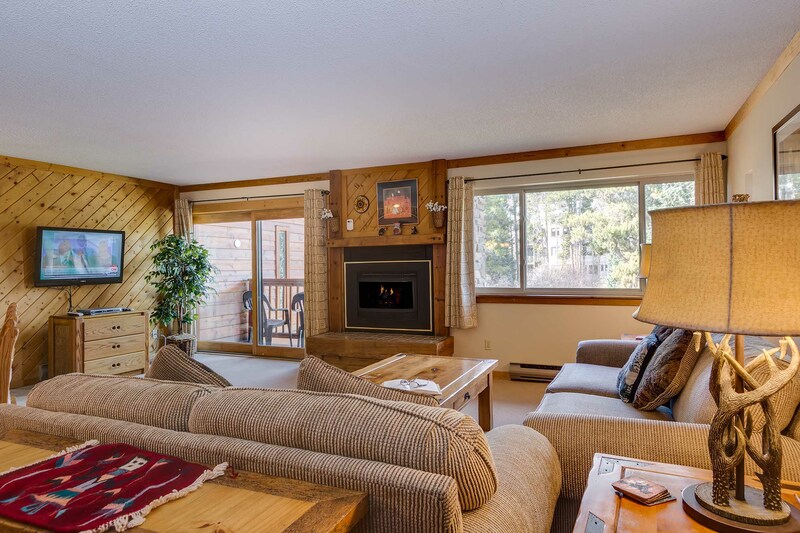 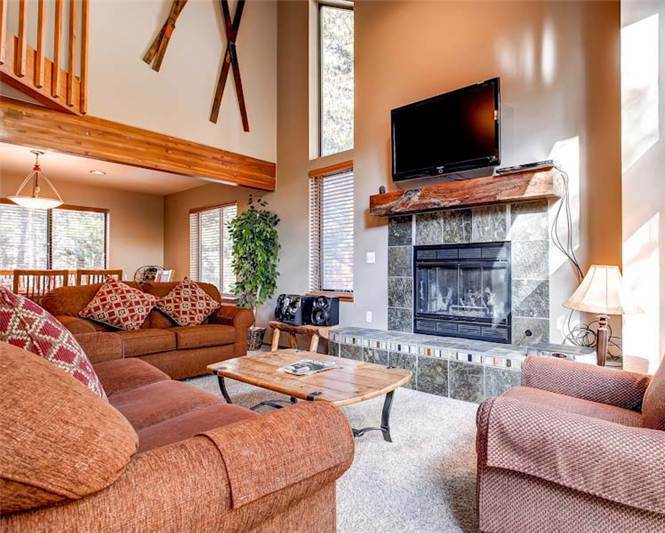 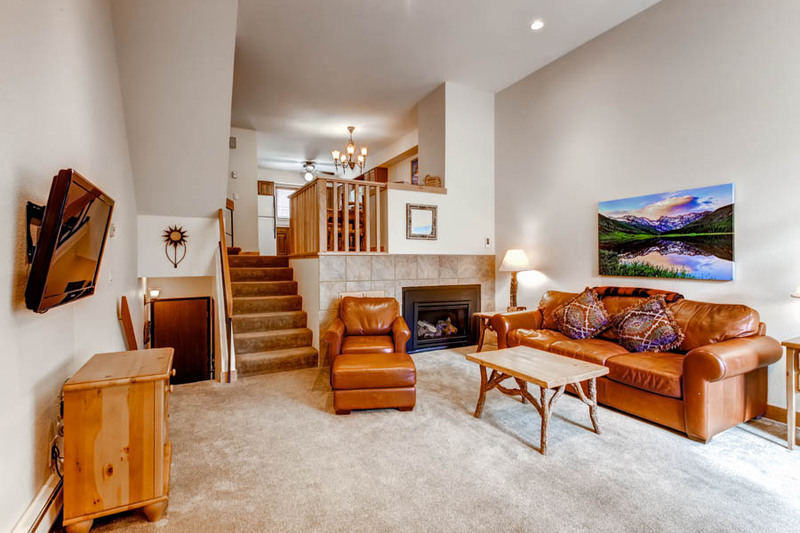 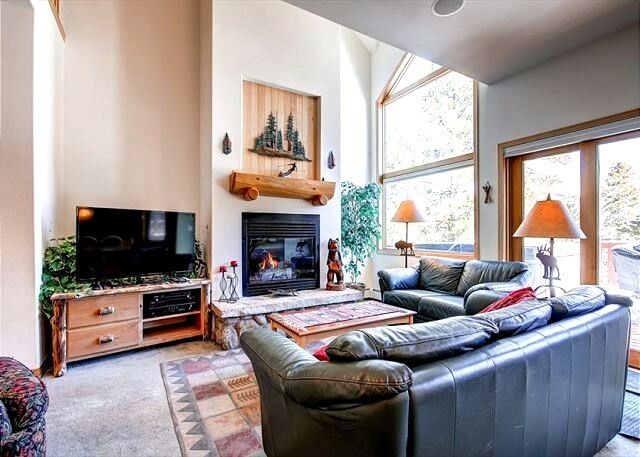 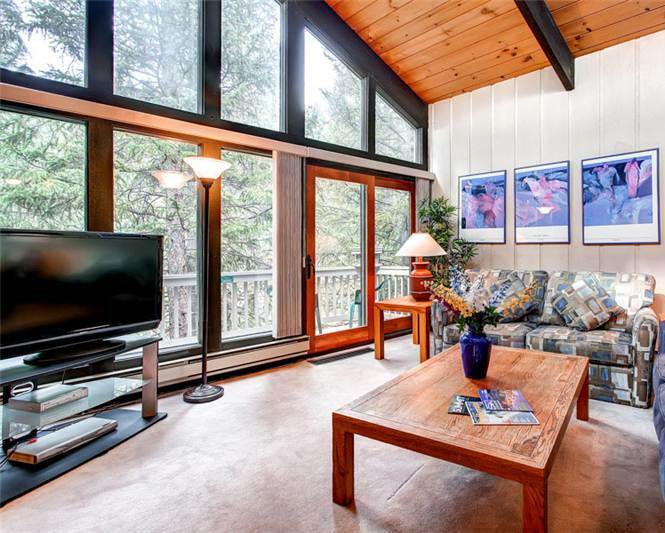 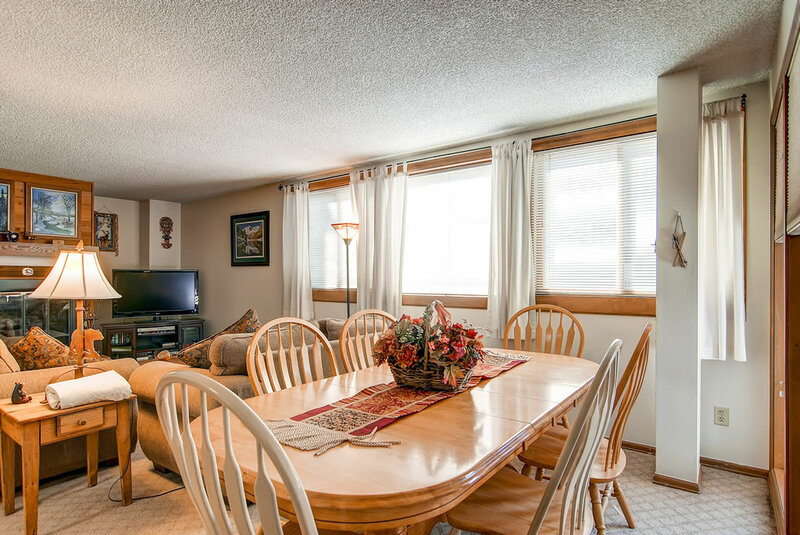 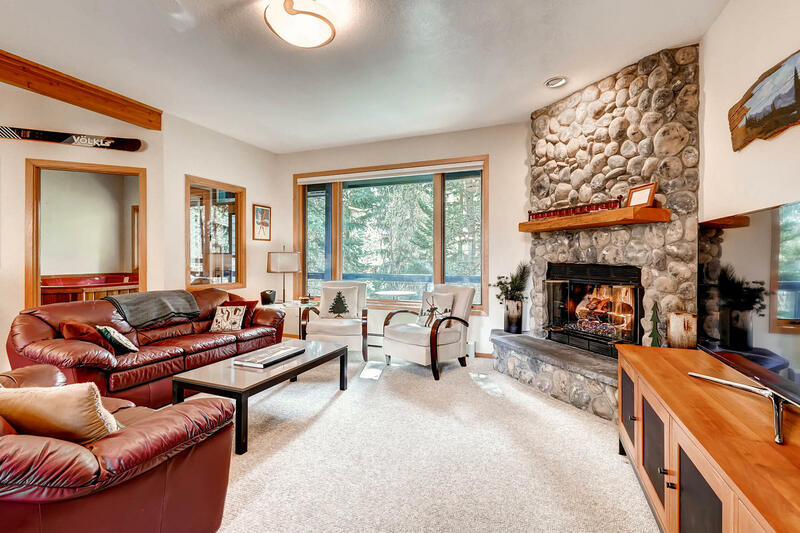 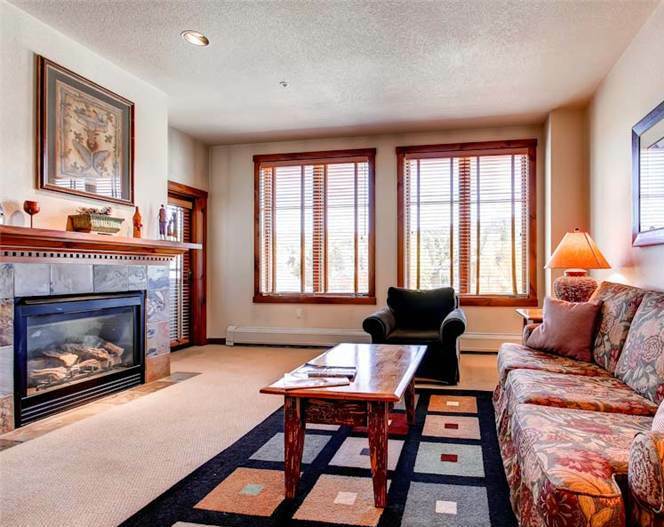 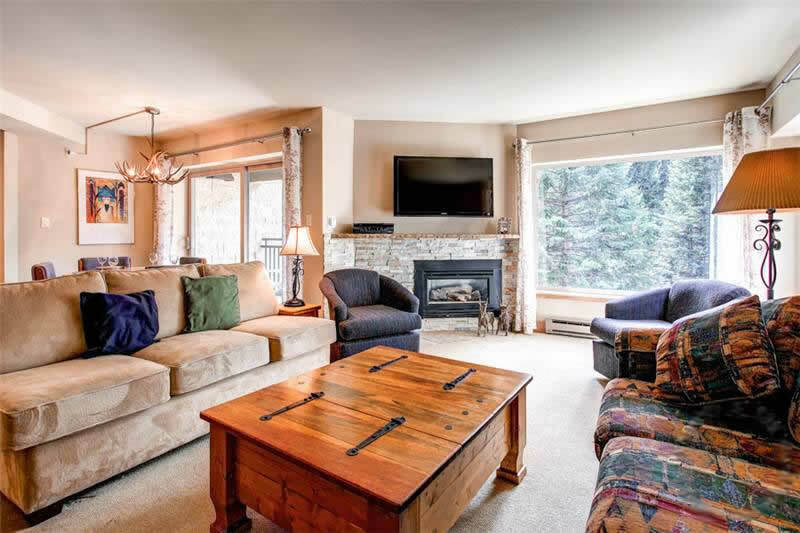 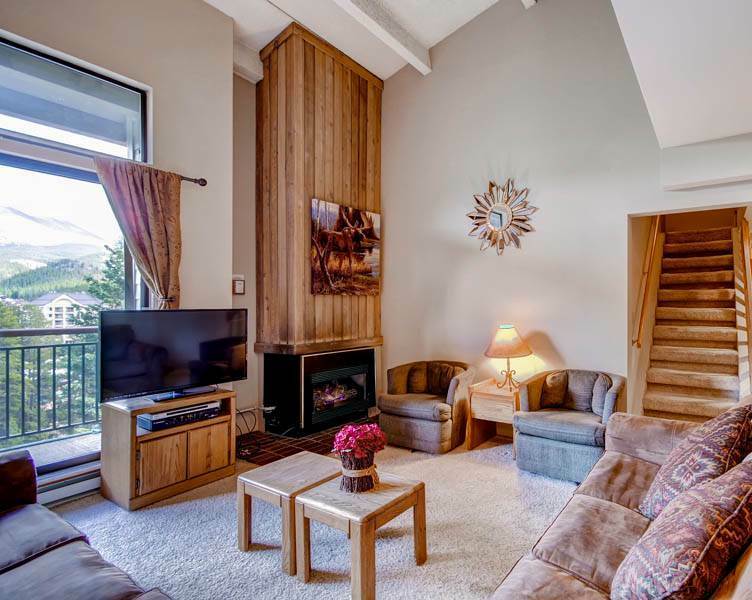 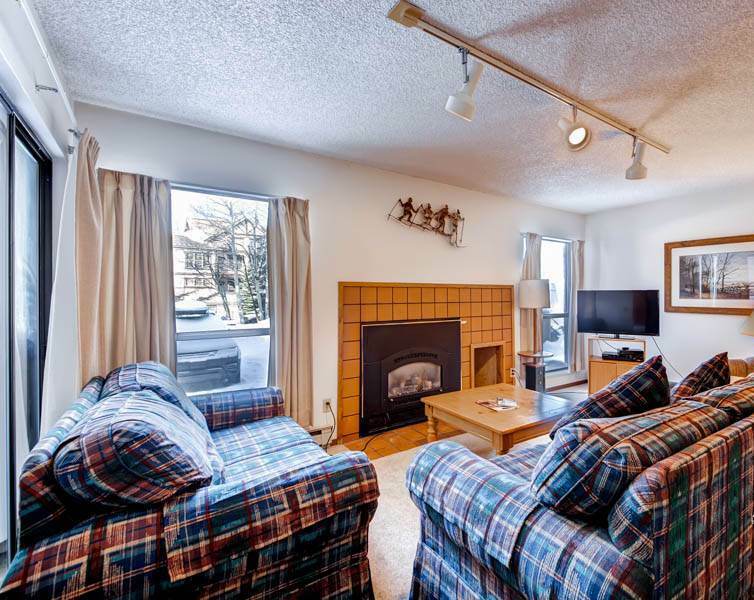 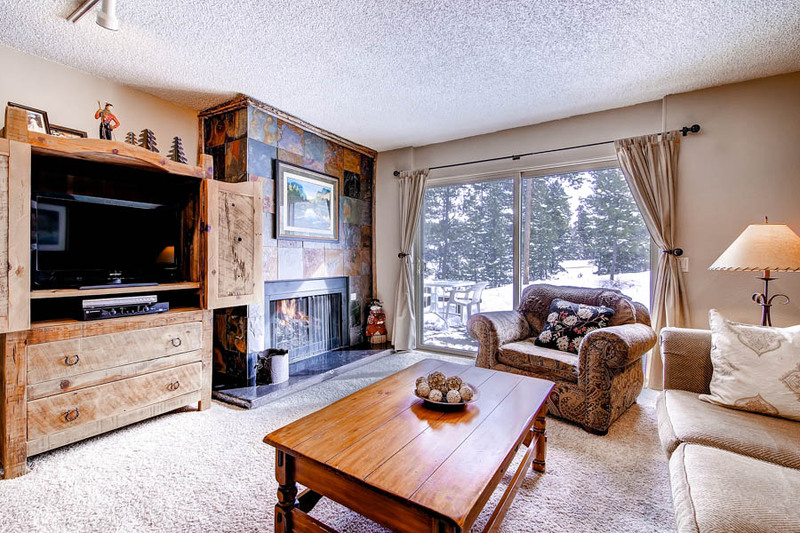 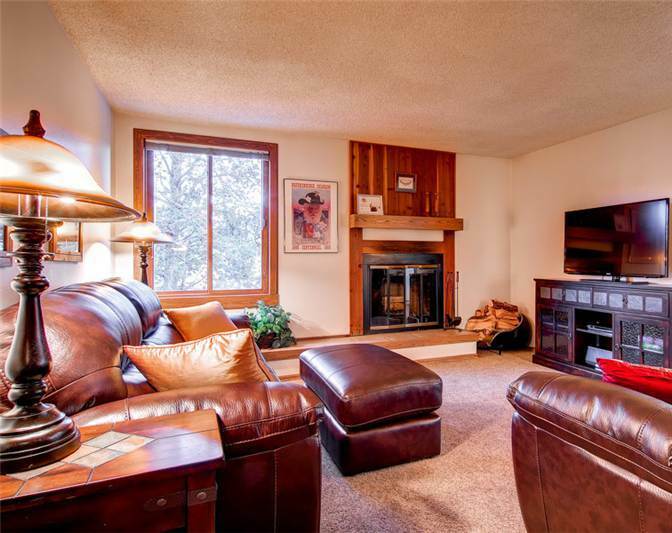 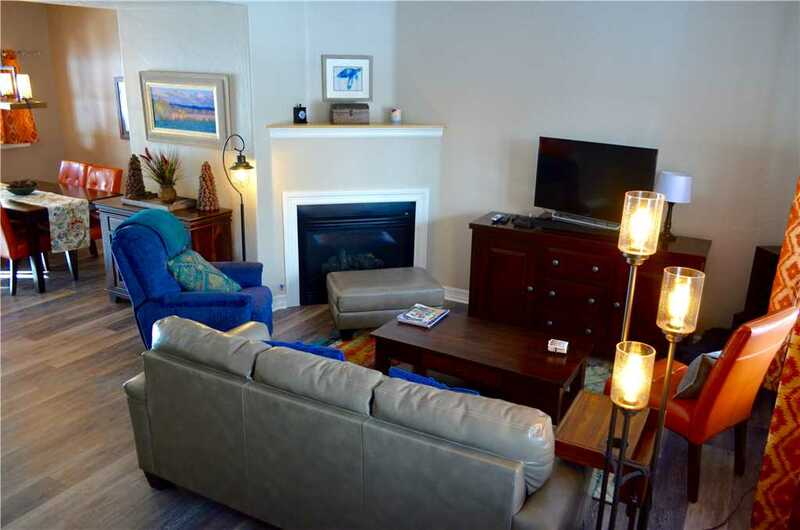 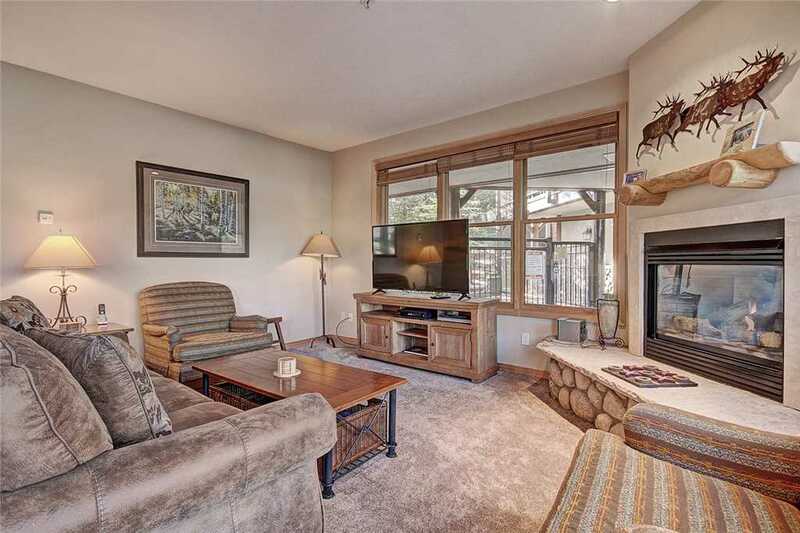 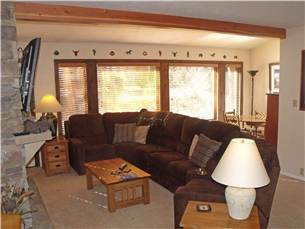 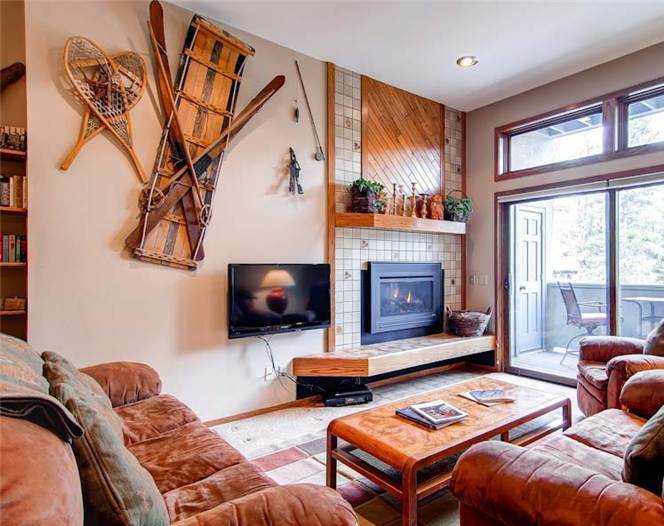 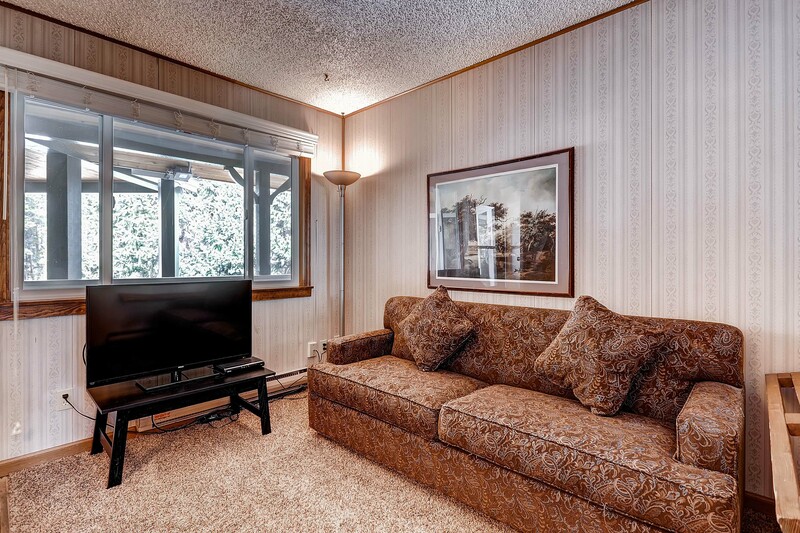 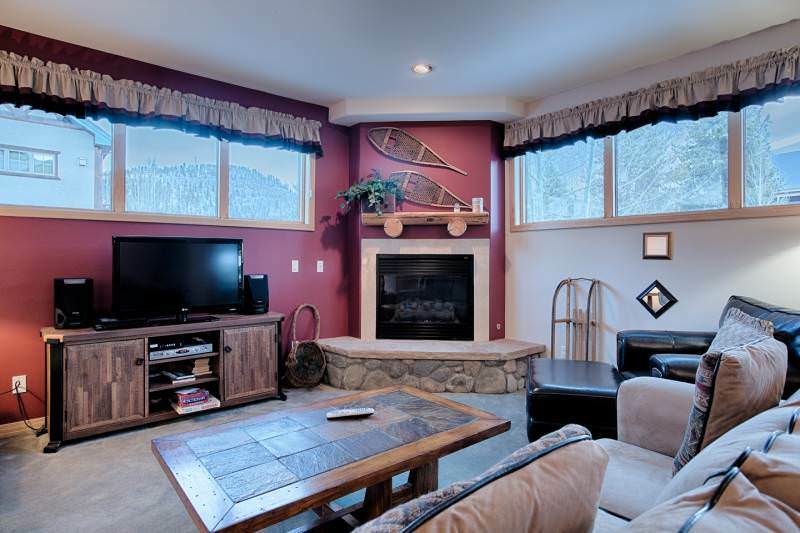 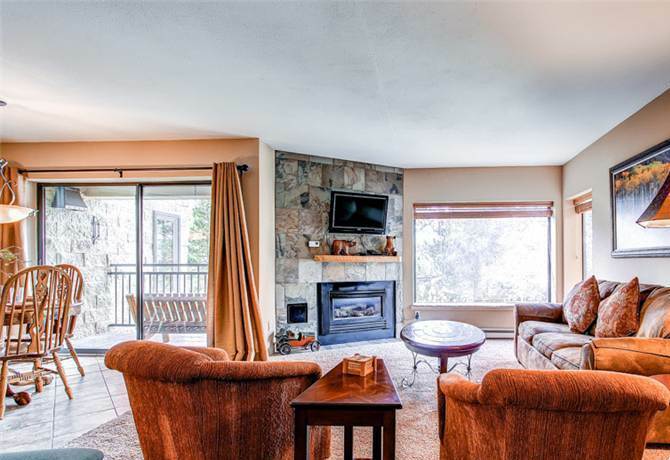 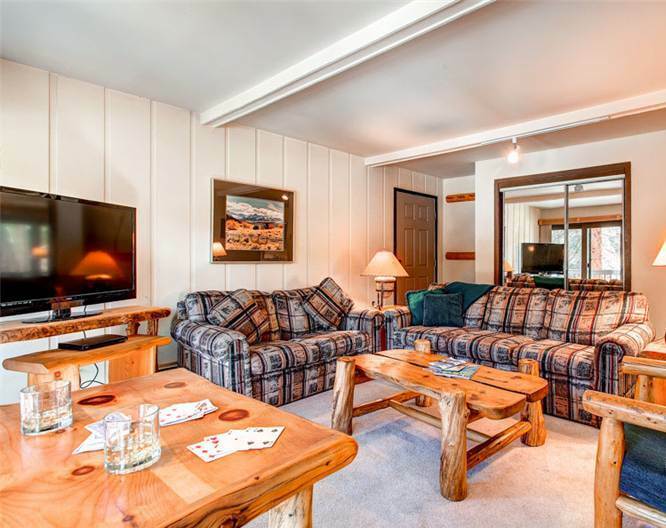 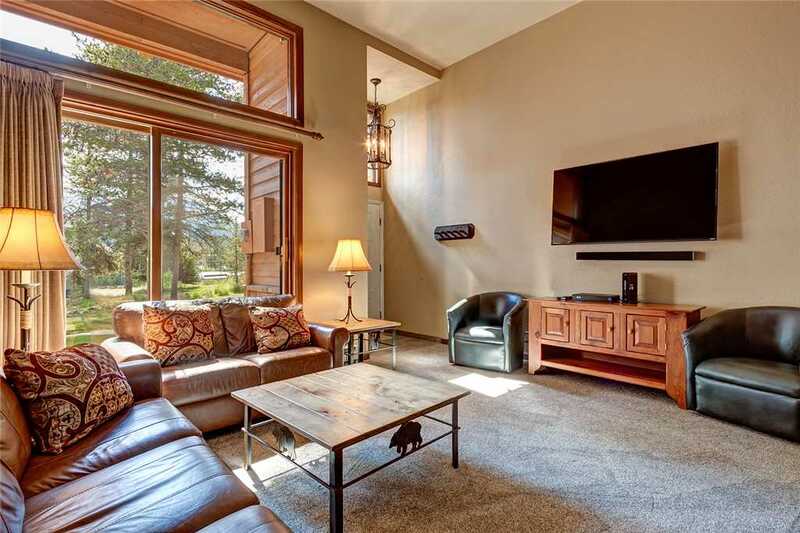 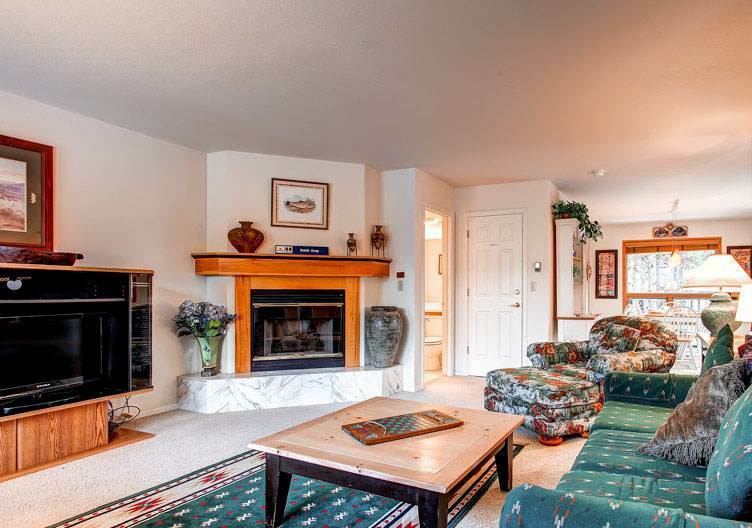 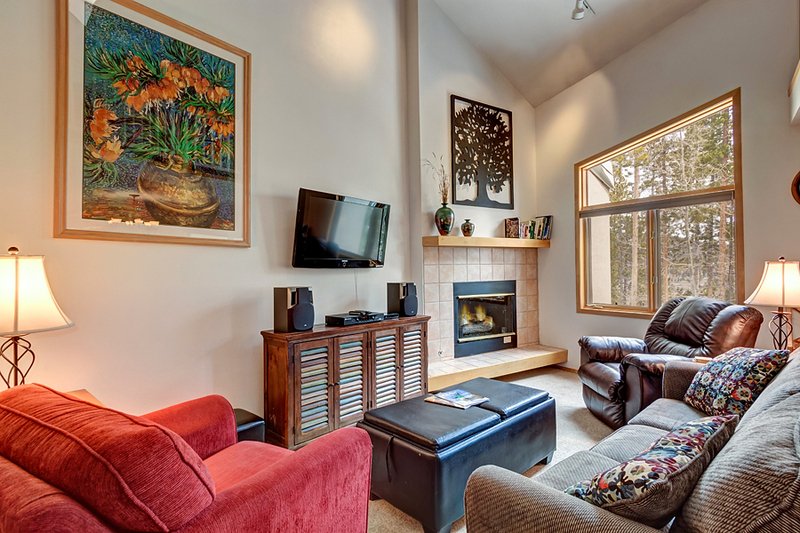 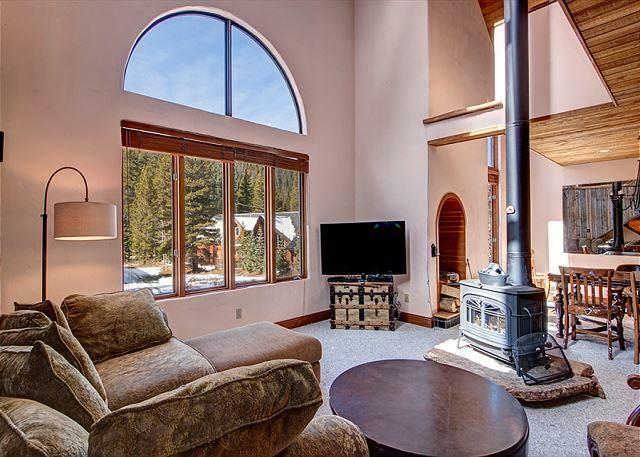 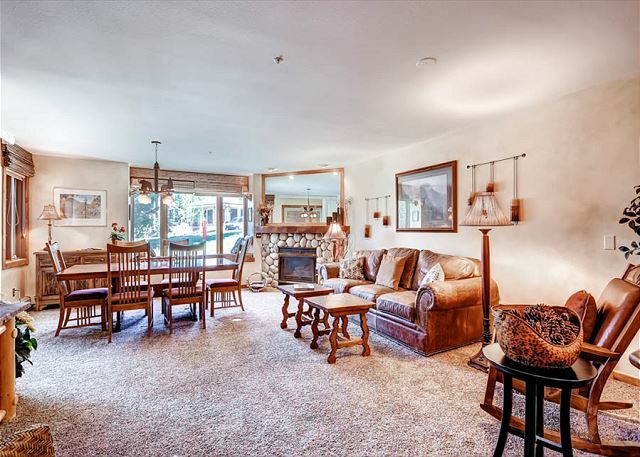 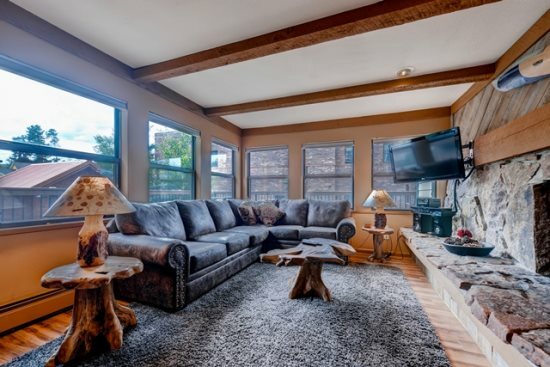 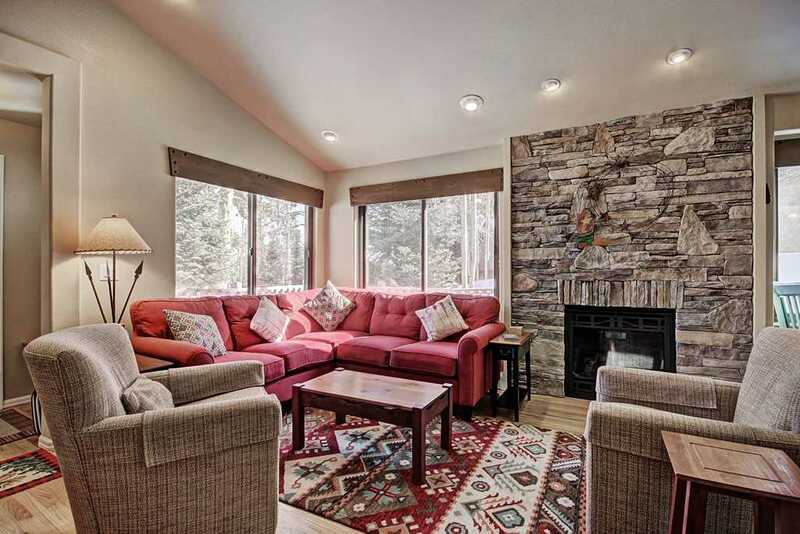 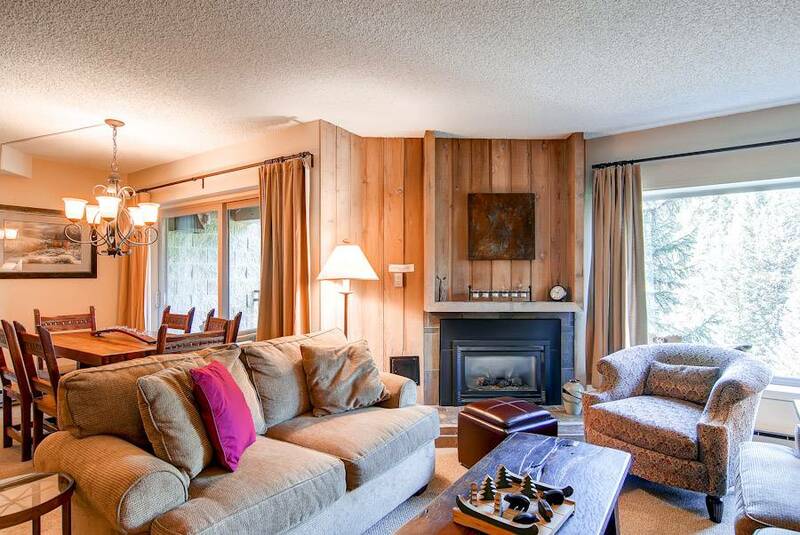 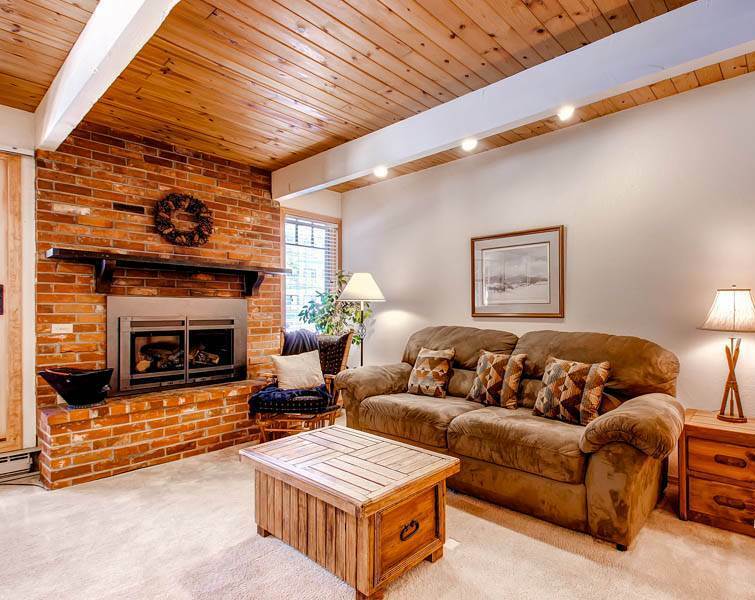 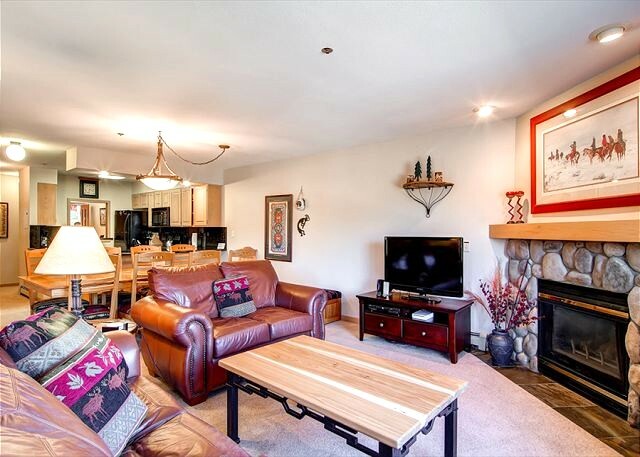 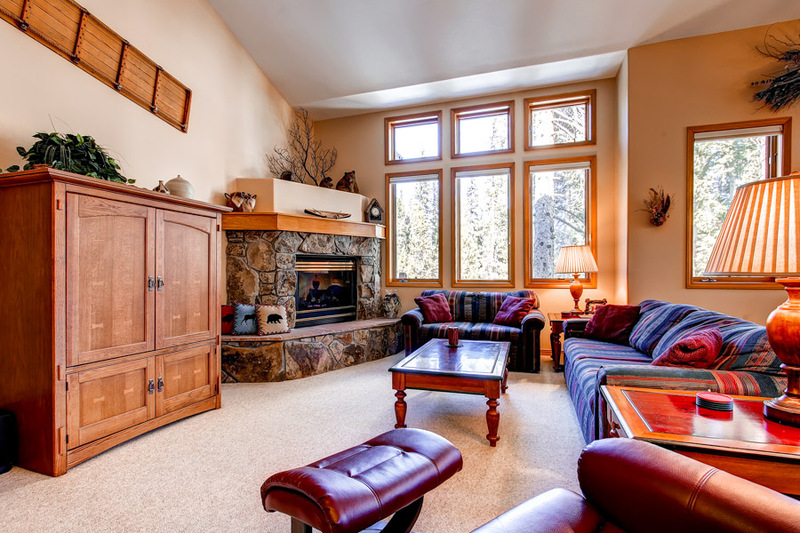 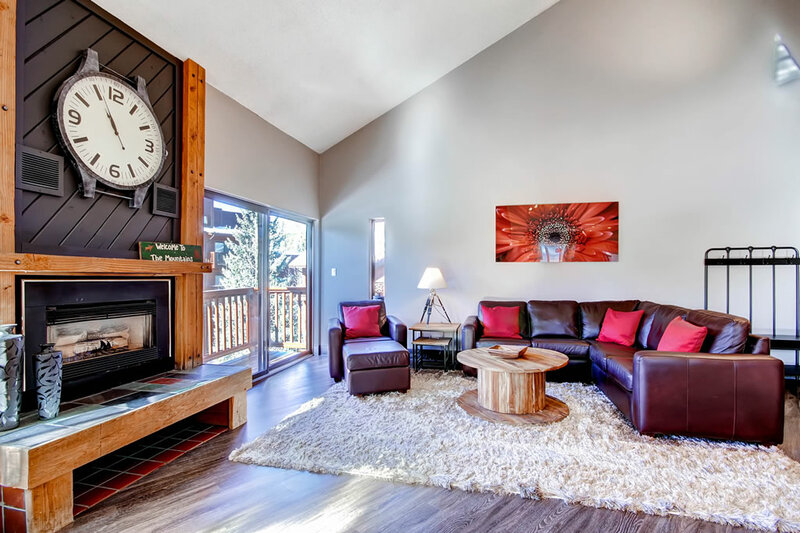 After a long day of skiing, hang out in the living room; there’s plenty of seating around the gas fireplace, and the vaulted ceilings and large windows provide a bright, open feel. 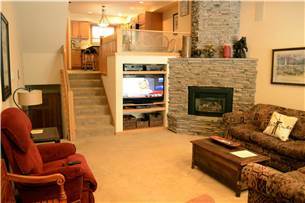 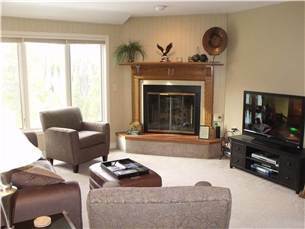 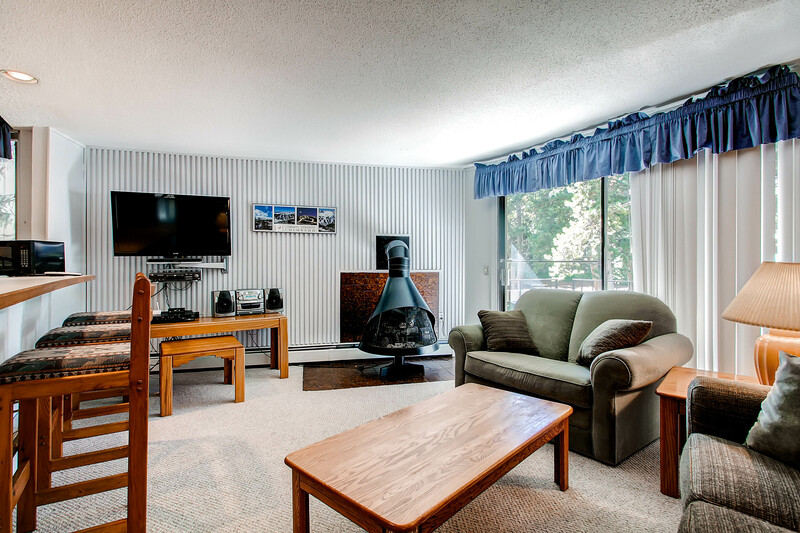 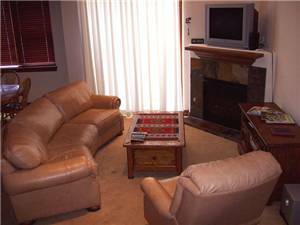 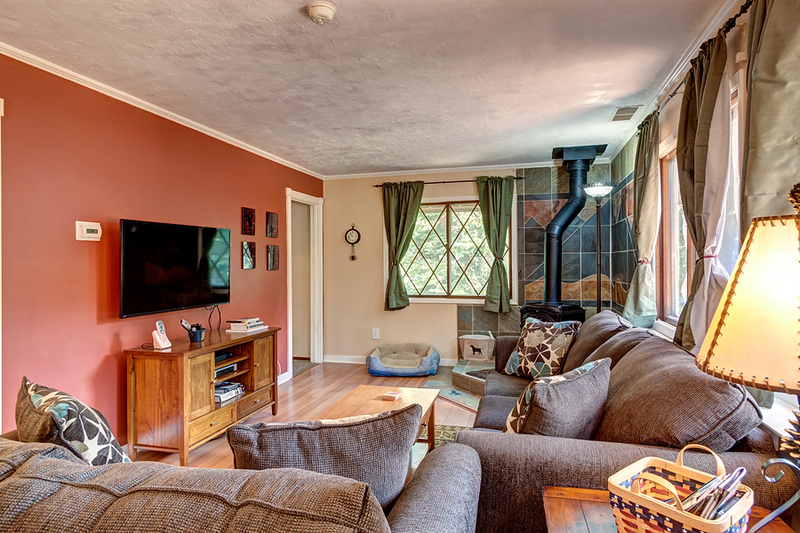 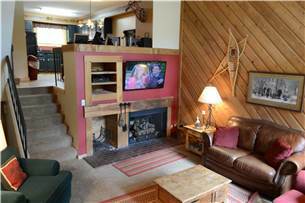 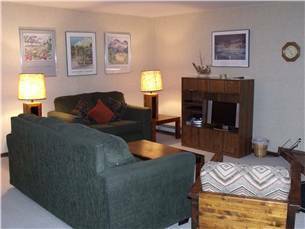 Downstairs is the family room, with plenty of seating around the entertainment center with a brand new Samsung LED TV/Blu-ray player. 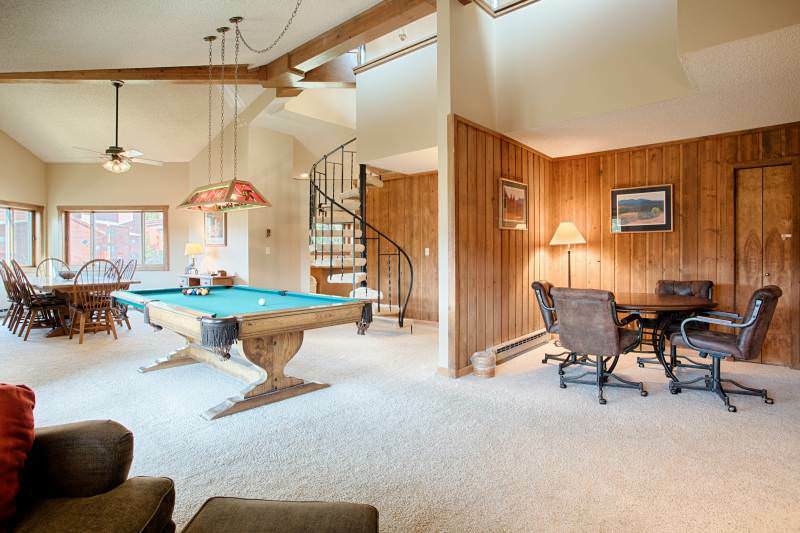 There’s also a game table and just outside, the hot tub awaits. 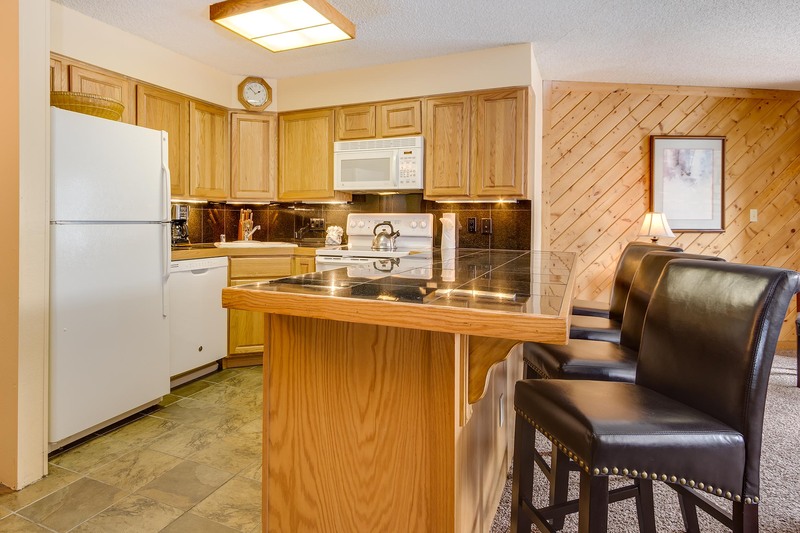 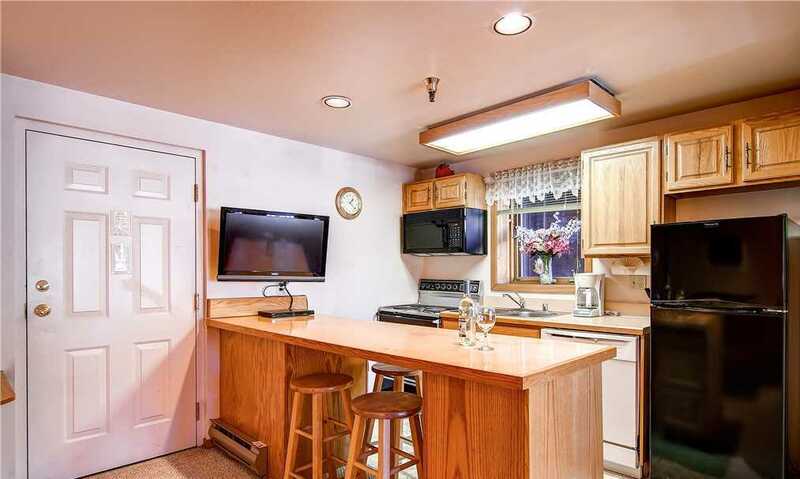 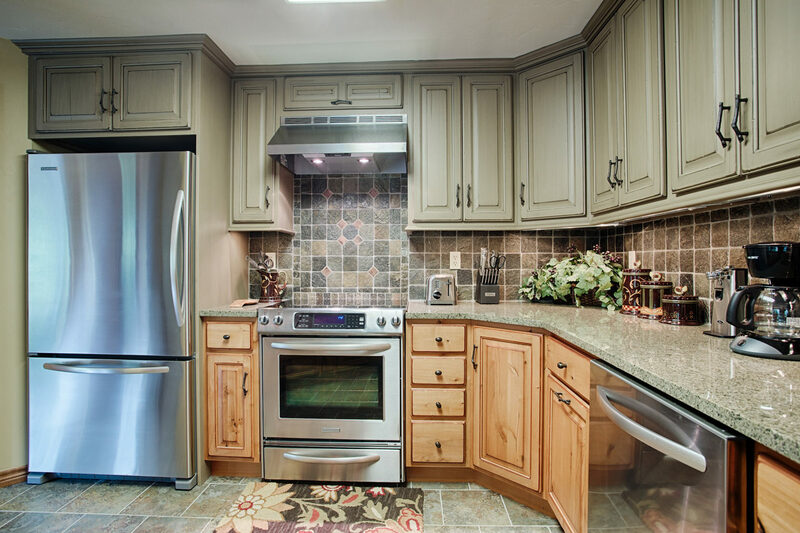 The gourmet kitchen is perfect for feeding the troops, with a Vulcan commercial stove, tons of counter space, and everything you need to whip up a fabulous mountain meal. 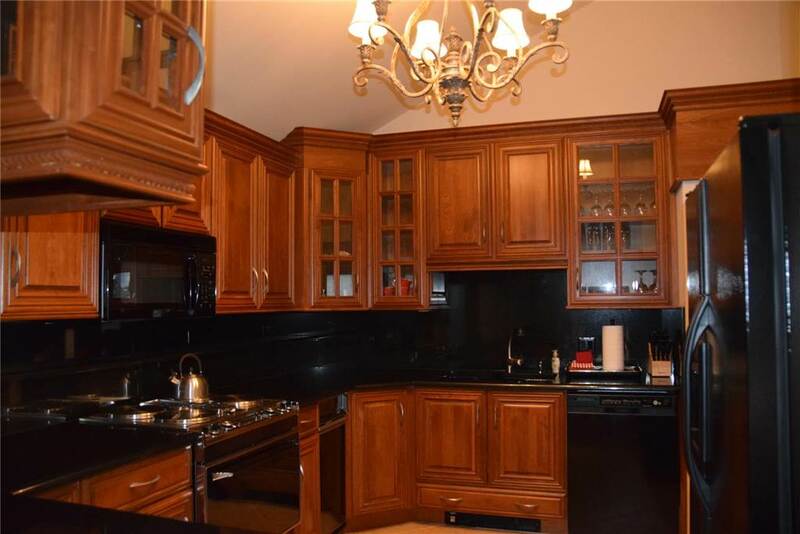 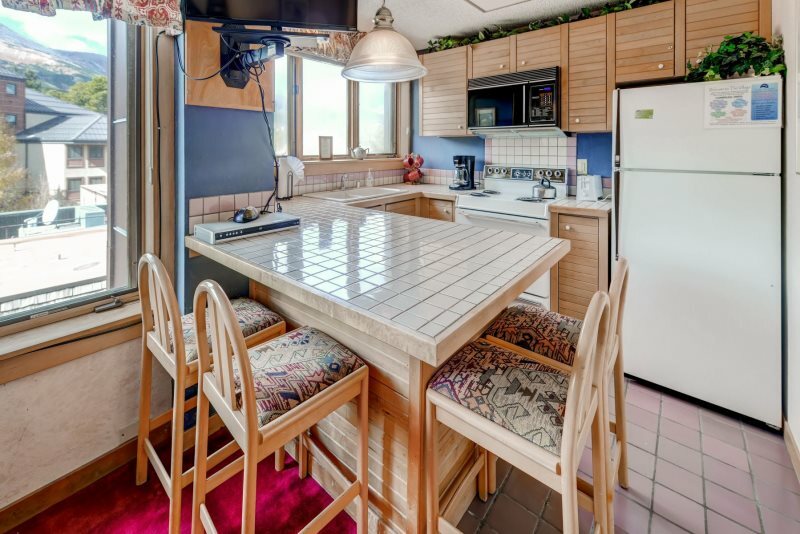 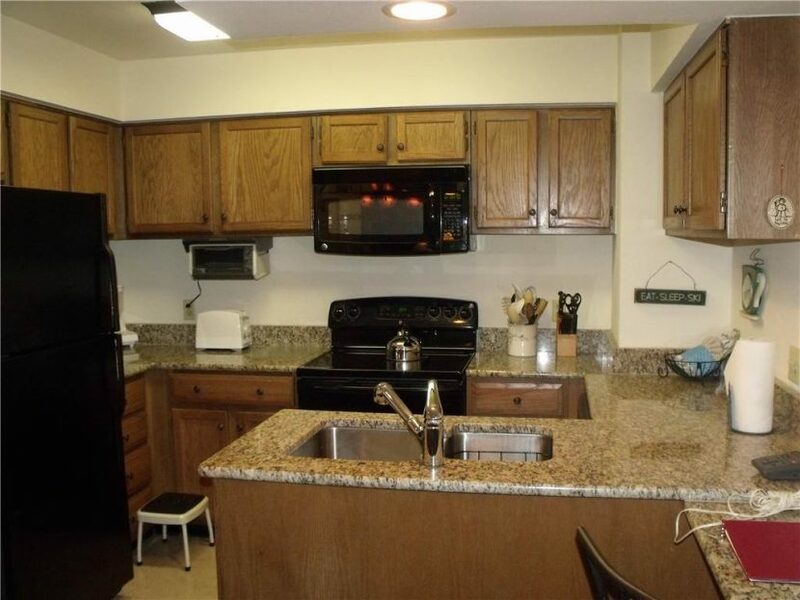 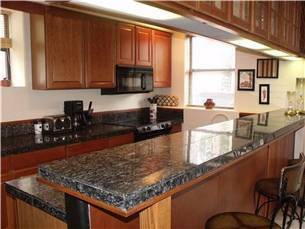 There’s seating for 10 at the dining table and room for four at the island counter. 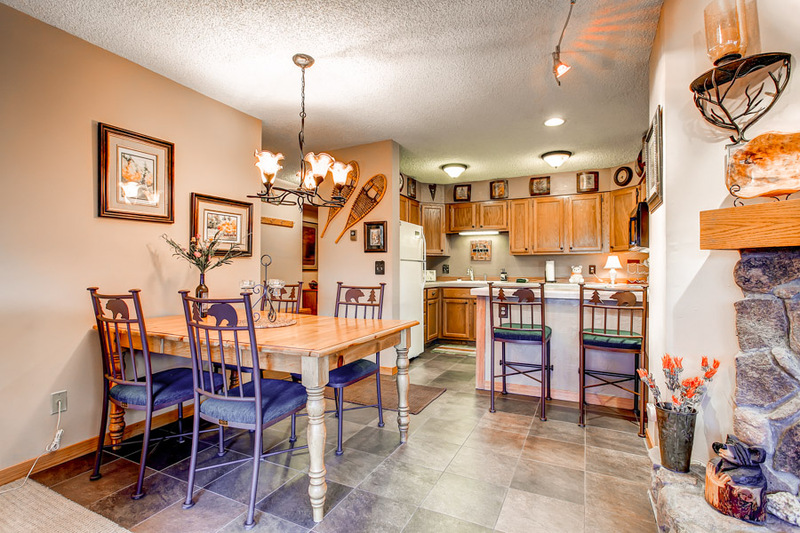 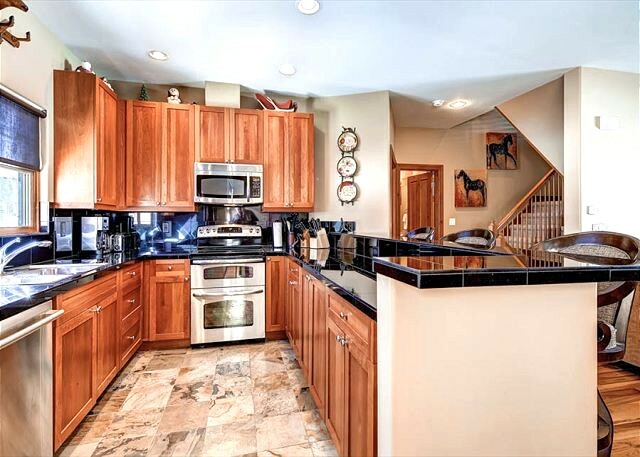 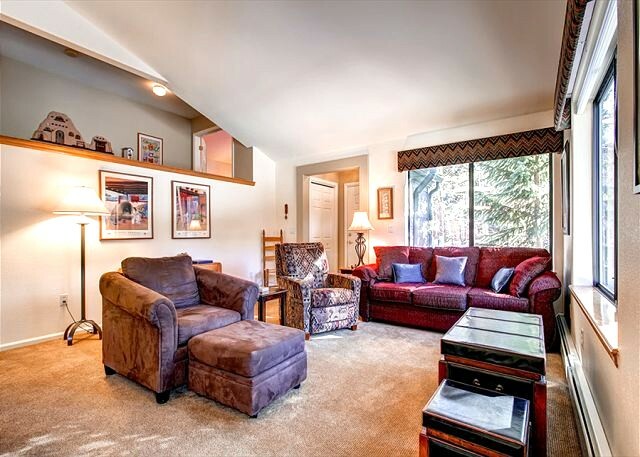 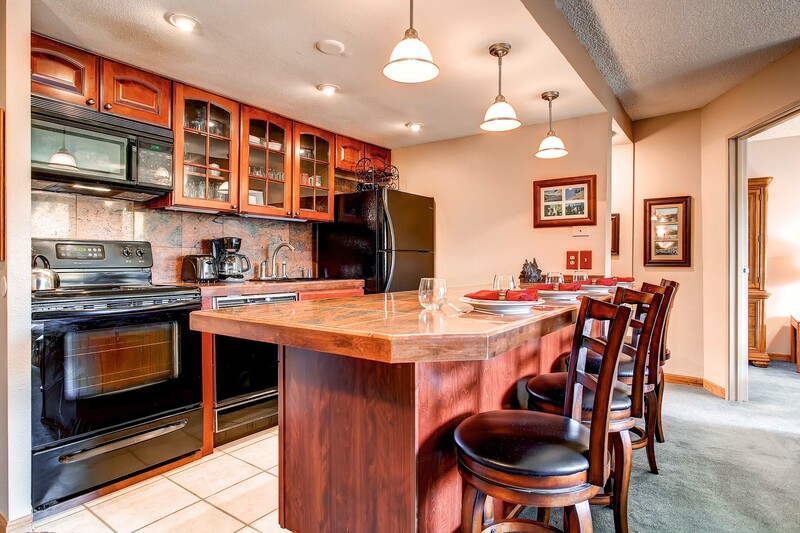 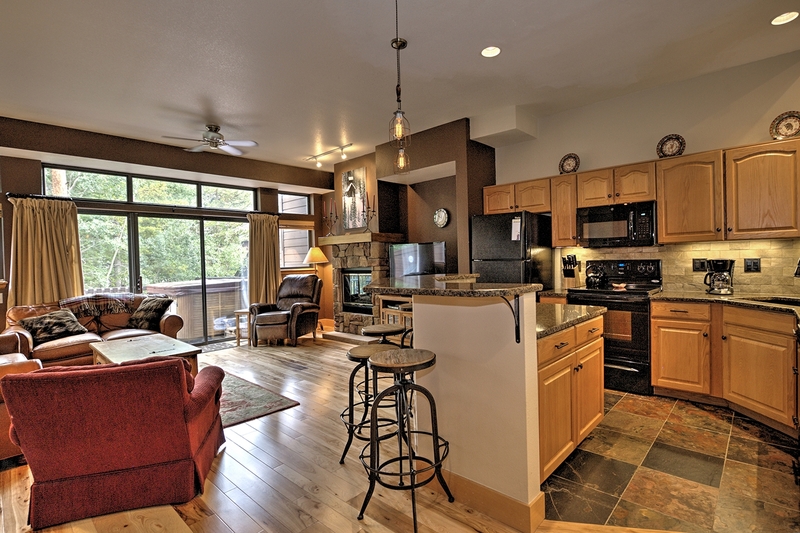 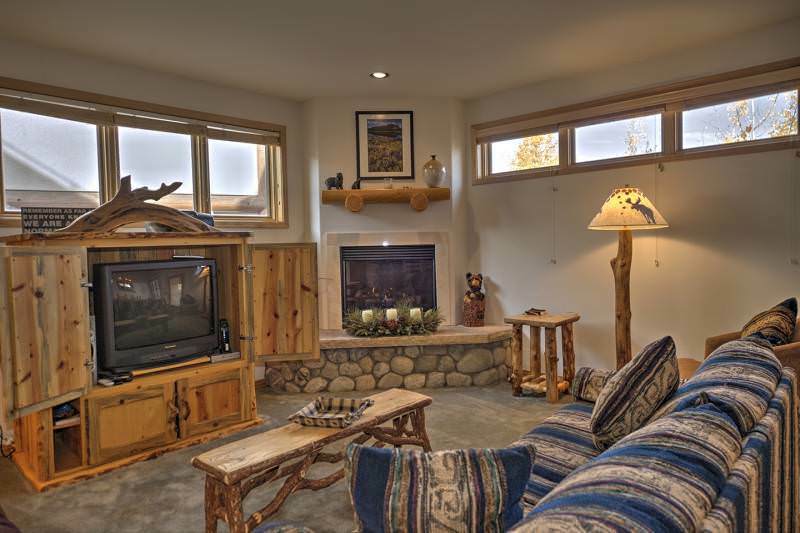 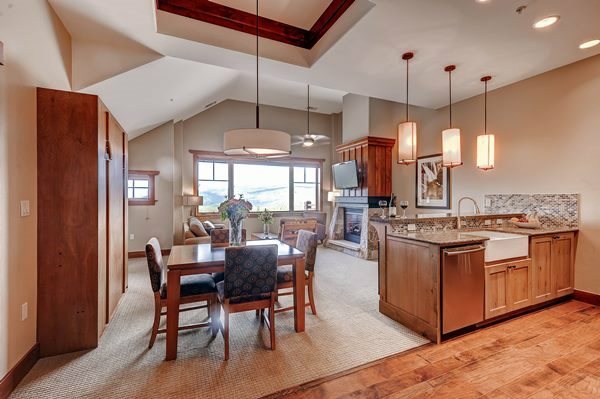 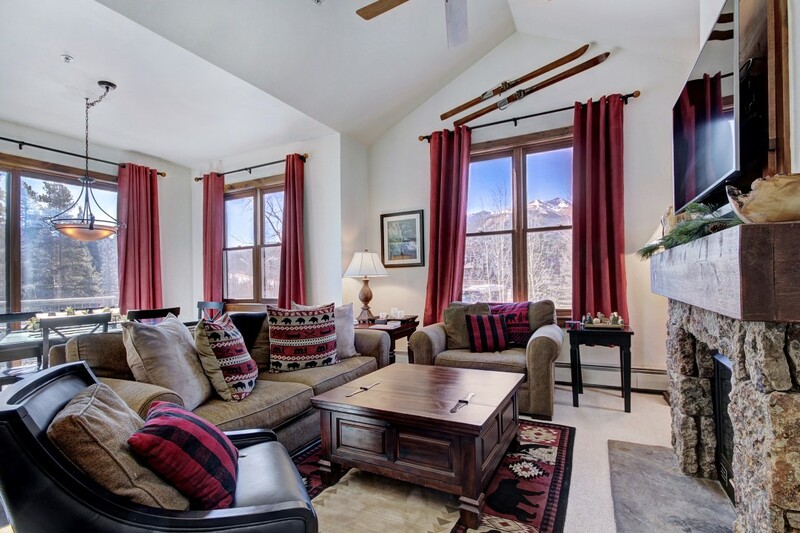 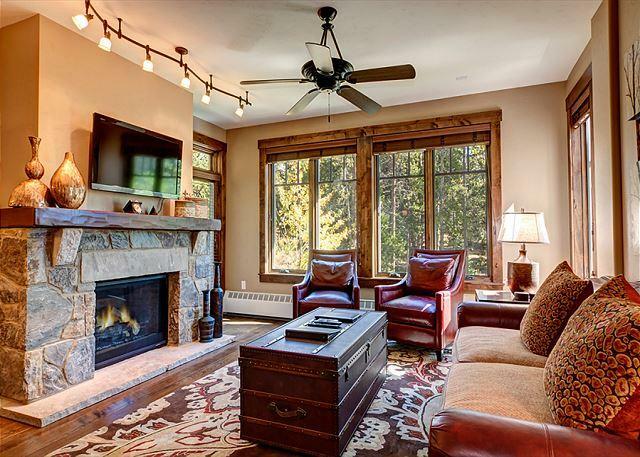 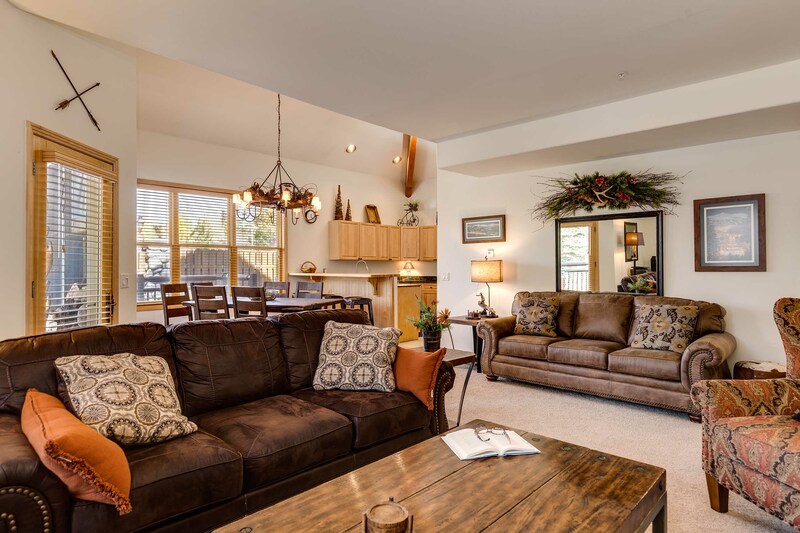 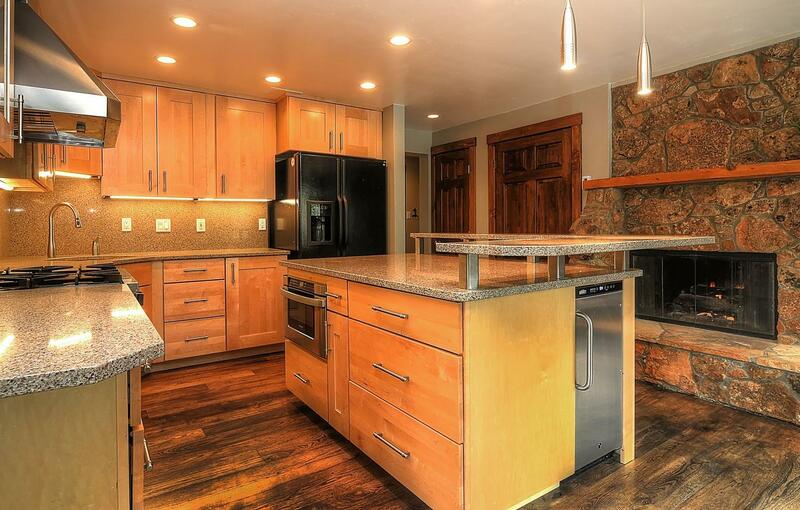 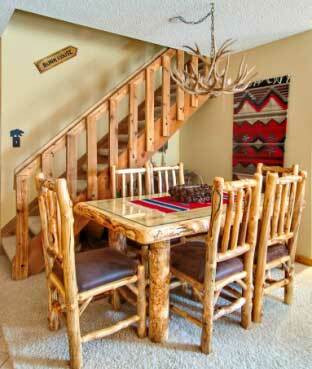 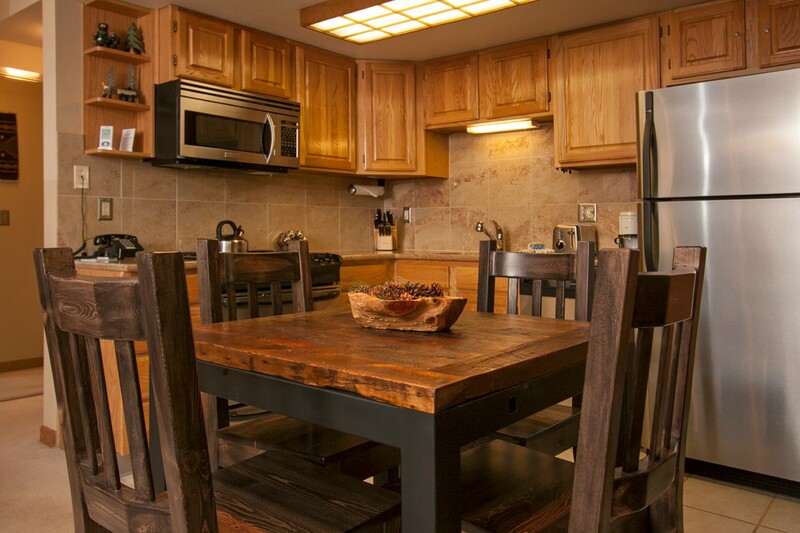 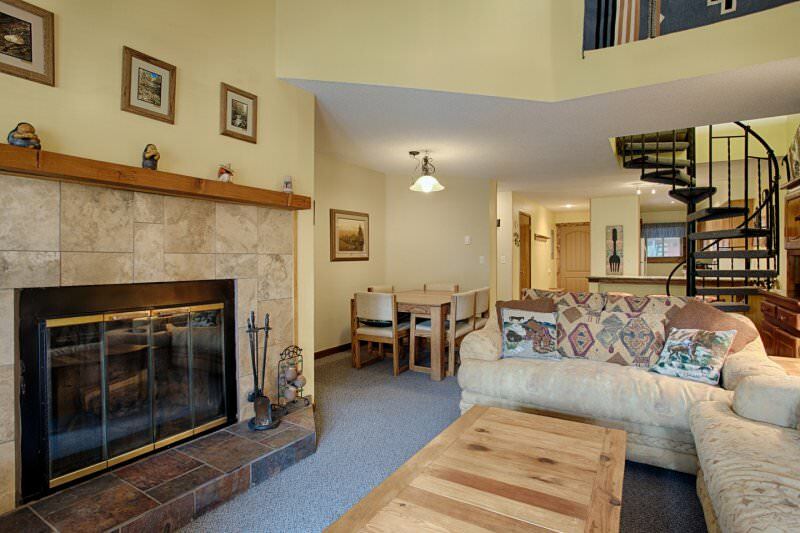 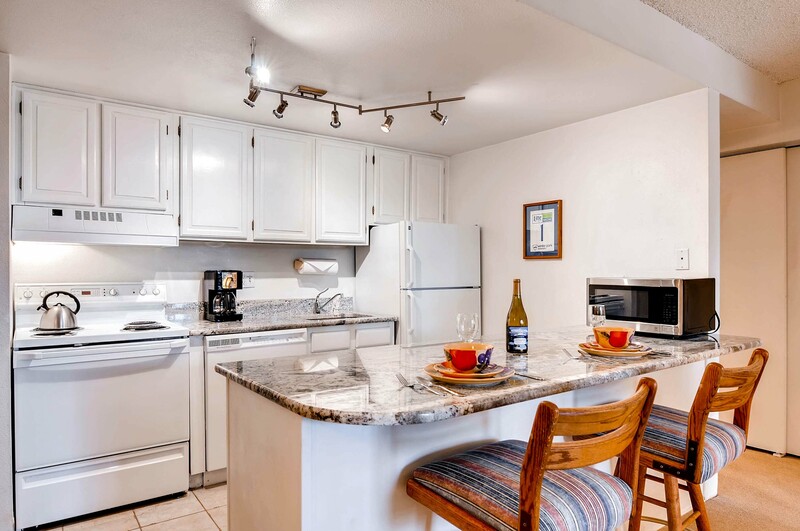 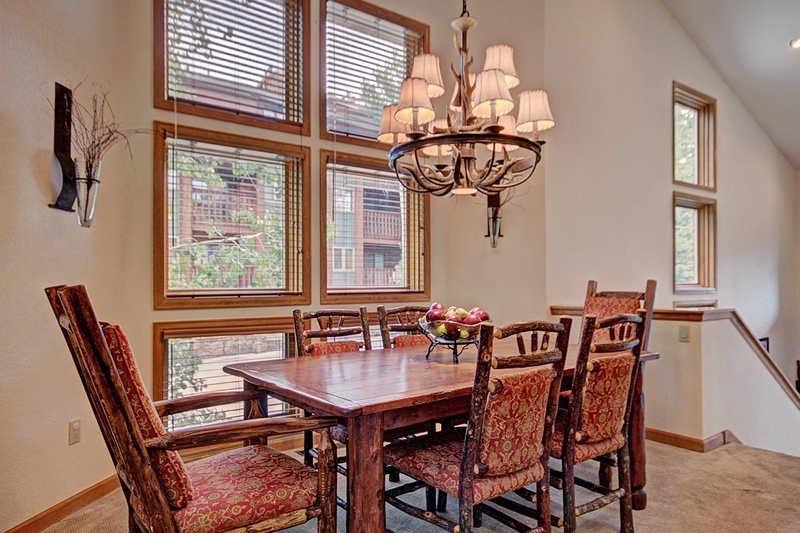 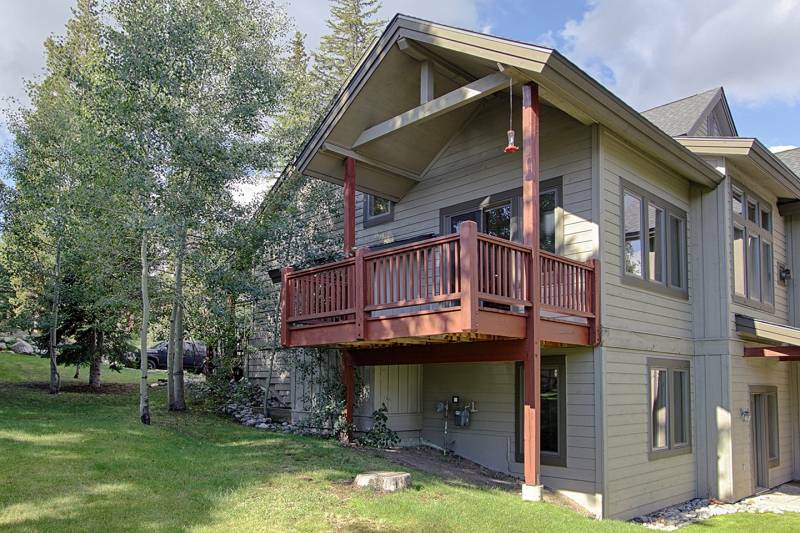 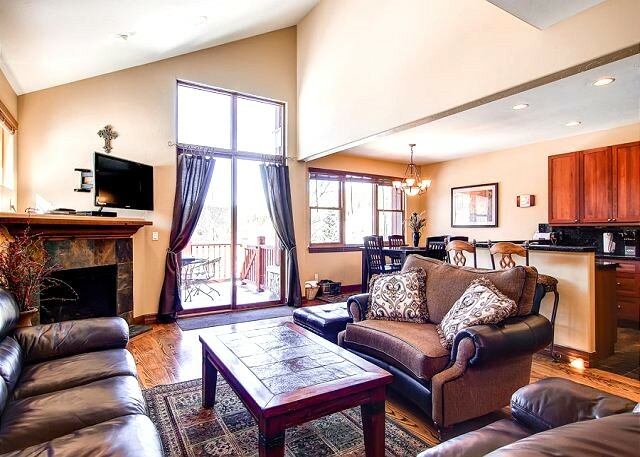 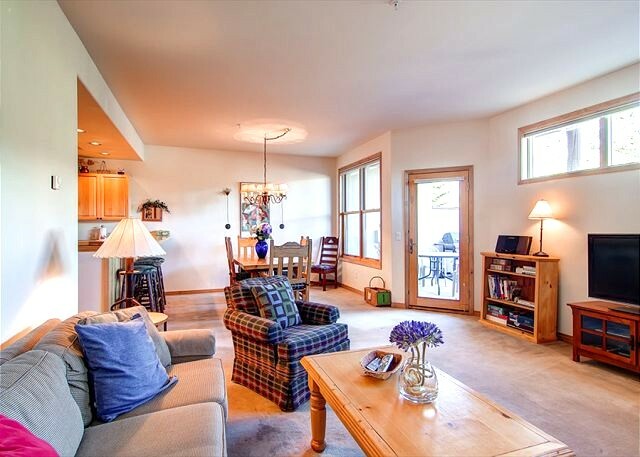 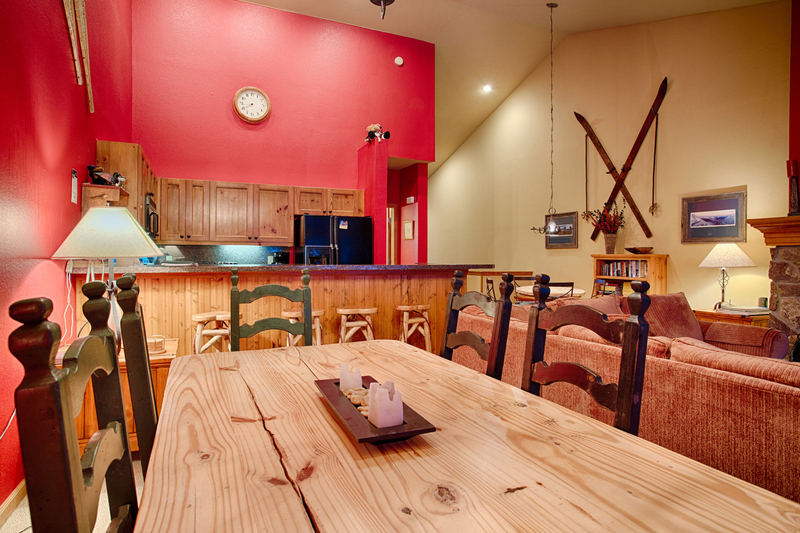 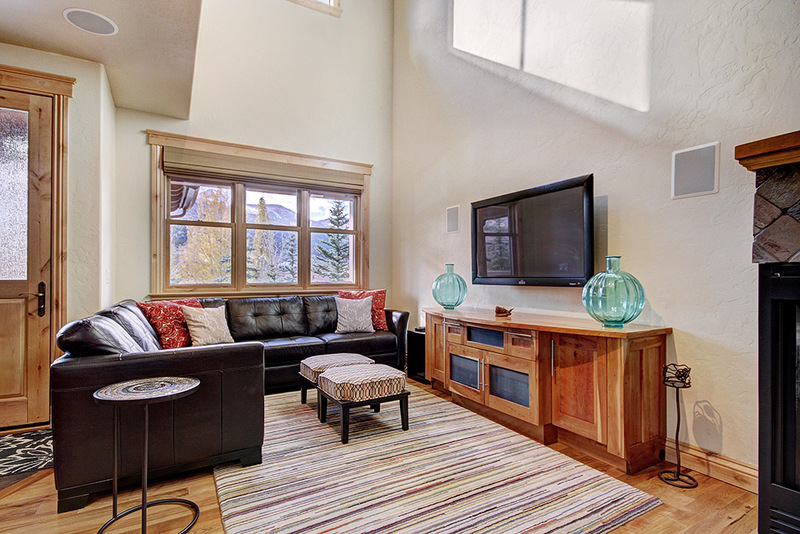 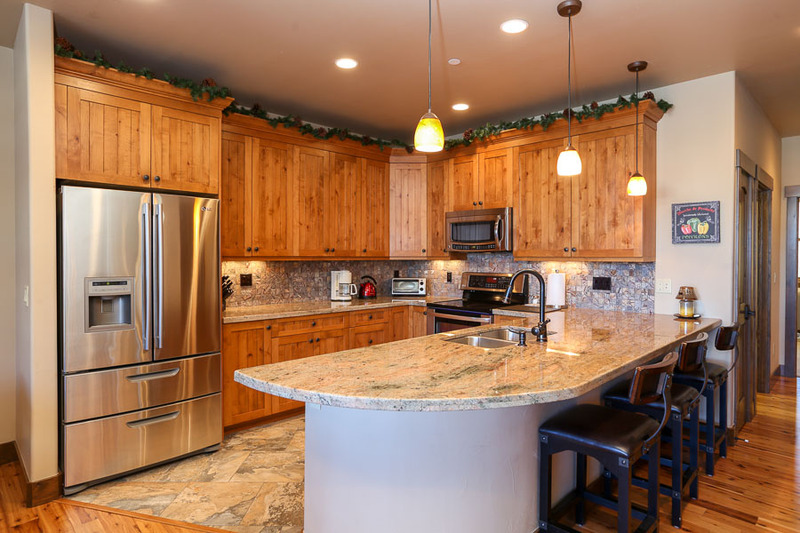 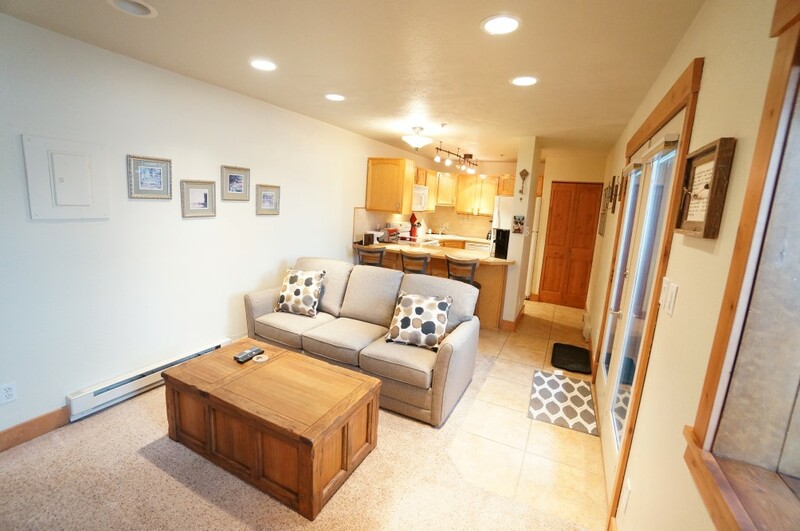 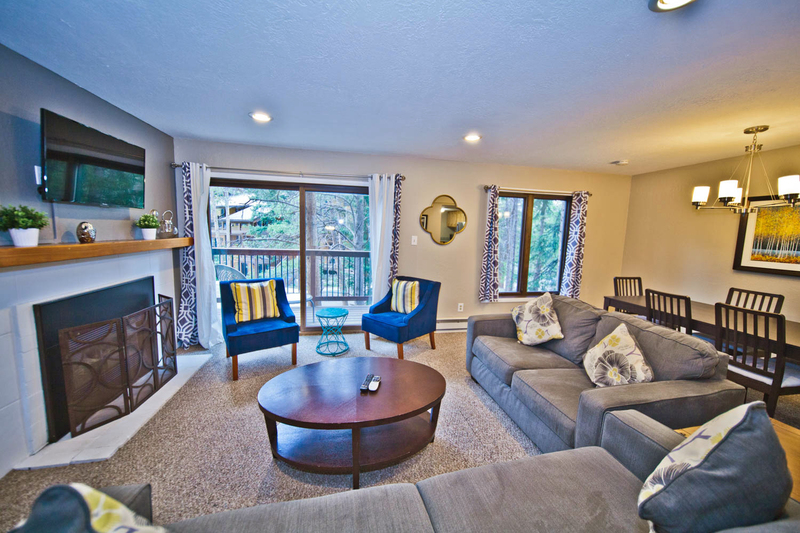 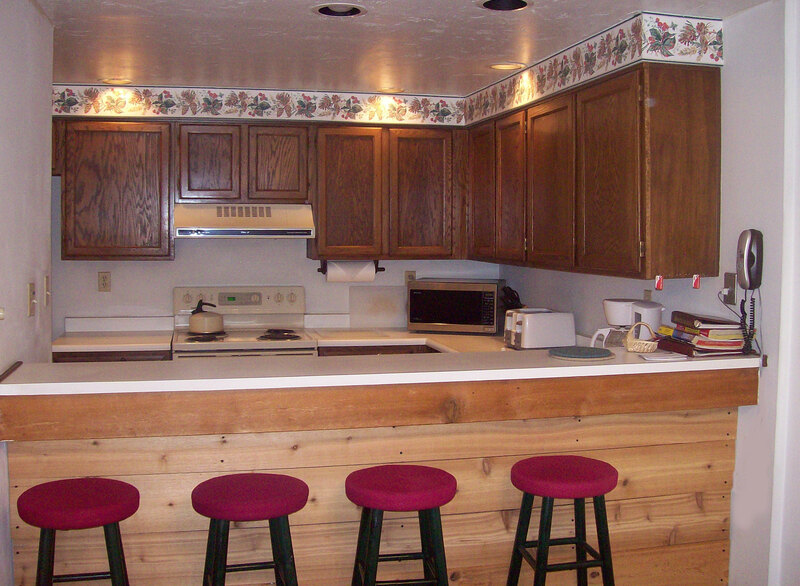 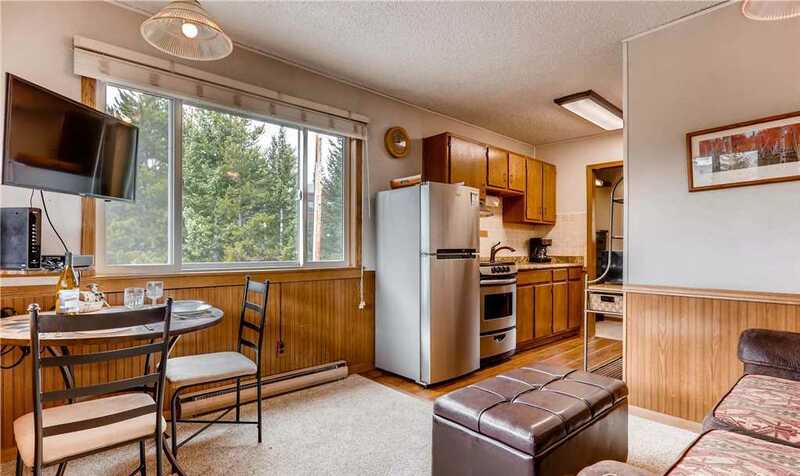 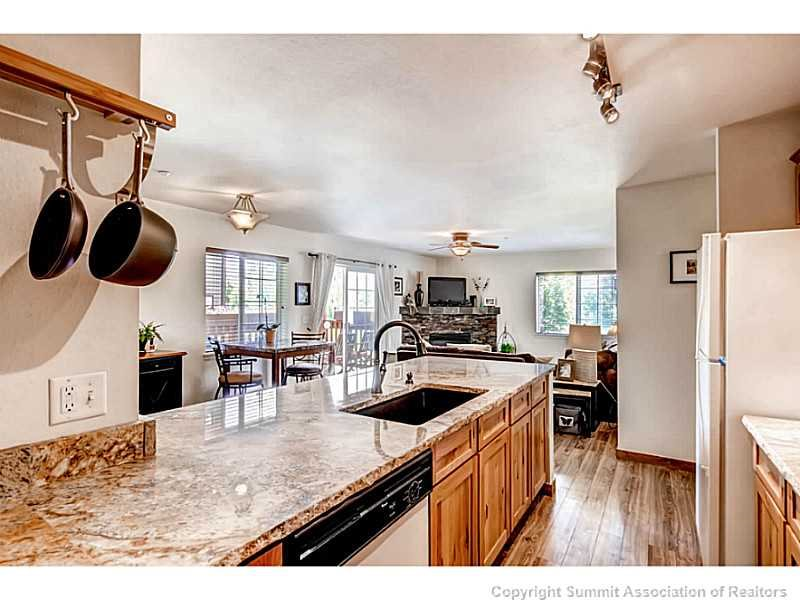 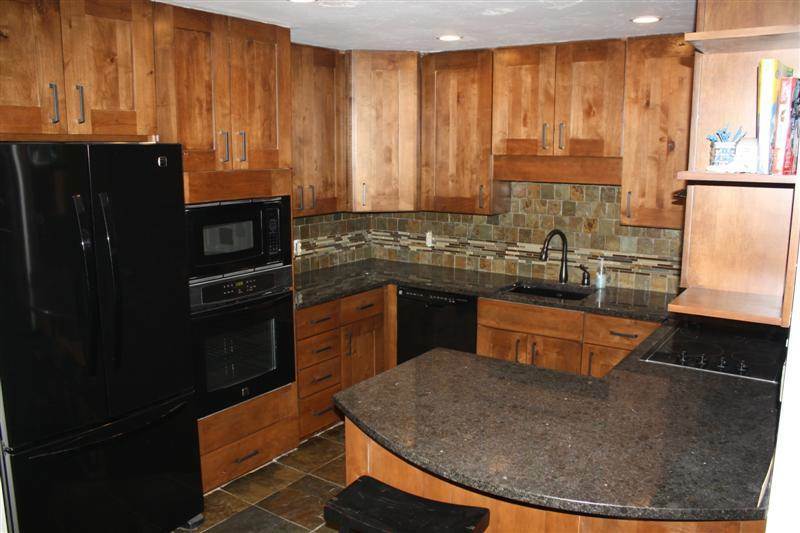 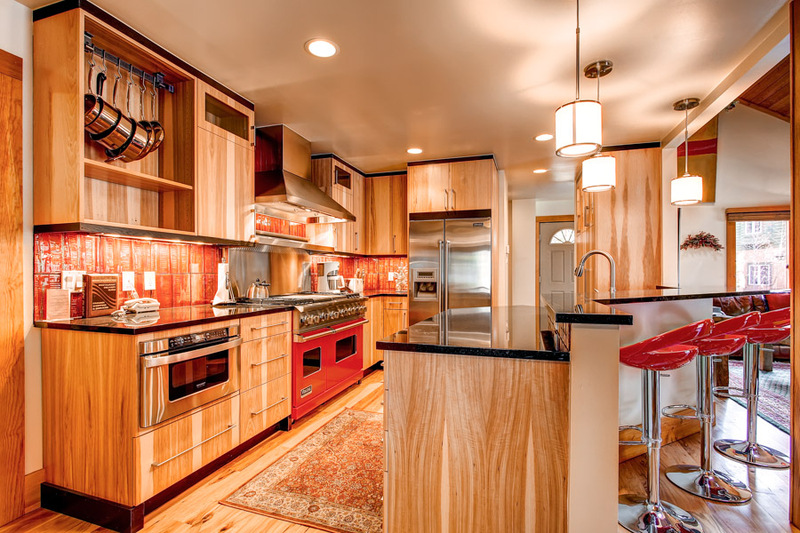 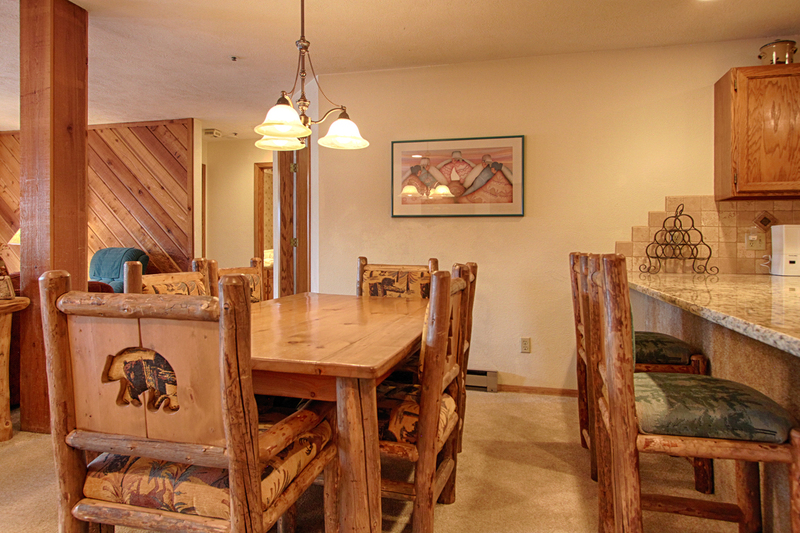 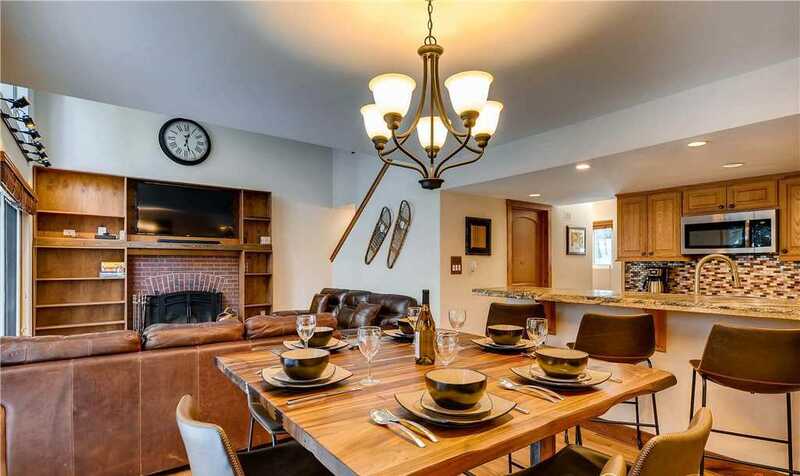 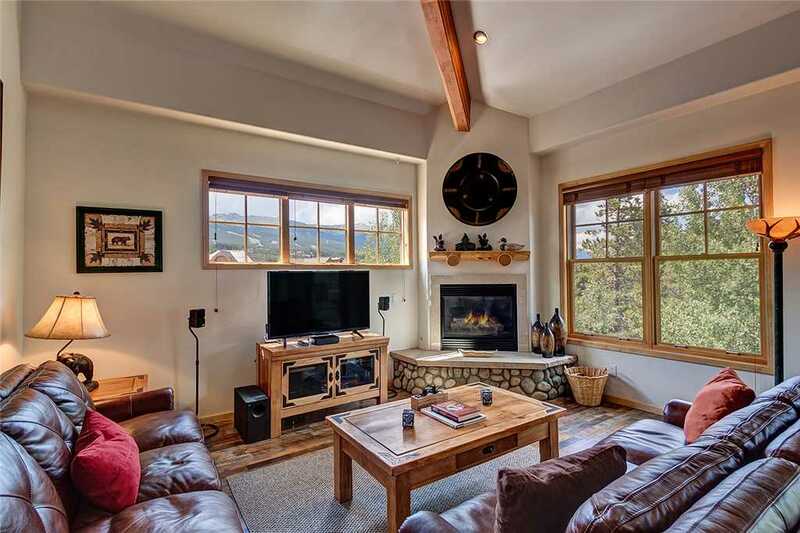 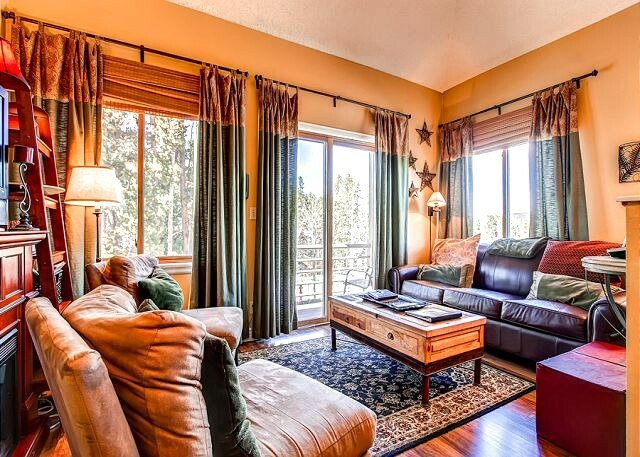 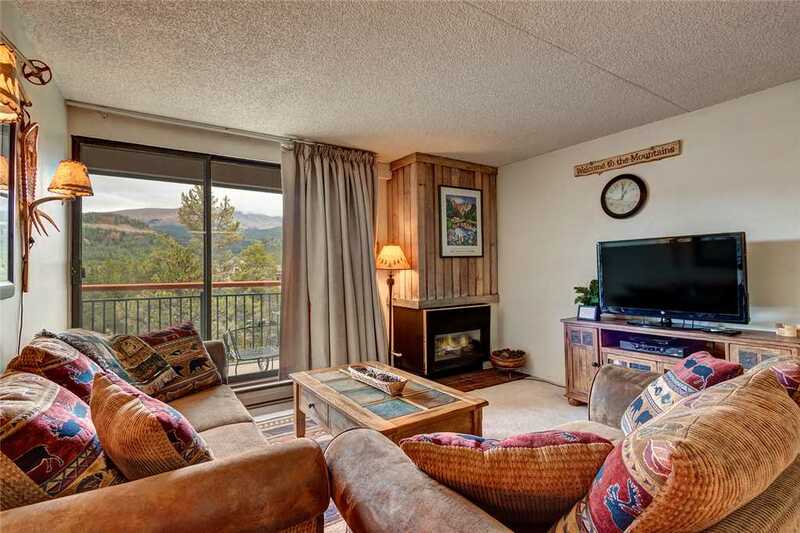 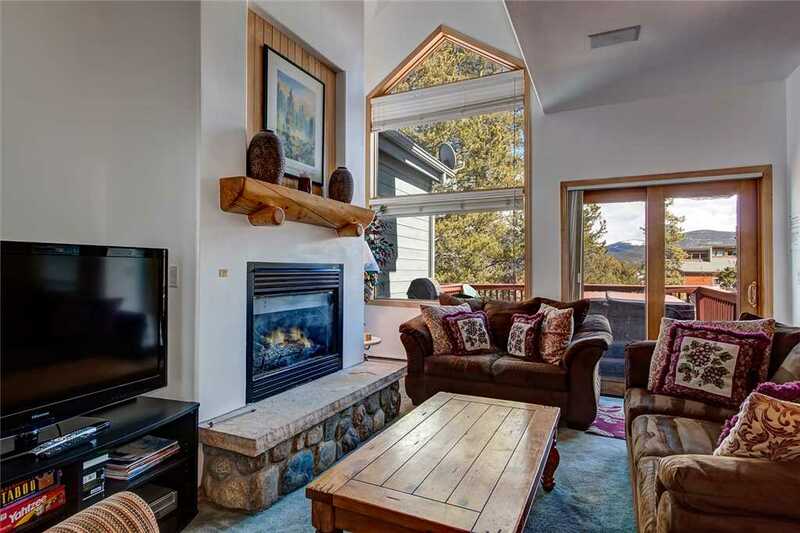 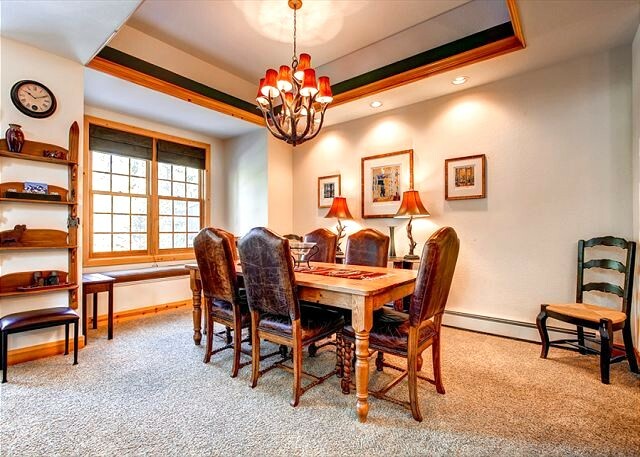 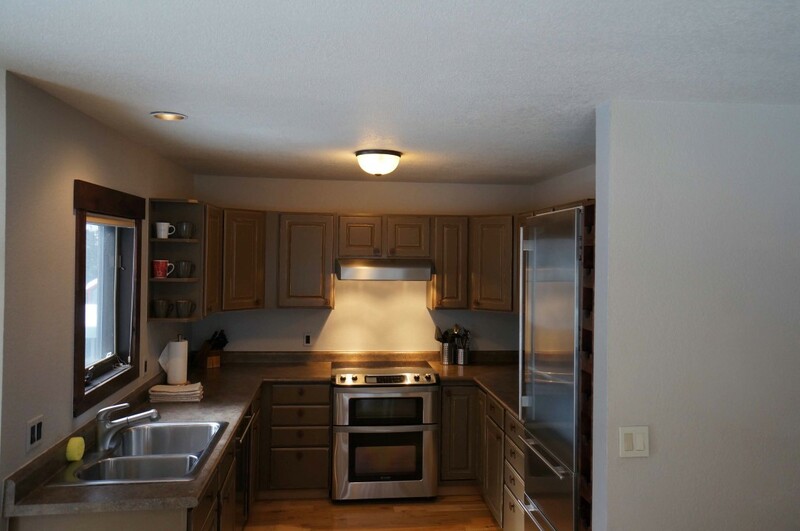 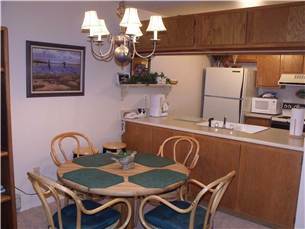 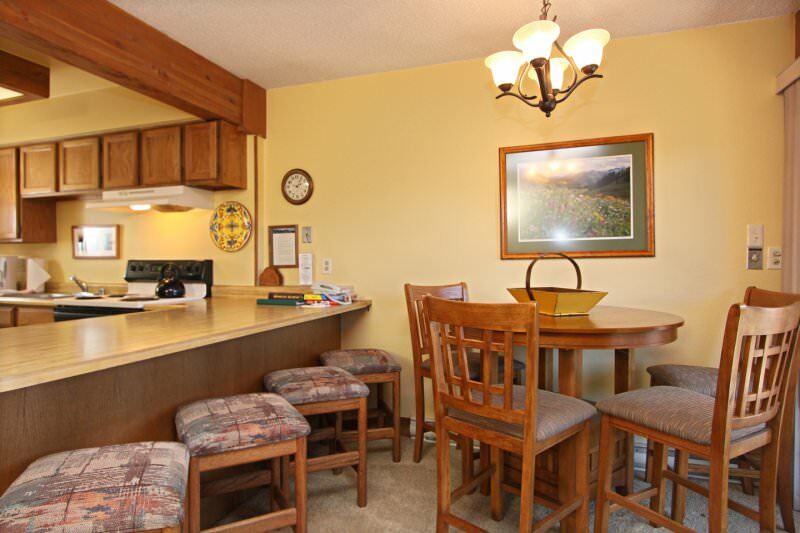 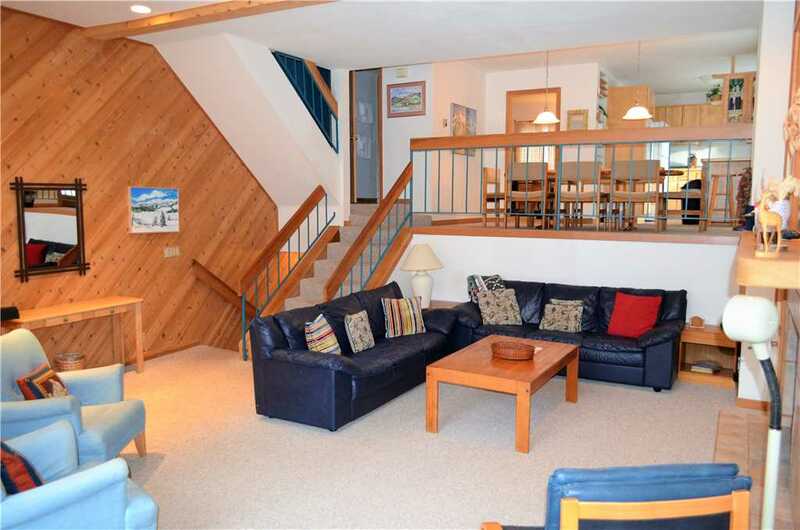 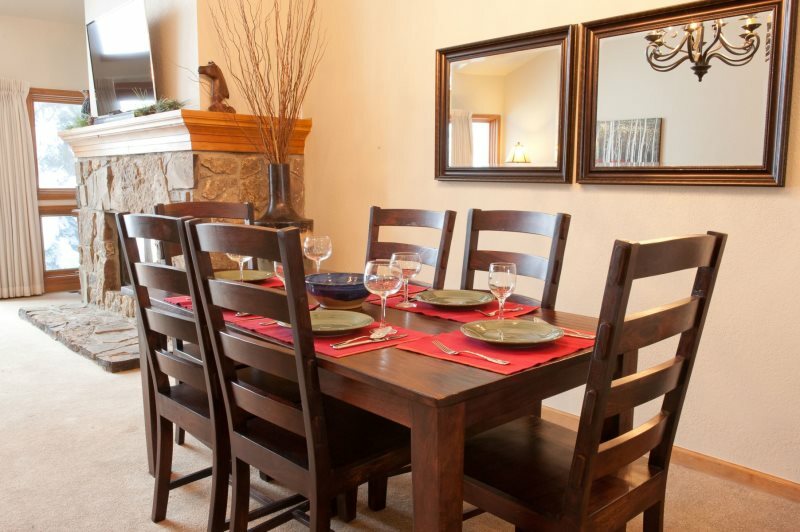 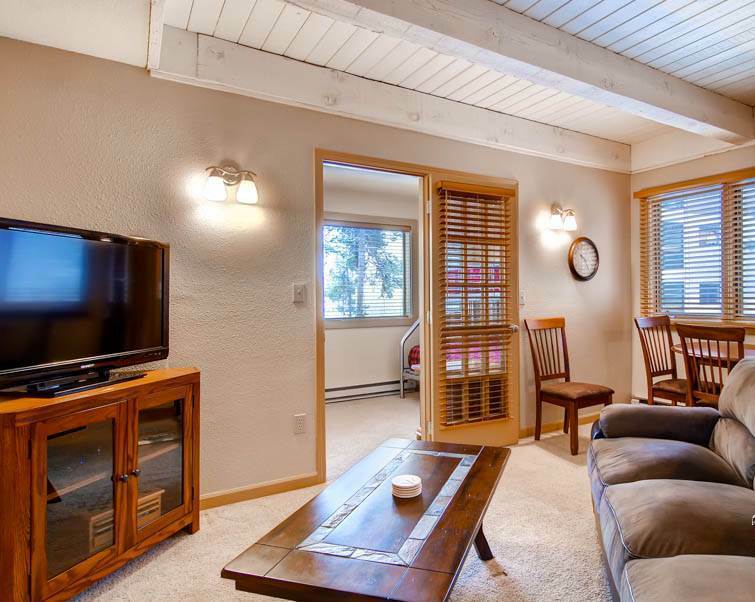 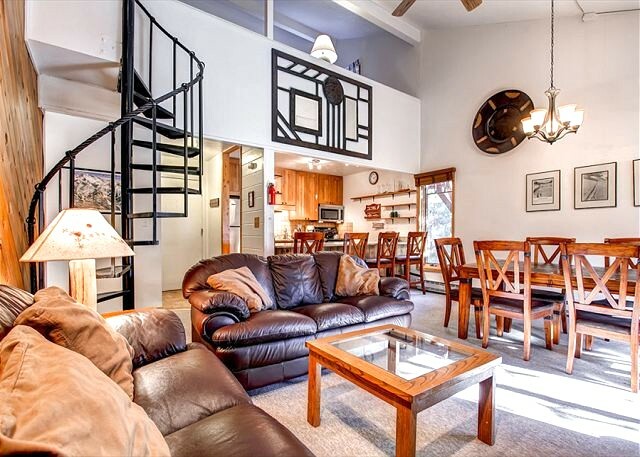 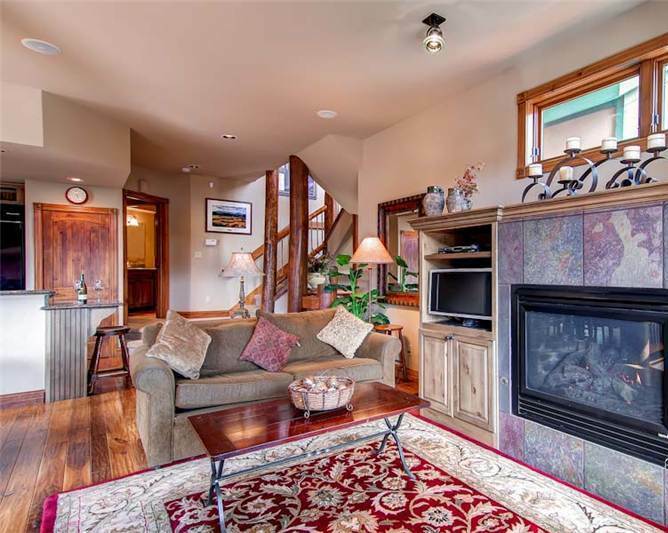 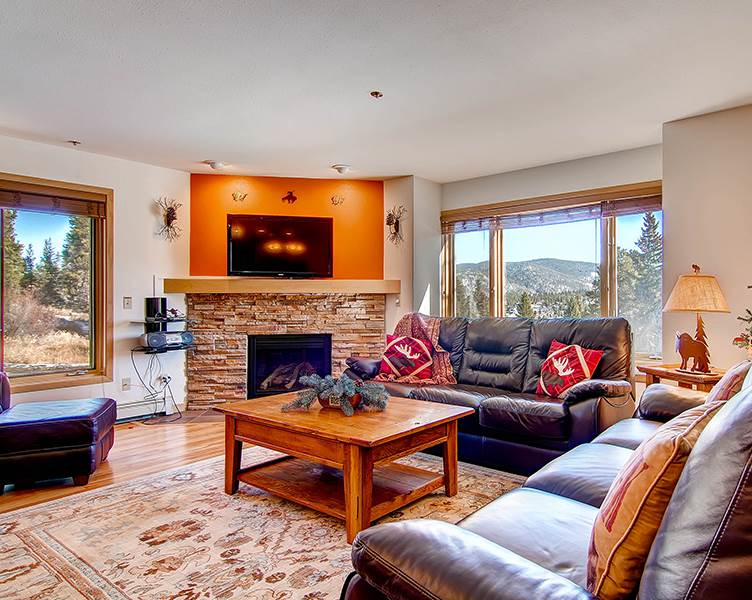 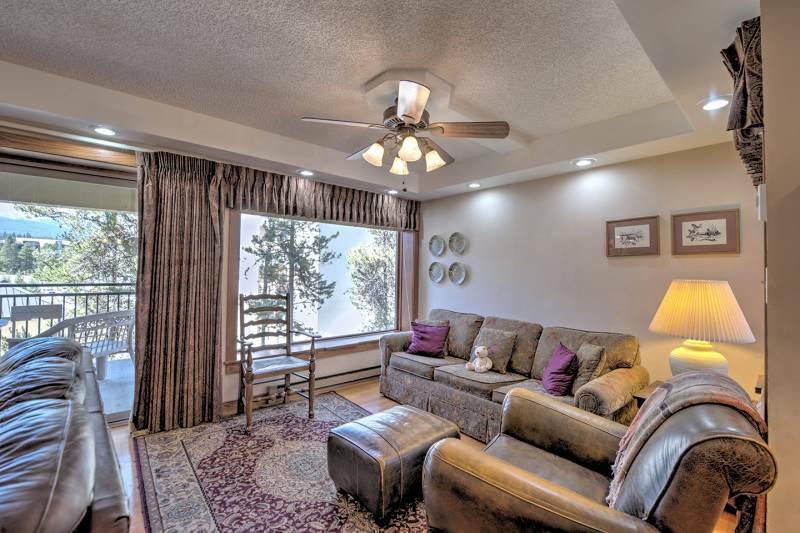 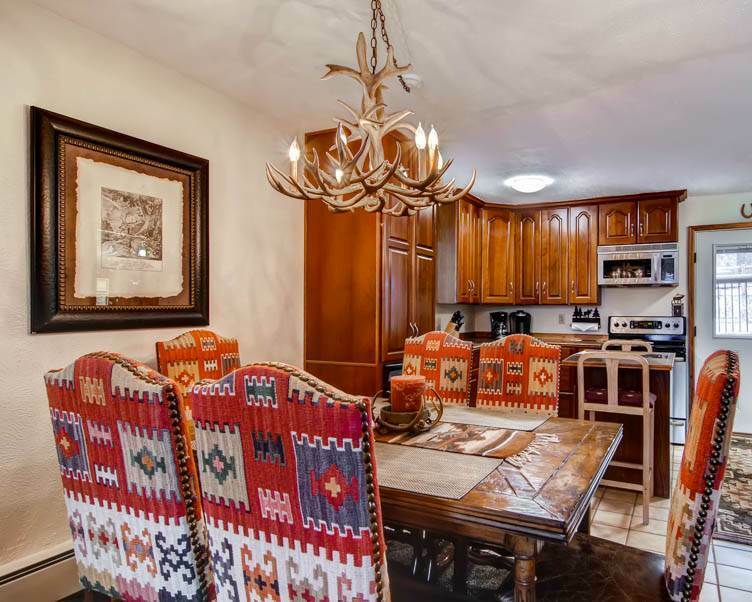 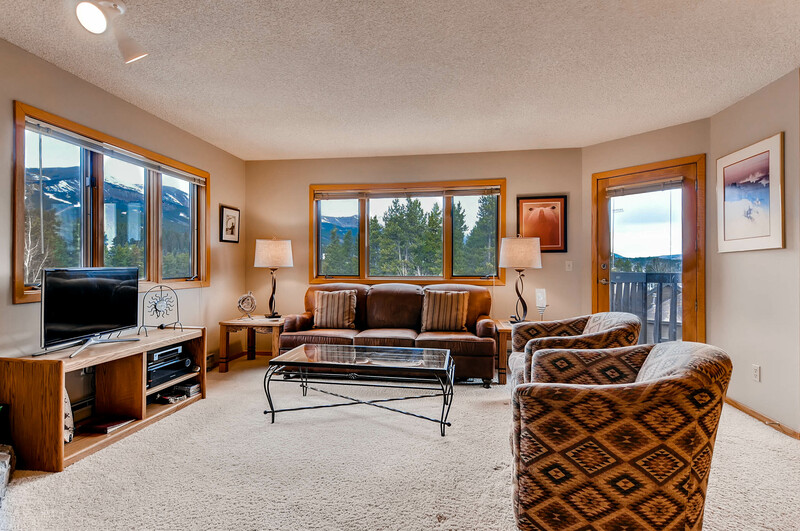 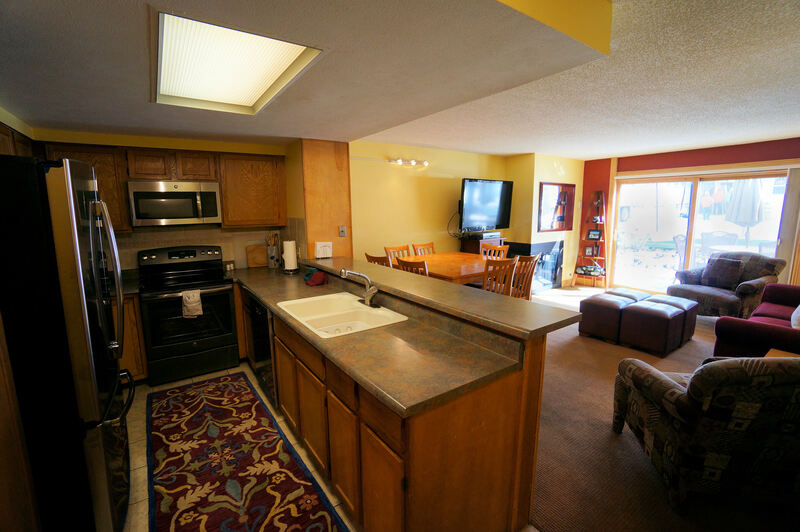 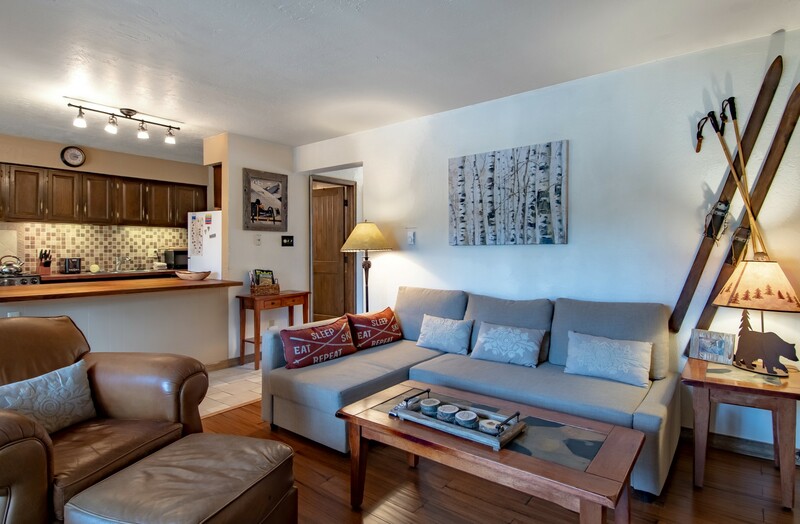 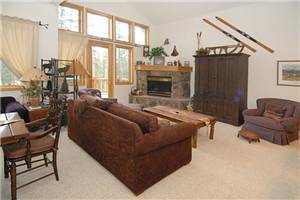 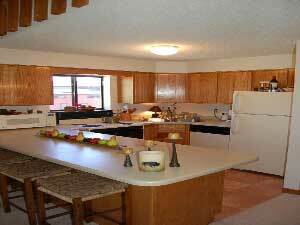 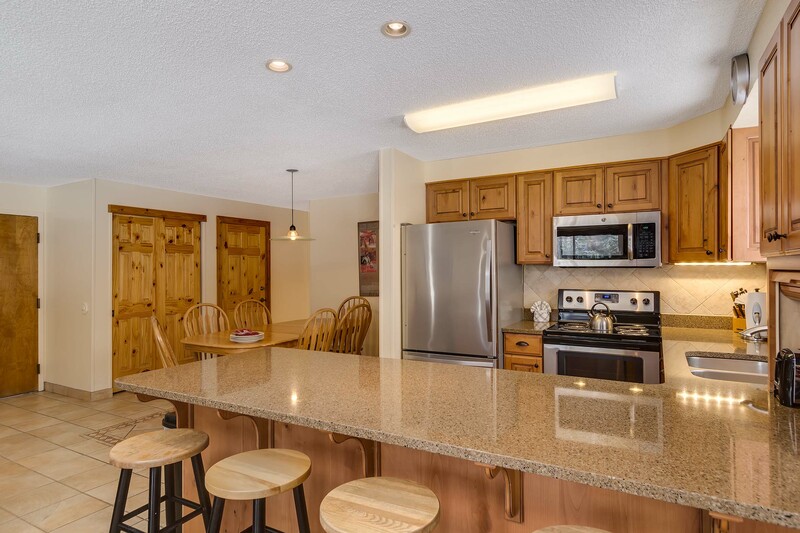 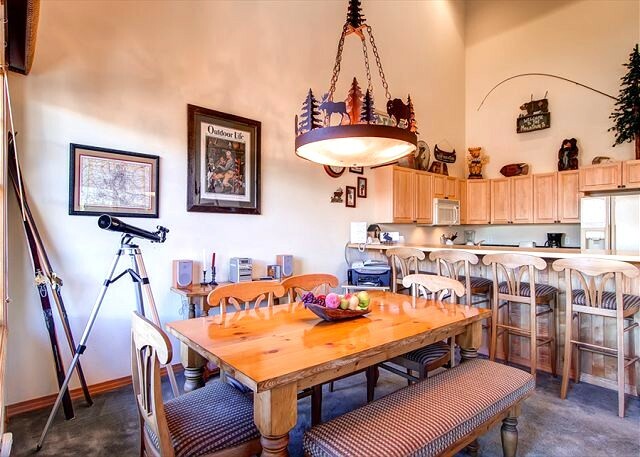 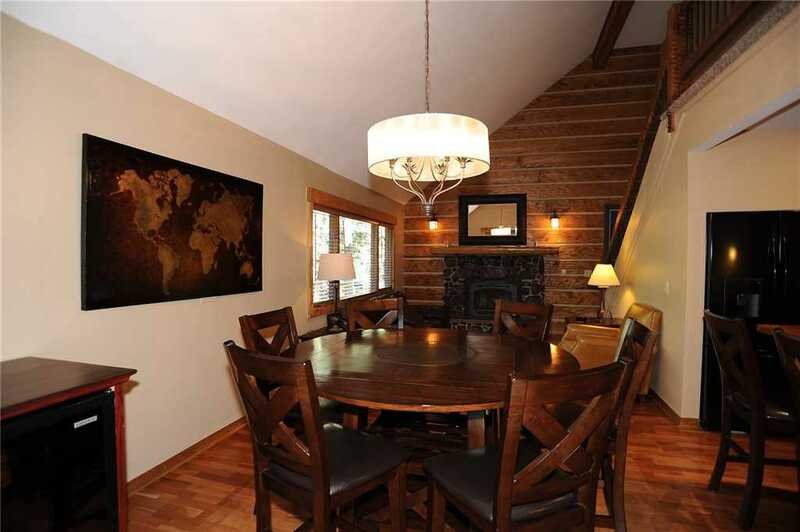 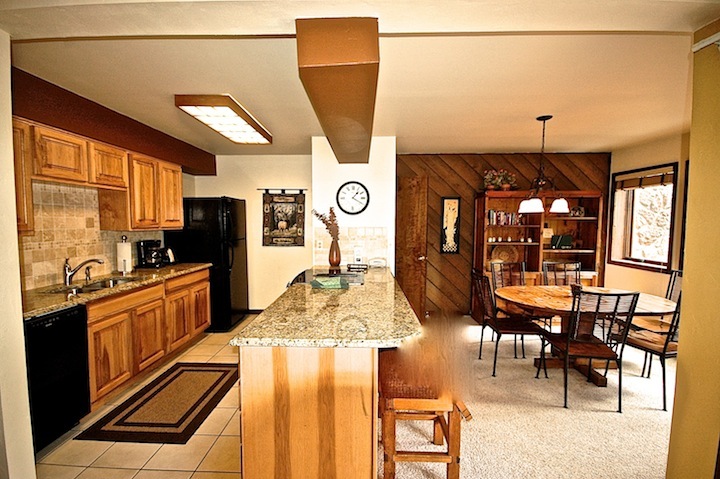 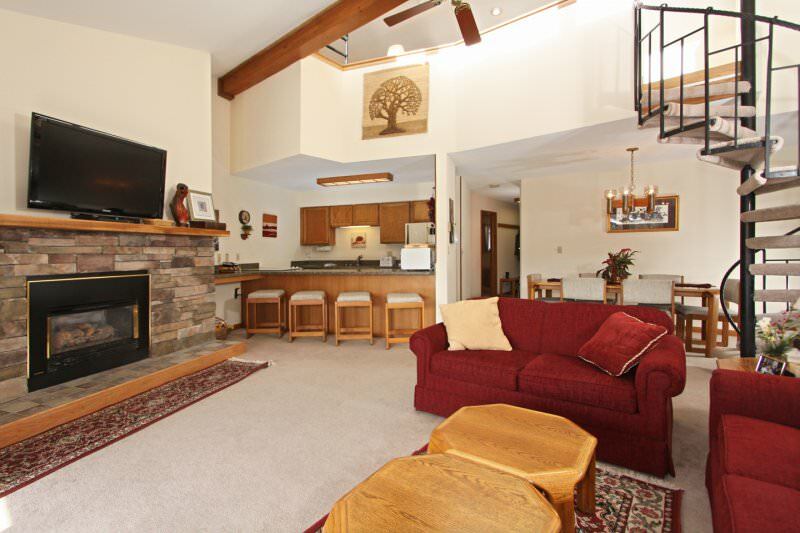 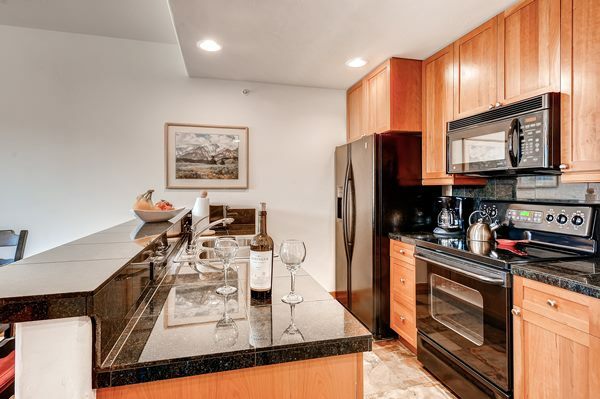 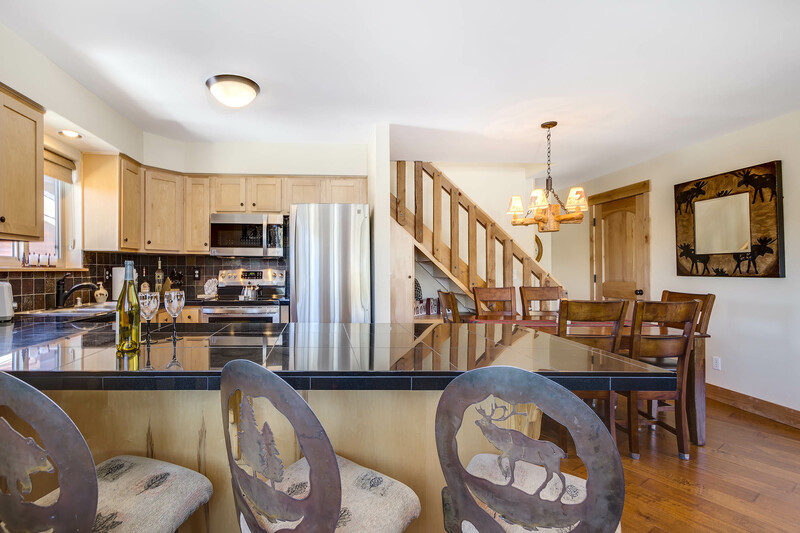 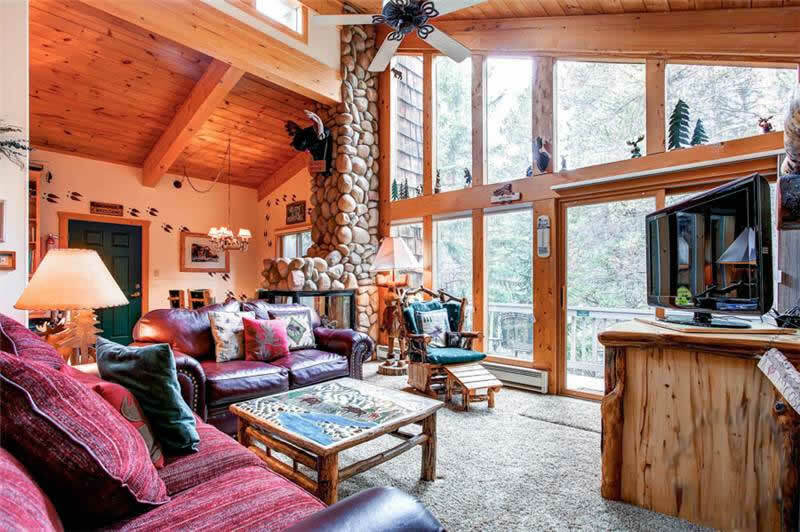 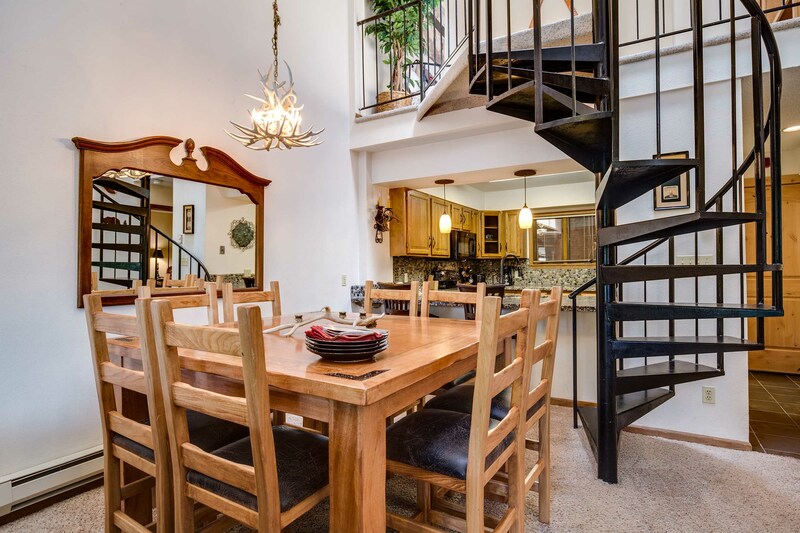 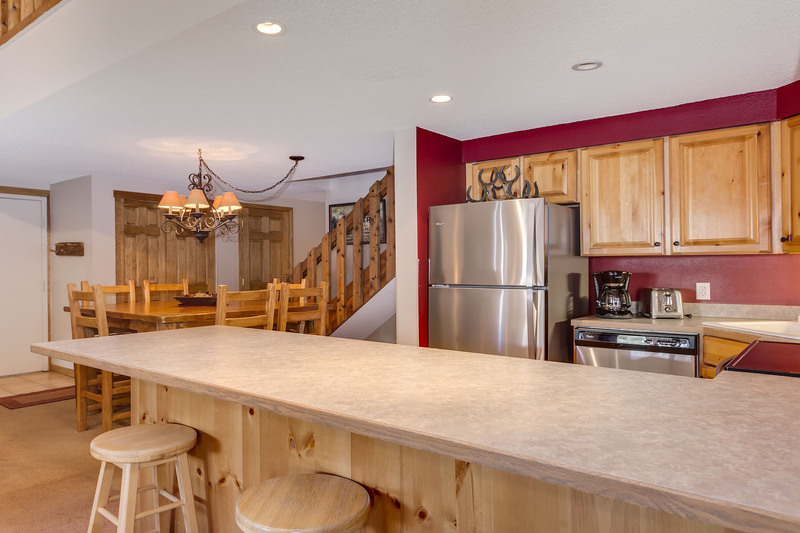 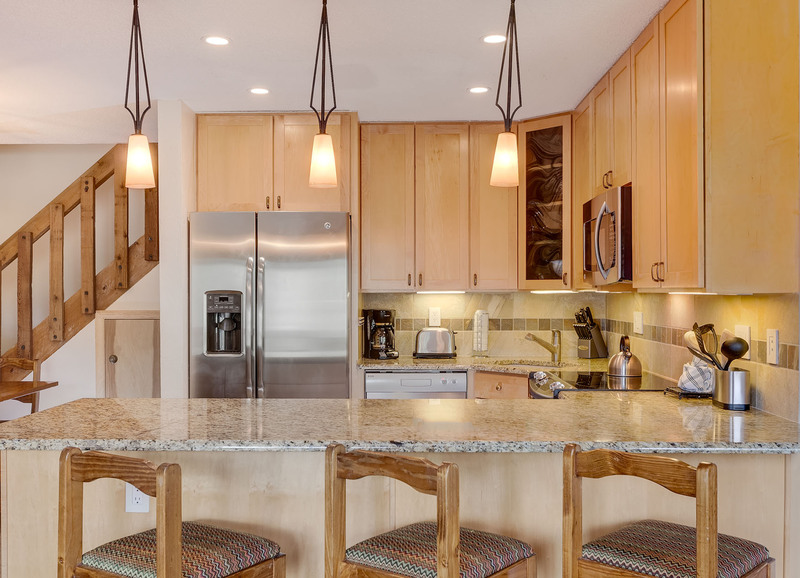 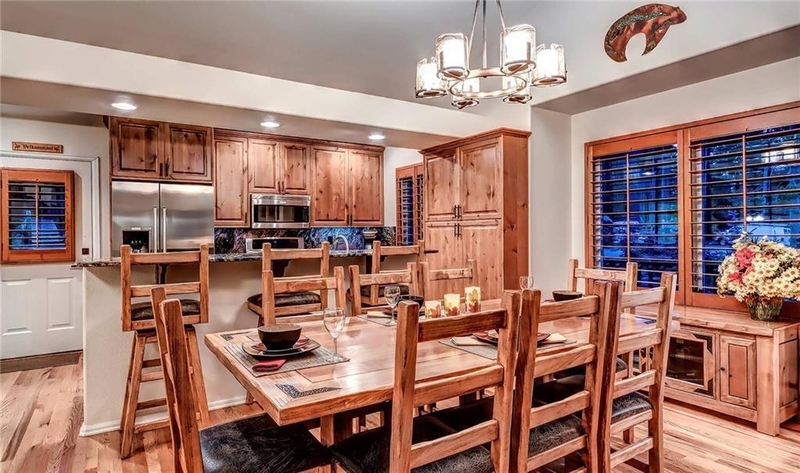 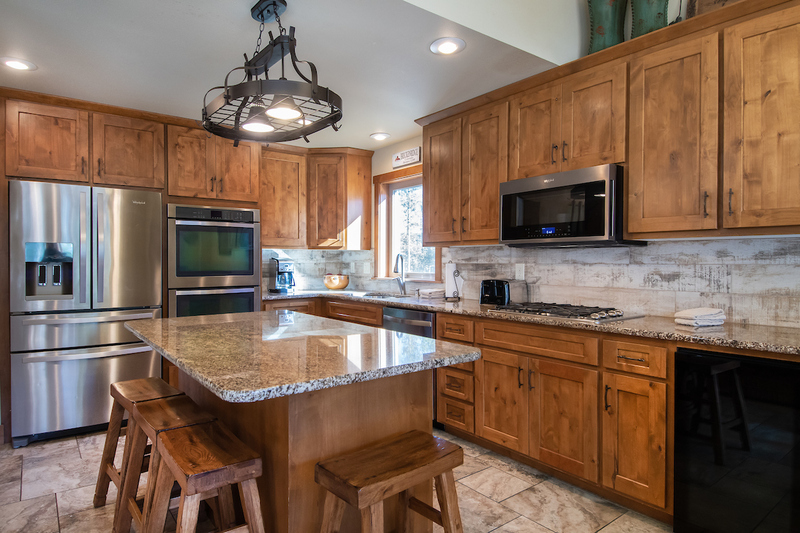 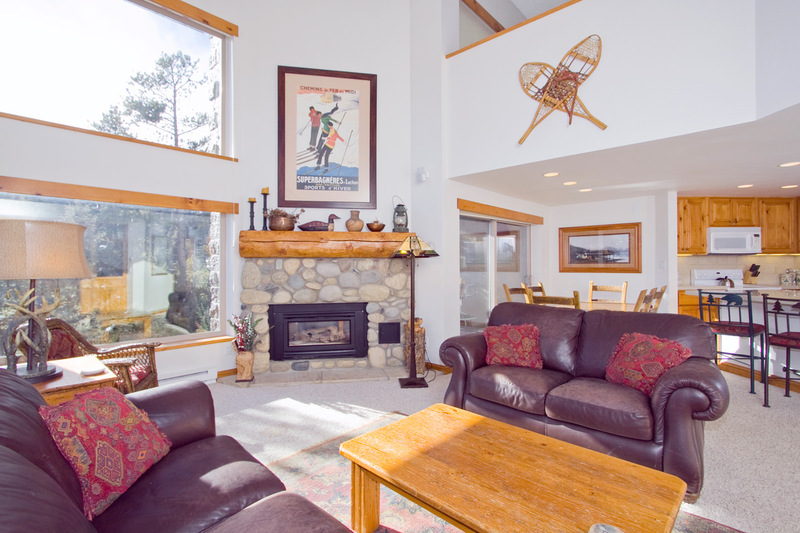 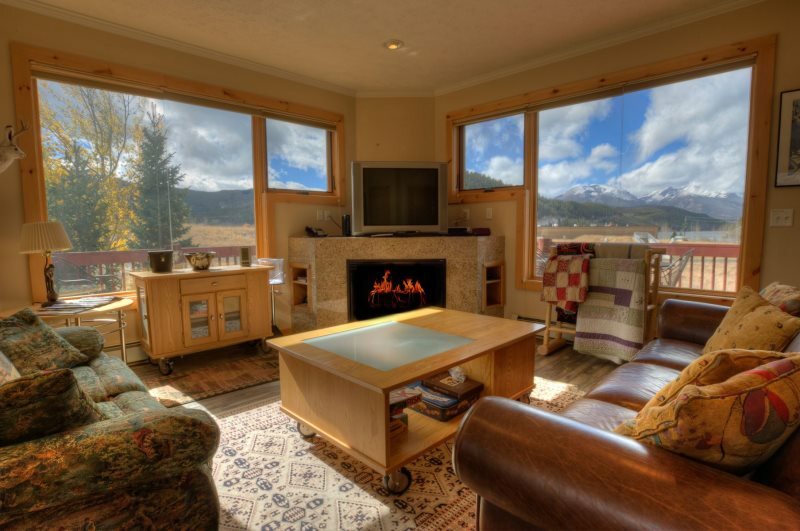 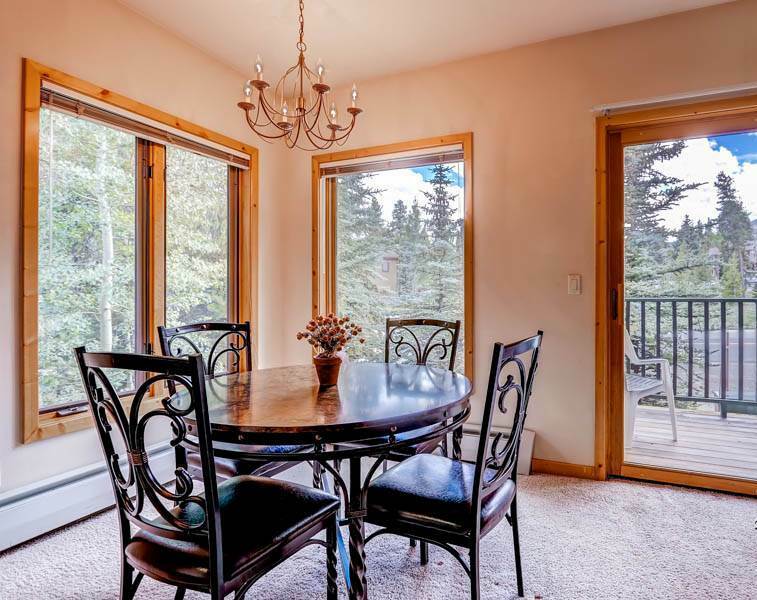 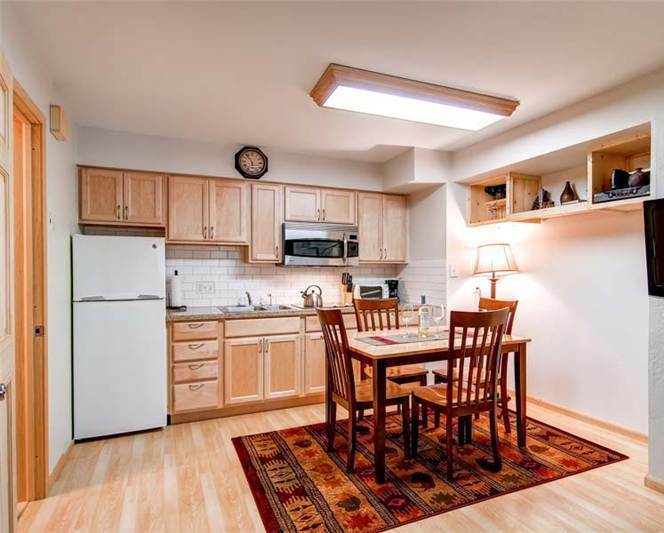 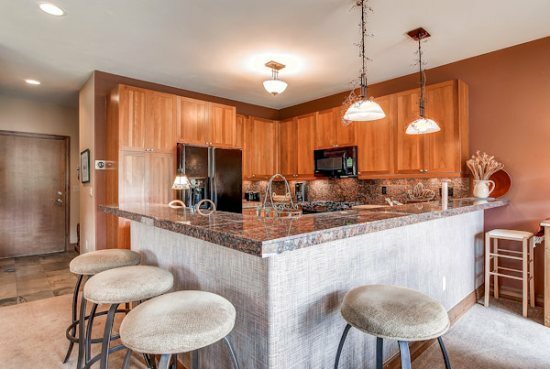 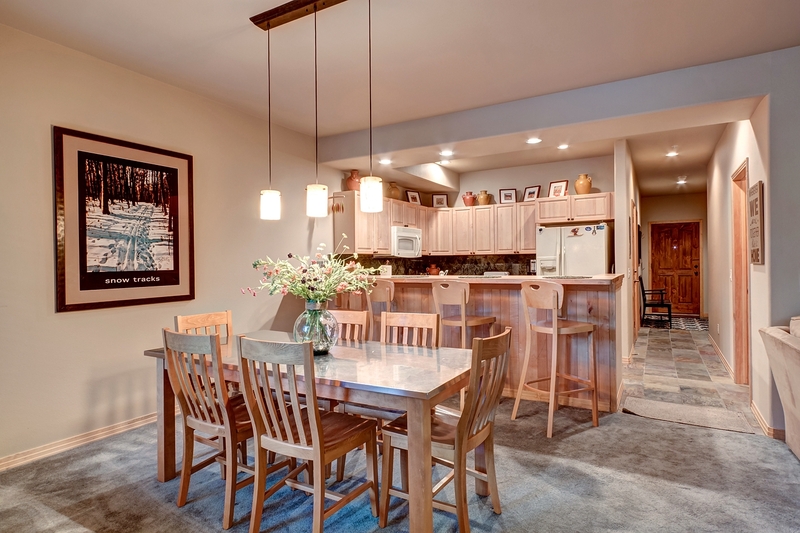 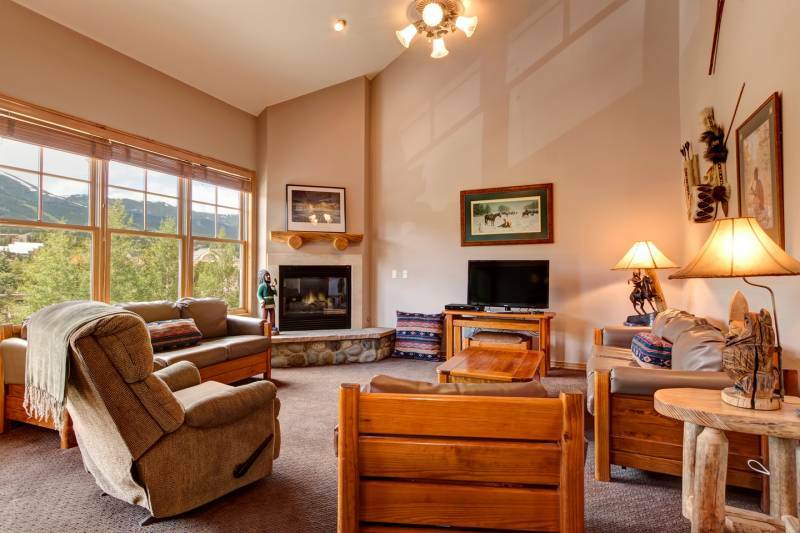 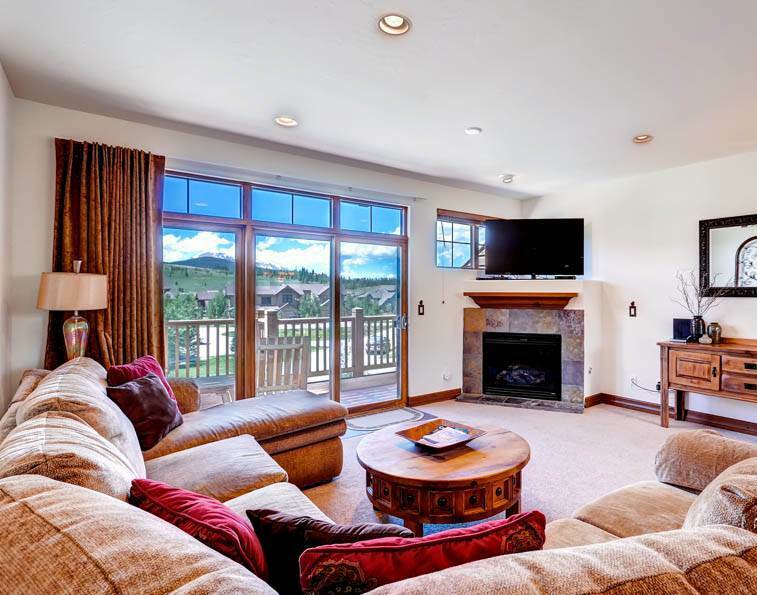 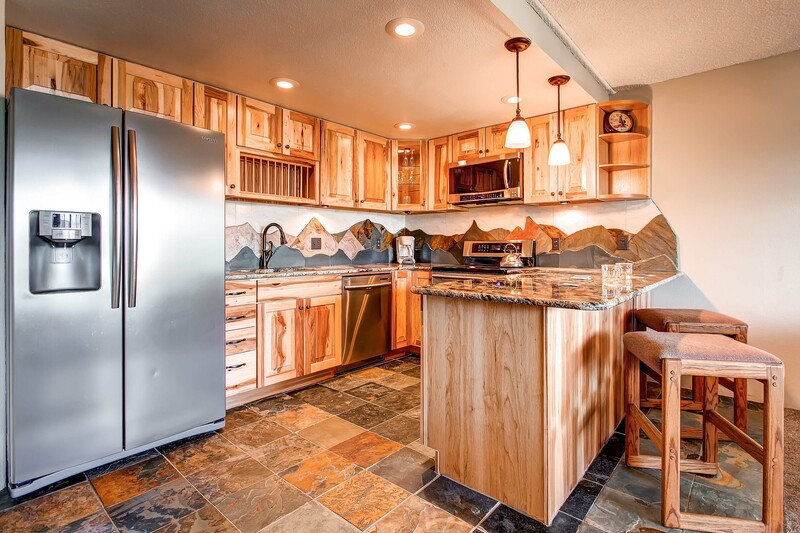 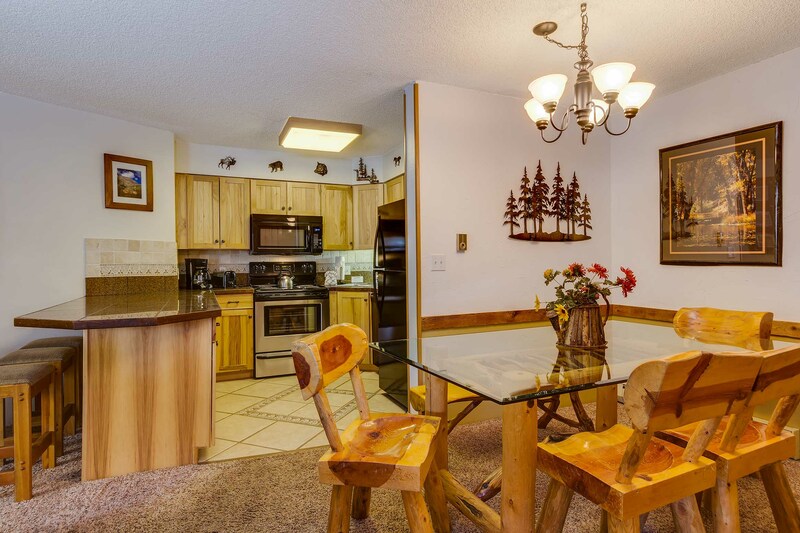 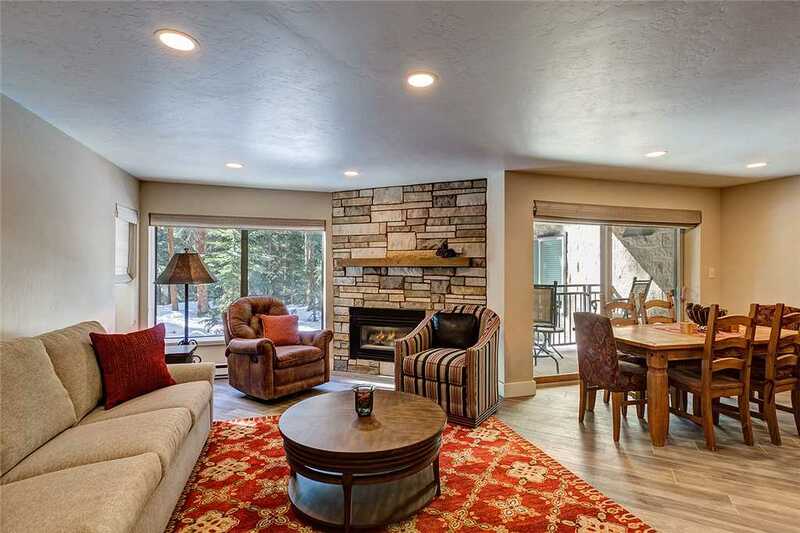 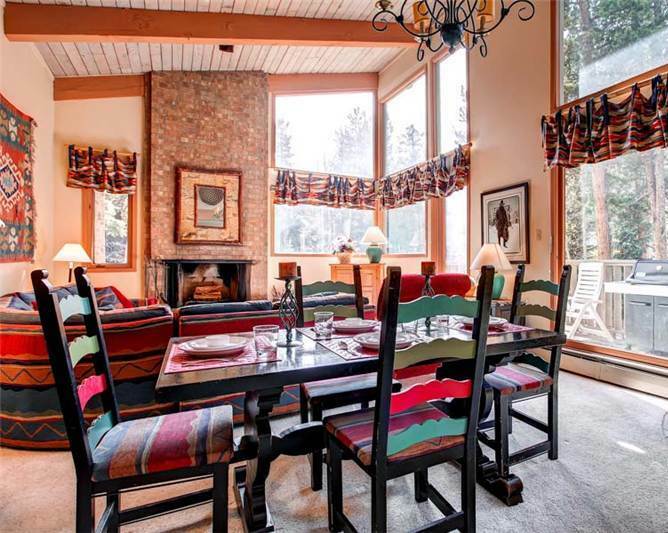 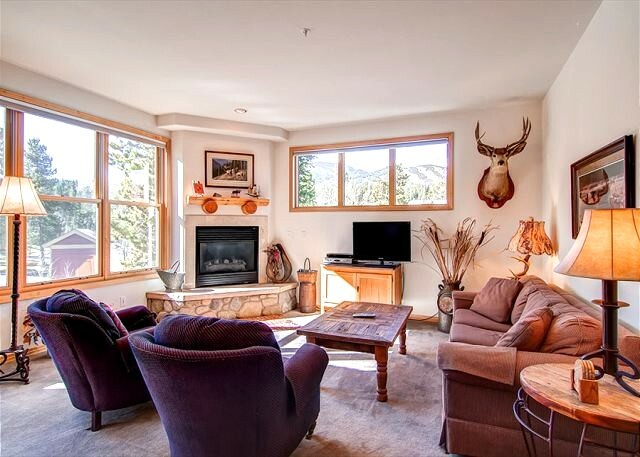 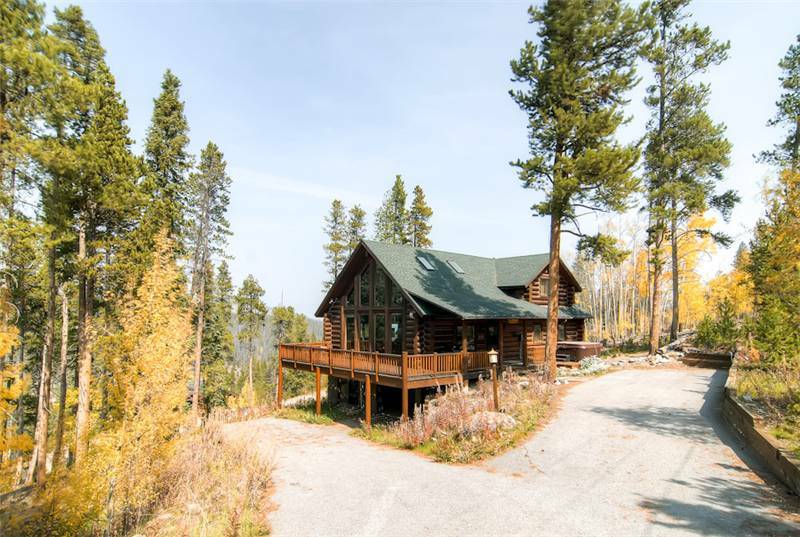 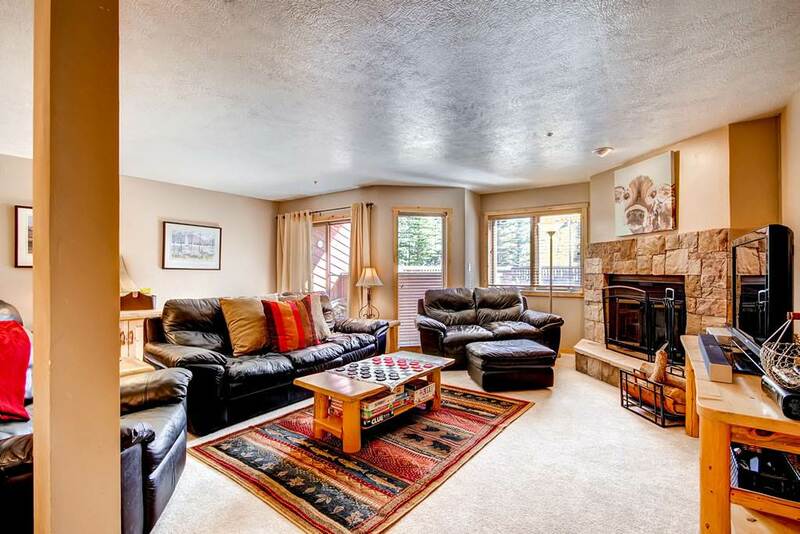 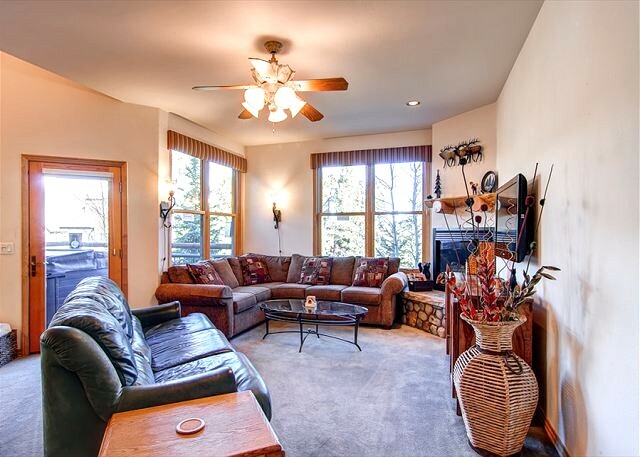 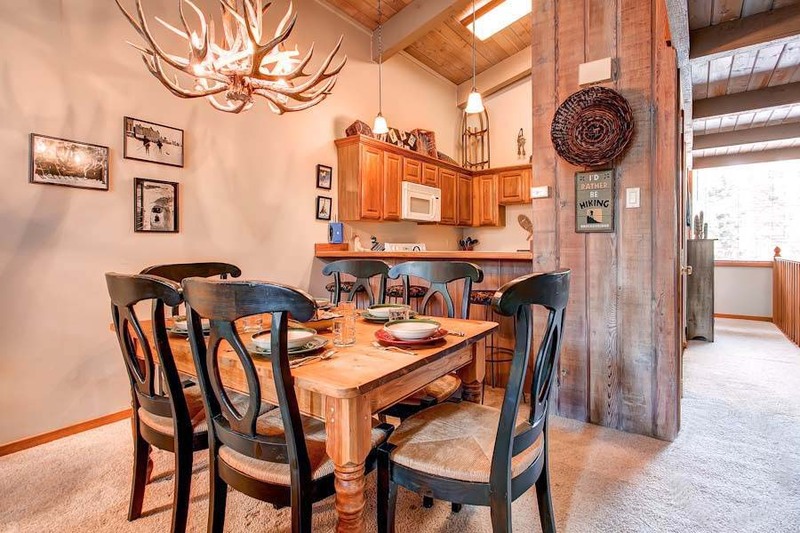 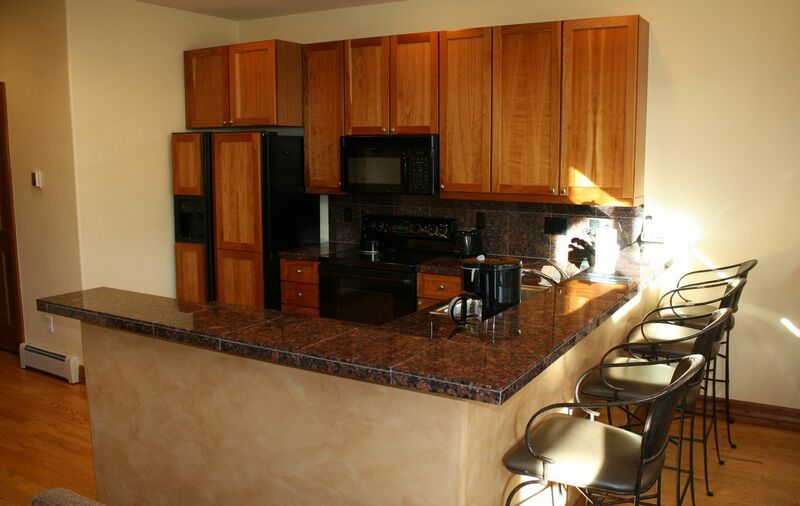 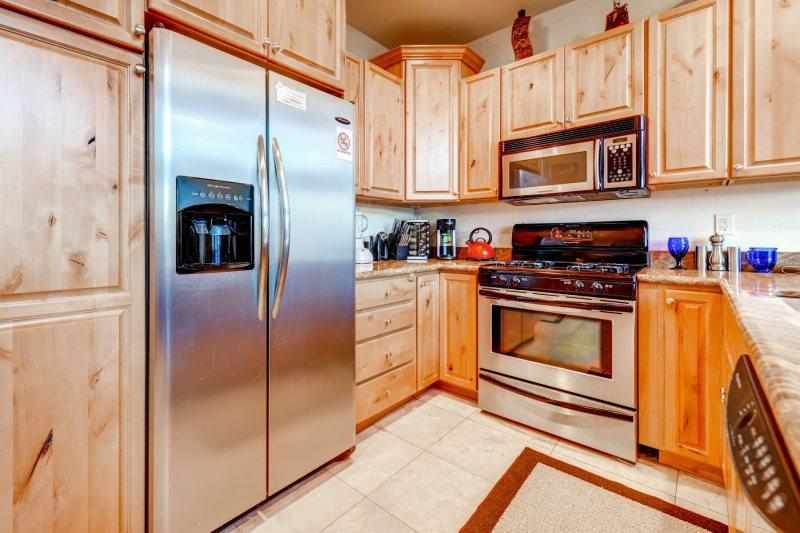 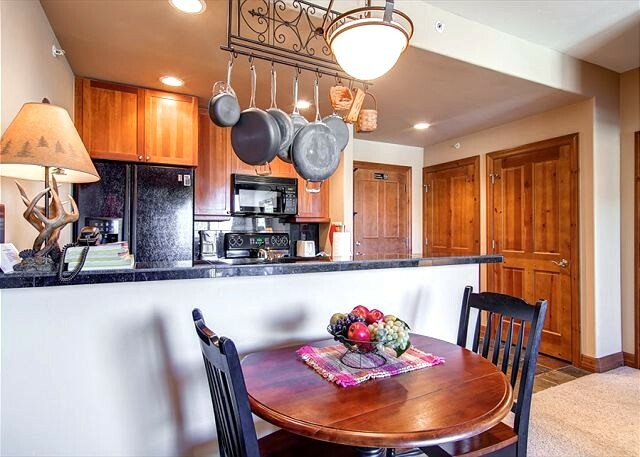 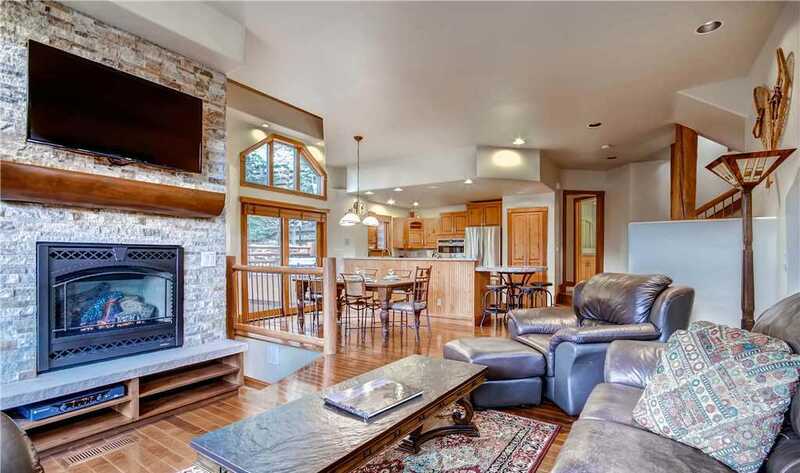 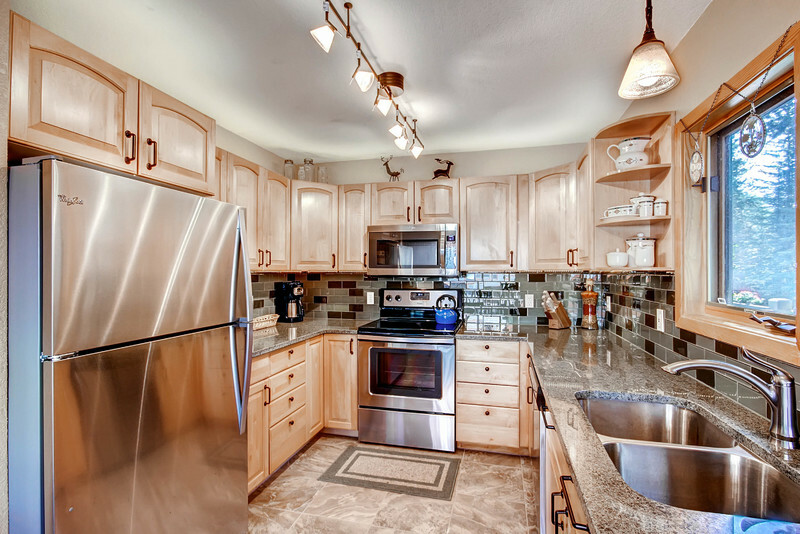 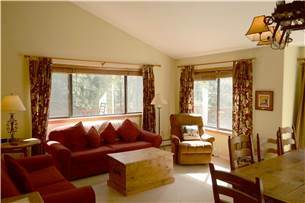 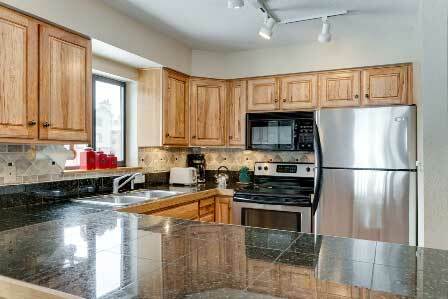 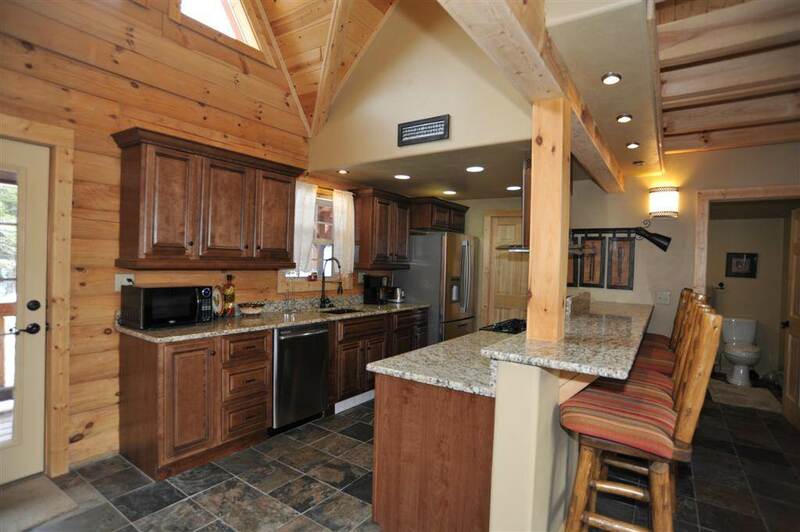 Off the kitchen, the deck has a gas grill and offers spectacular views of the Tenmile Range. 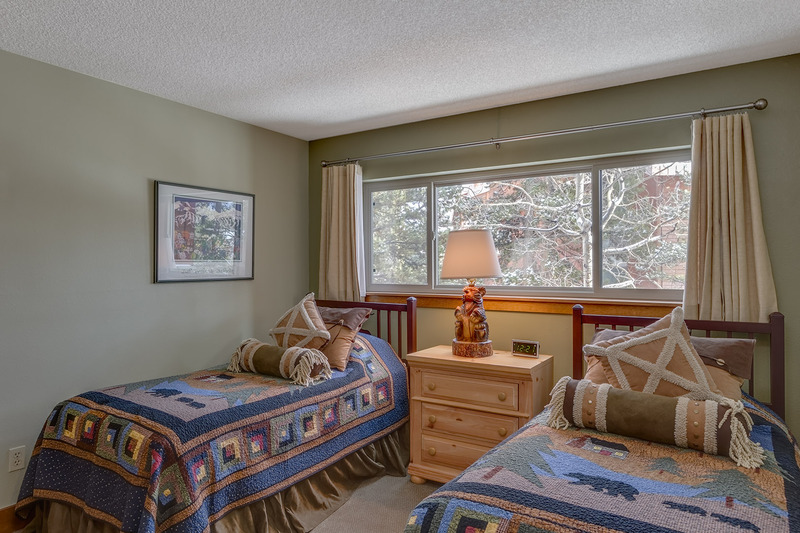 There are two king bedroom suites — a great feature for two families — and with three more bedrooms plus a den, lots of other sleeping options. 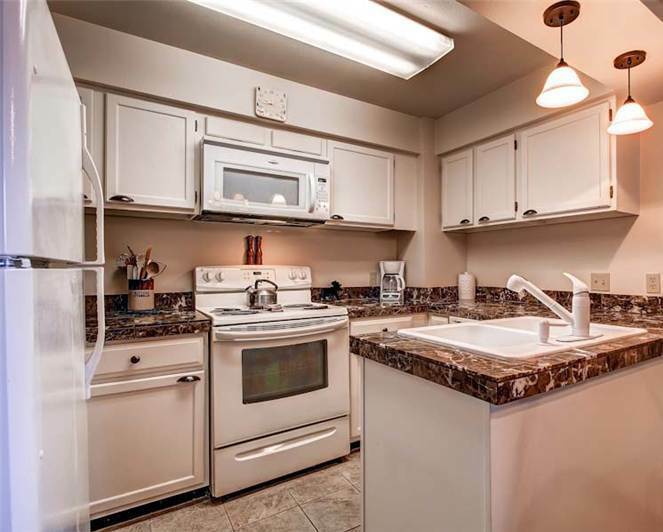 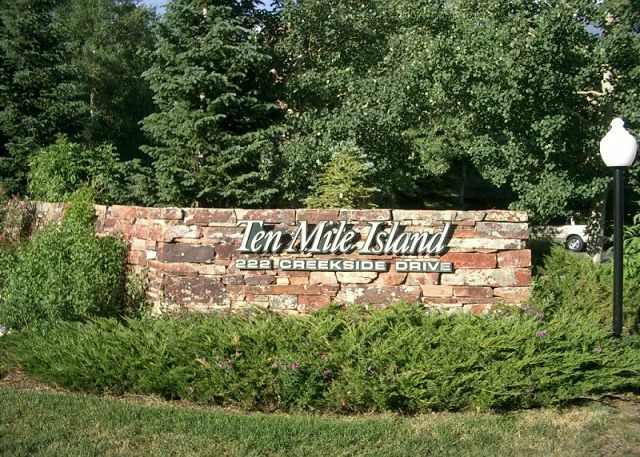 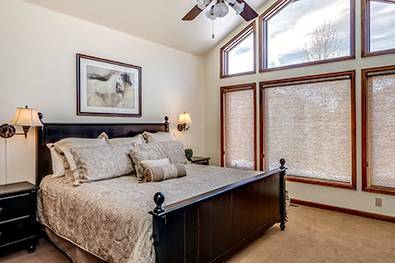 Additional amenities include a one-car garage (with extra parking in the large driveway) complimentary Wi-Fi, and a washer and dryer. 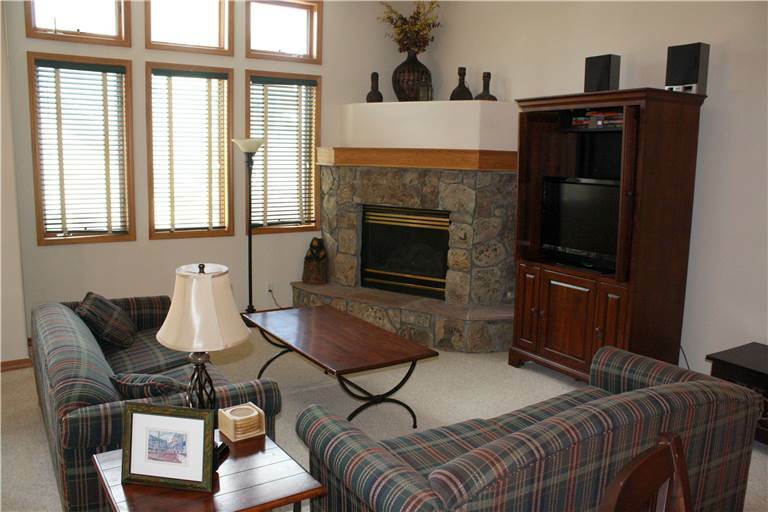 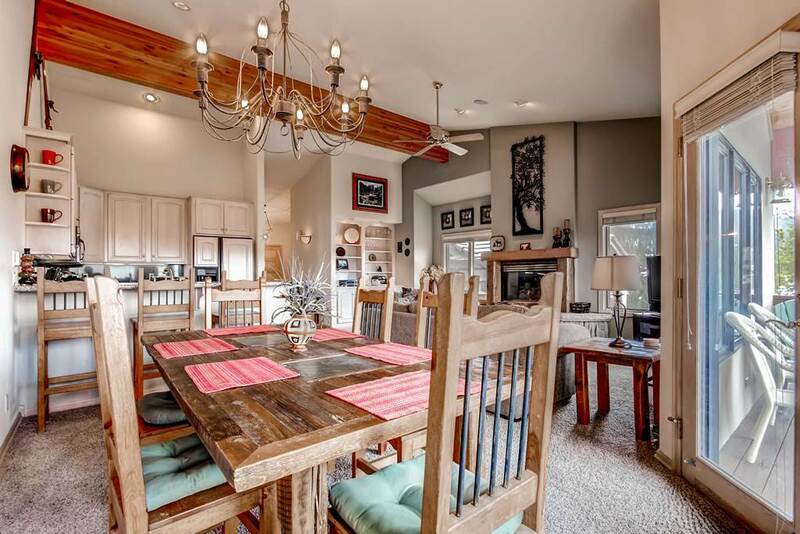 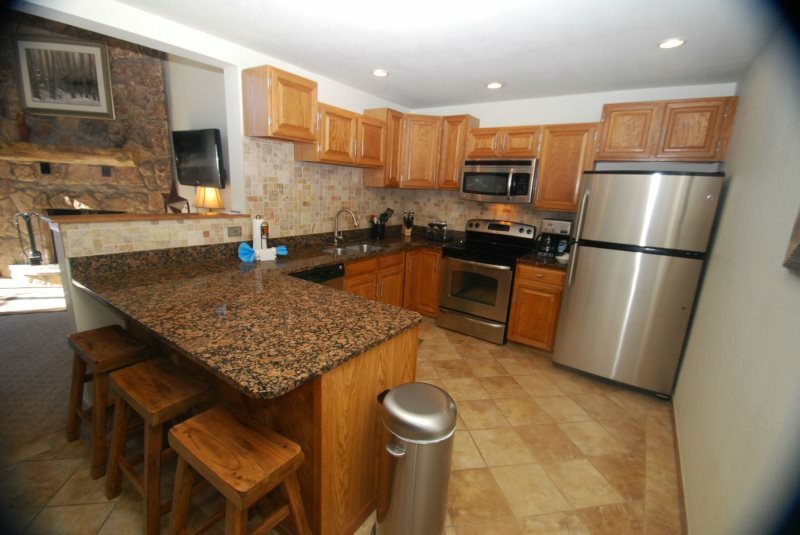 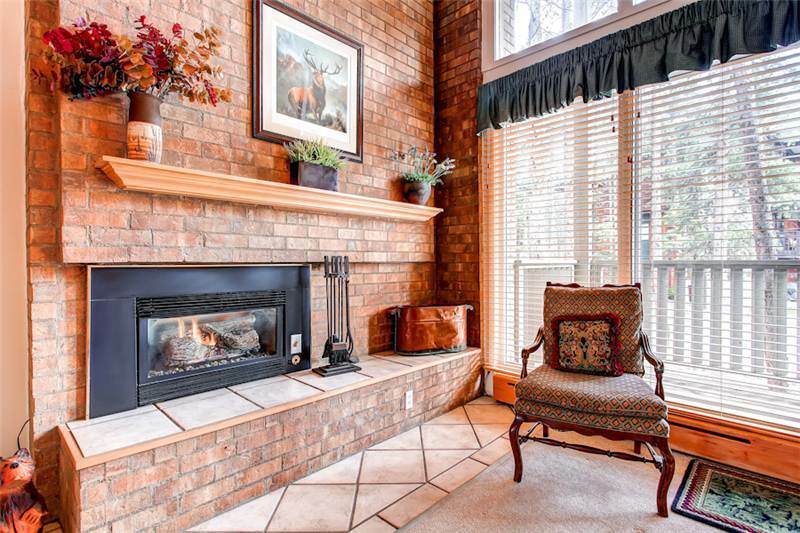 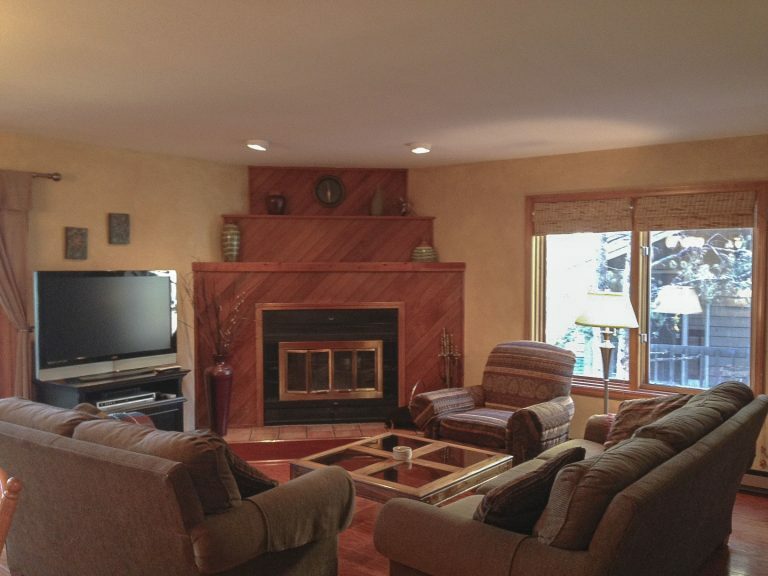 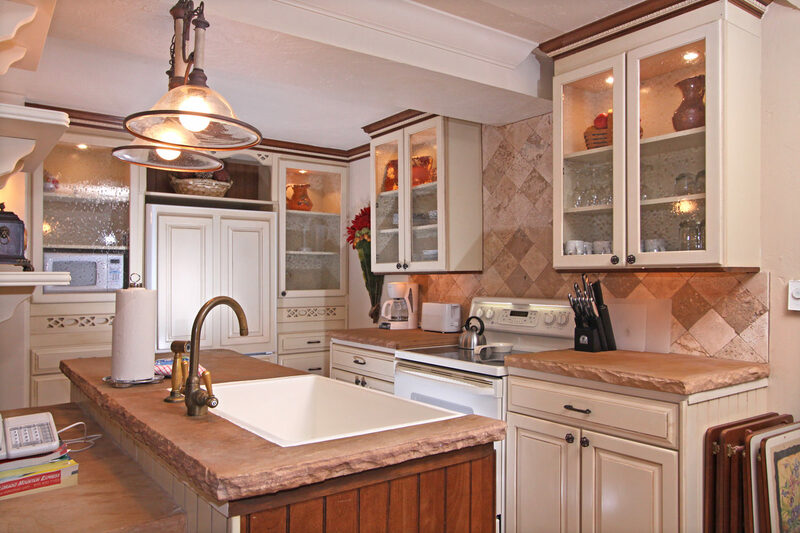 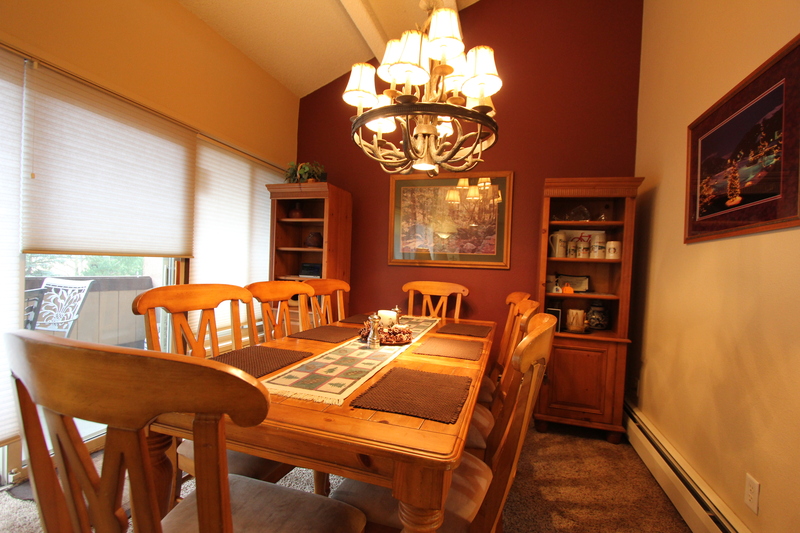 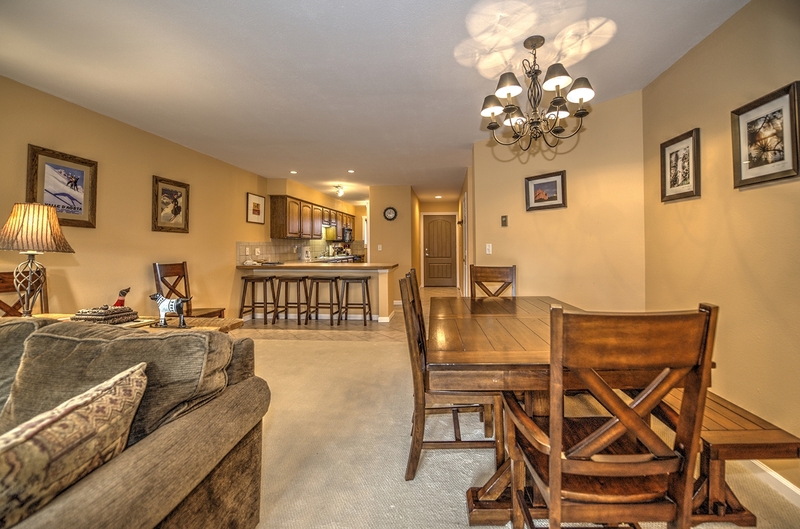 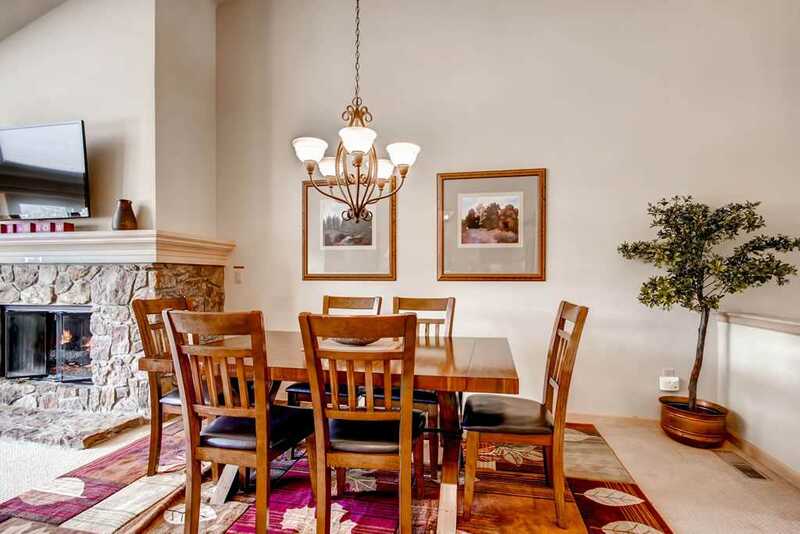 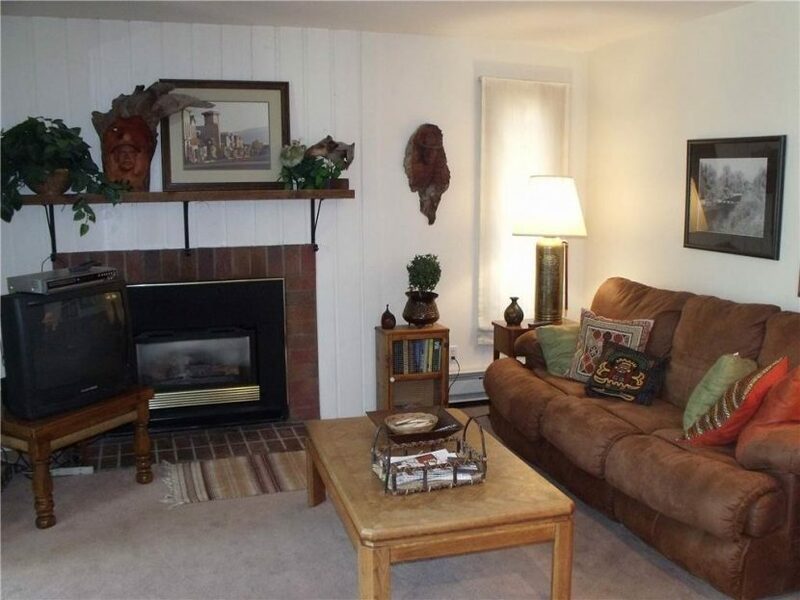 This home offers everything for your family or large group. 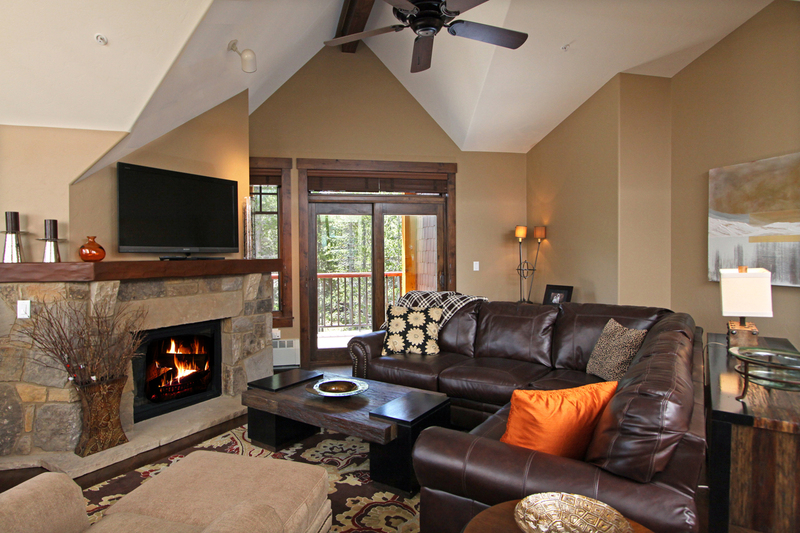 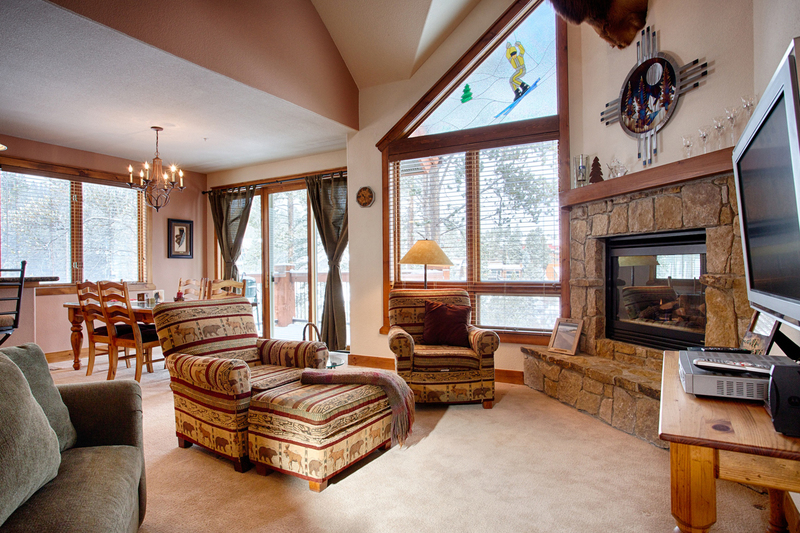 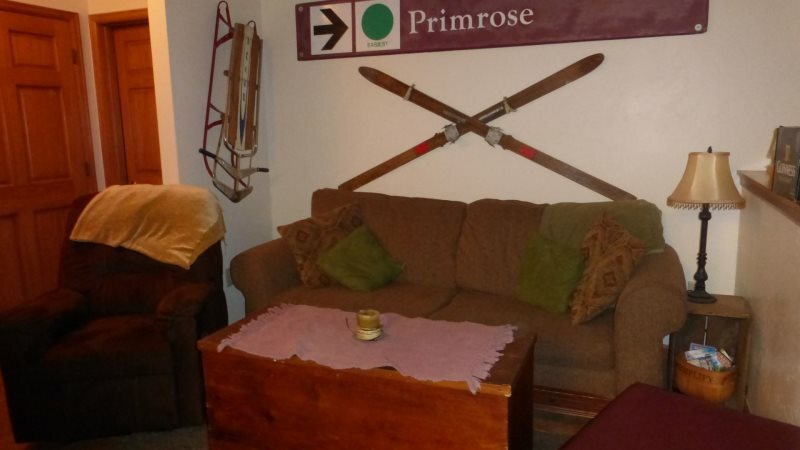 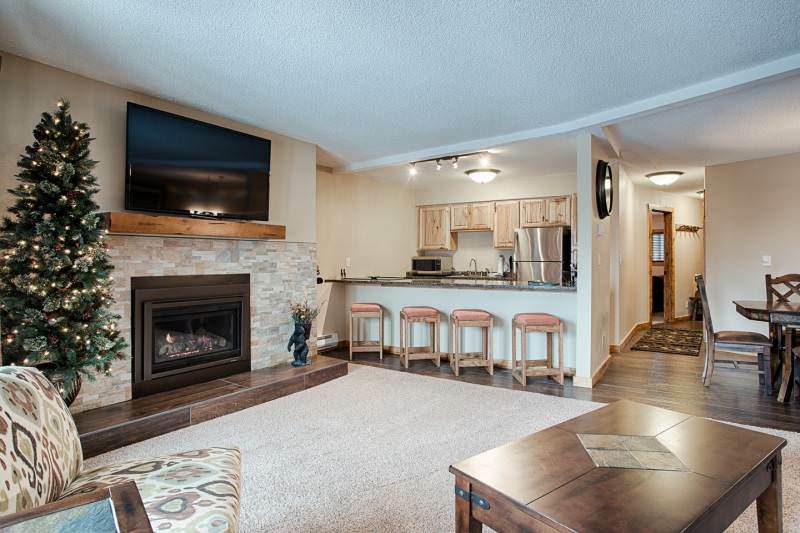 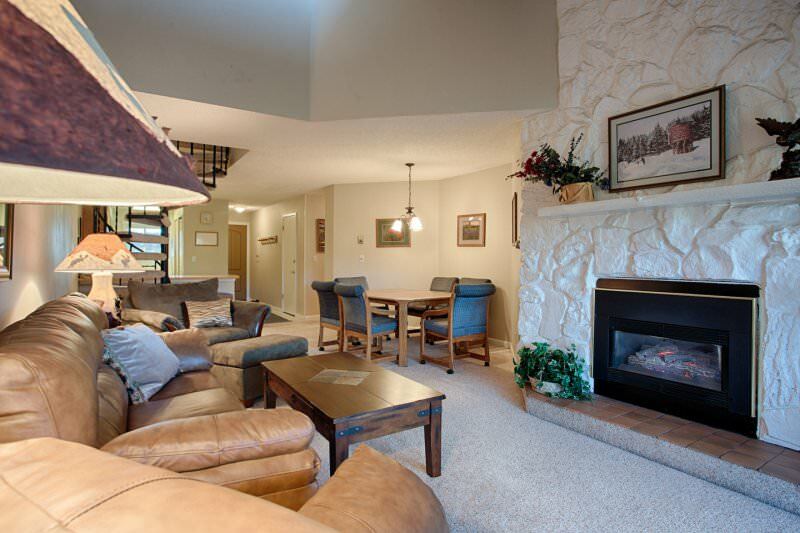 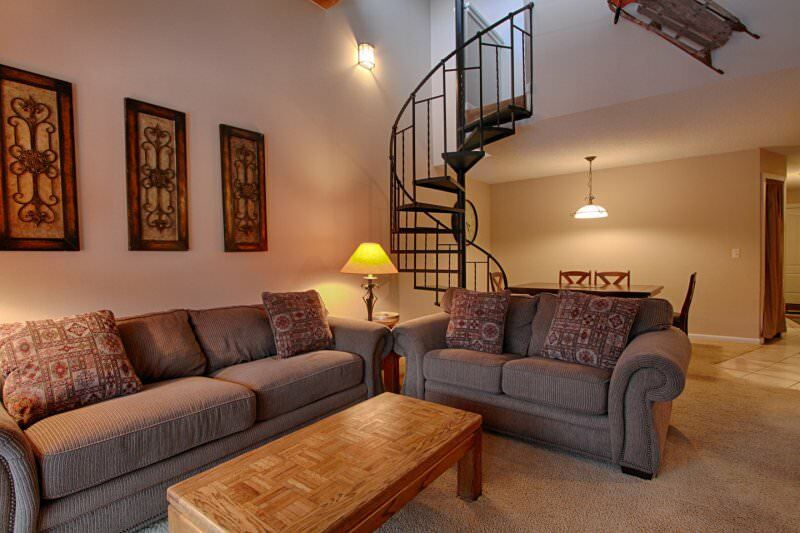 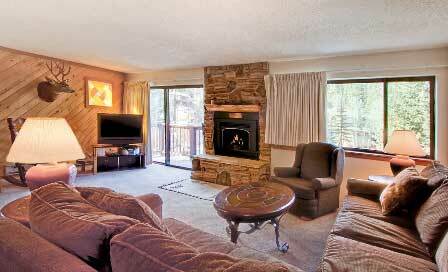 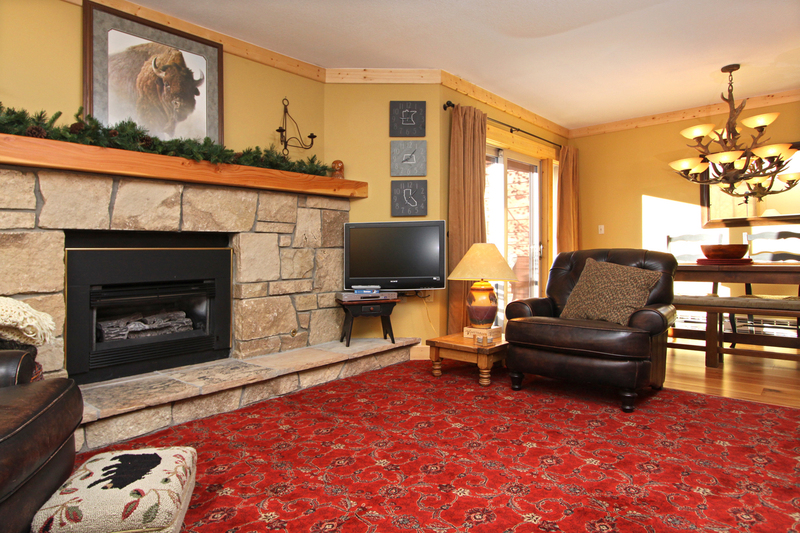 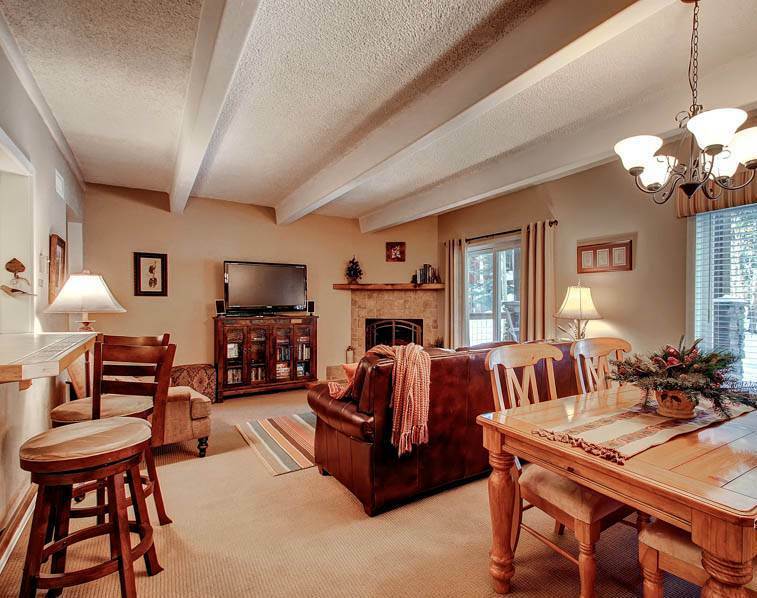 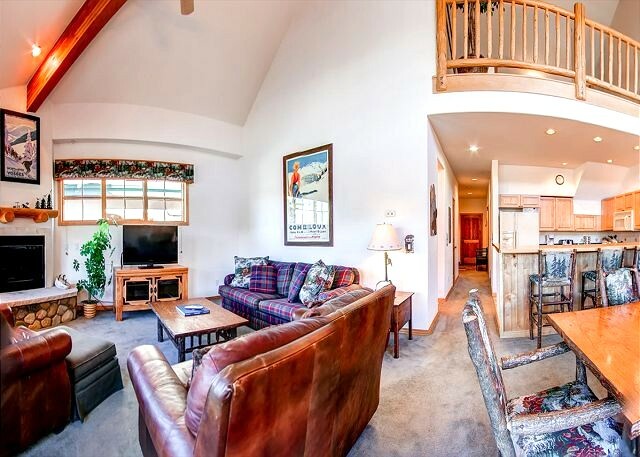 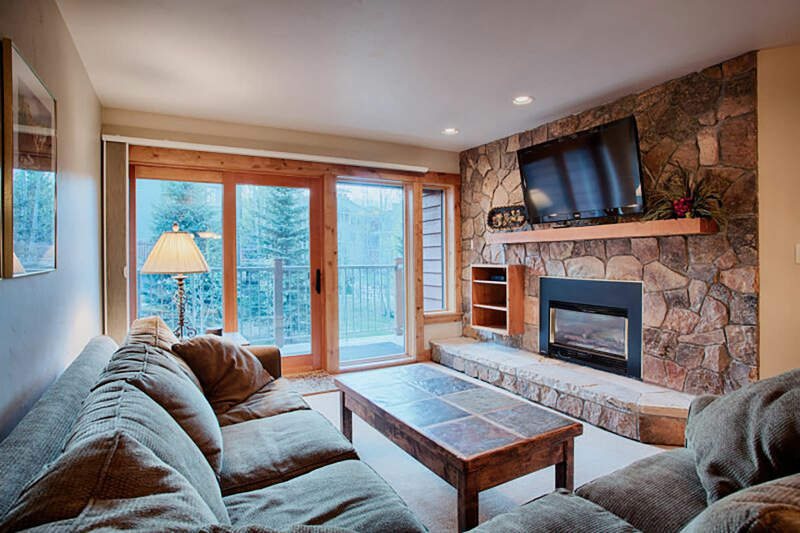 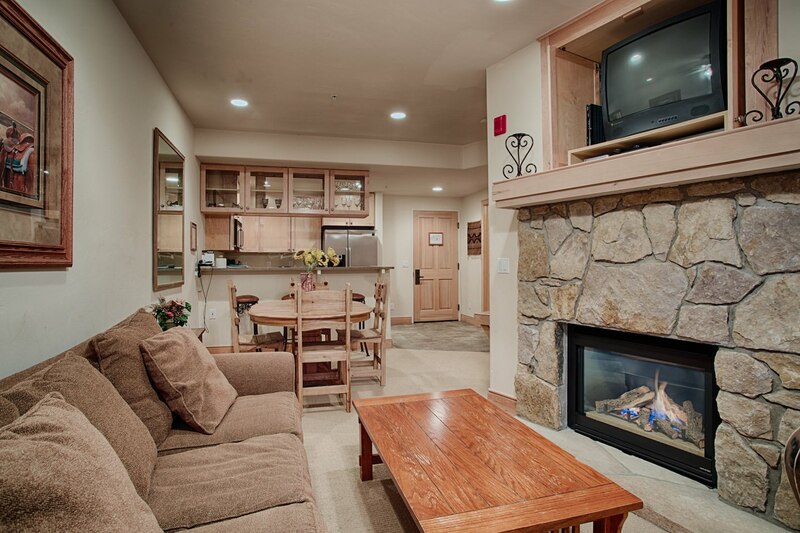 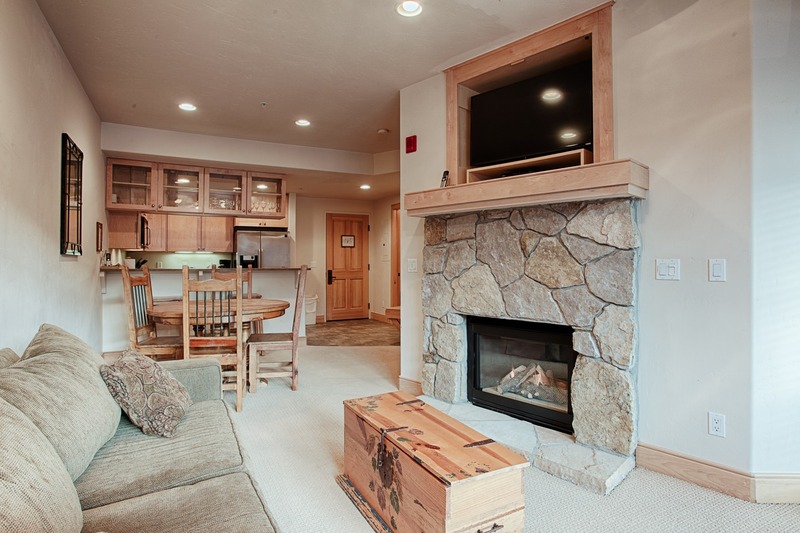 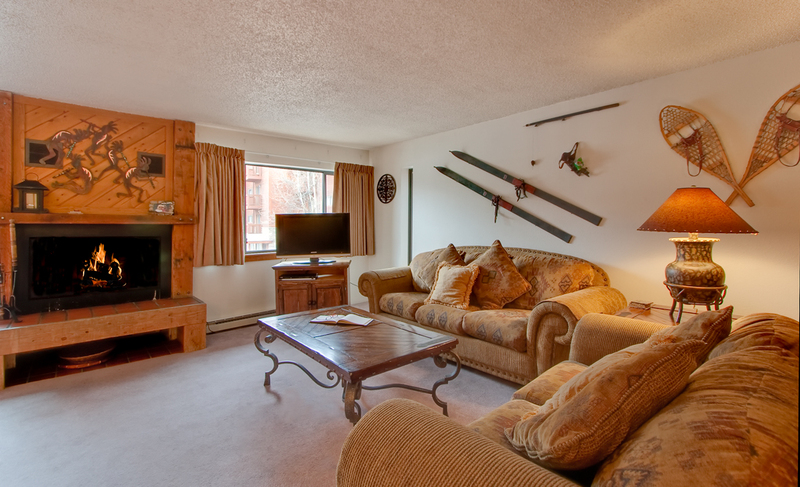 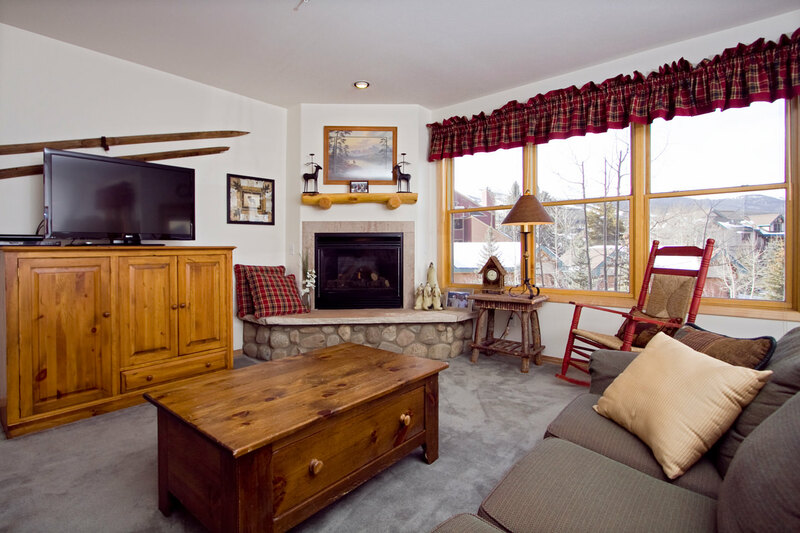 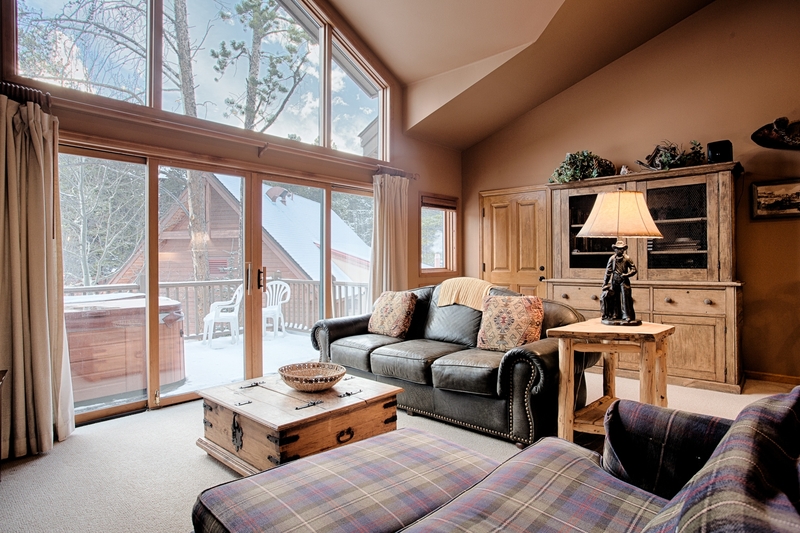 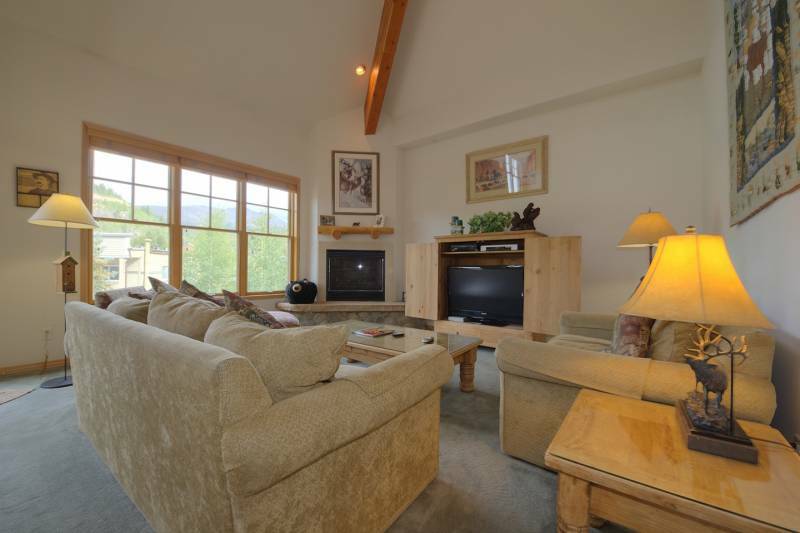 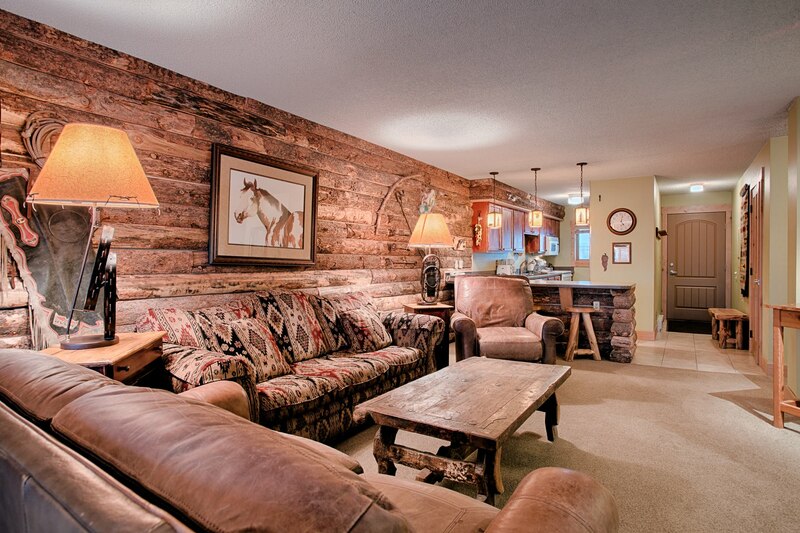 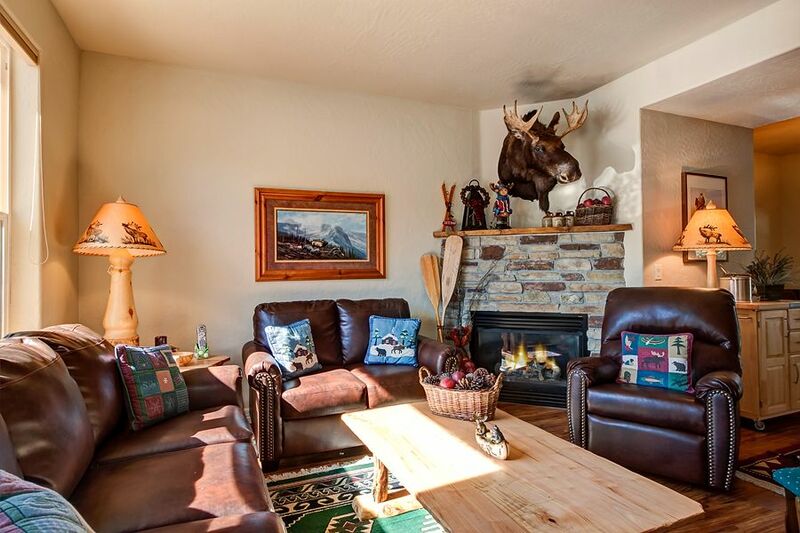 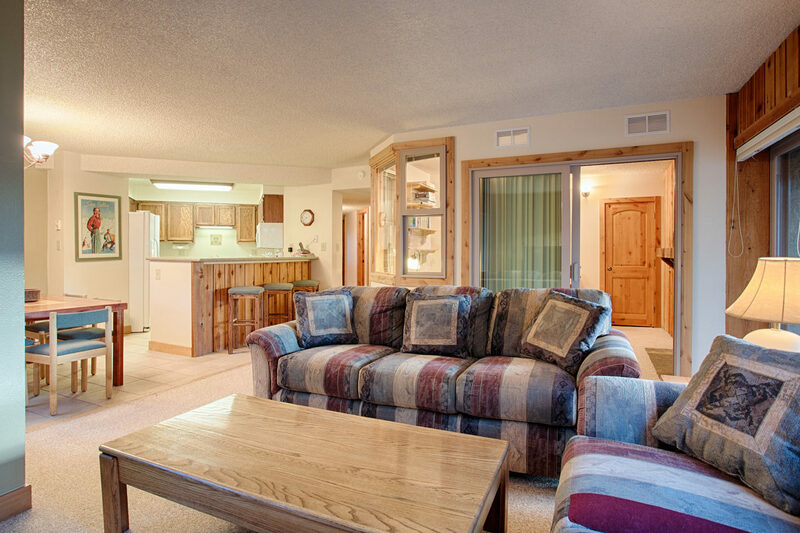 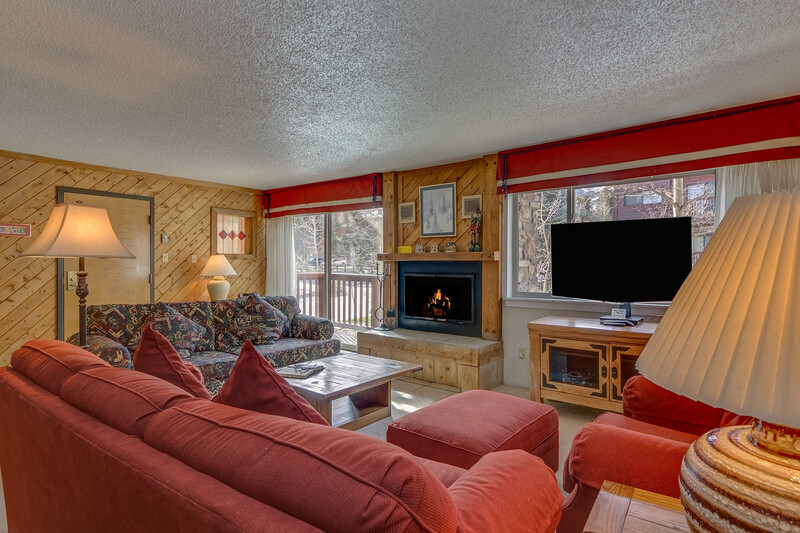 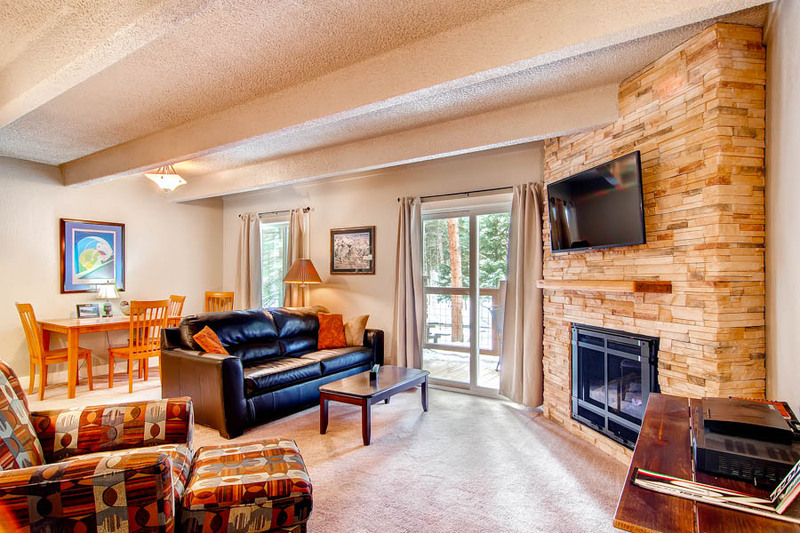 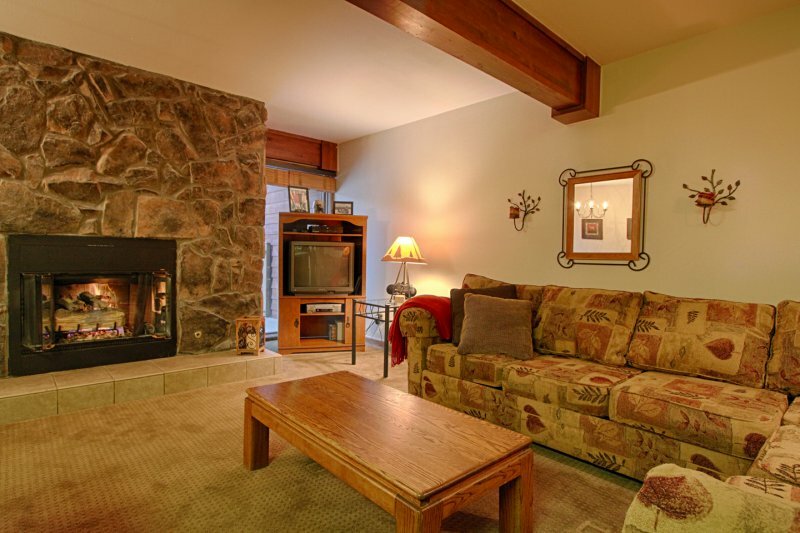 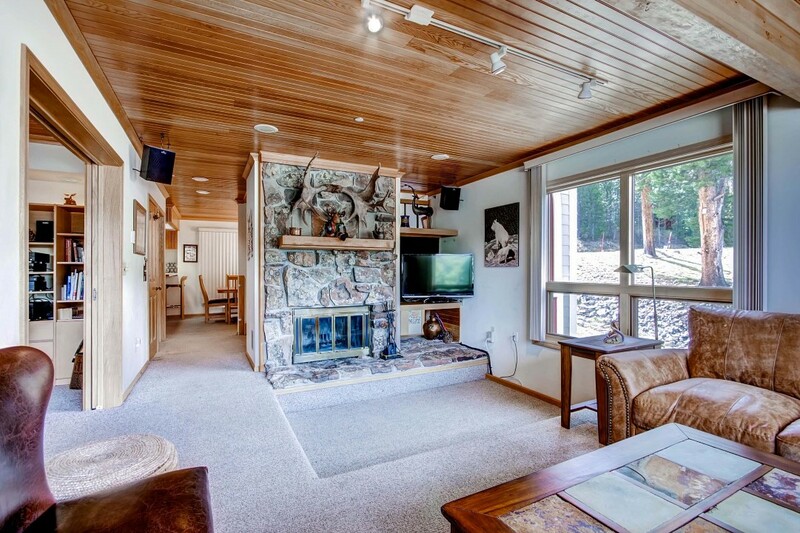 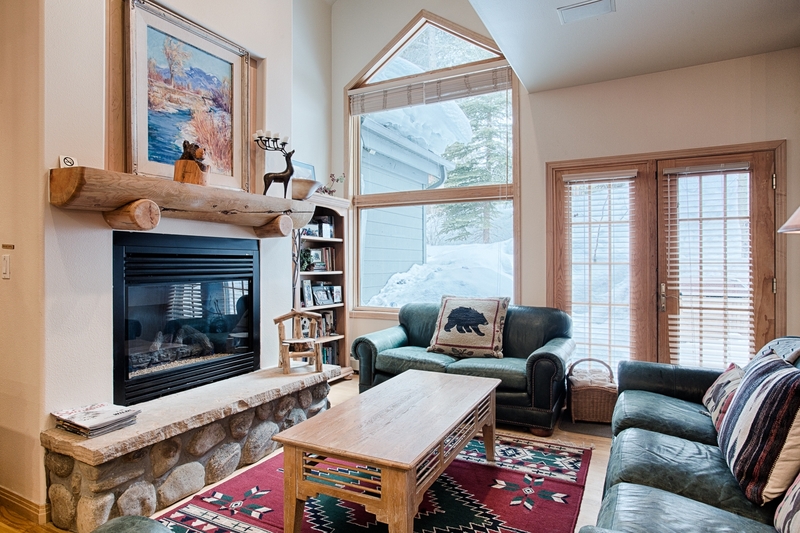 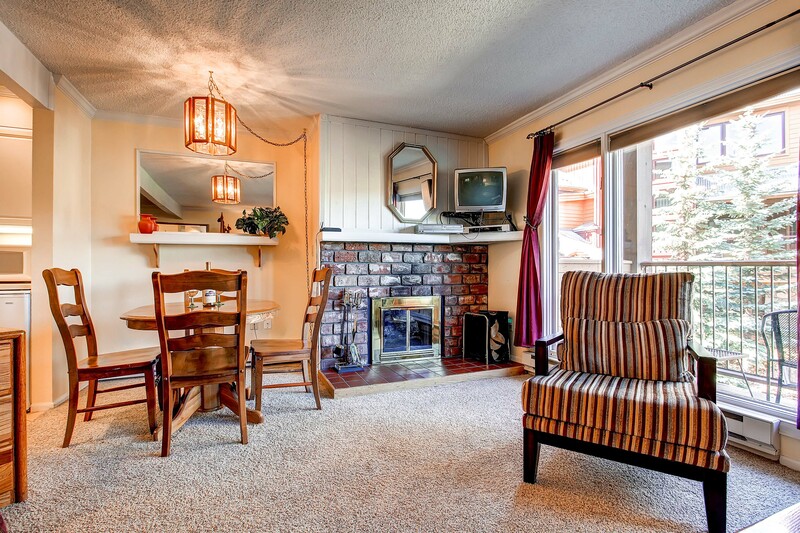 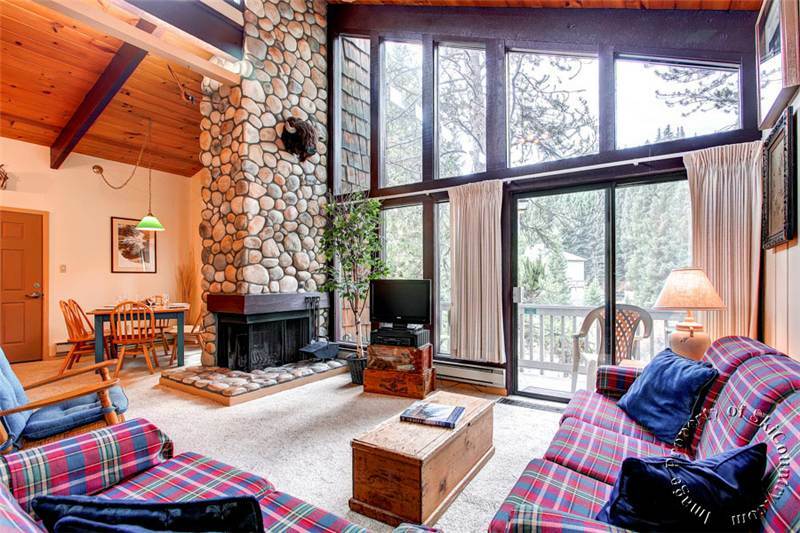 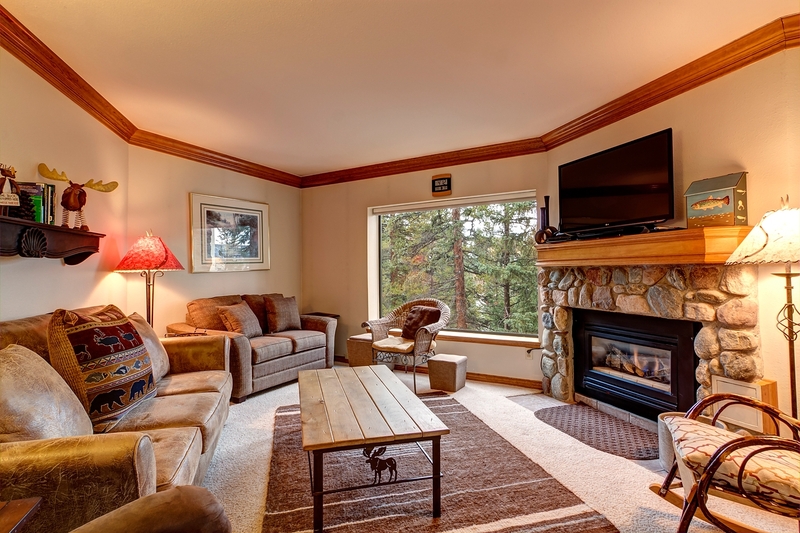 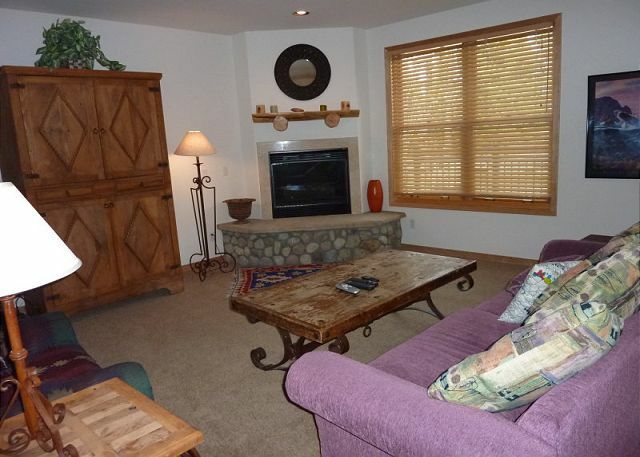 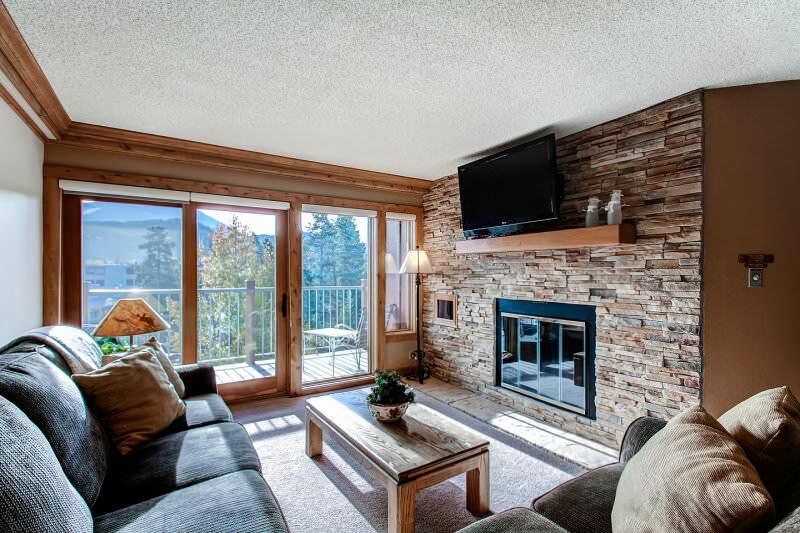 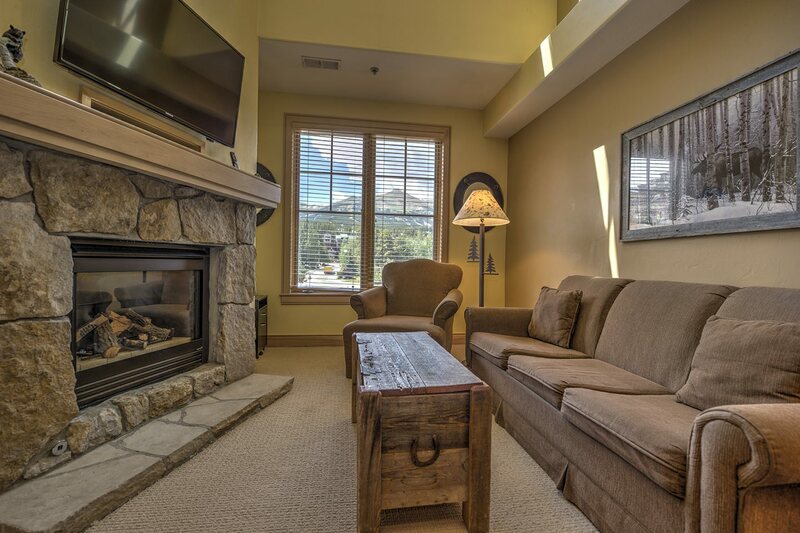 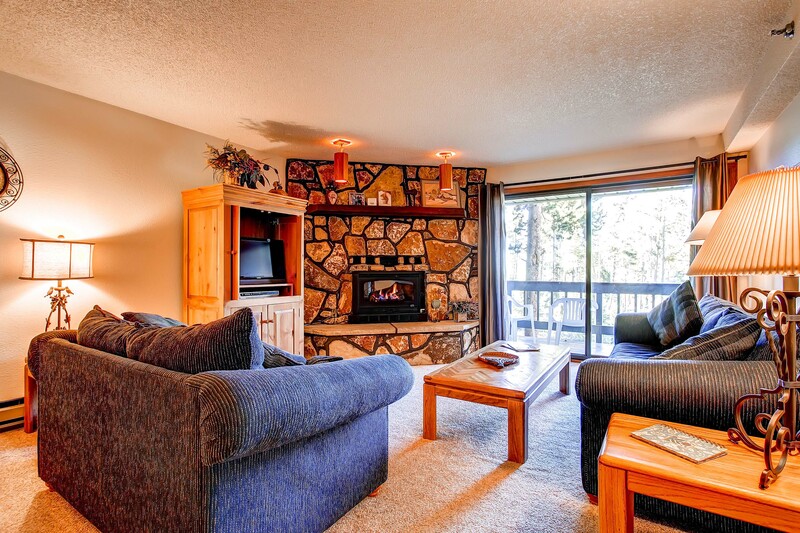 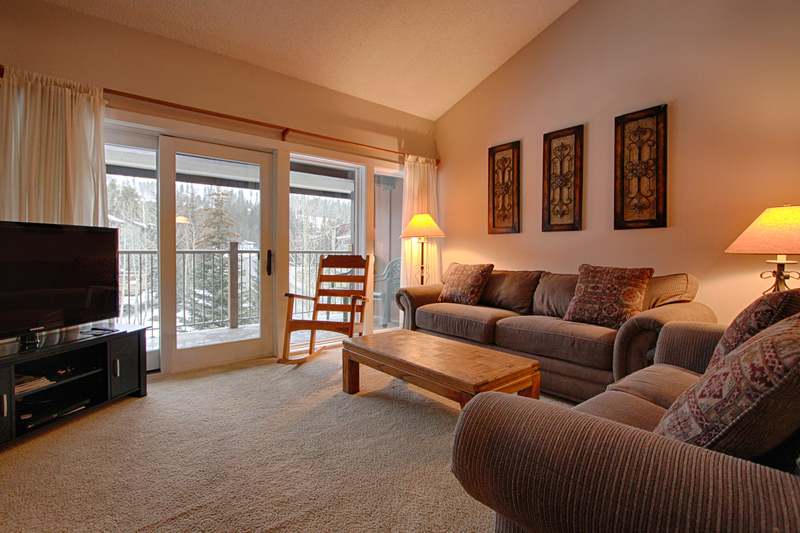 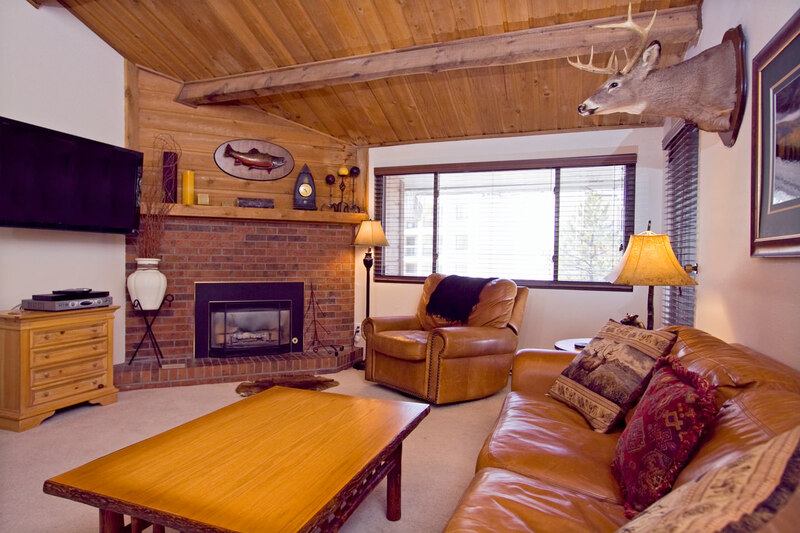 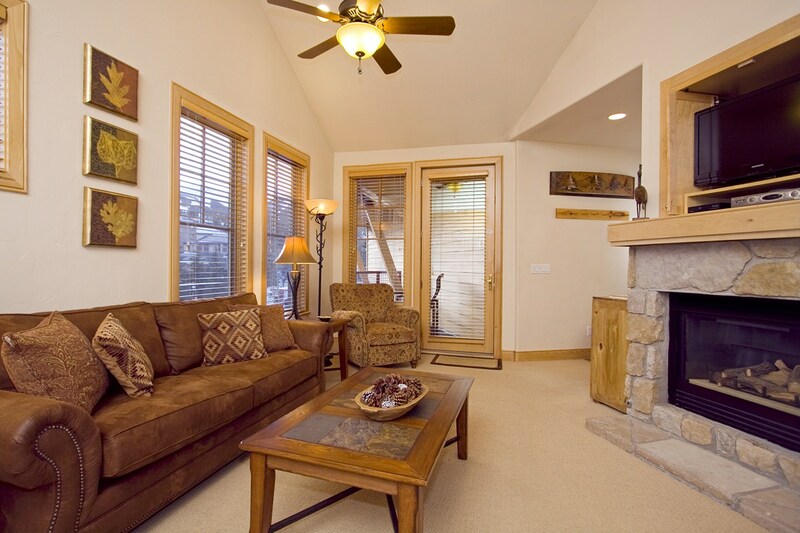 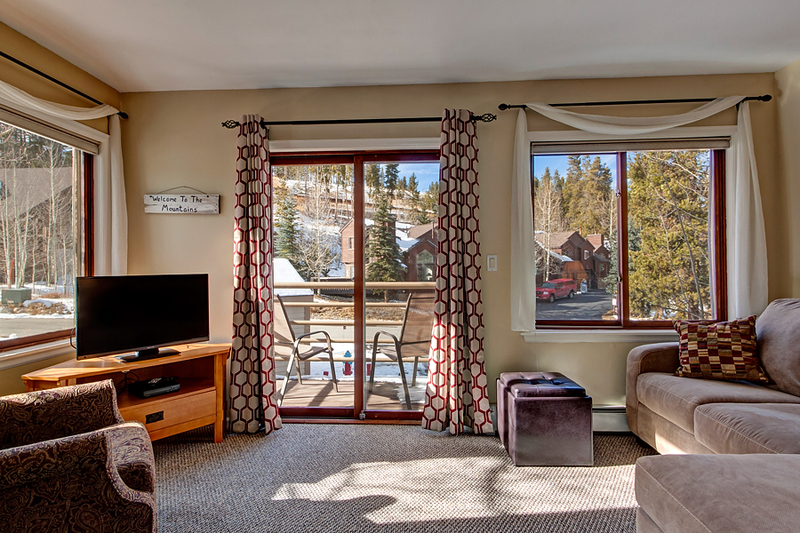 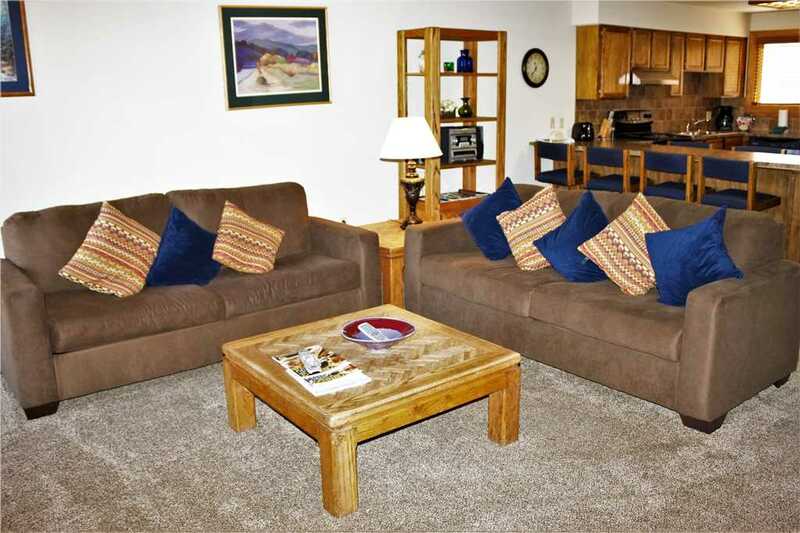 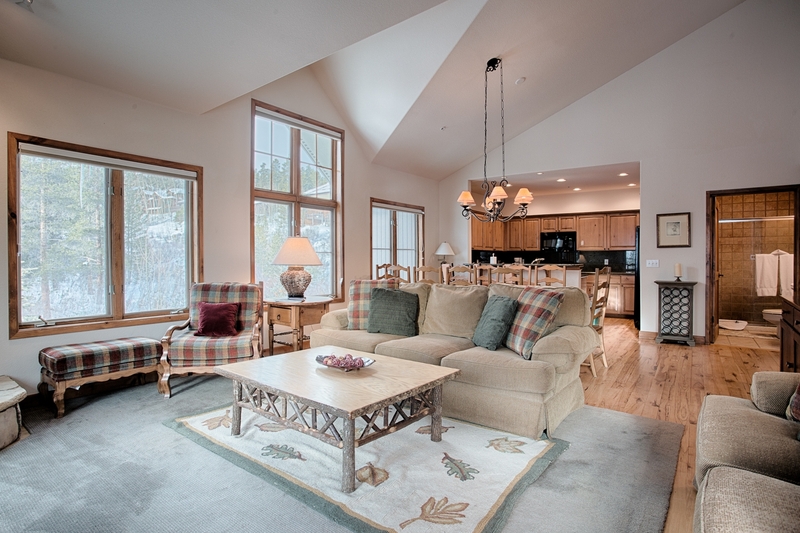 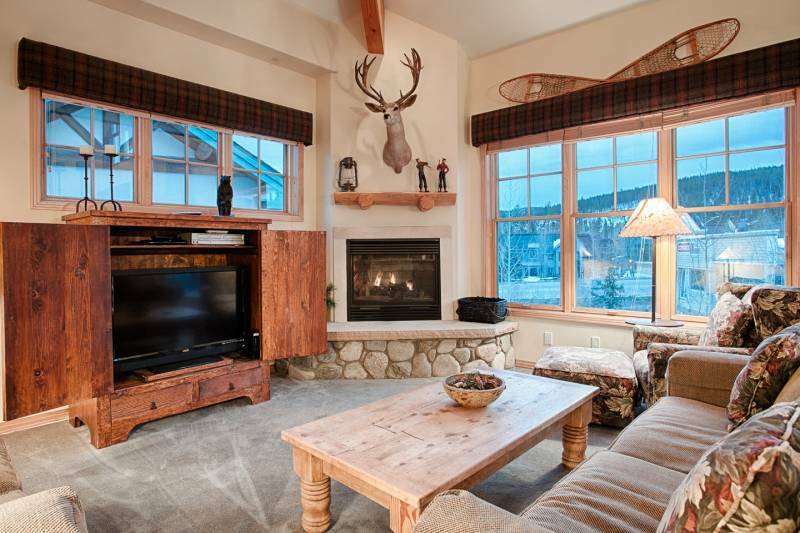 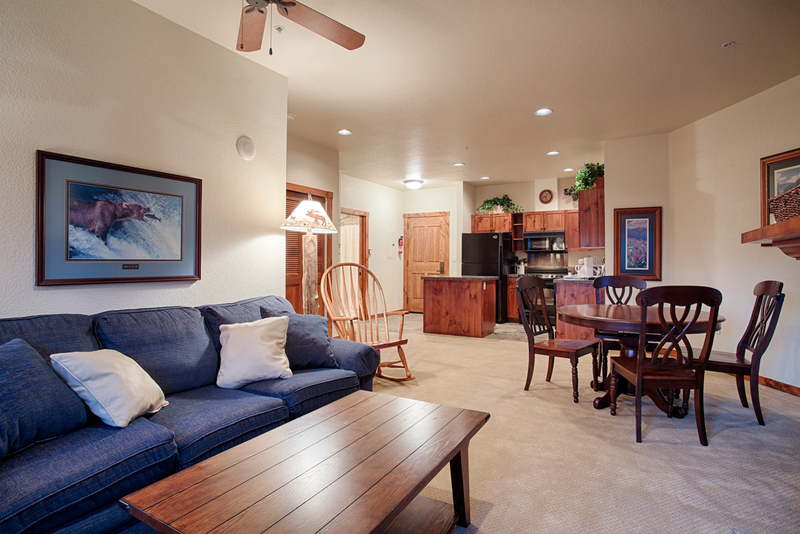 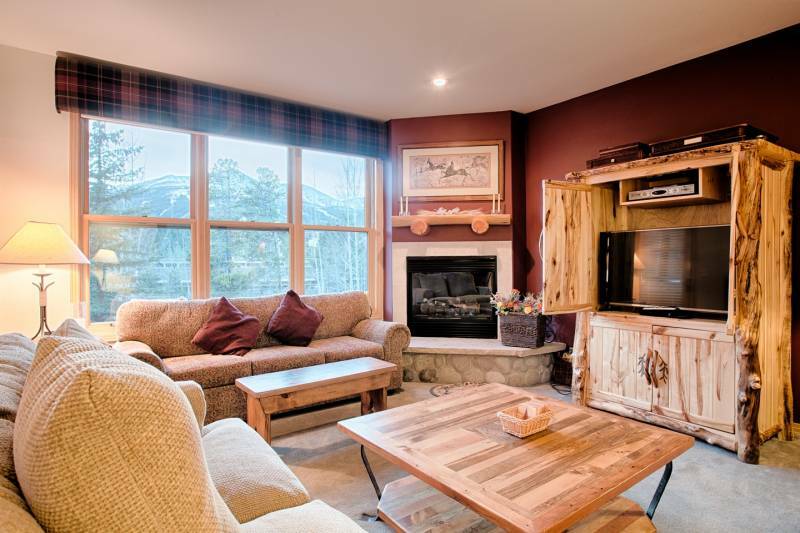 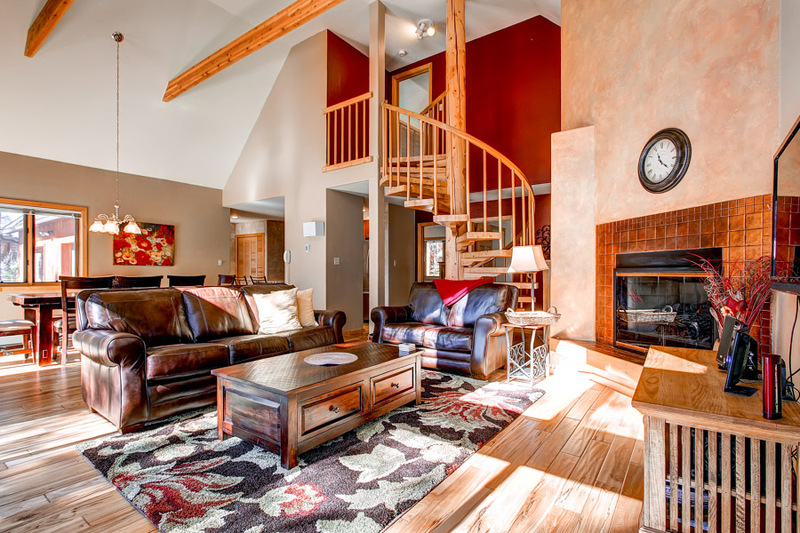 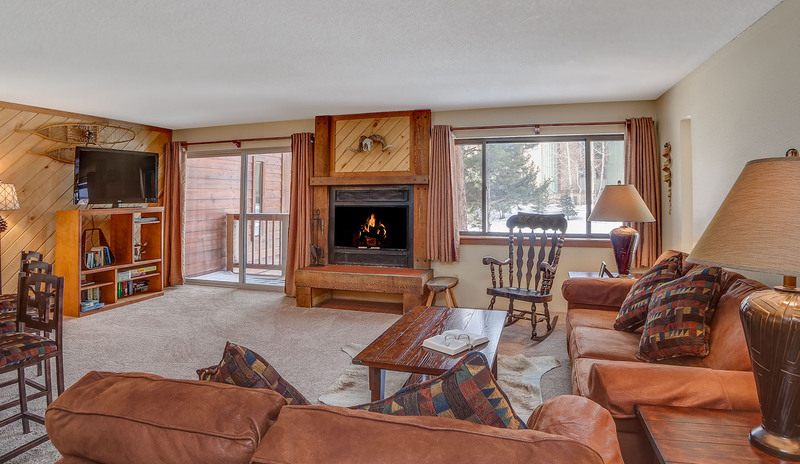 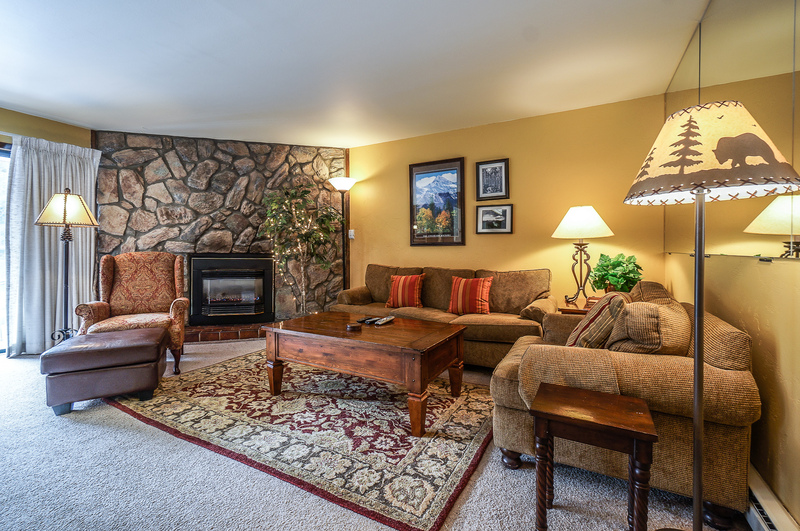 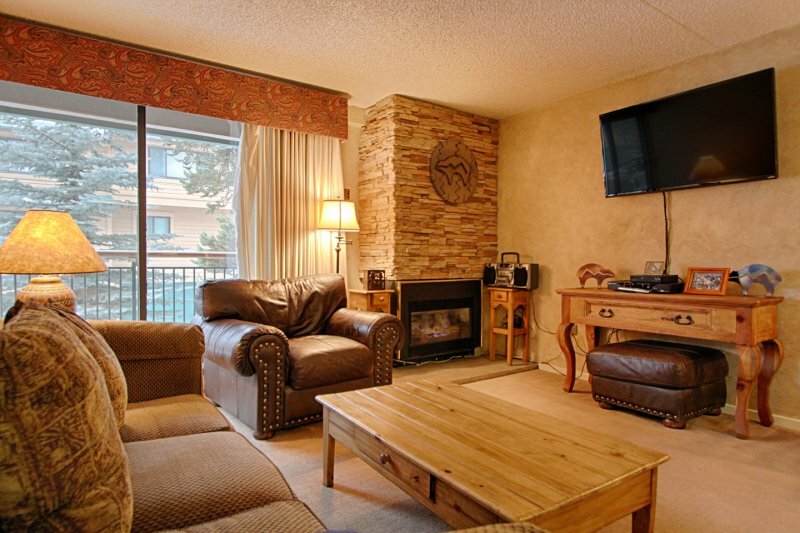 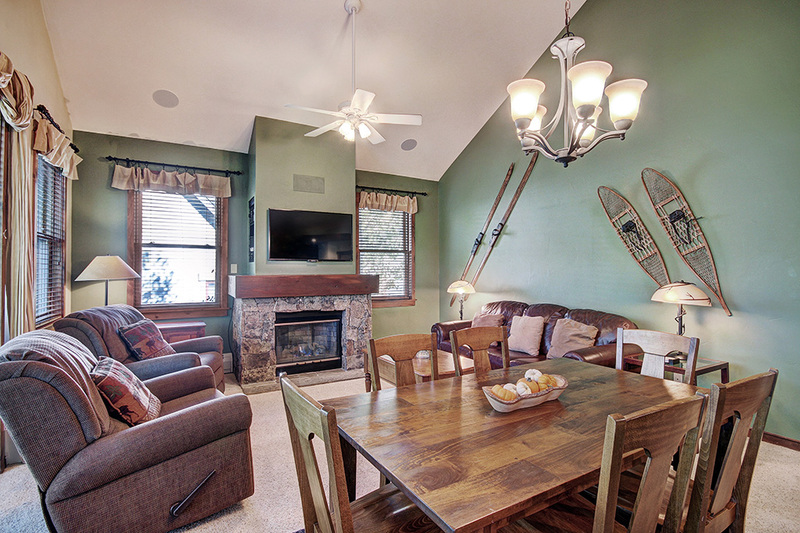 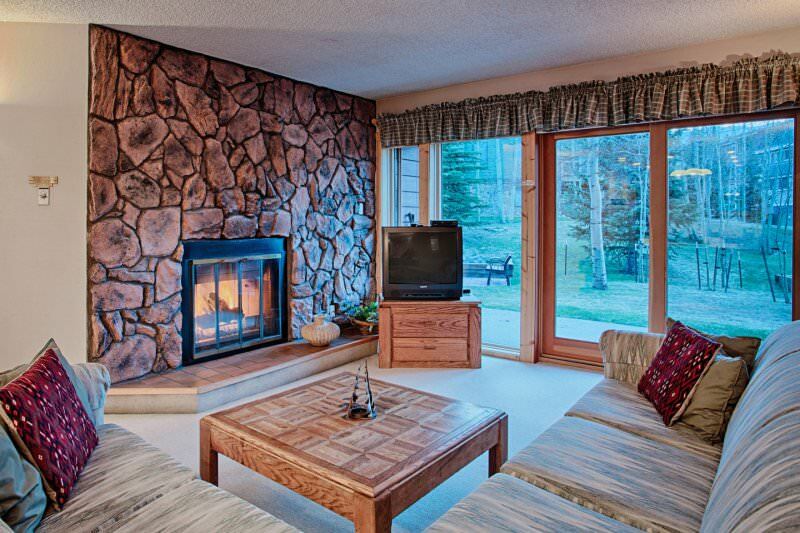 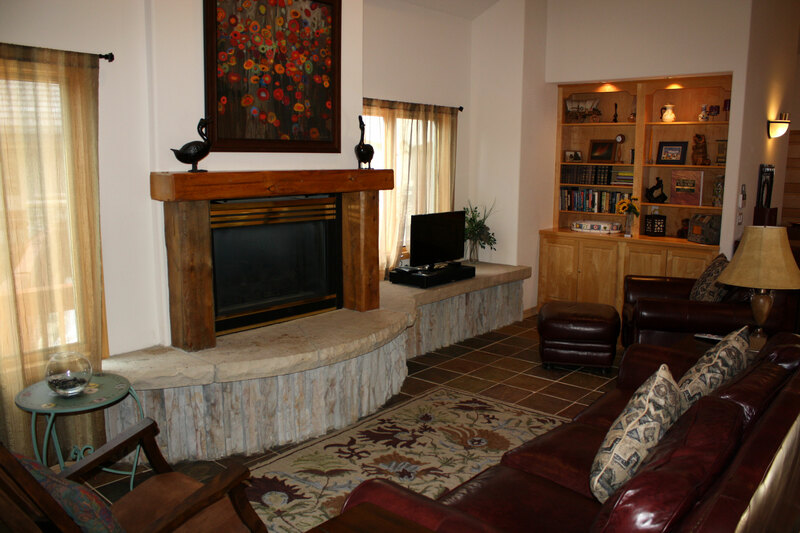 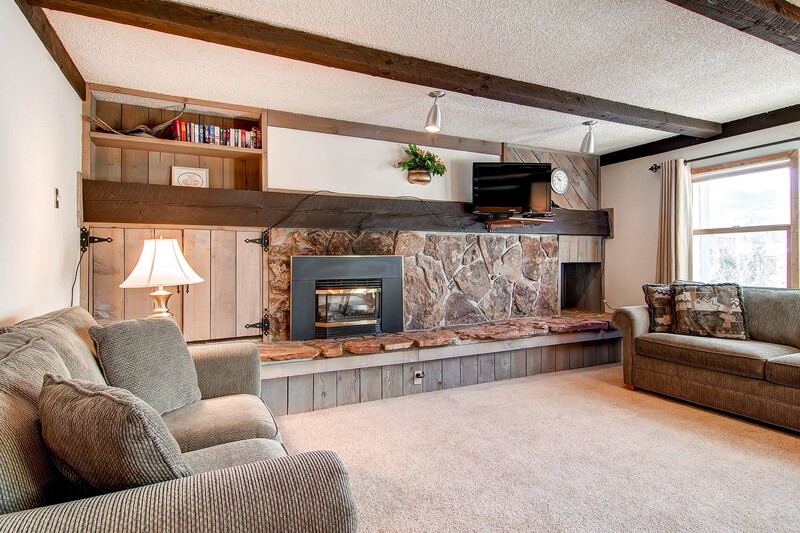 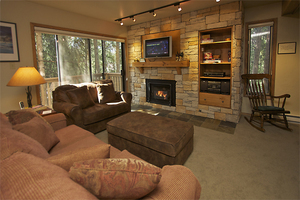 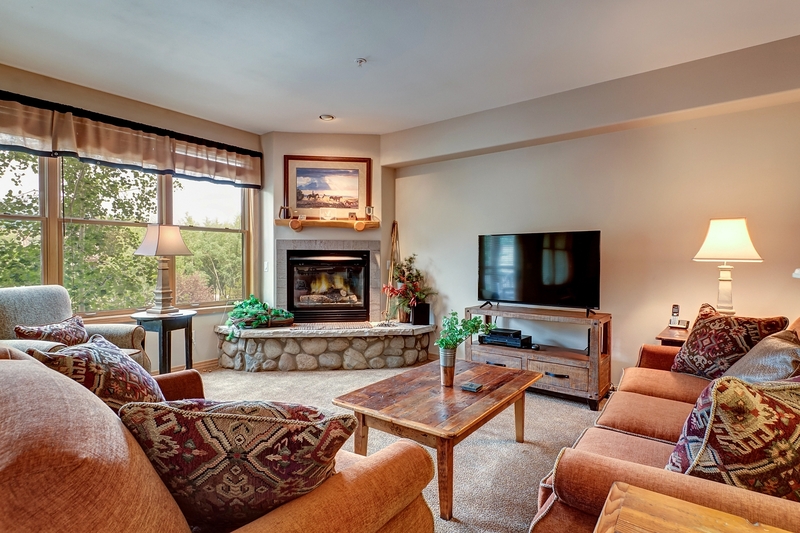 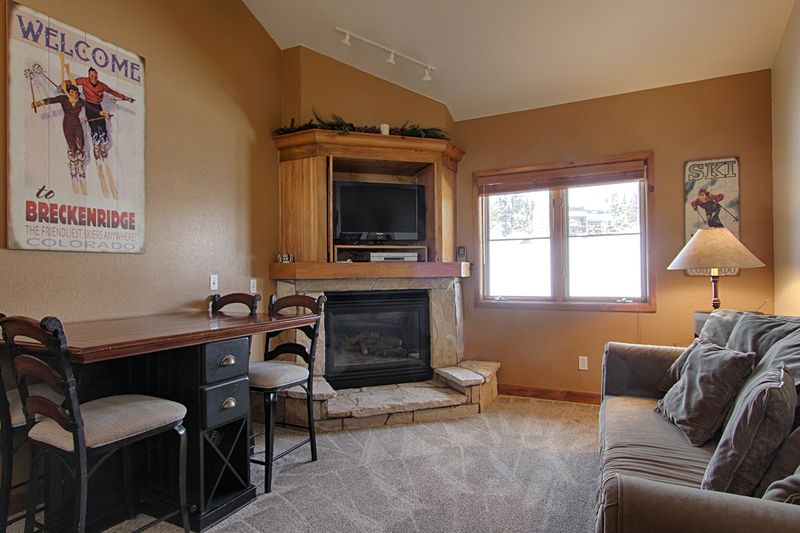 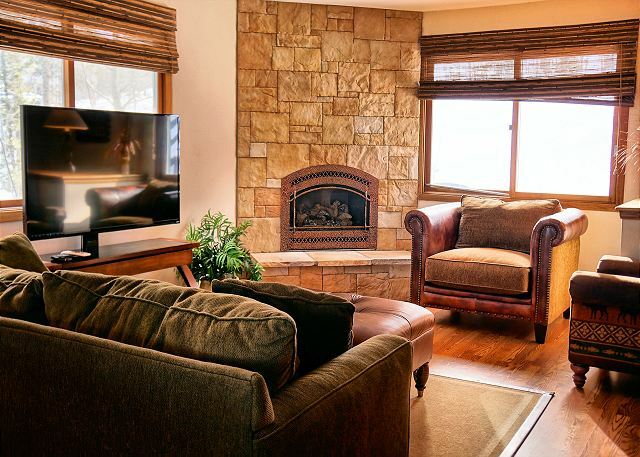 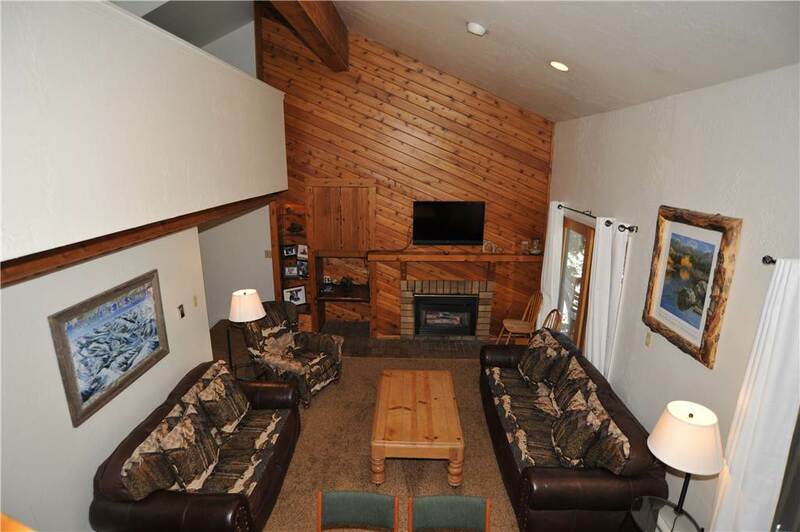 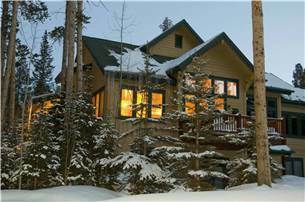 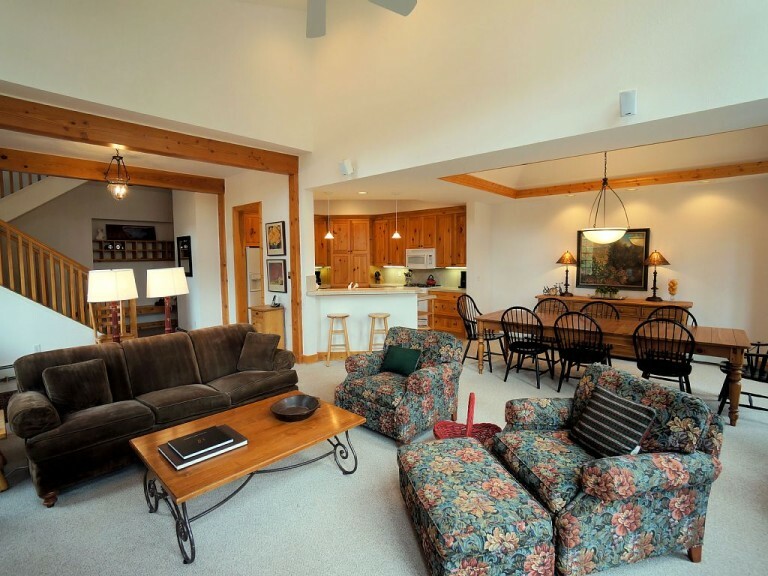 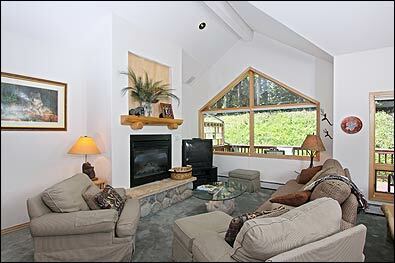 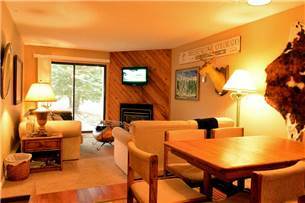 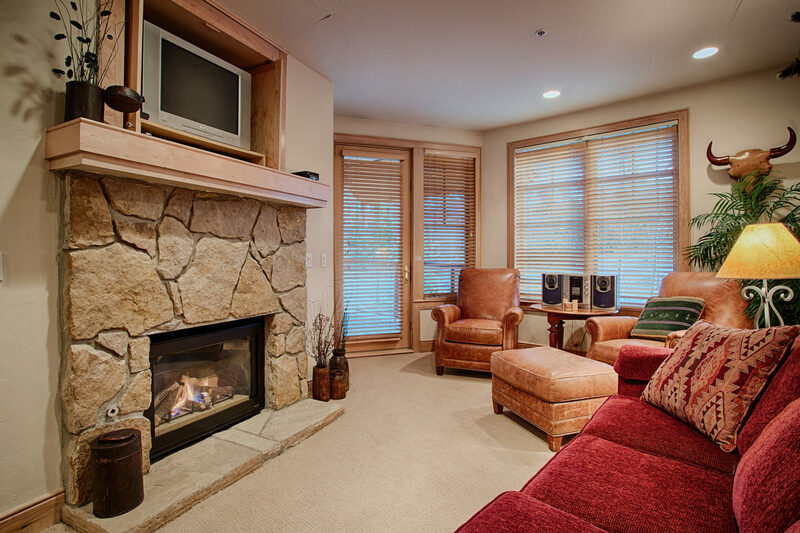 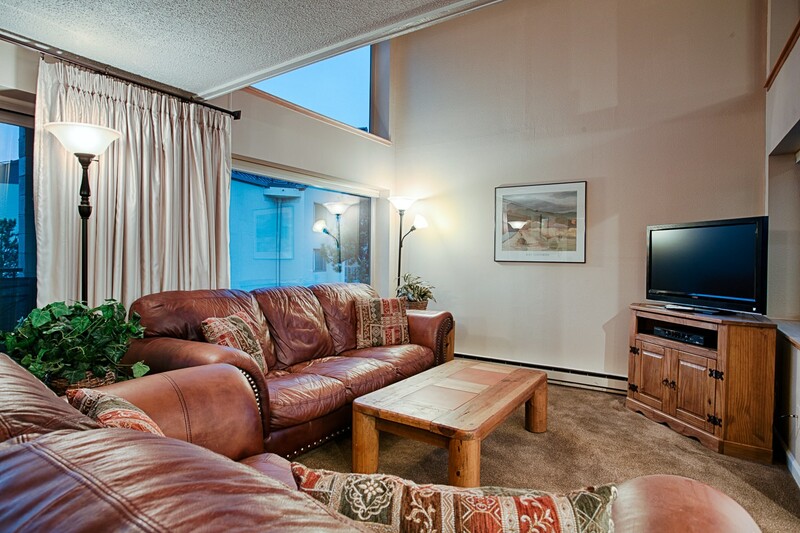 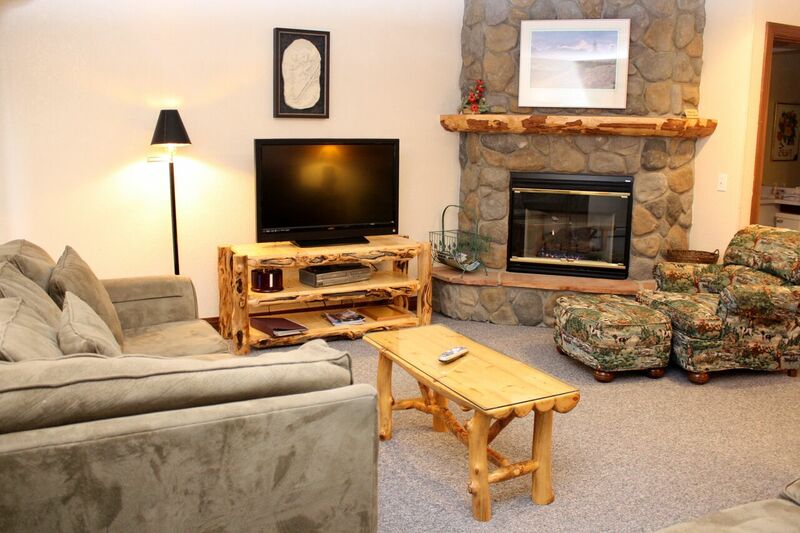 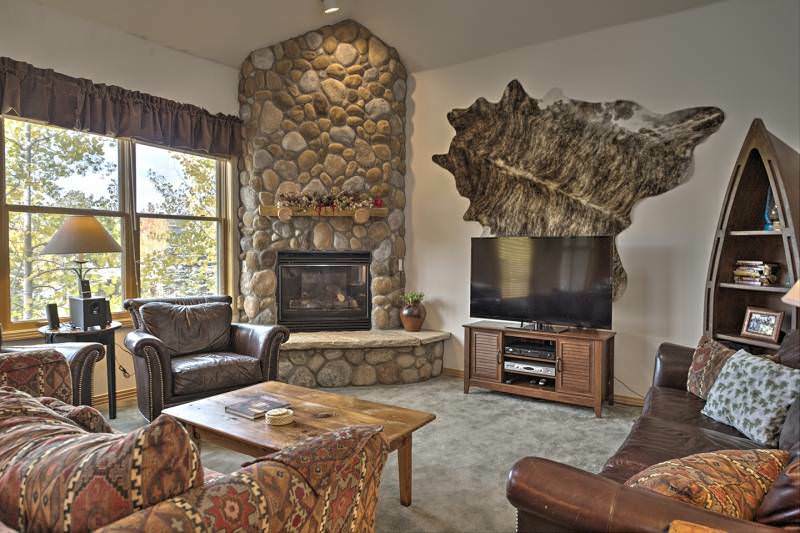 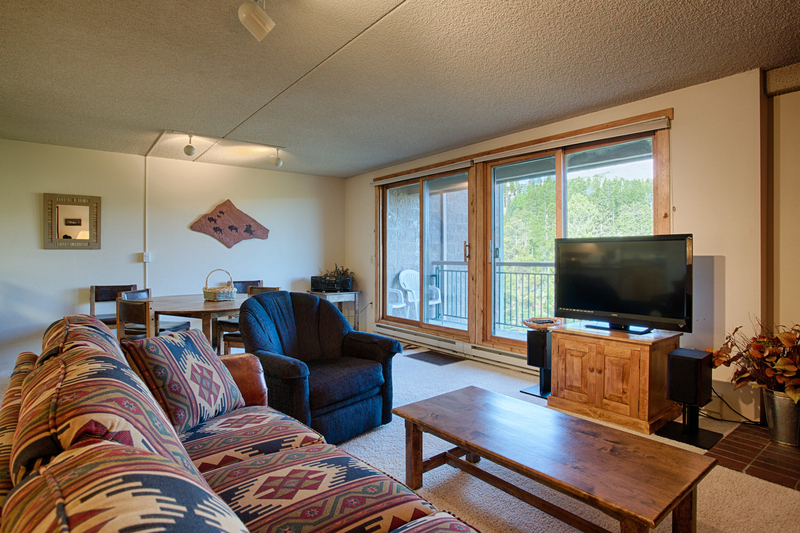 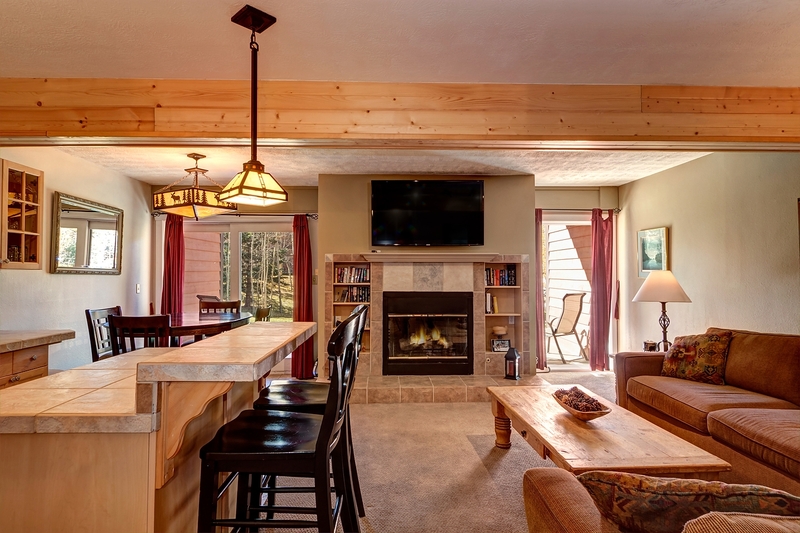 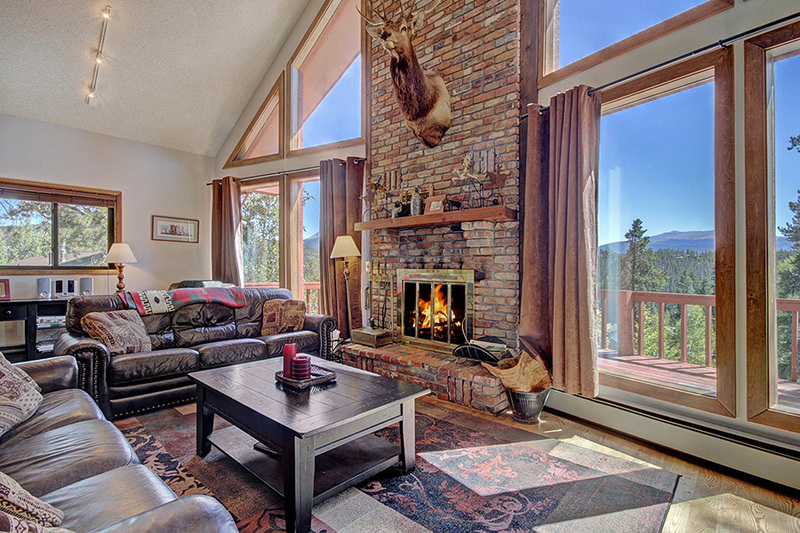 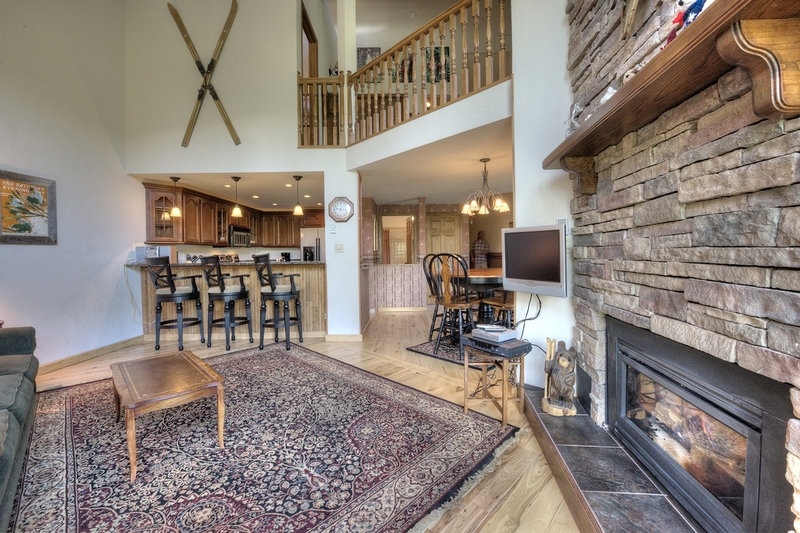 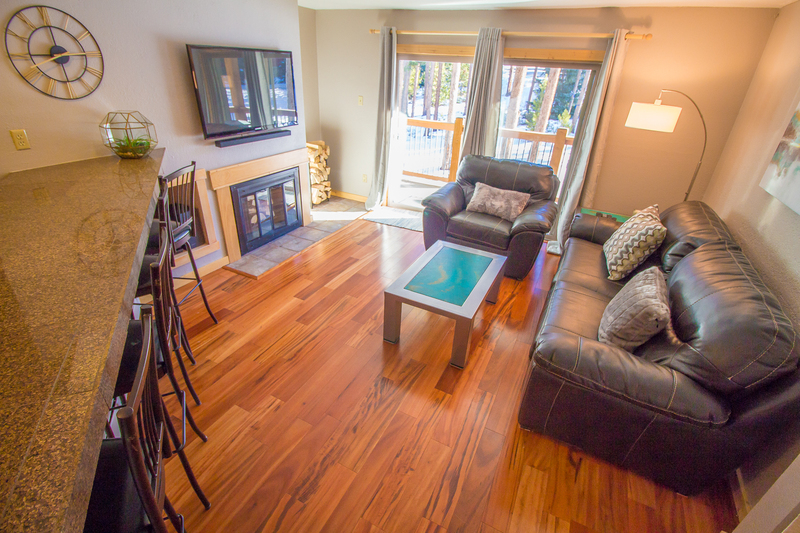 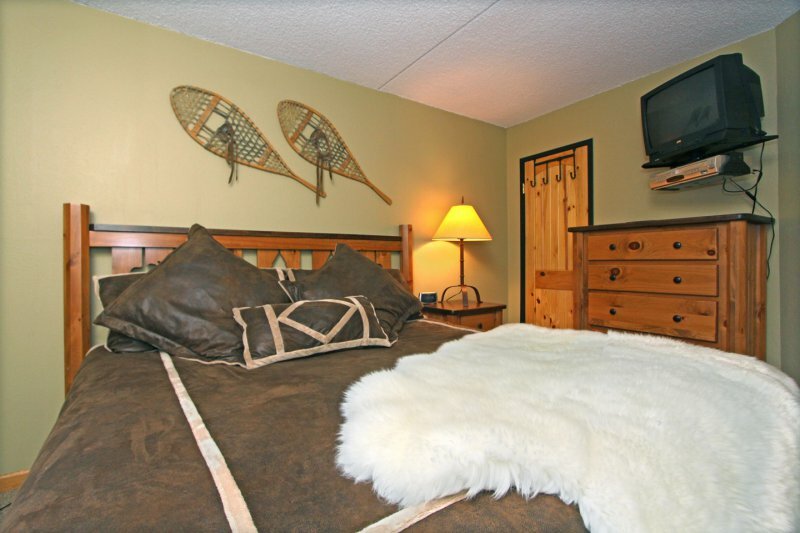 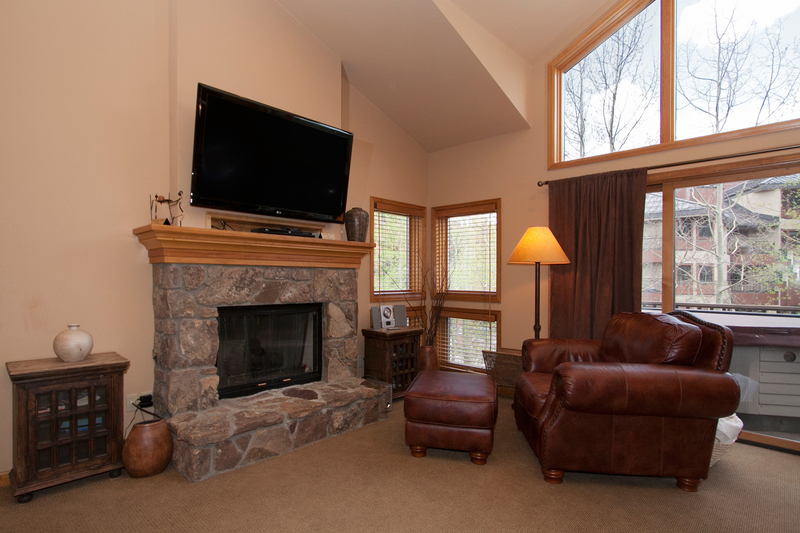 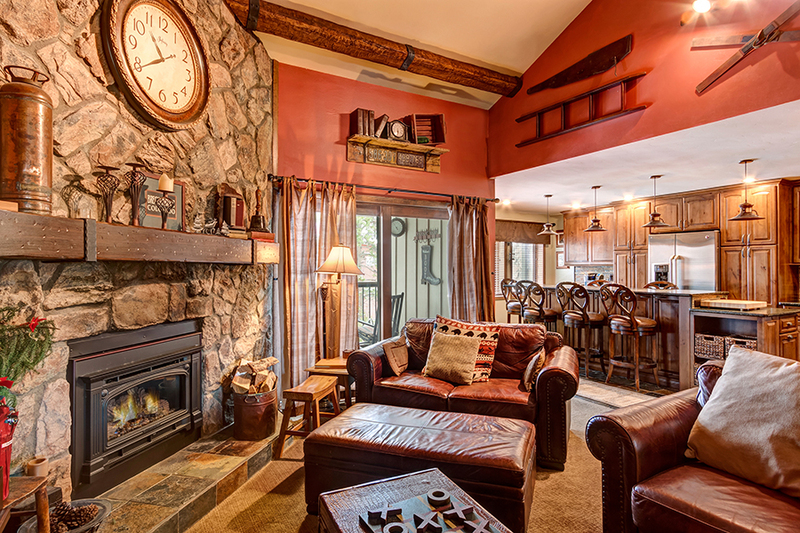 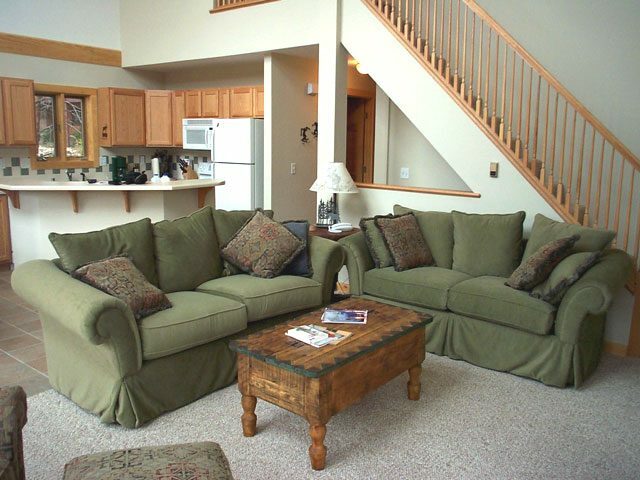 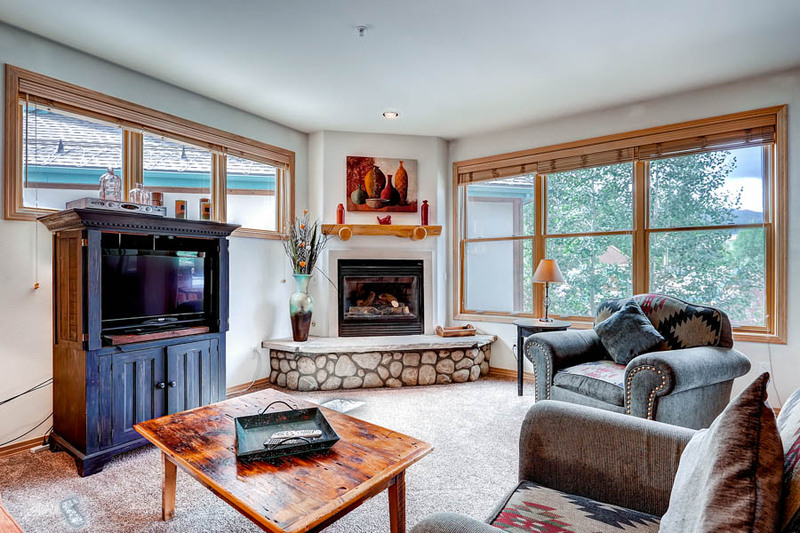 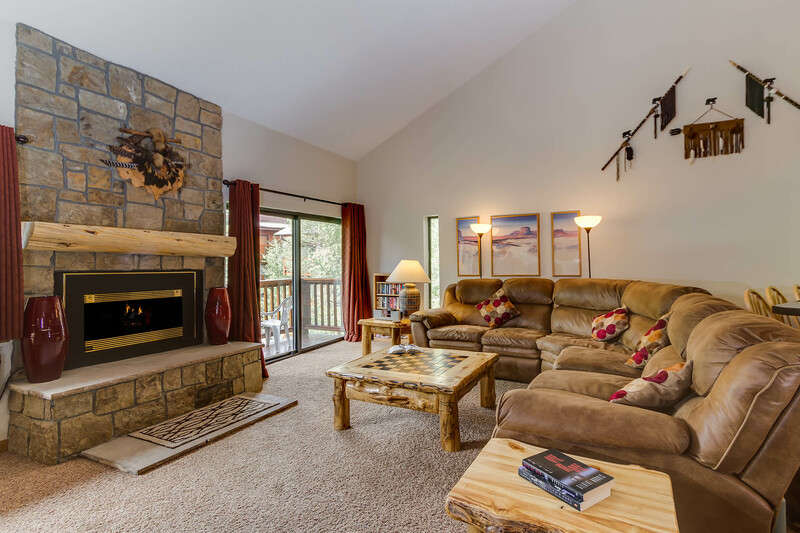 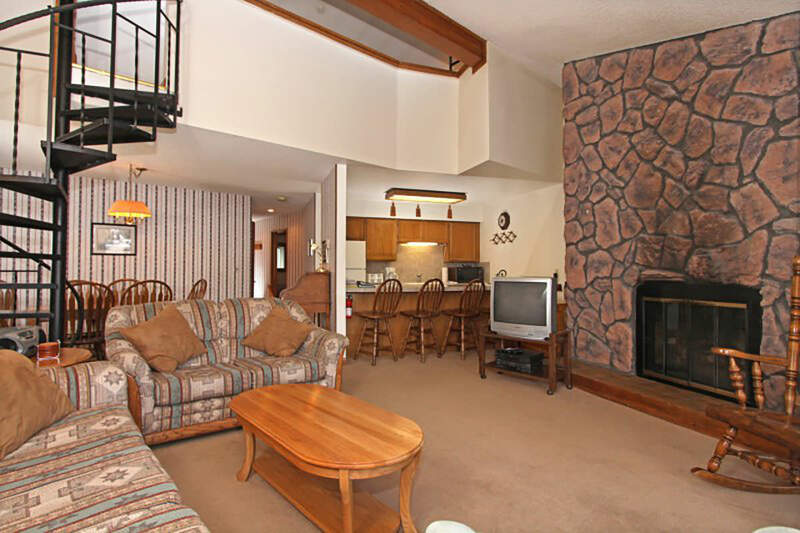 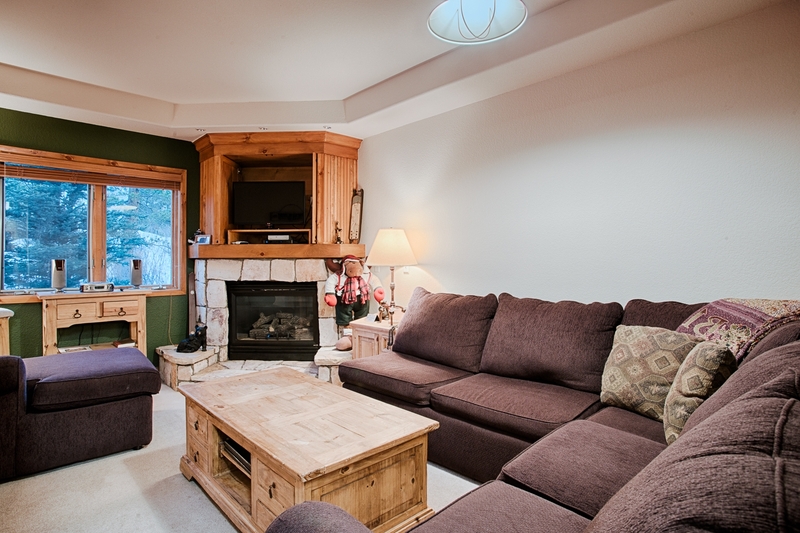 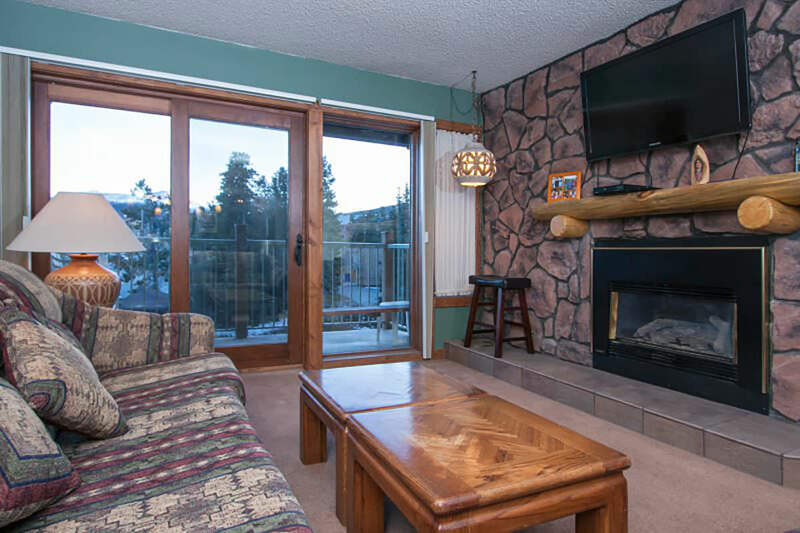 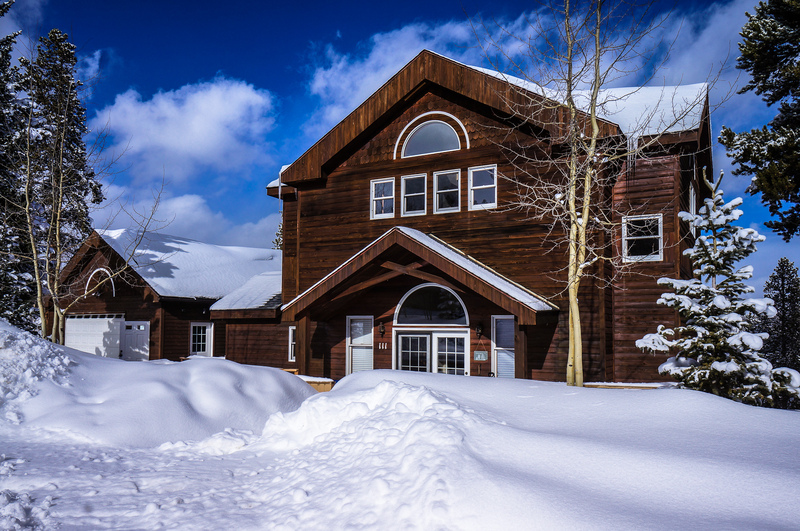 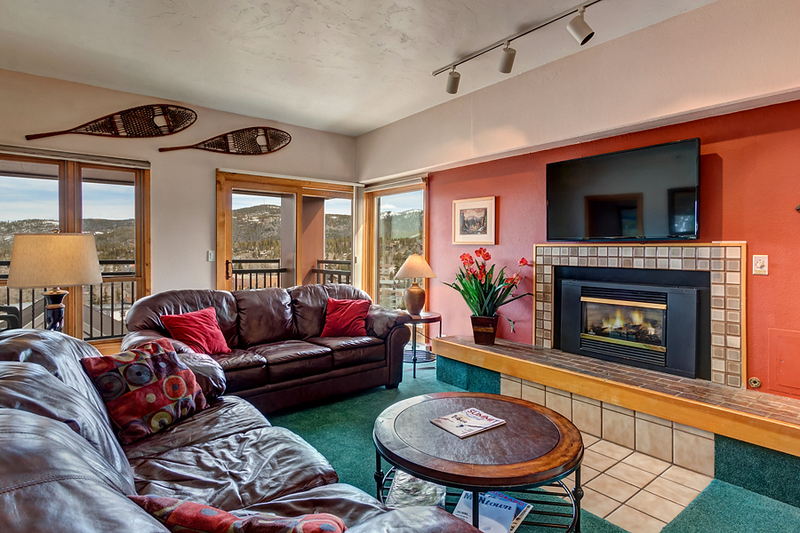 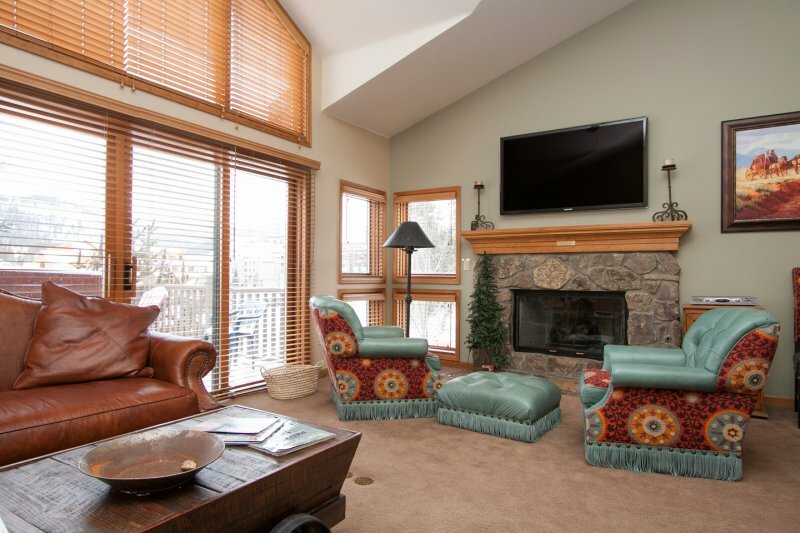 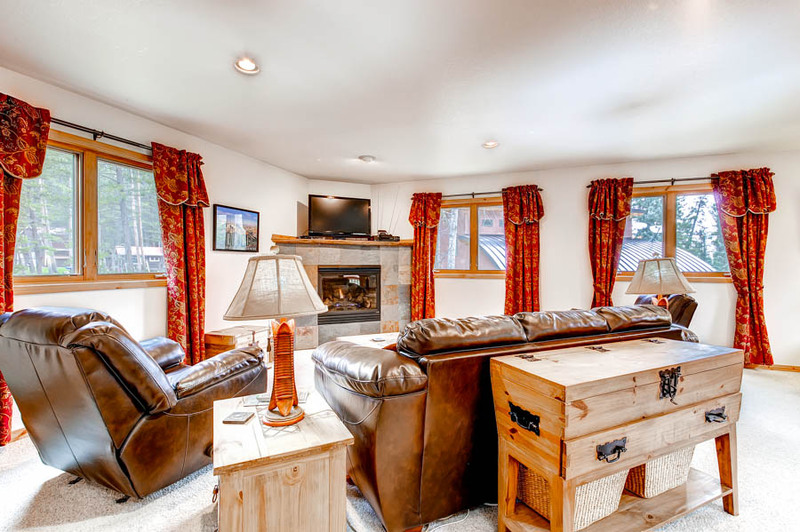 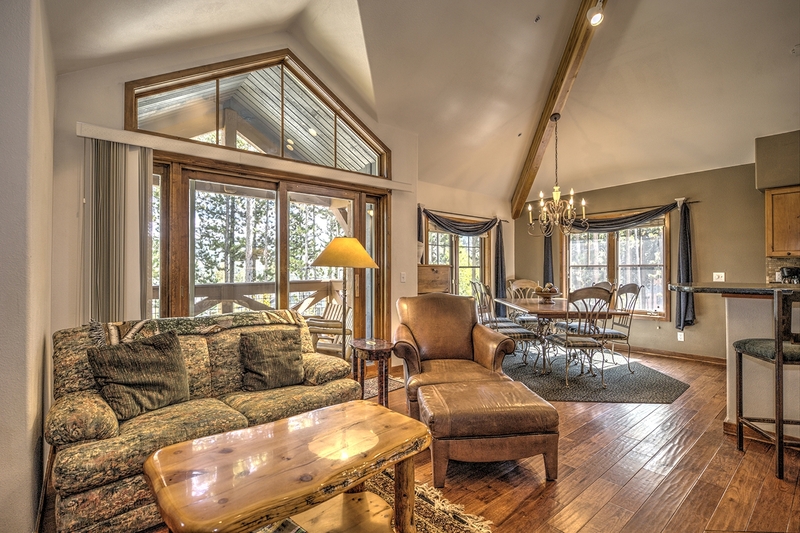 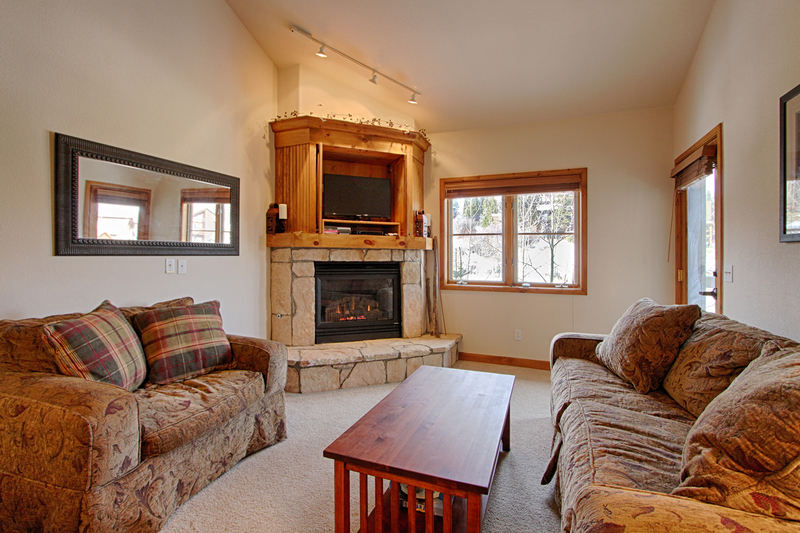 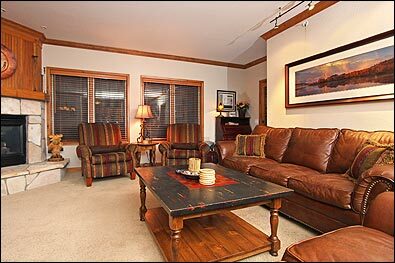 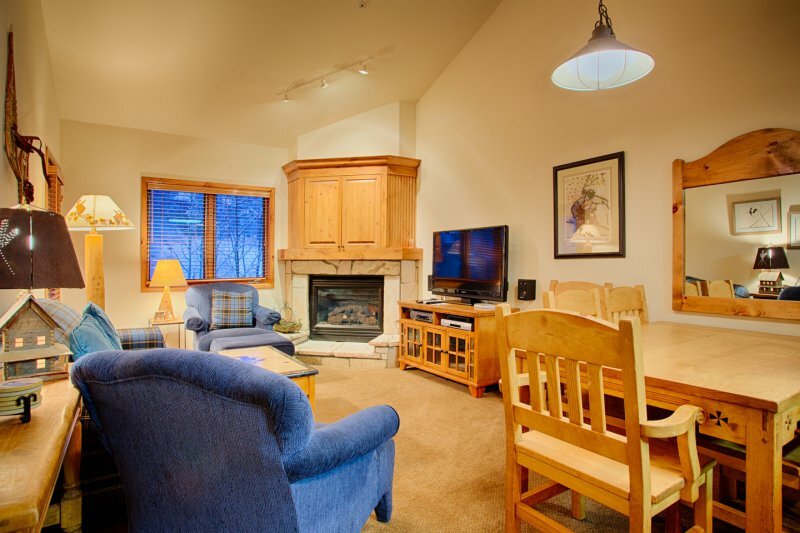 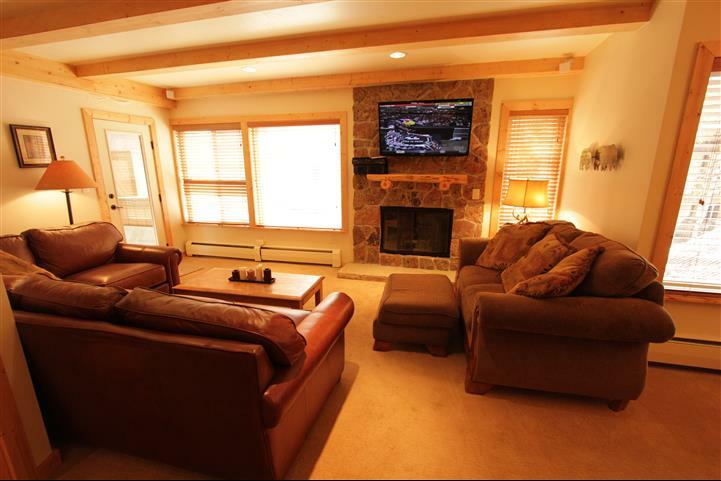 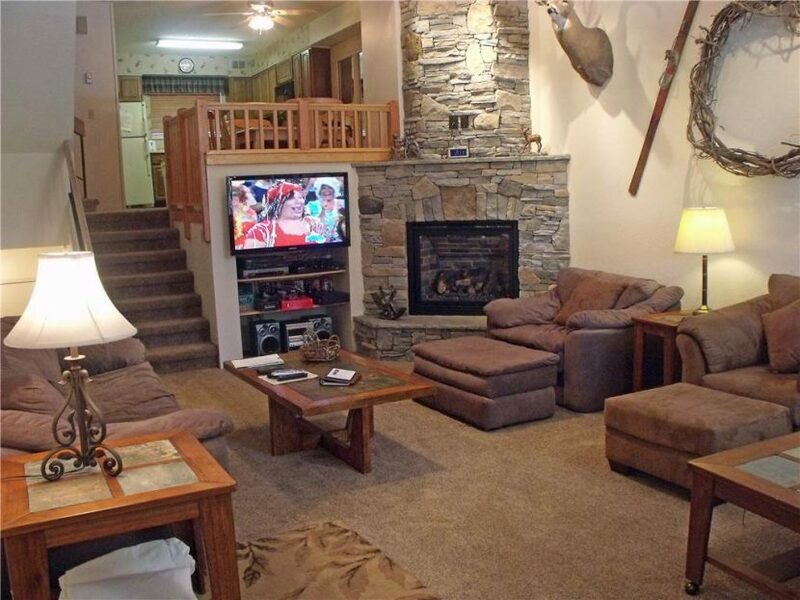 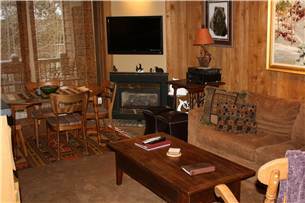 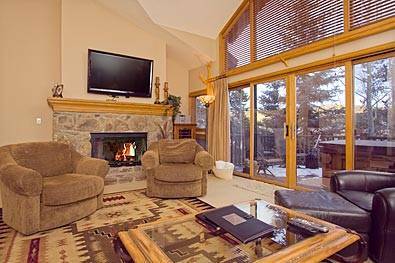 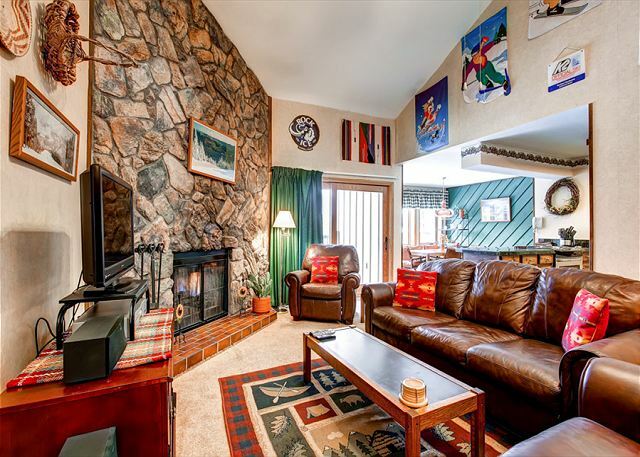 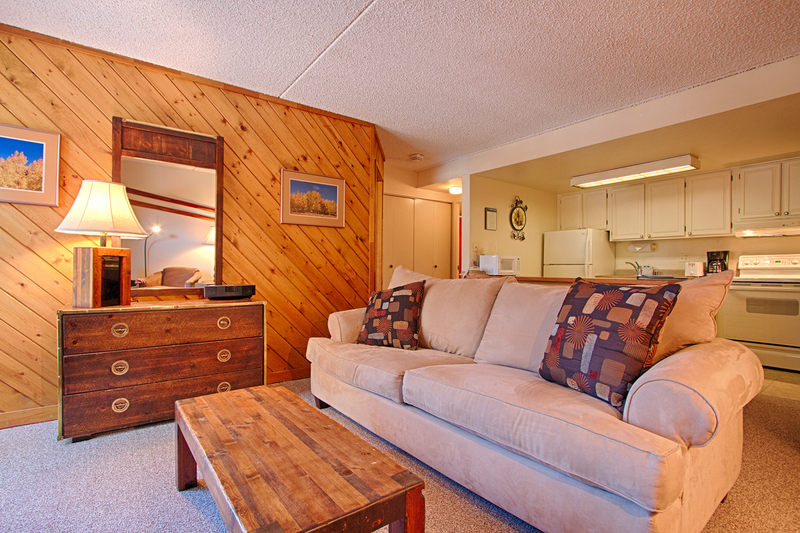 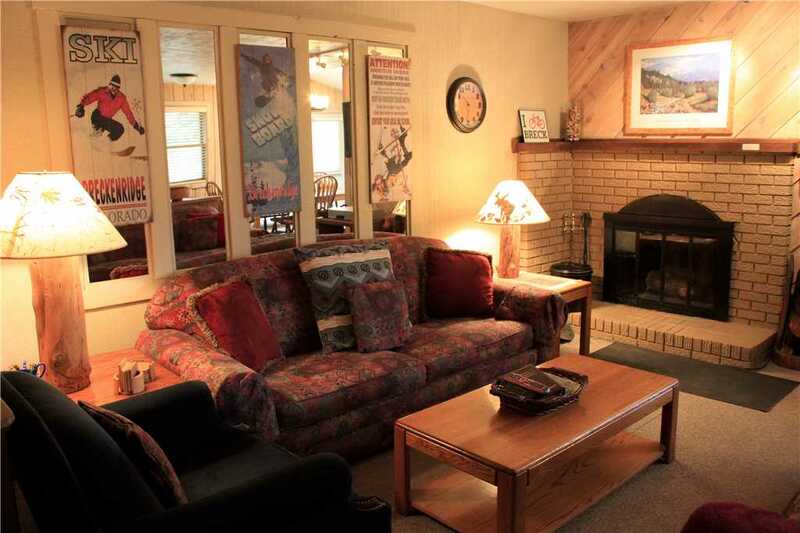 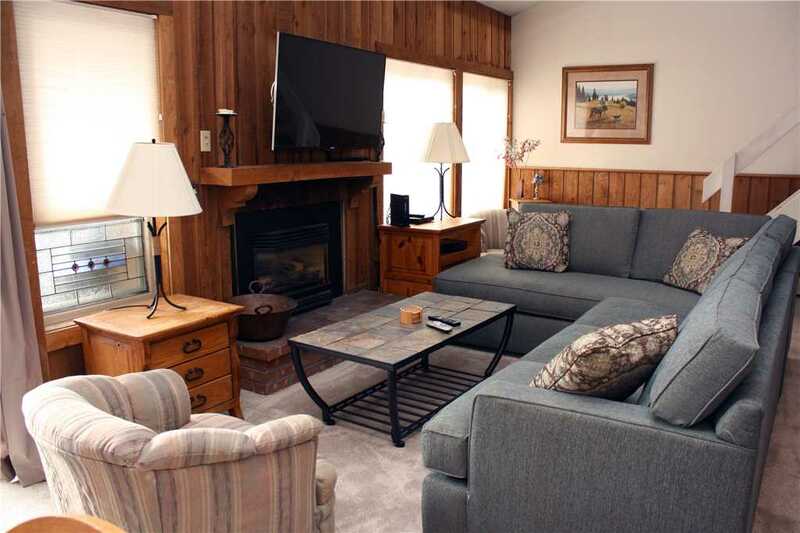 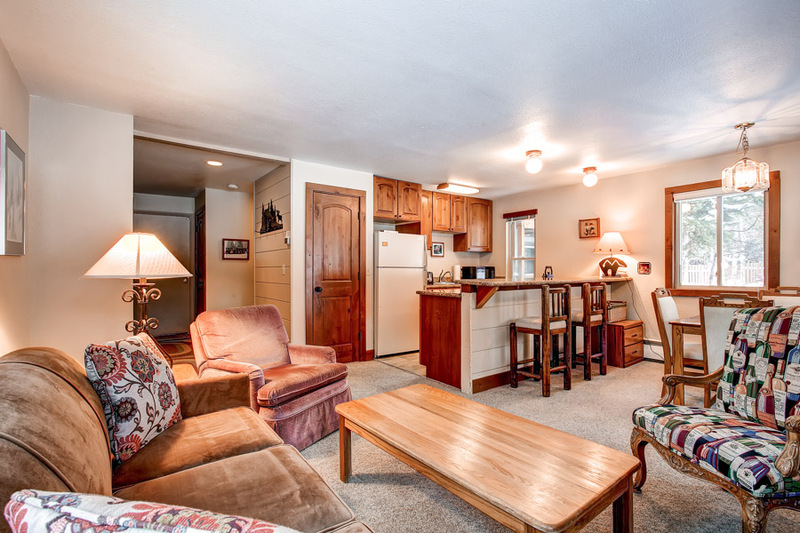 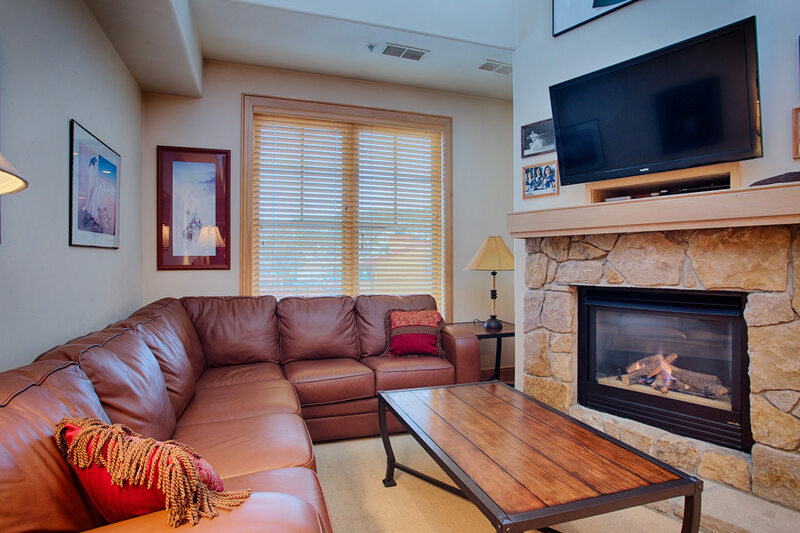 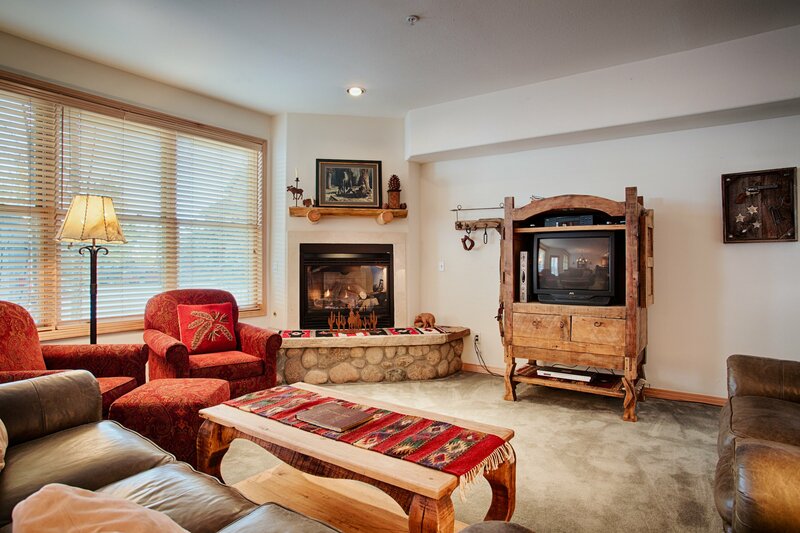 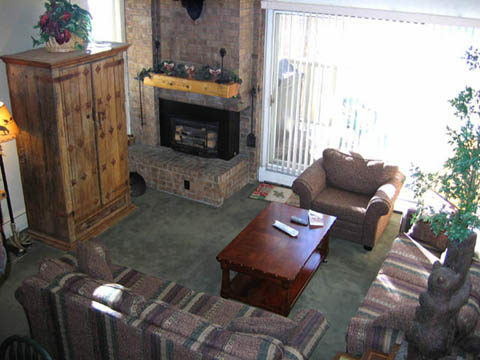 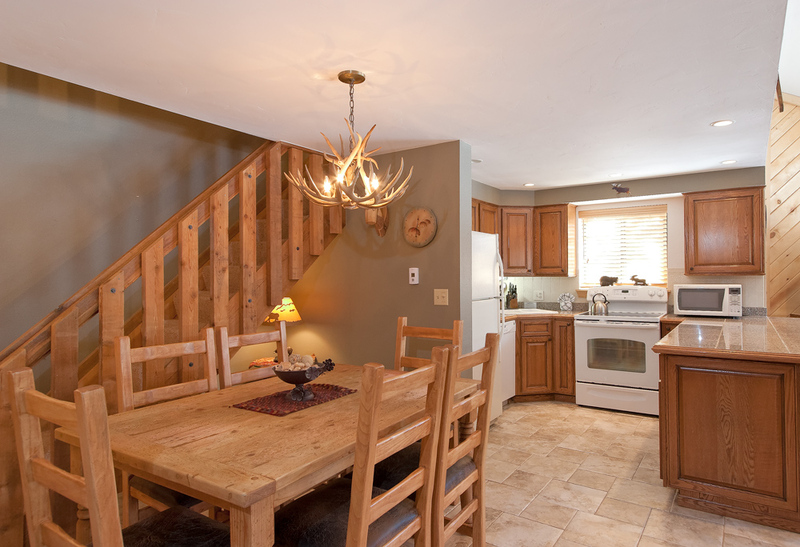 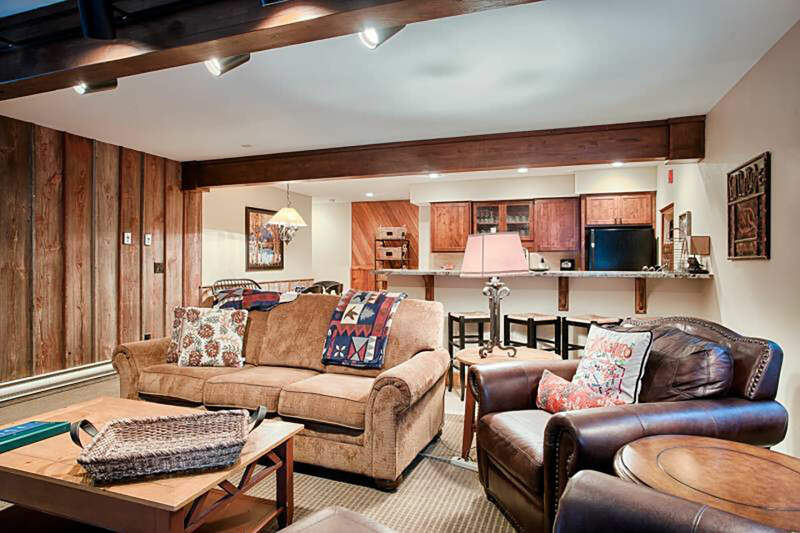 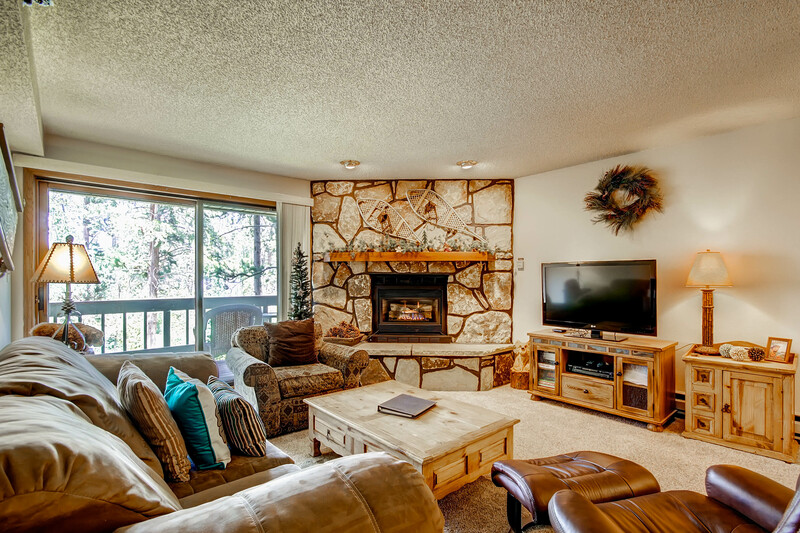 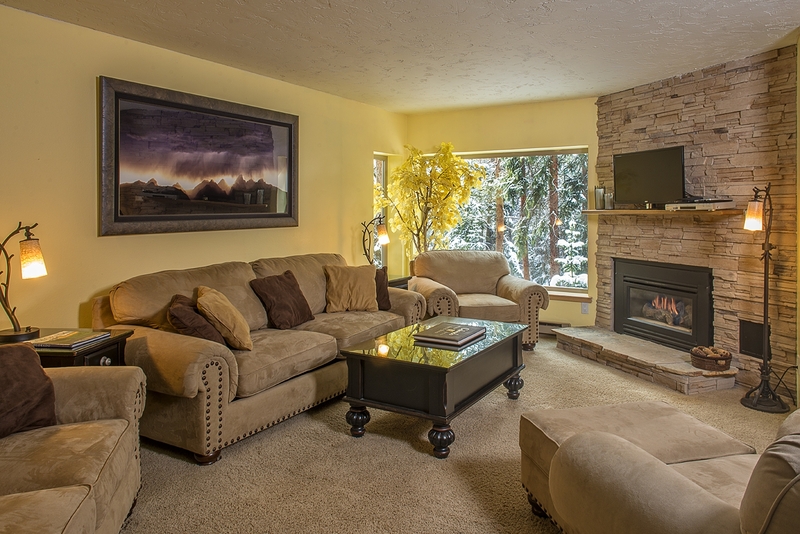 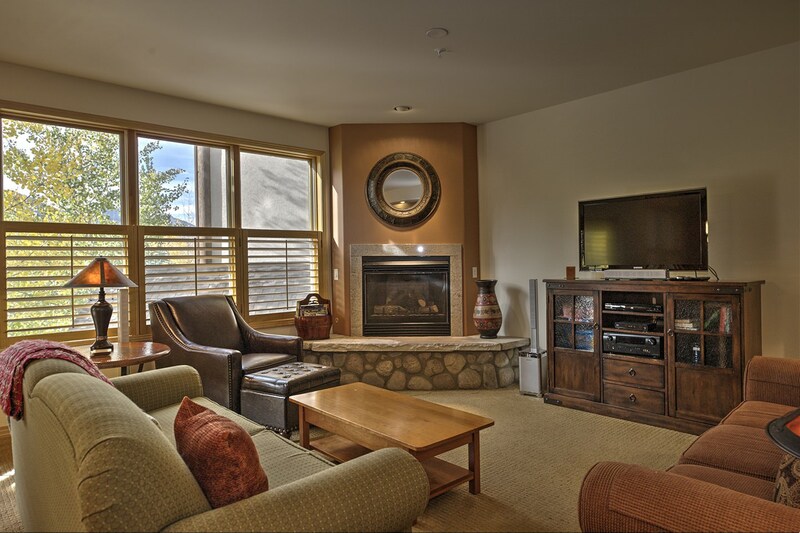 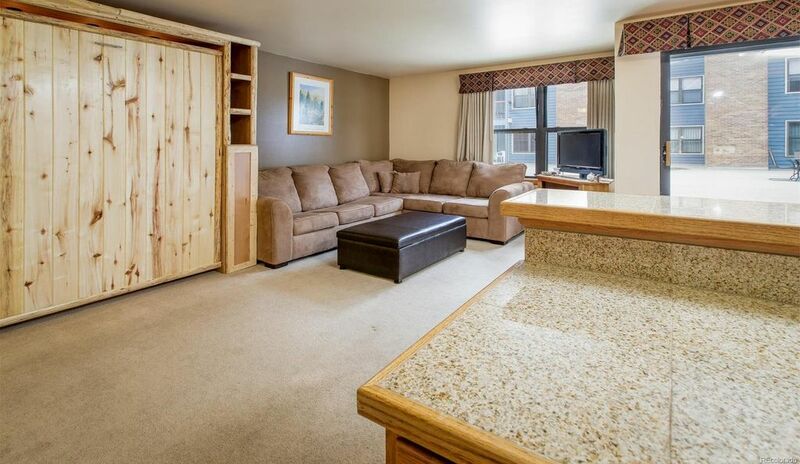 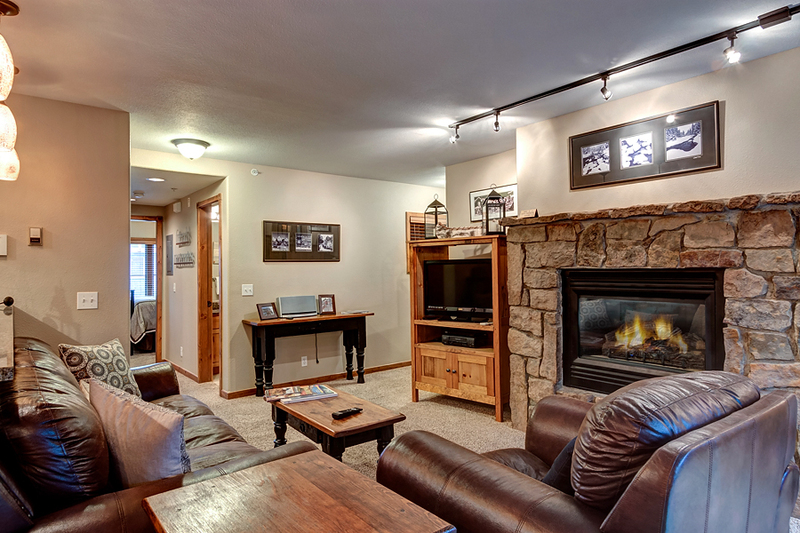 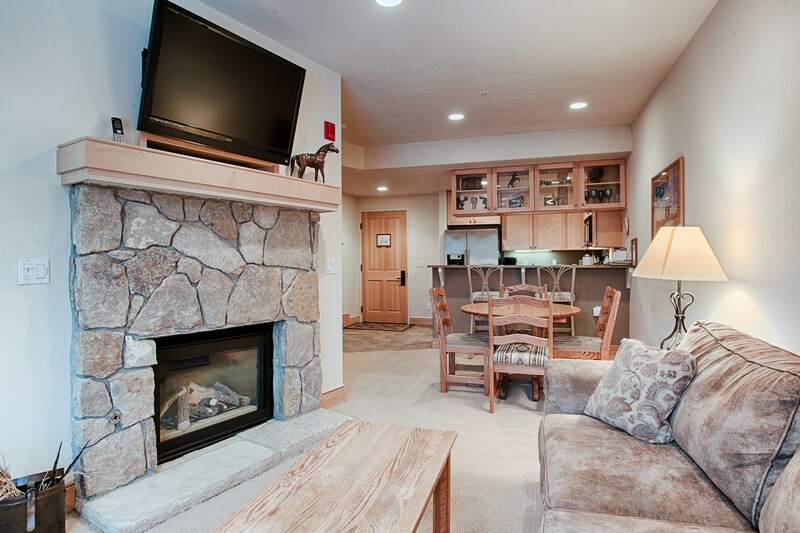 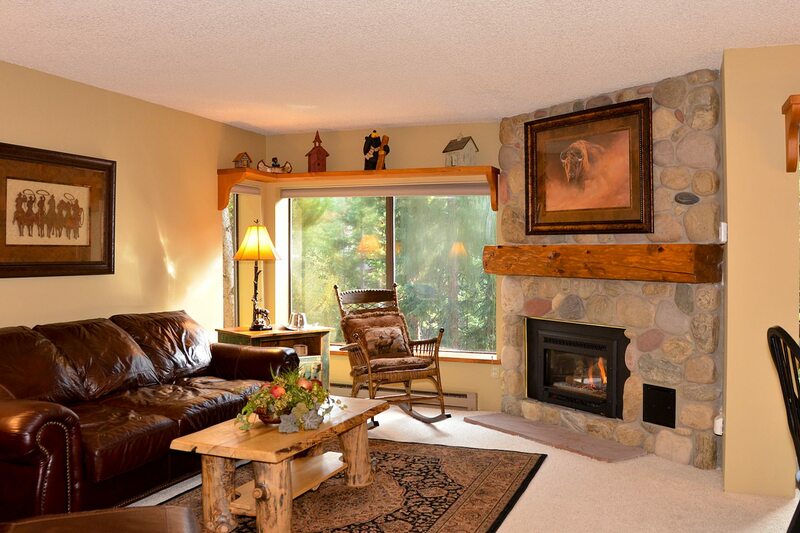 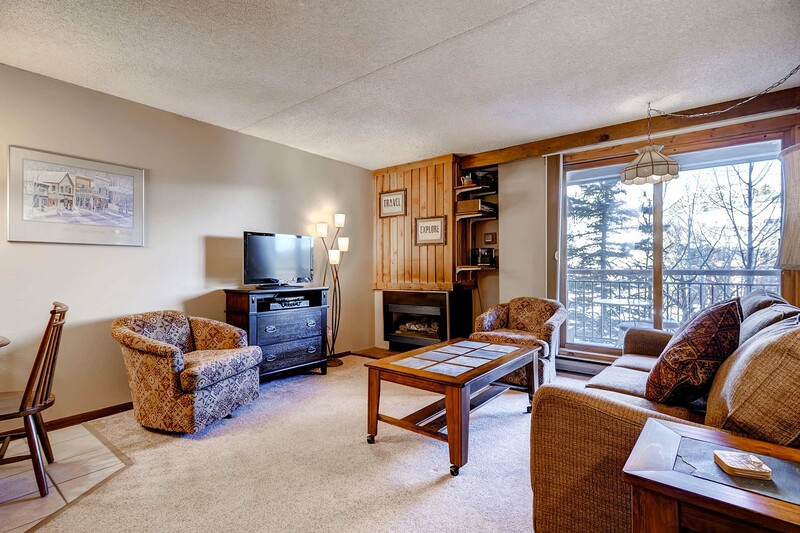 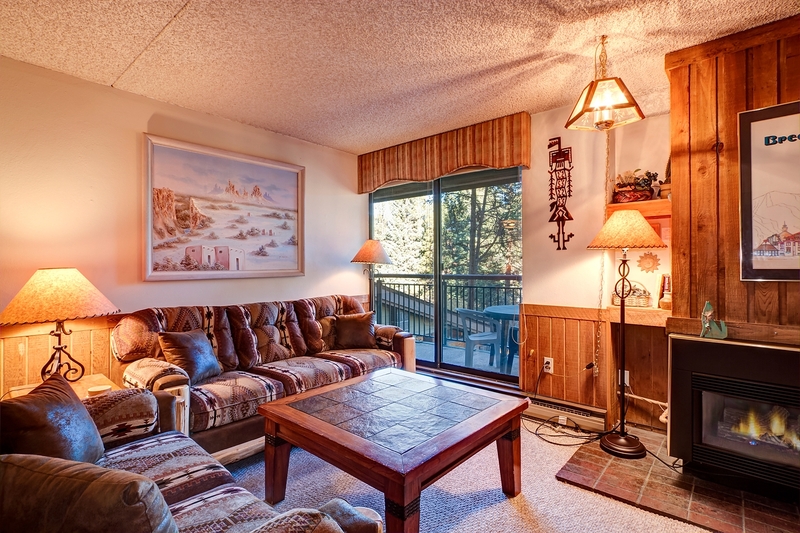 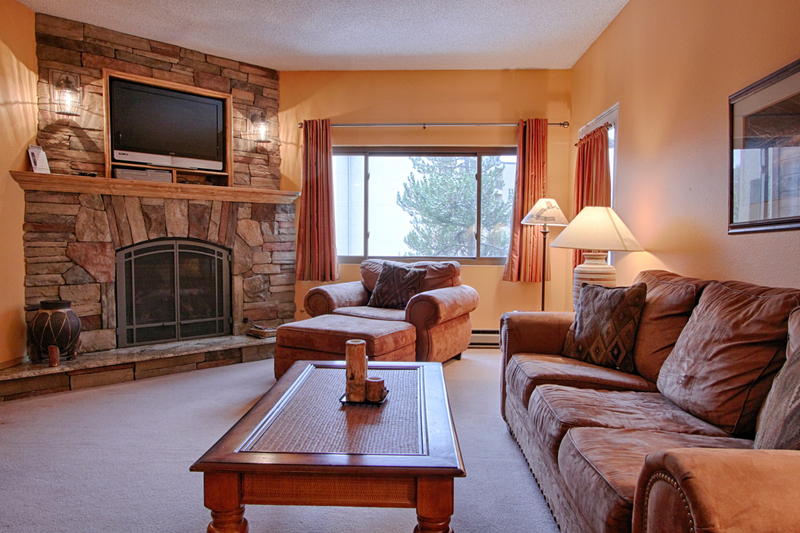 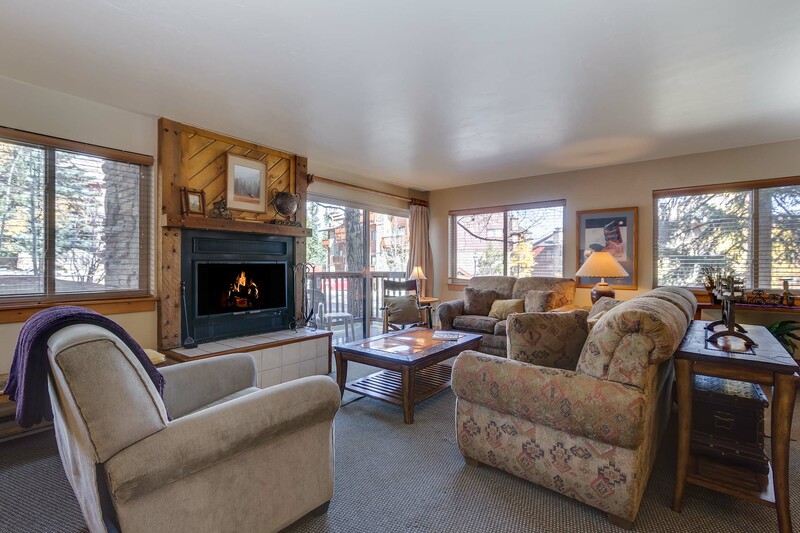 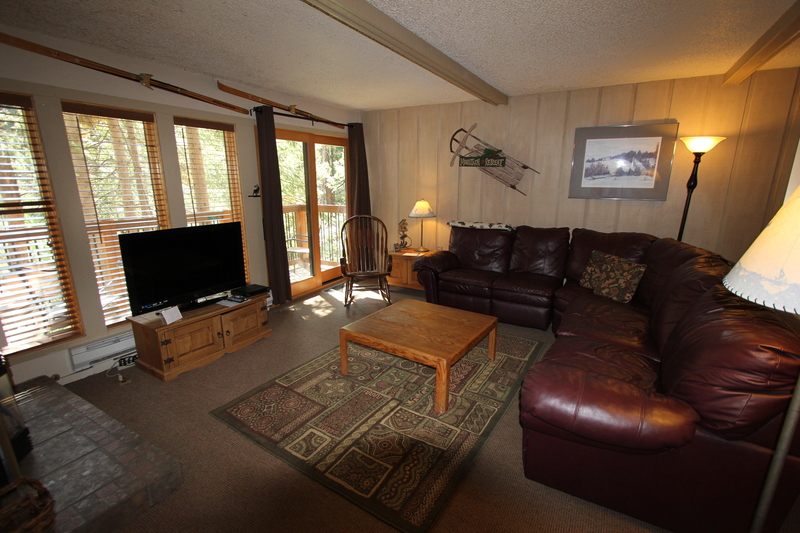 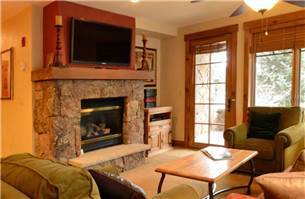 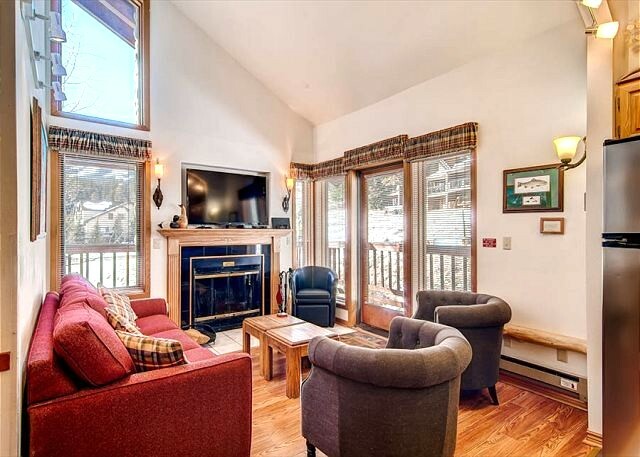 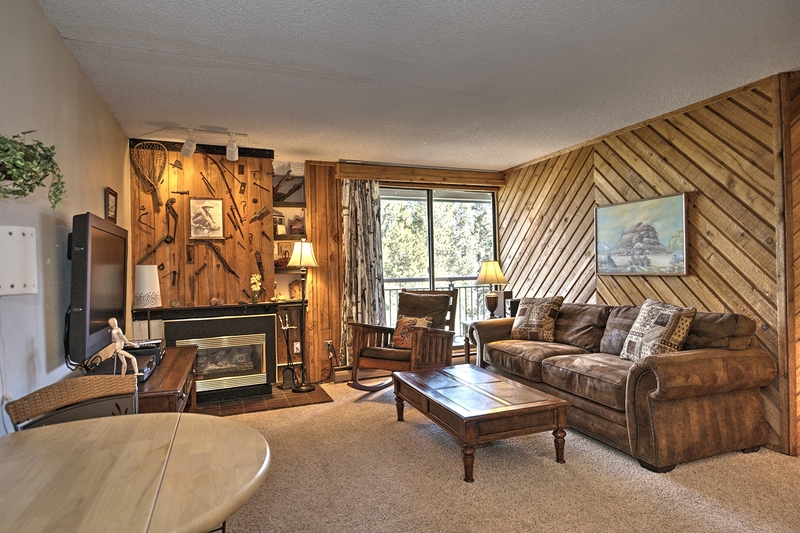 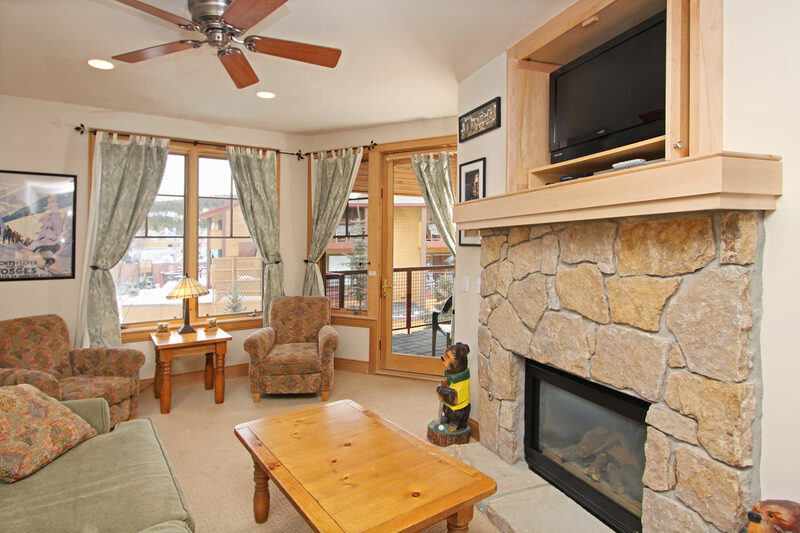 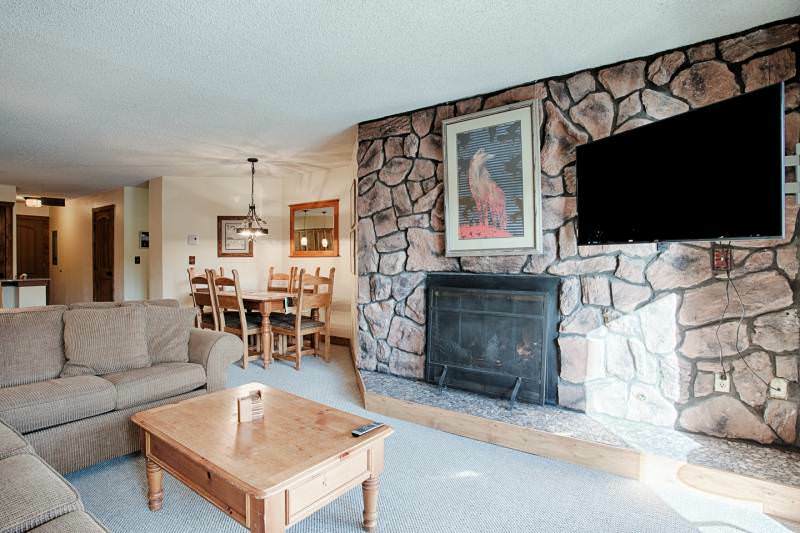 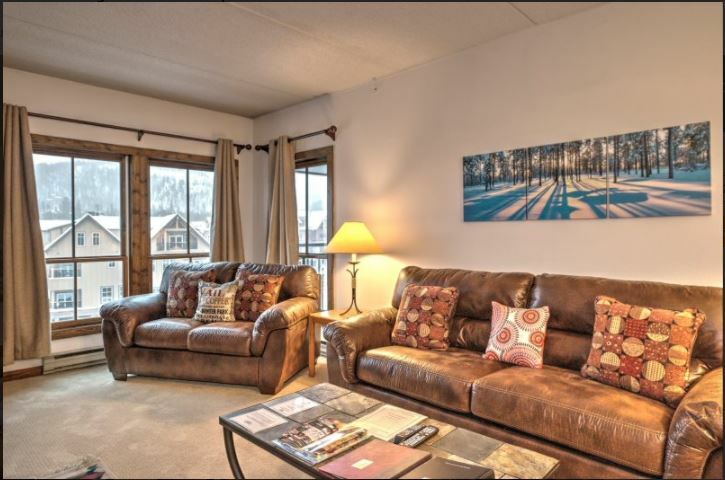 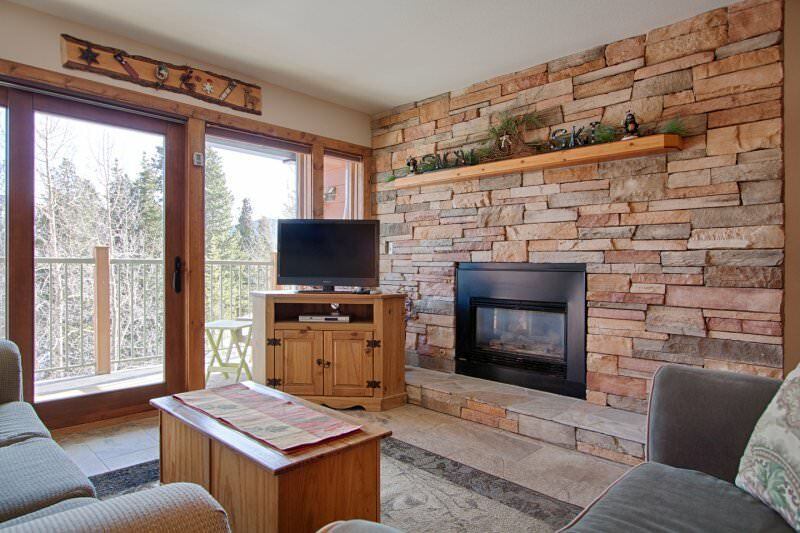 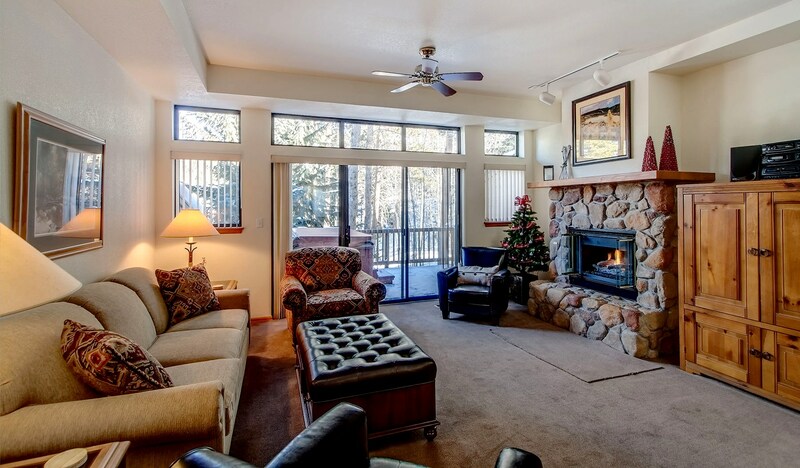 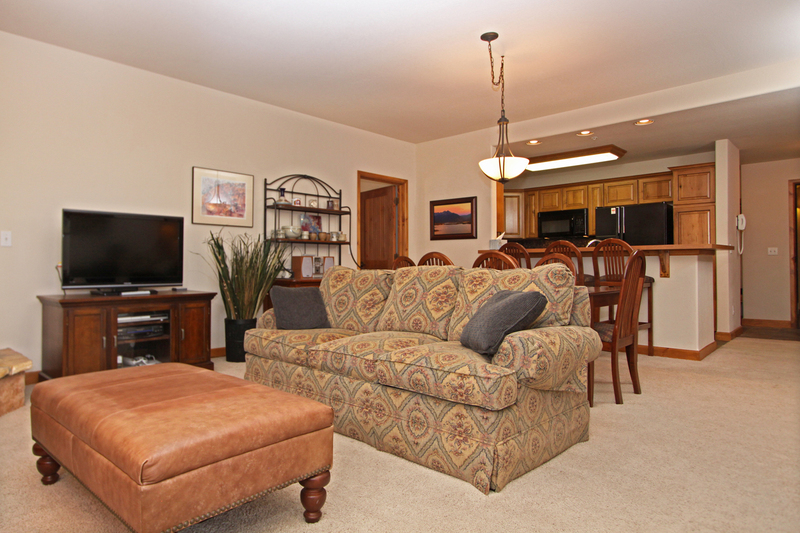 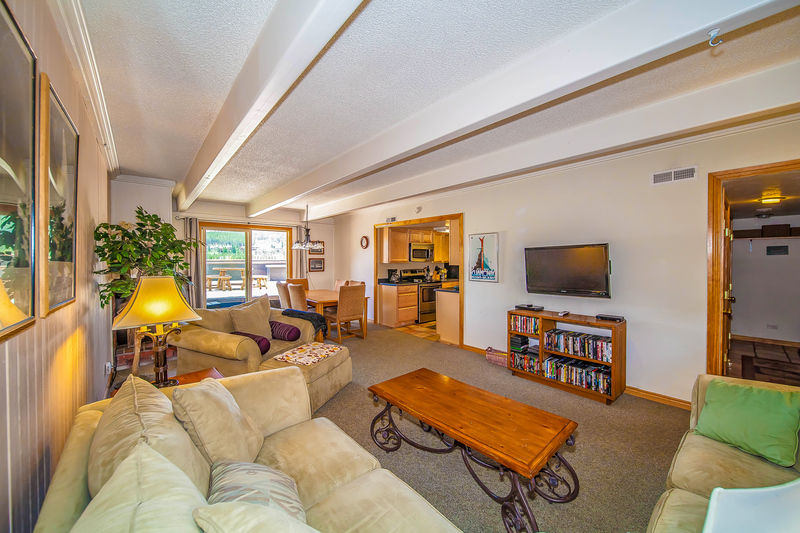 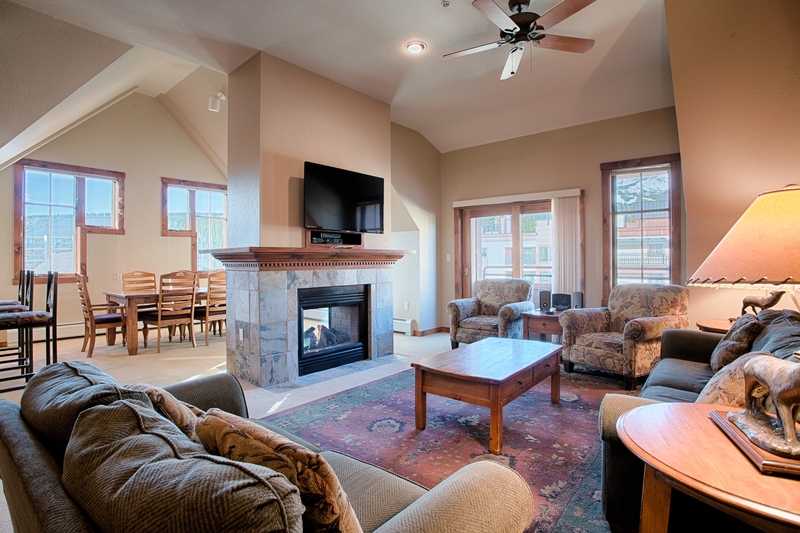 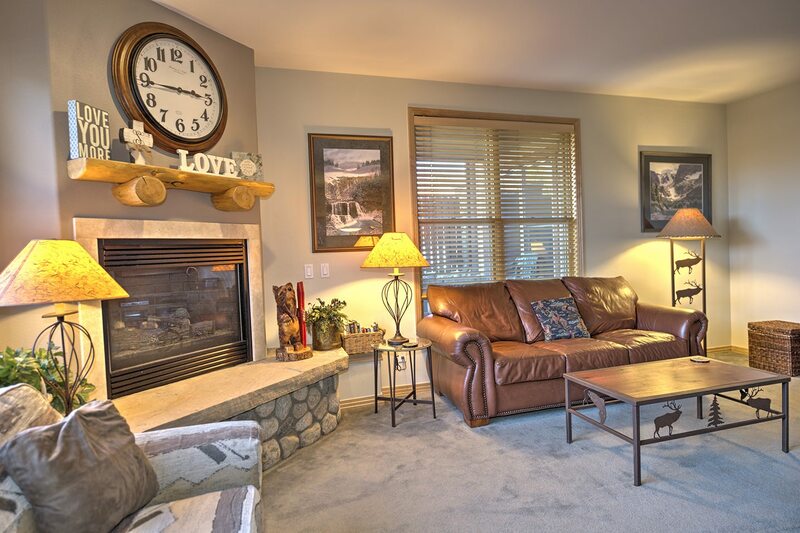 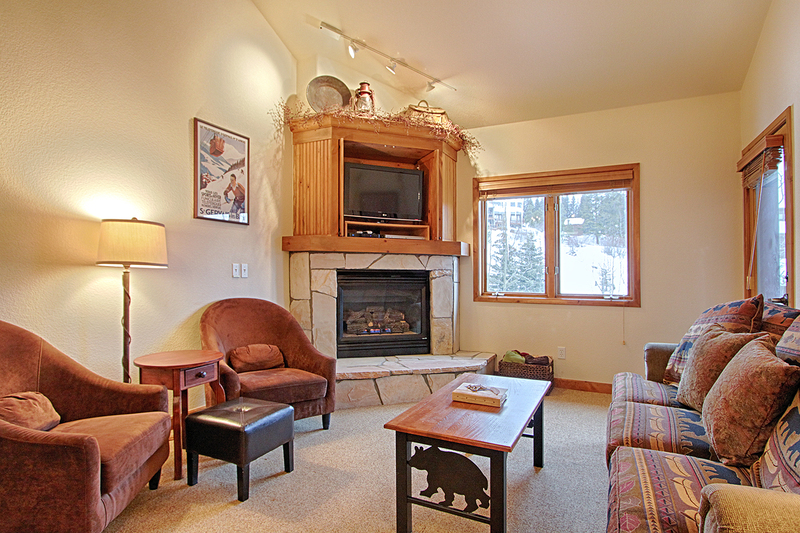 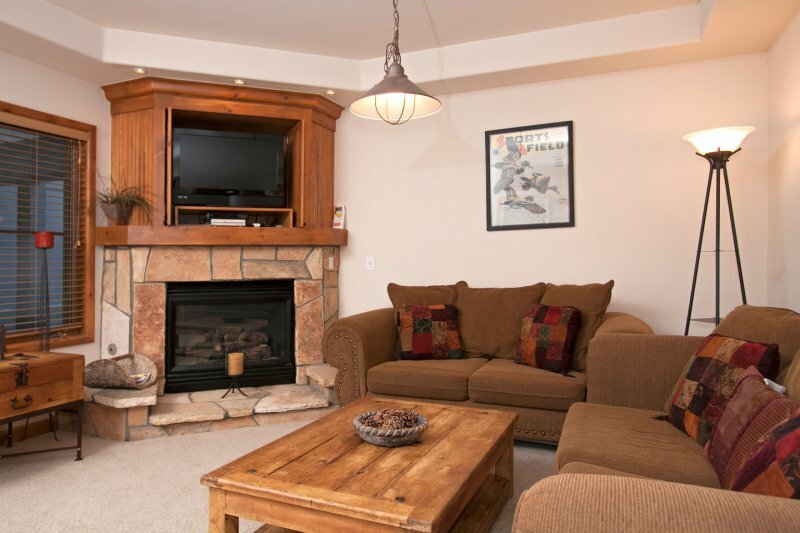 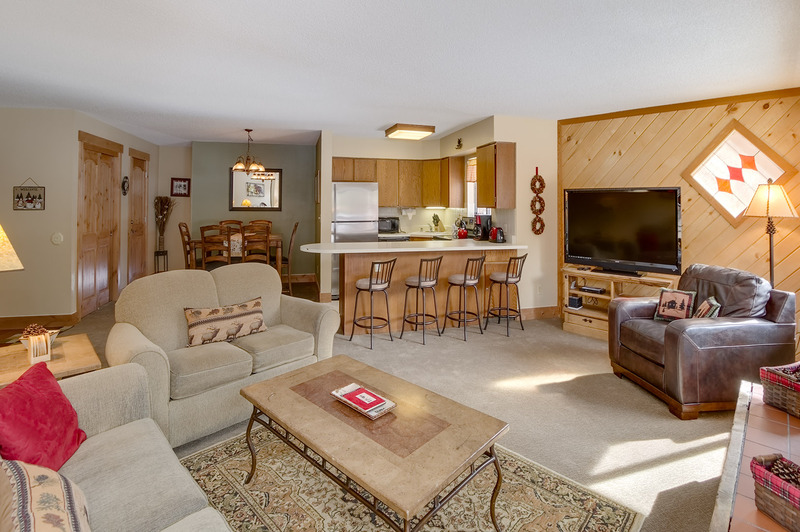 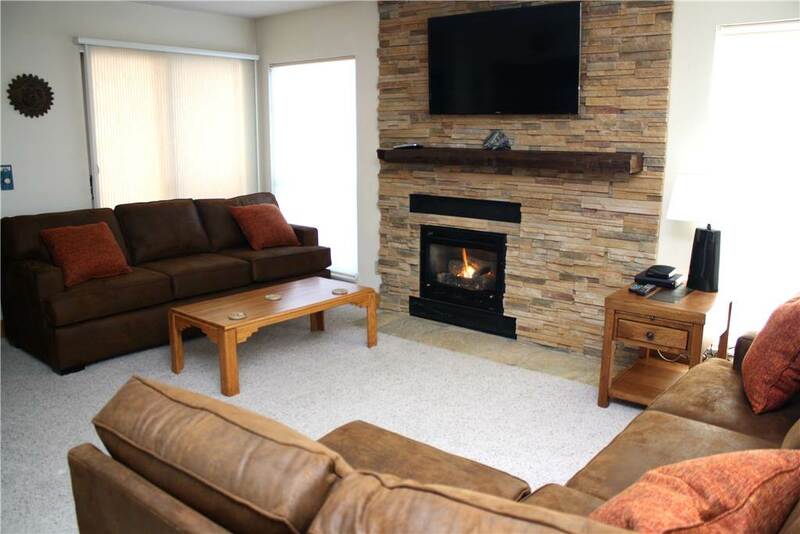 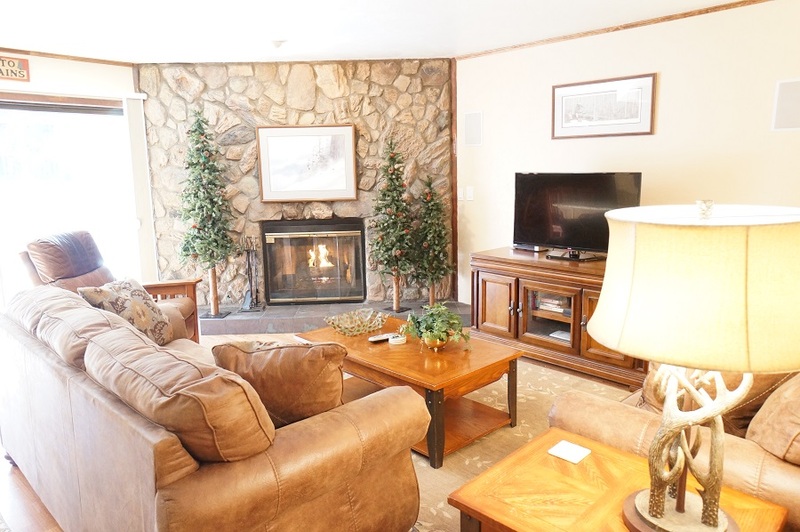 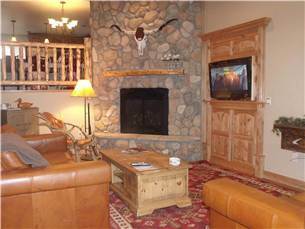 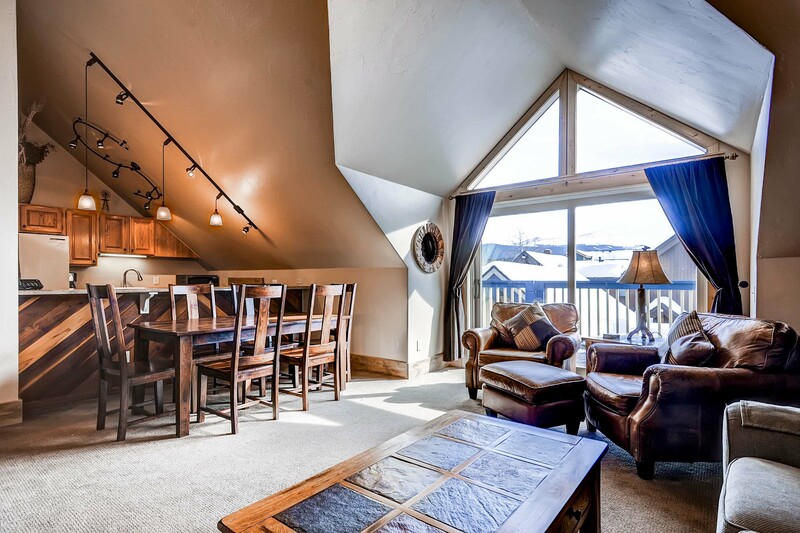 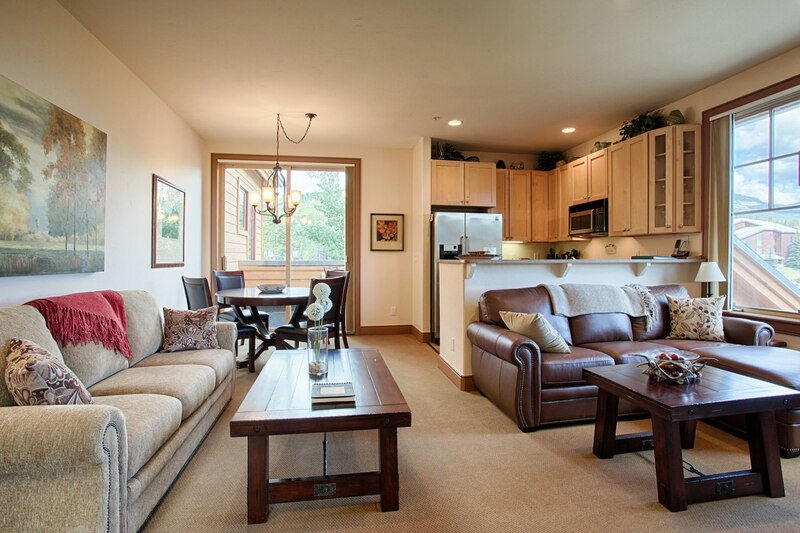 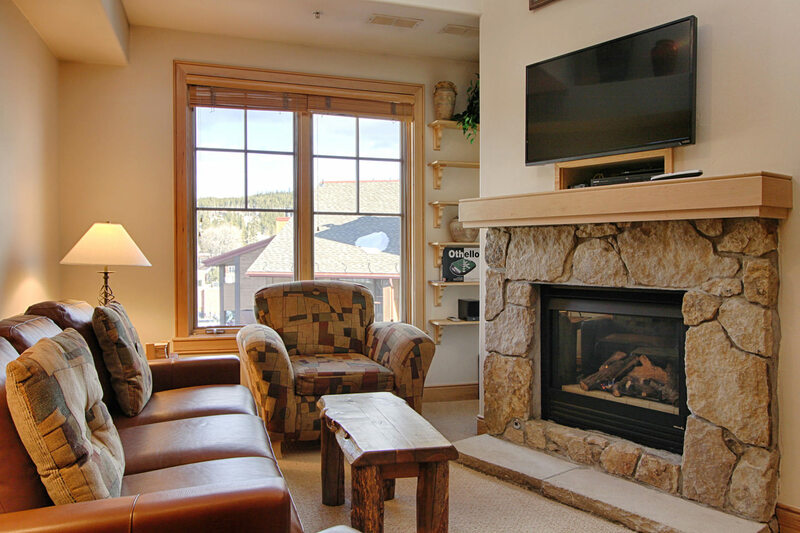 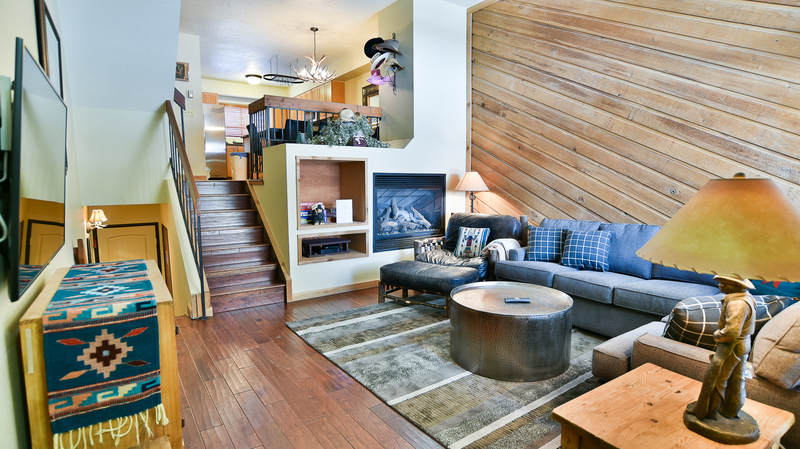 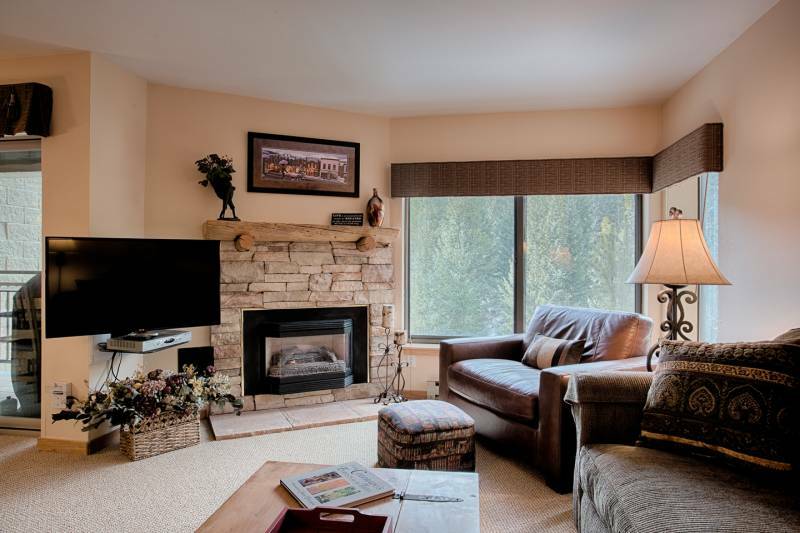 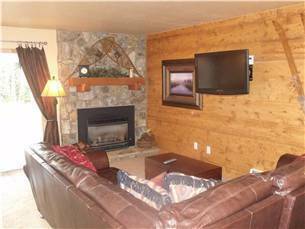 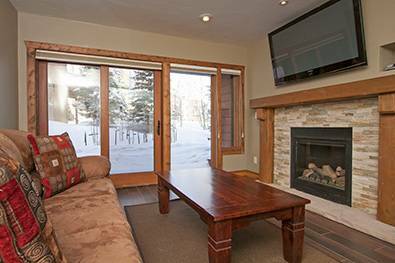 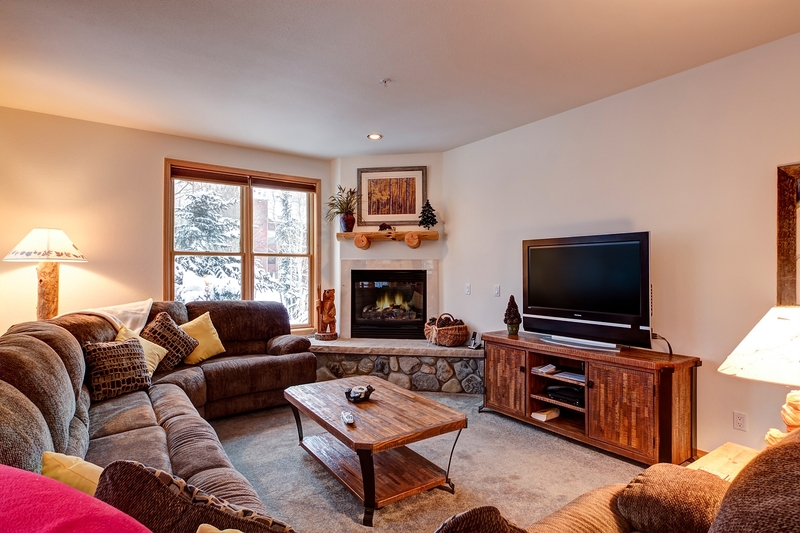 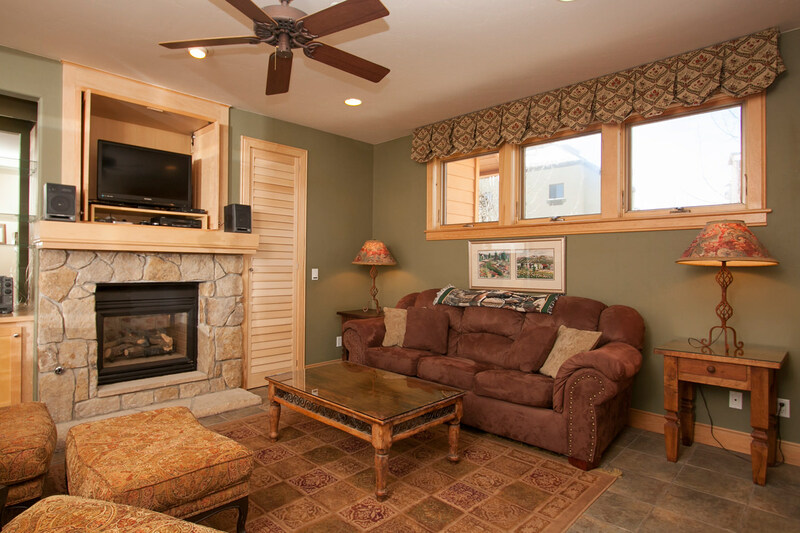 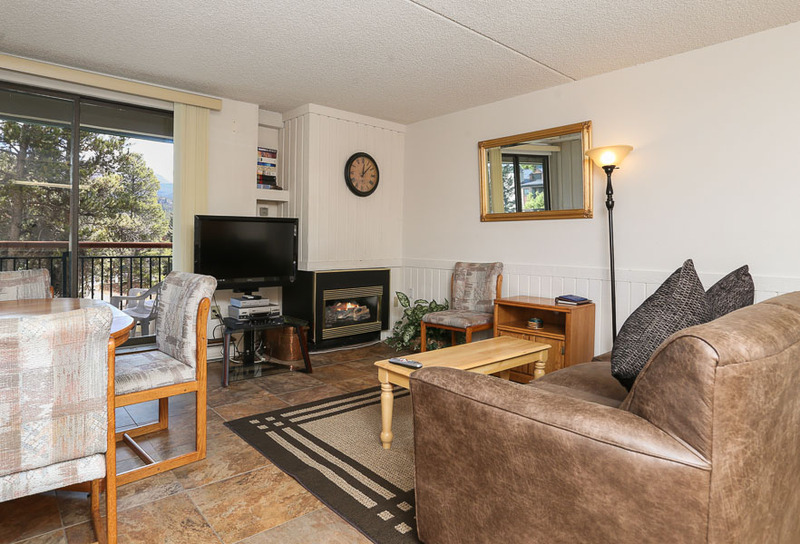 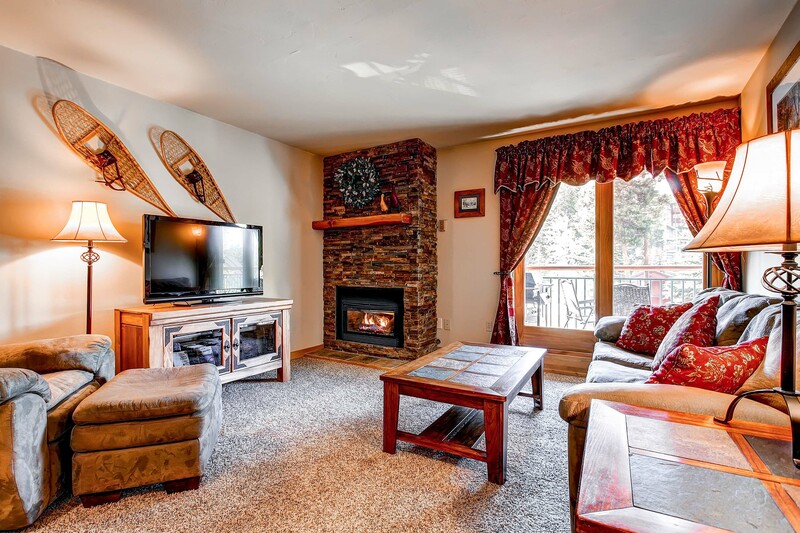 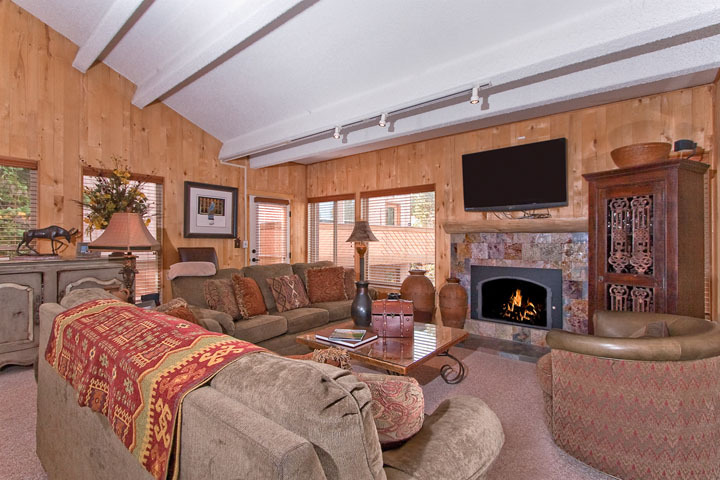 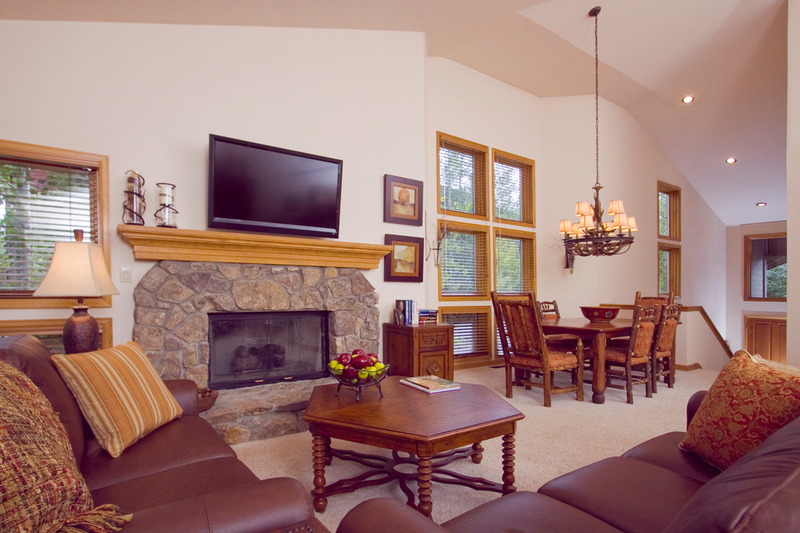 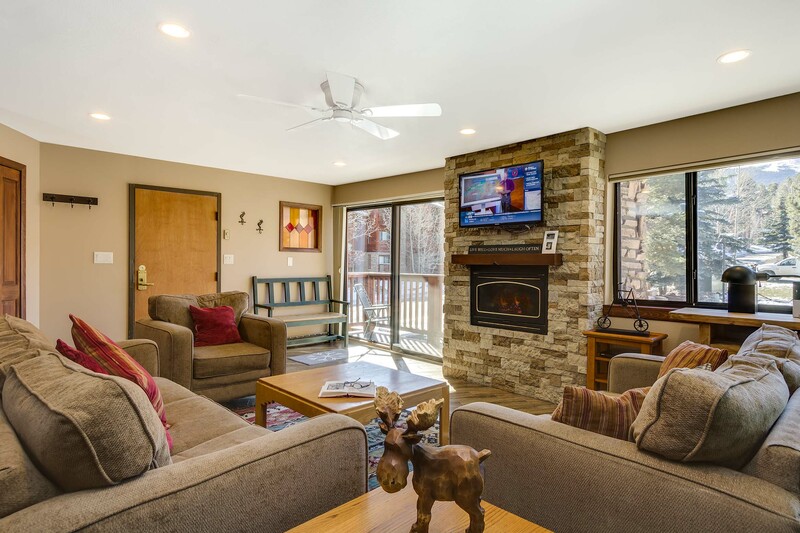 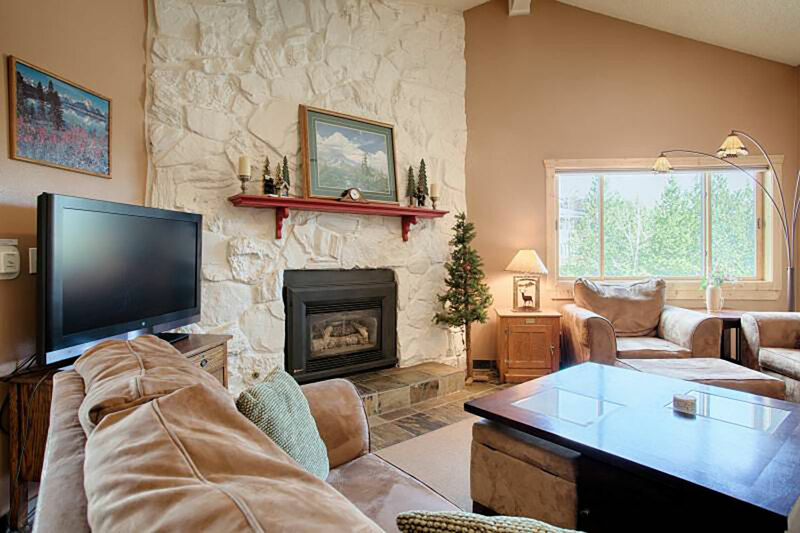 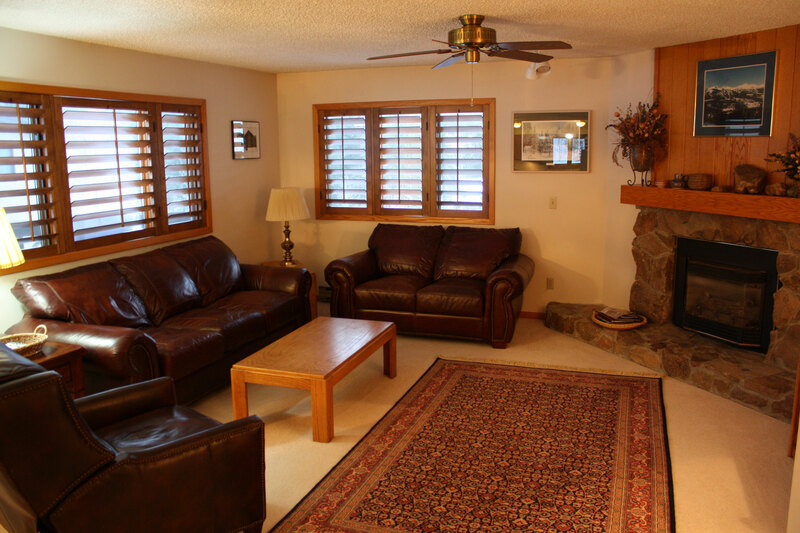 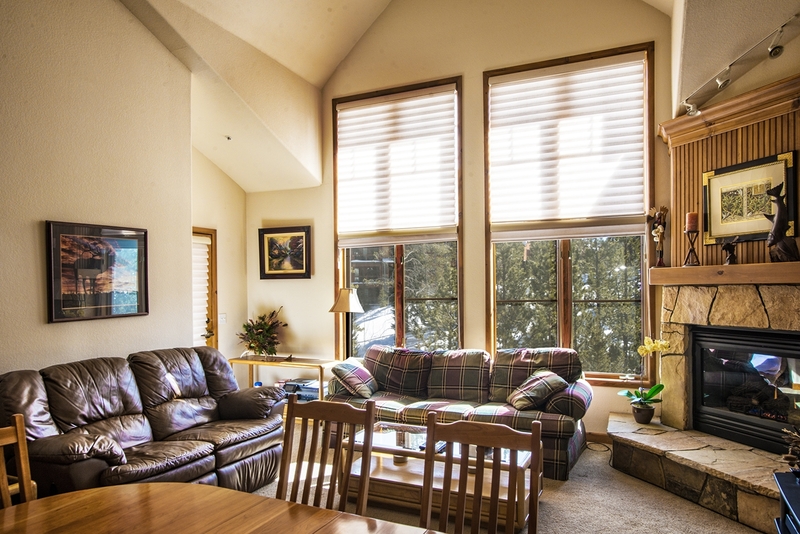 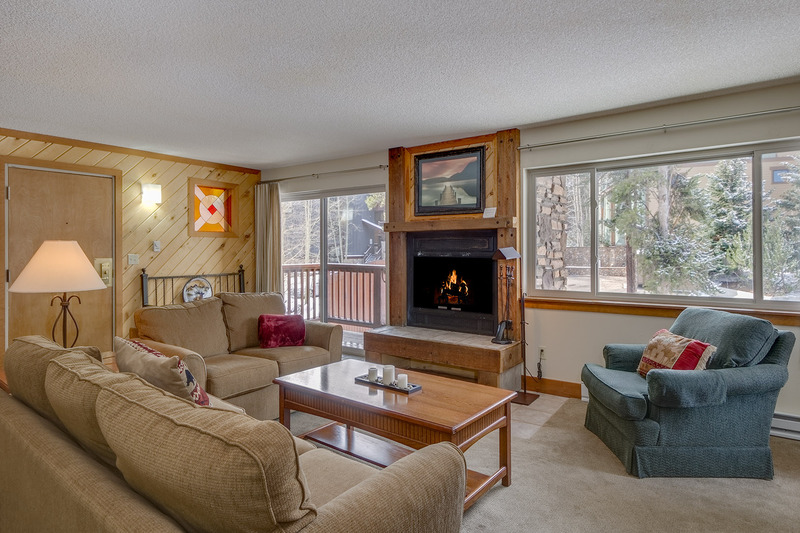 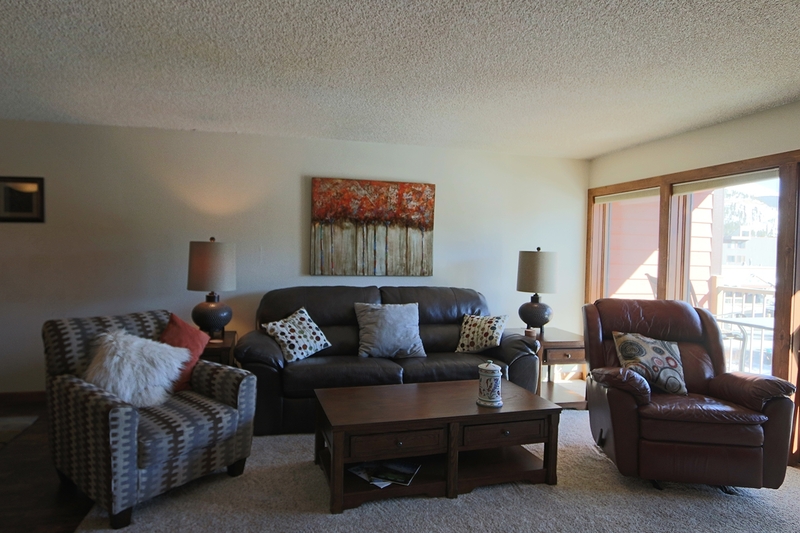 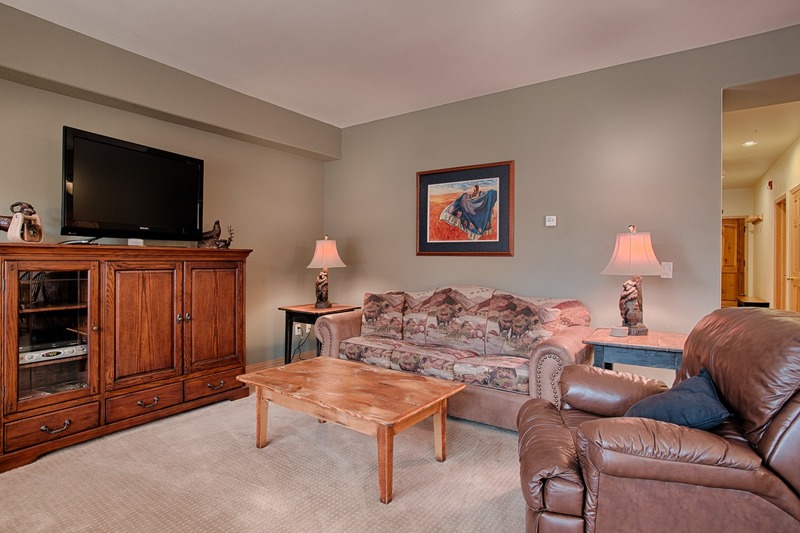 Call us today to book a fantastic mountain getaway at Gold Flake Chalet! 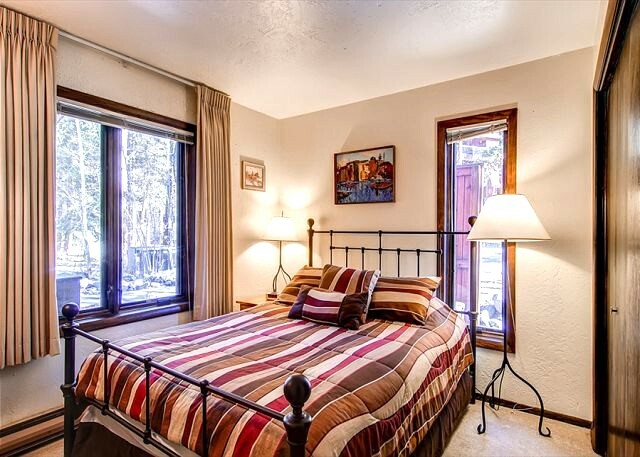 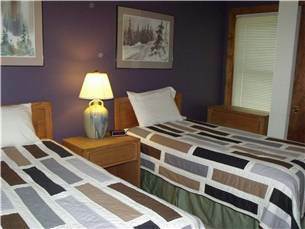 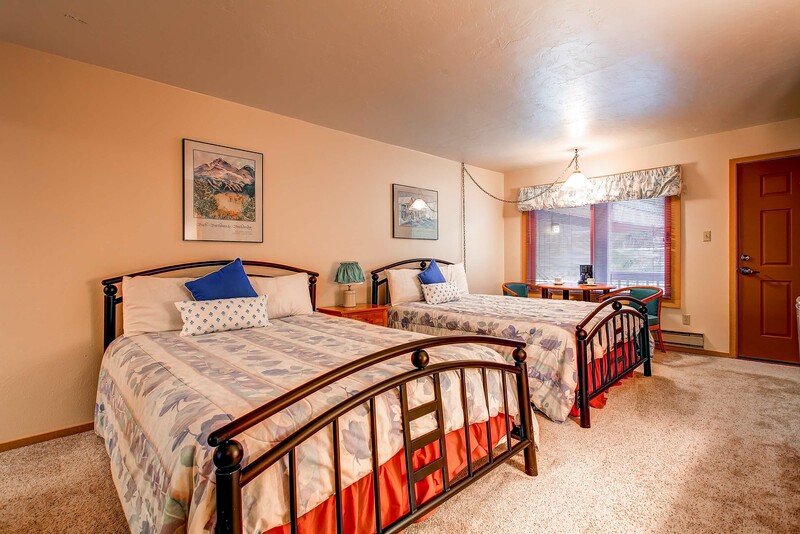 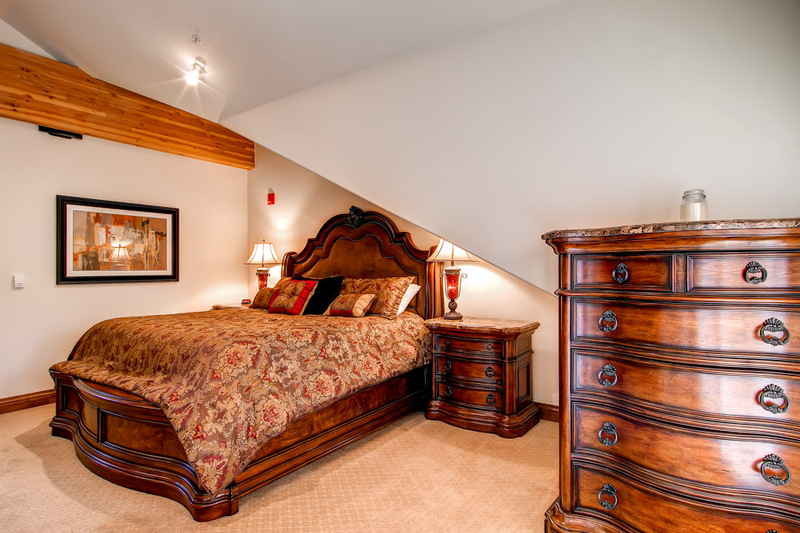 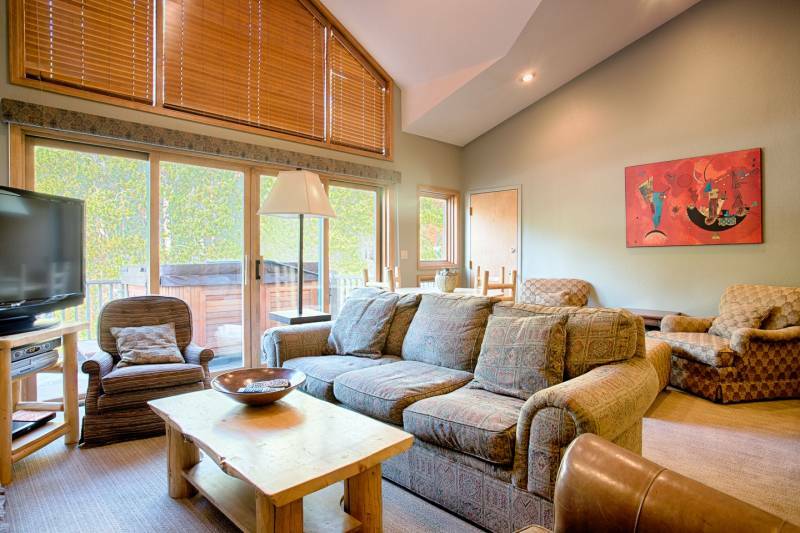 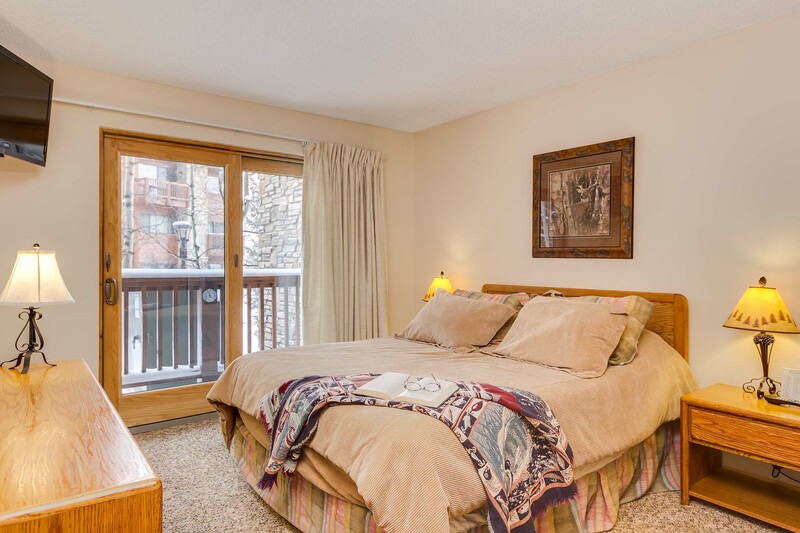 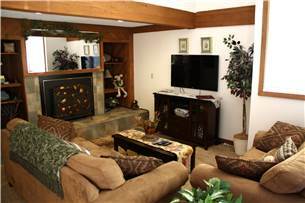 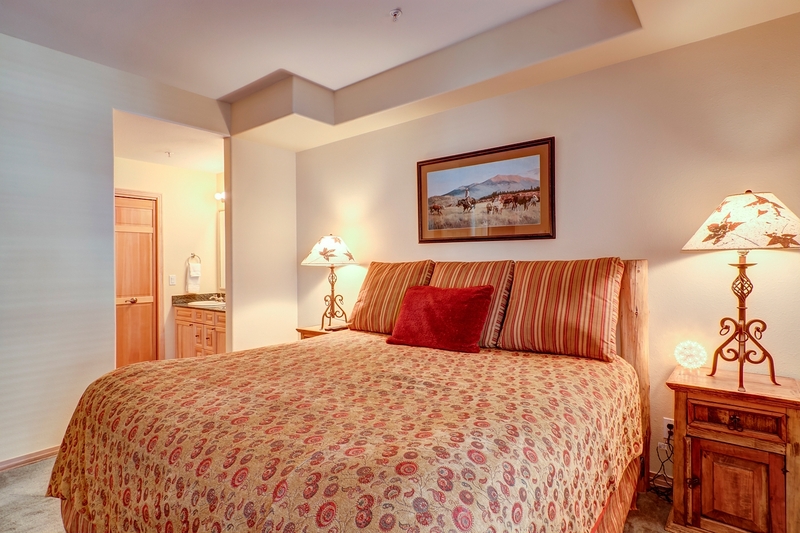 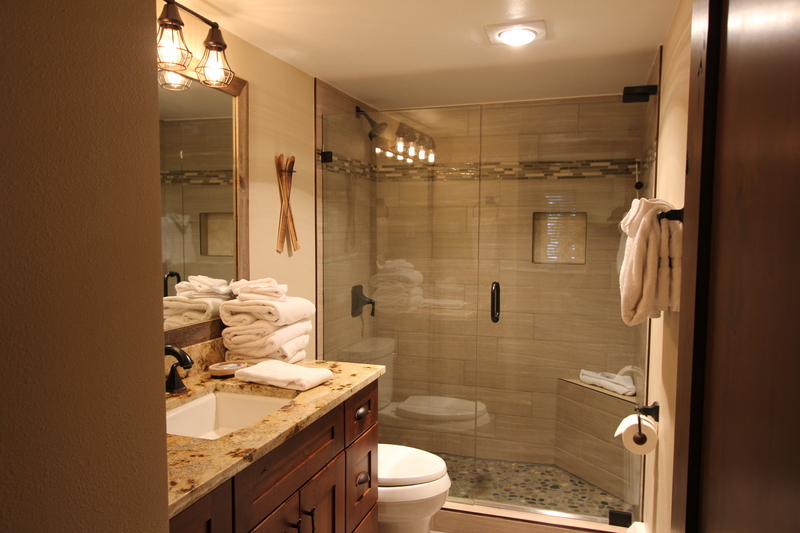 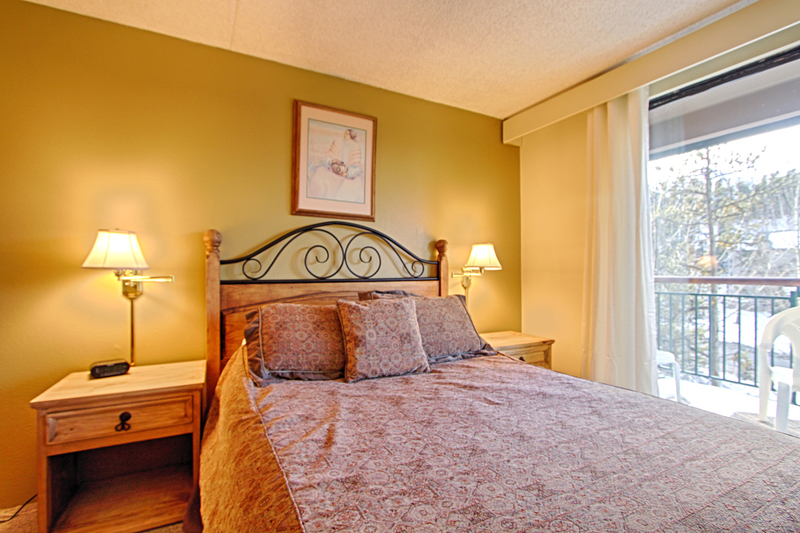 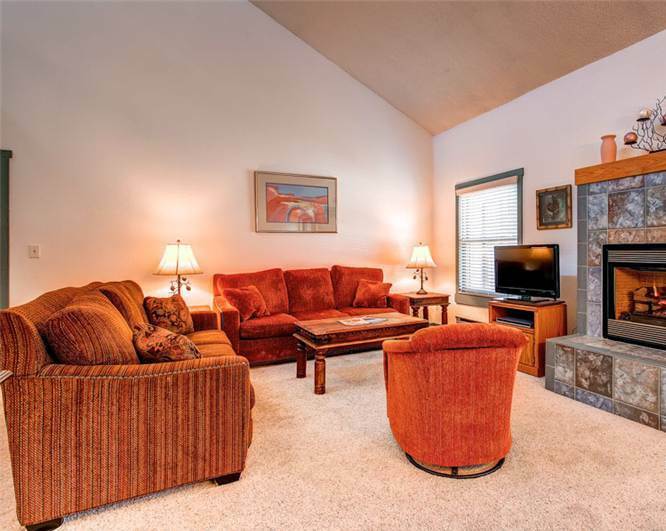 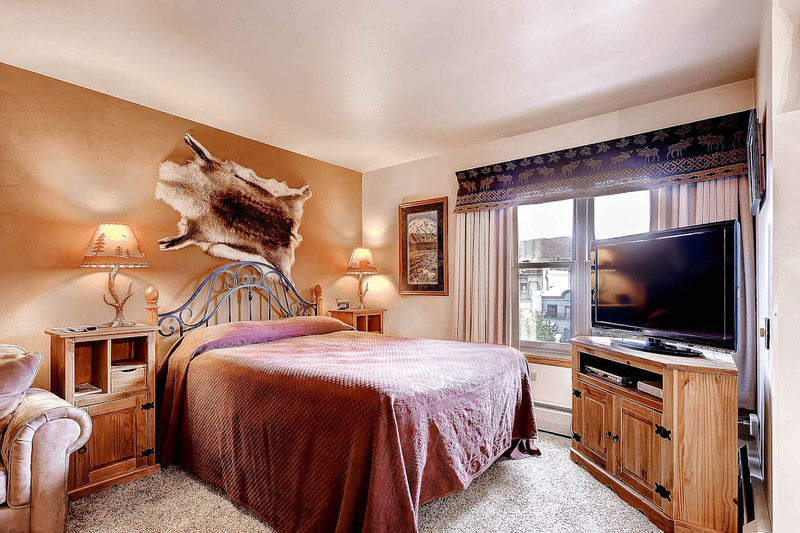 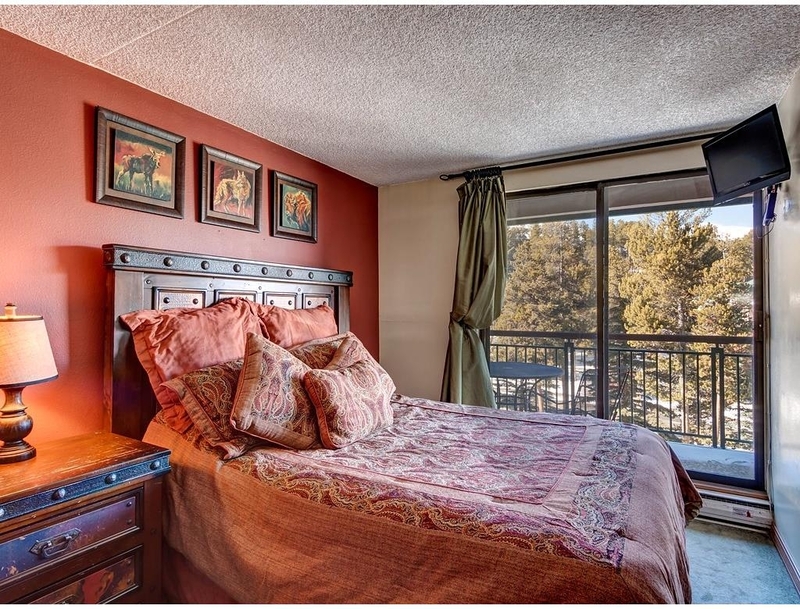 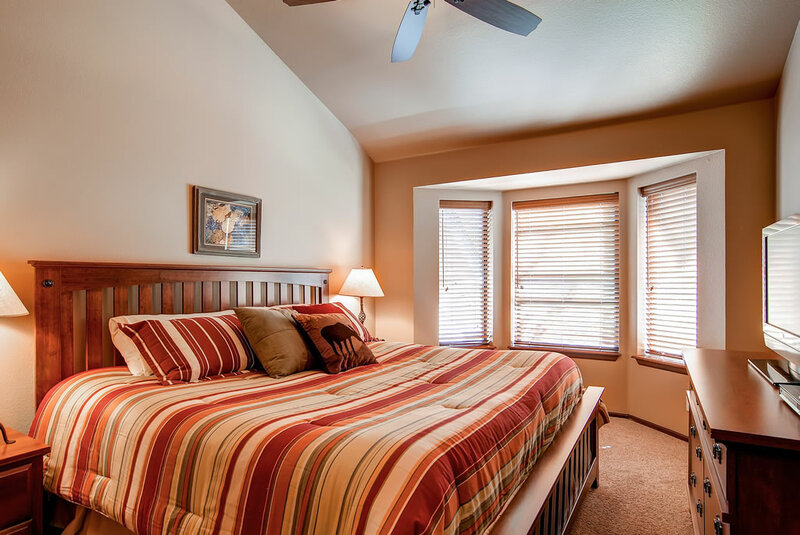 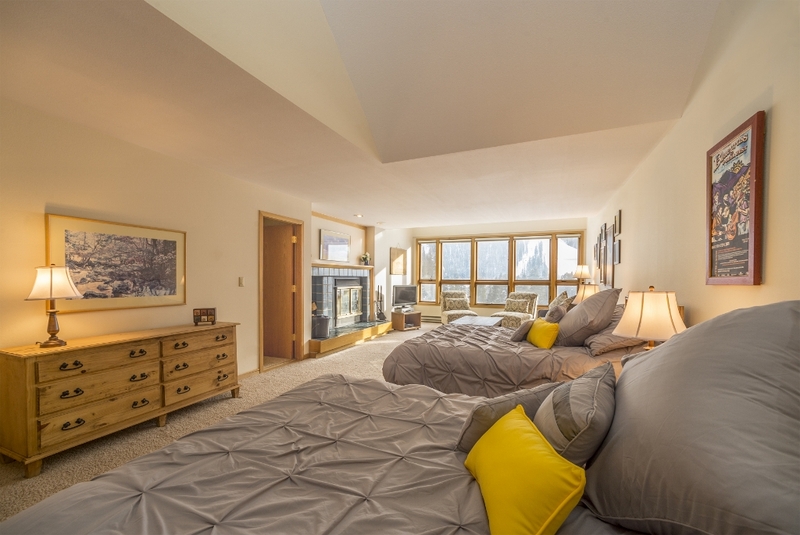 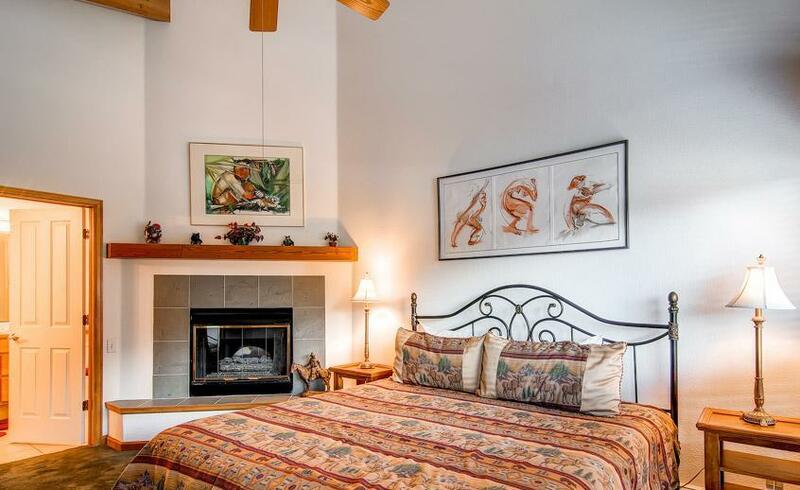 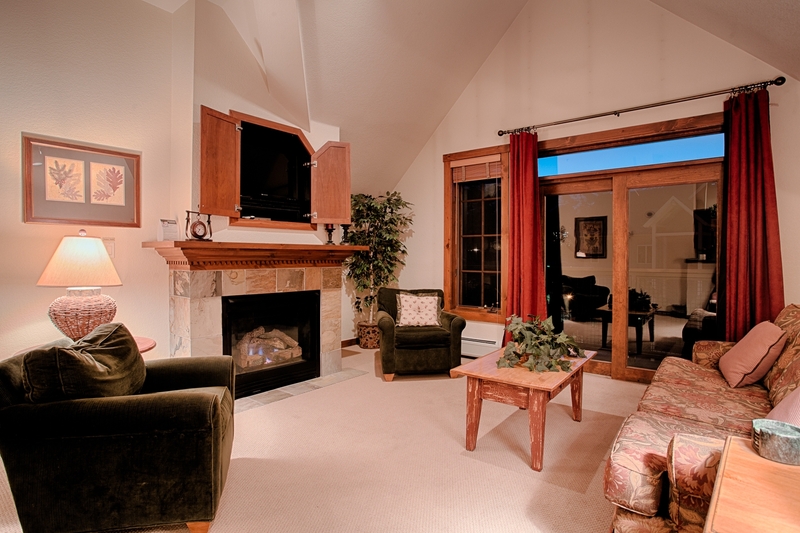 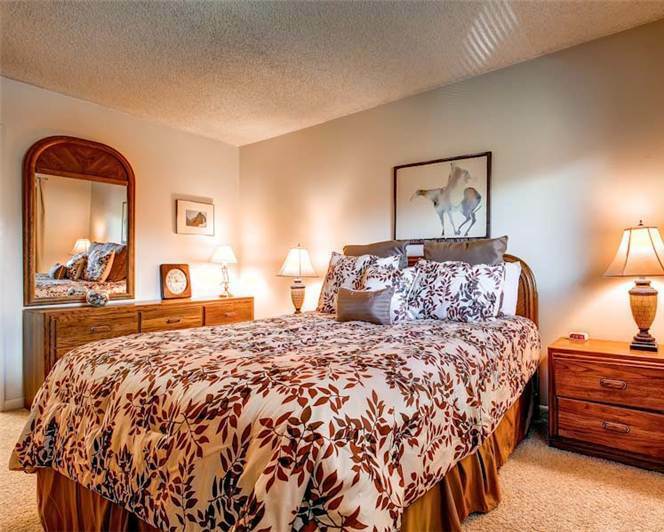 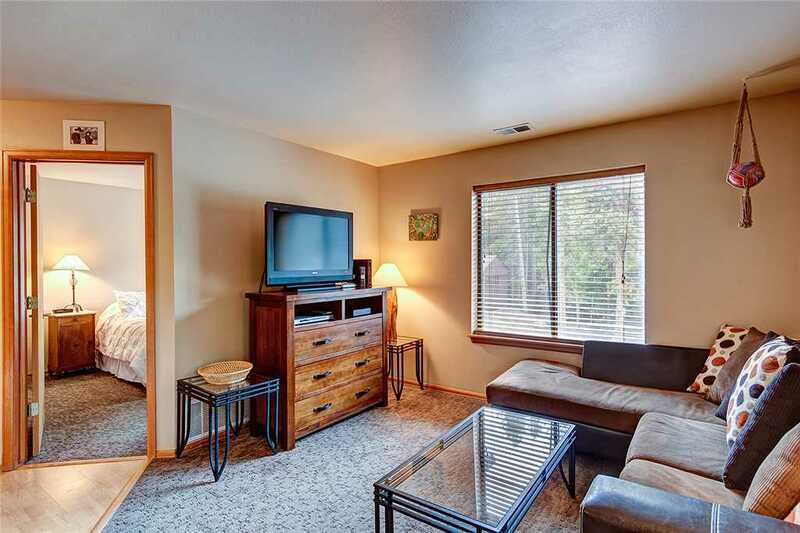 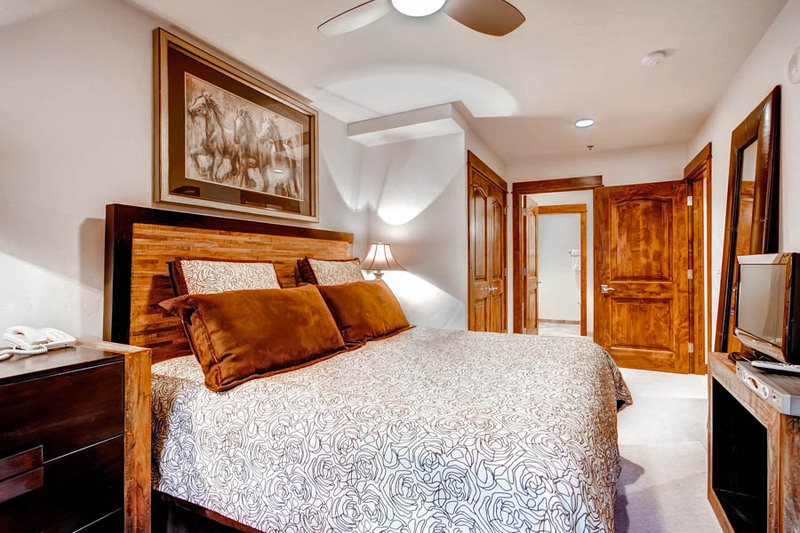 King master suite 1: king bed, private bathroom with Jacuzzi tub and walk-in tile shower, LCD-TV, mountain views. 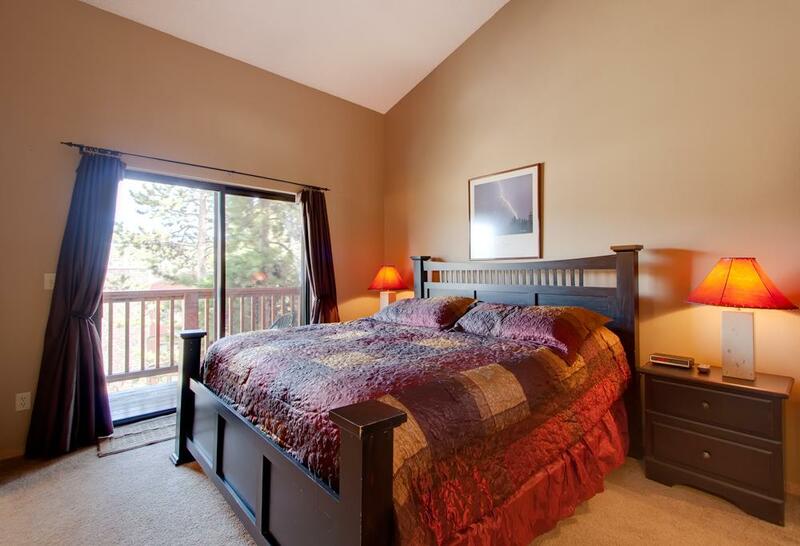 Bedroom 3: king bed, LCD-TV, mountain views. 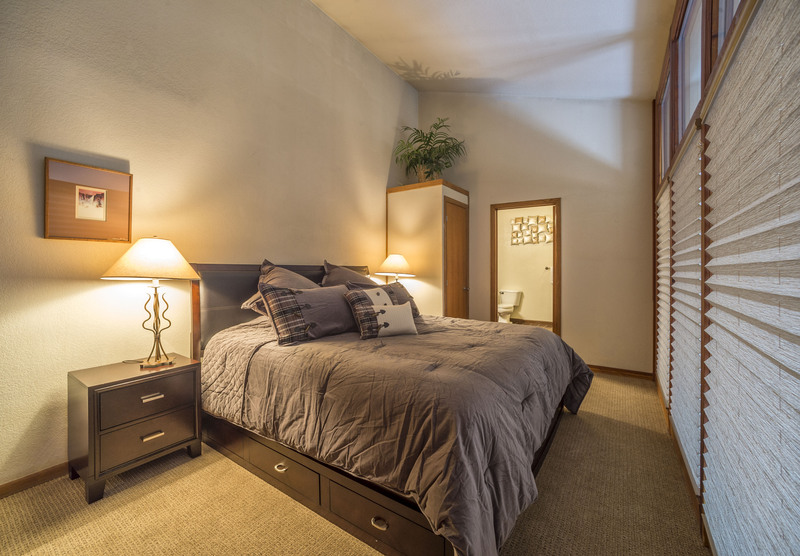 King master suite 2: king bed, private bathroom with shower. 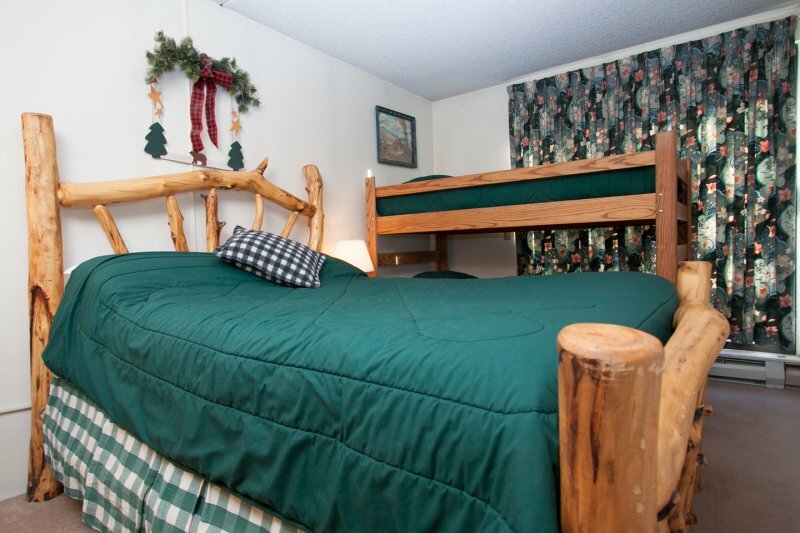 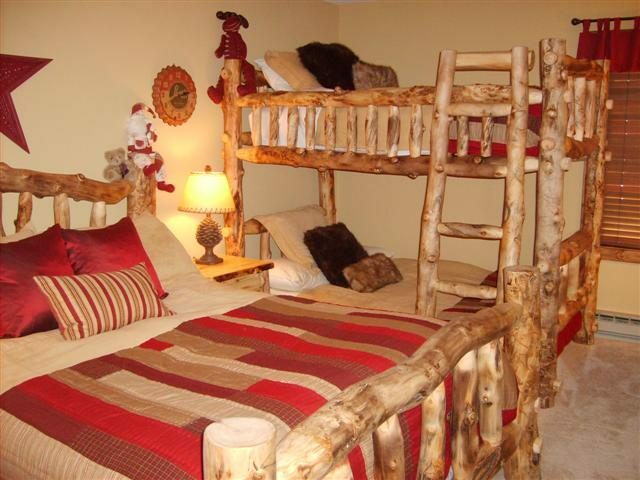 Bedroom 5: captain’s bunk bed (twin upper, full lower), twin trundle bed (pulls out to two twin beds). 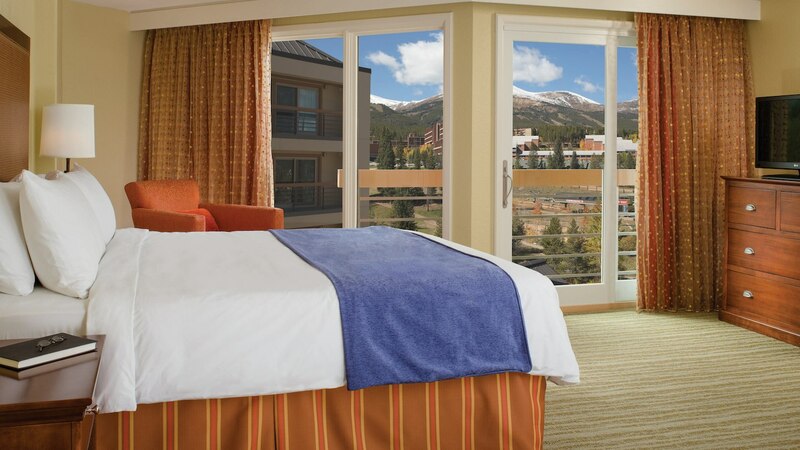 A $1,000 refundable damage deposit will be charged to credit card at check in. 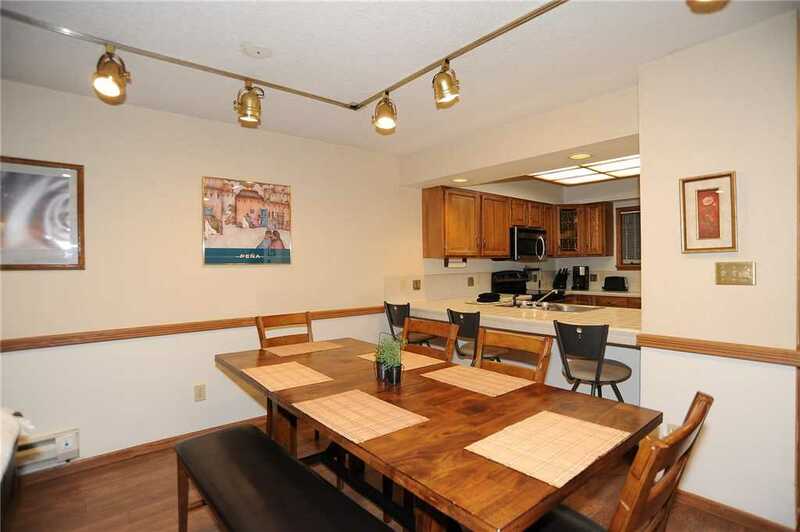 Parking: 1-car garage with 3 outdoor spaces — 4 spaces total.